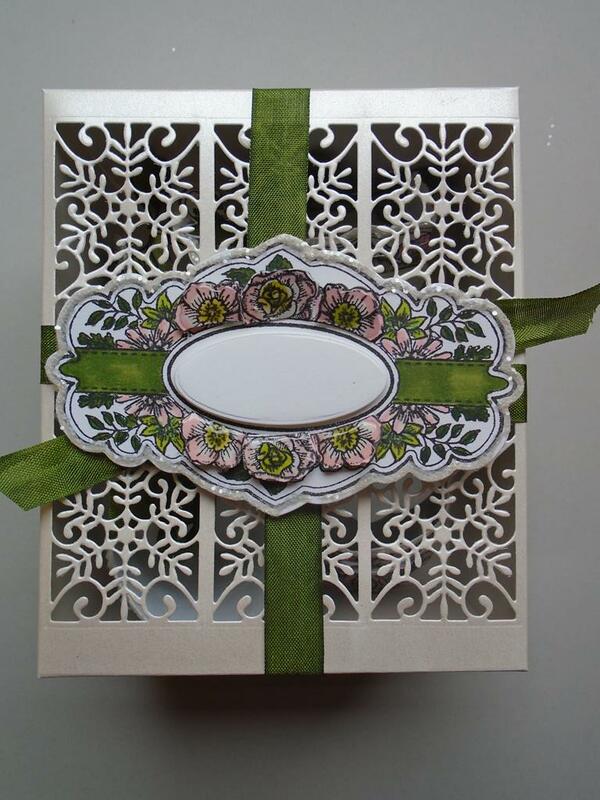 This part 1 of the workshop will show you how to make this triple easel card using the Sue Wilson Noble ornate pierced design dies, the Noble classic adorned design dies and the Belgian collection ~ tags. 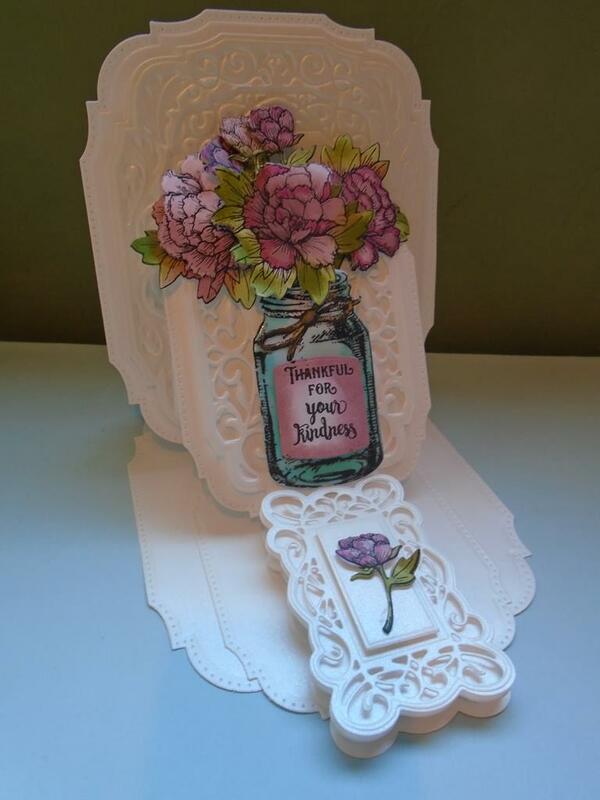 Part 2 will focus more on the detail added to the card using the JustRite peonies clear stamp set and the peonies & mason jar die. 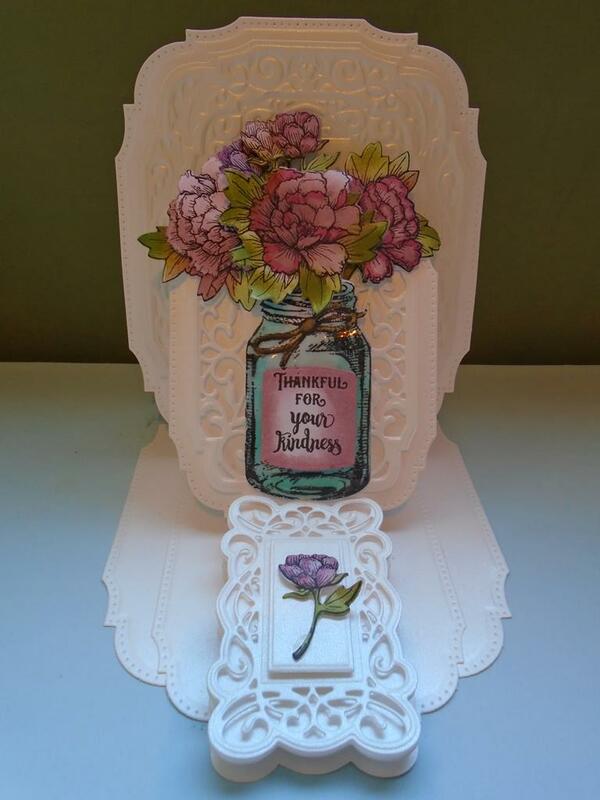 Glossy Accents are used to make the life like jar effect with ease and the front easel card can be left flat to allow the mason jar & peonies to be seen more. The card can be folded flattish which makes it easier to post. Step 1. 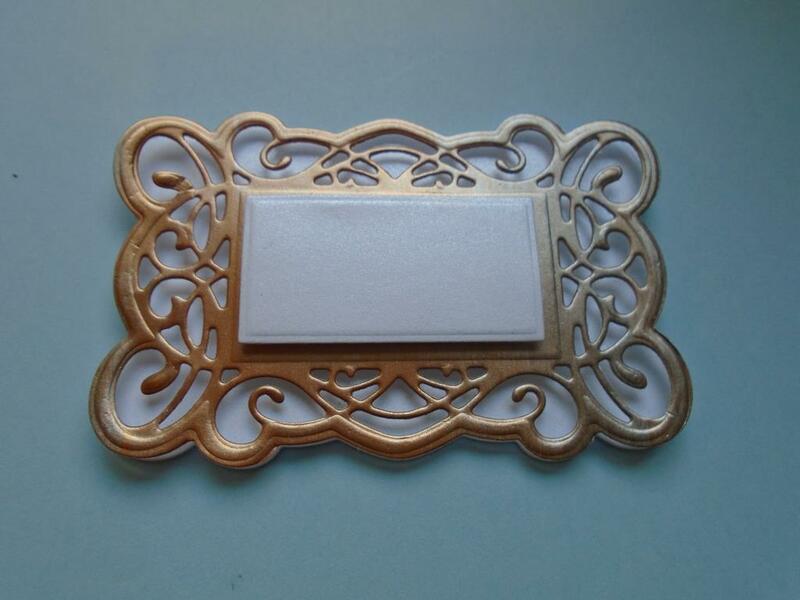 This part 1 of the workshop will show you how to make this triple easel card using the Sue Wilson Noble ornate pierced design dies, the Noble classic adorned design dies and the Belgian collection ~ tags. 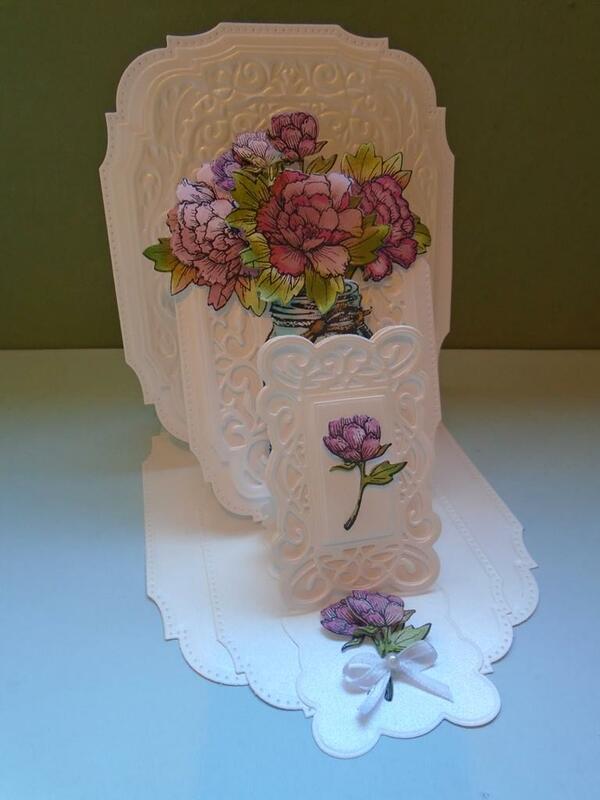 Part 2 will focus more on the detail added to the card using the JustRite peonies clear stamp set and the peonies & mason jar die. Step 2. Place a piece of the Foundations pearl icicle card onto a score board or use your normal method to fold the card in half. Step 3. 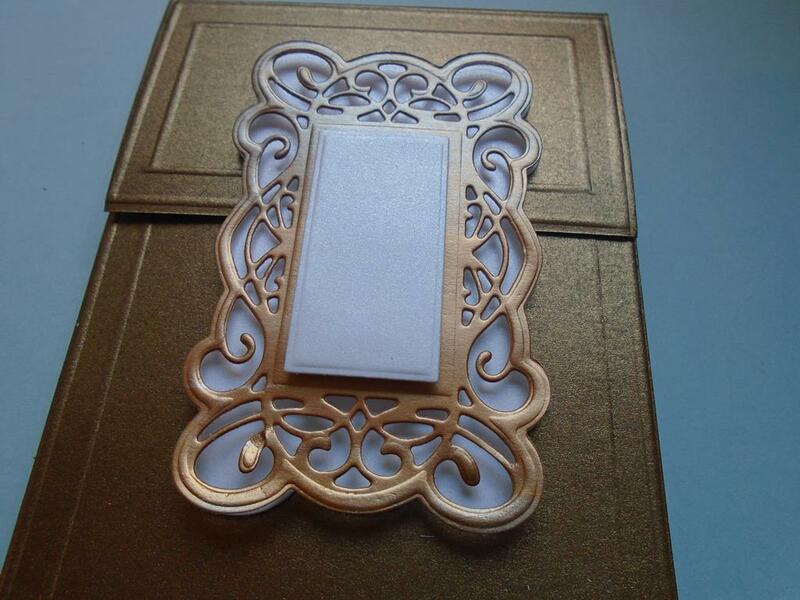 Place the large solid pierced die from the Sue Wilson Noble ornate pierced design dies onto the card so that the bottom of the die fits onto the open base of the folded card (and the fold of the card is at the top of the card). Secure the die in place with some low tack tape. Step 4. 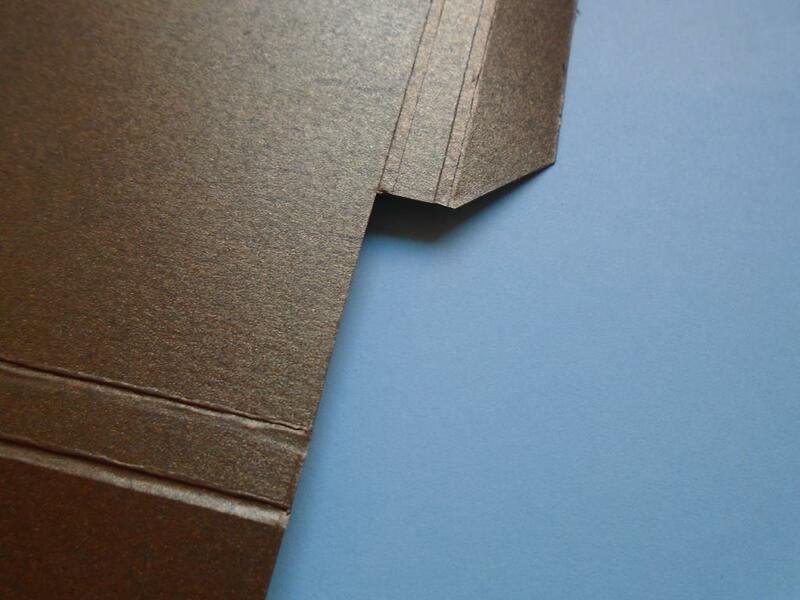 Here you can see how the top of the die edge should look over the folded card edge. 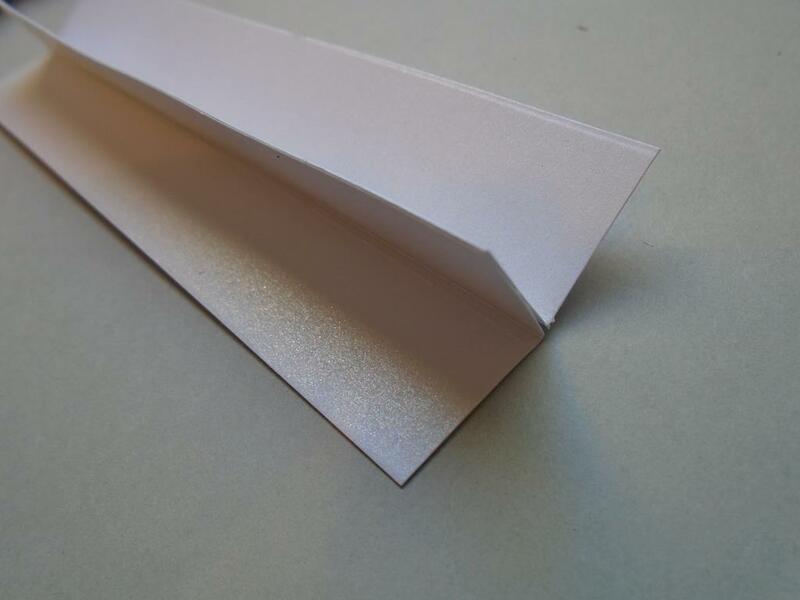 This will give a nice folded edge to the easel mechanism and also mean the card can be cut from an A4 sheet folded card. Trim the excess card off the side of the die so the next die can be prepared. 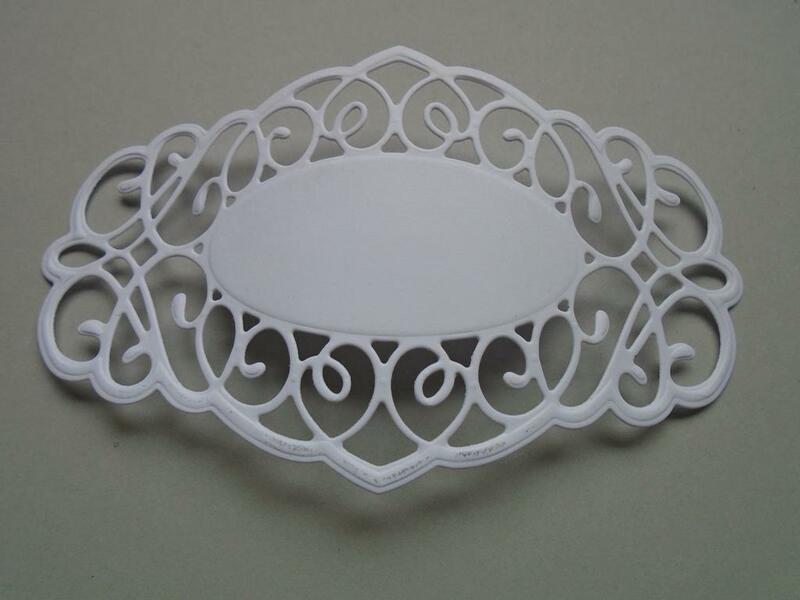 It`s easier to cut the dies singly. Step 5. On the off cut piece of card place the 2nd largest pierced die from the same set over the top of the folded edge making sure you have a nice area uncut along the top edge. Secure in place with some low tack tape. Step 6. Run both prepared pieces through the Grand Calibur machine to cut them. The is no need to emboss these panels as they will be covered over later. Step 7. Cut a solid whole panel with both the dies that the folded shapes were made in. Use the same icicle card and then pass the dies back through using the pink embossing mat, the base plate & the tan mat to emboss them. 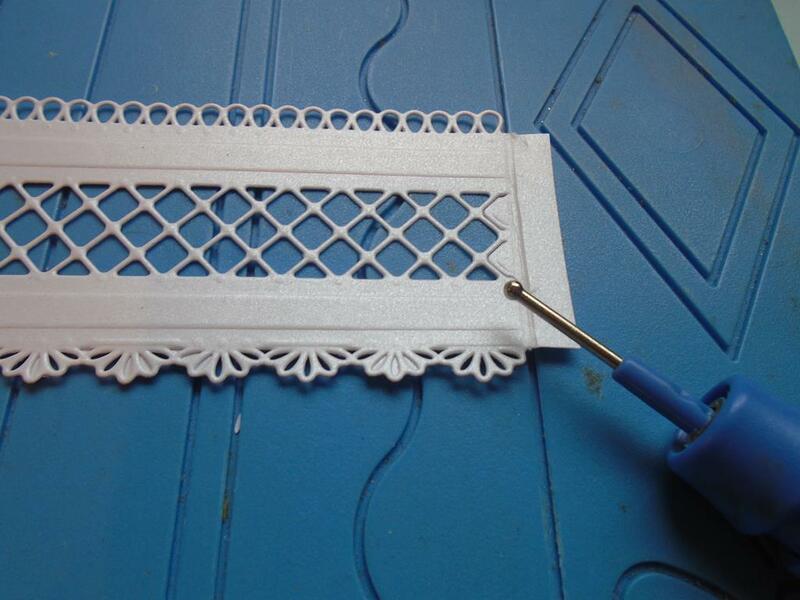 This will bring out the pierced edging perfectly. Step 8. 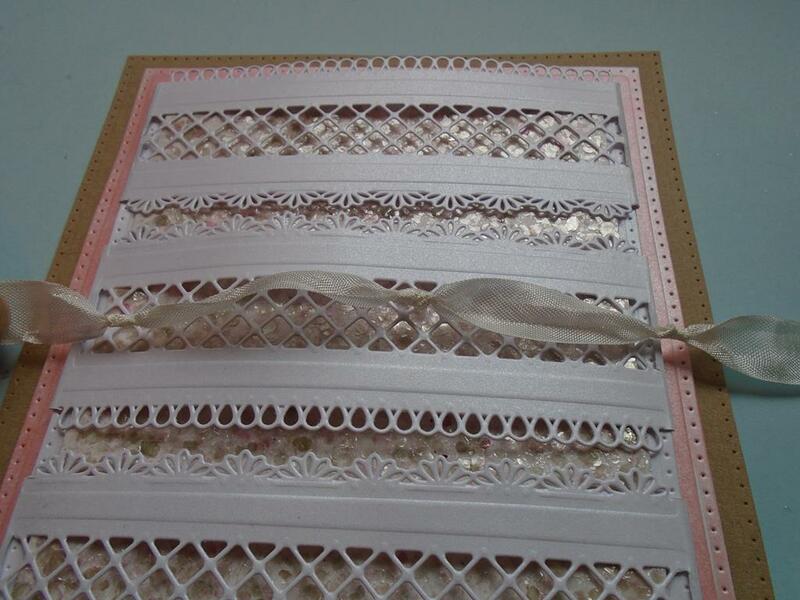 Open up the panel and make sure the pierced right side of the panel is on the underneath right hand side of the card. 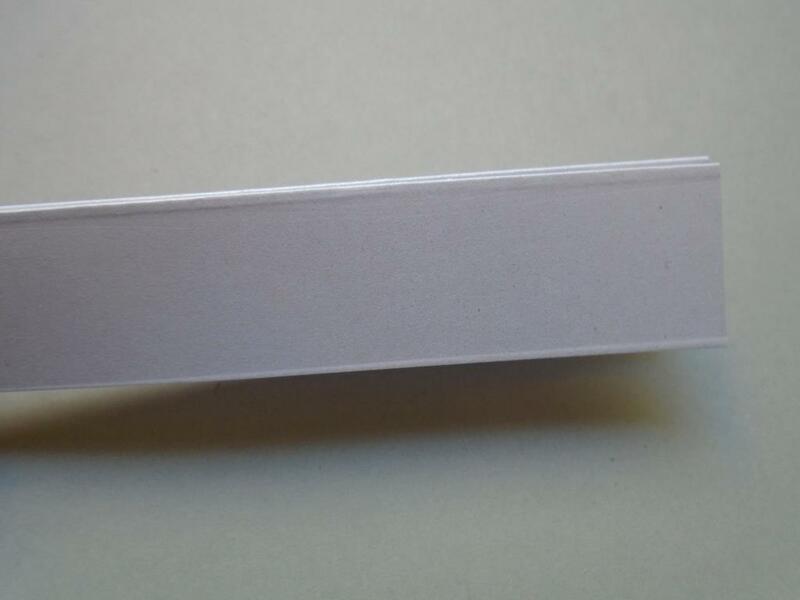 Now score a line half way in between the folded edge on the wrong side of the left hand of the card. This will give you a nice finish later on when the easel sections are all added together. Step 9. 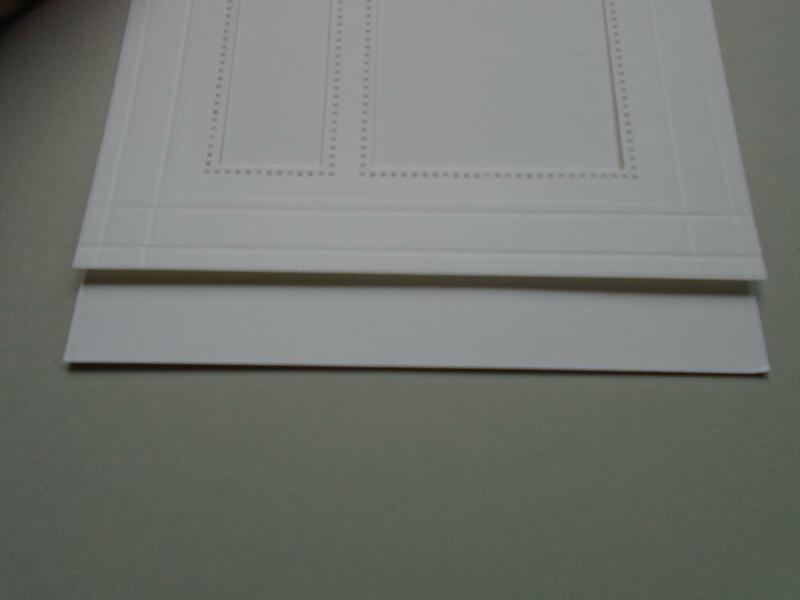 Turn the card over and crease the score lines downwards to make the easel mechanism. Step 11. 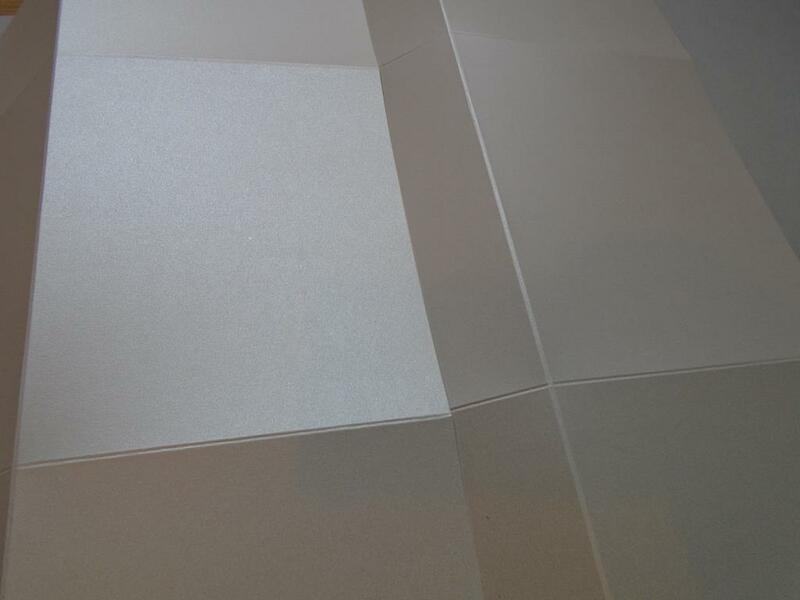 Here is a photo of how the folded panels will look when the smaller panel is added over the top of the larger panel. Step 12. 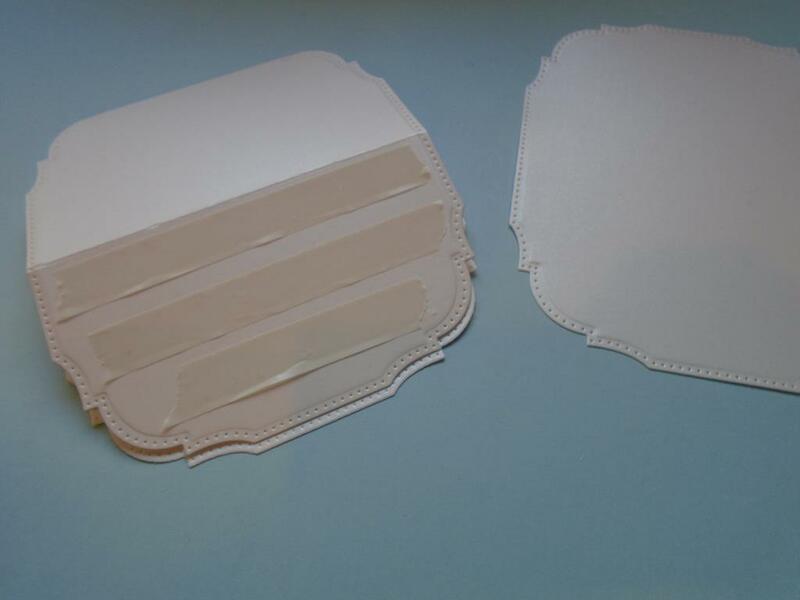 Add some double sided tape to the base areas of both folded easel cards. Step 13. 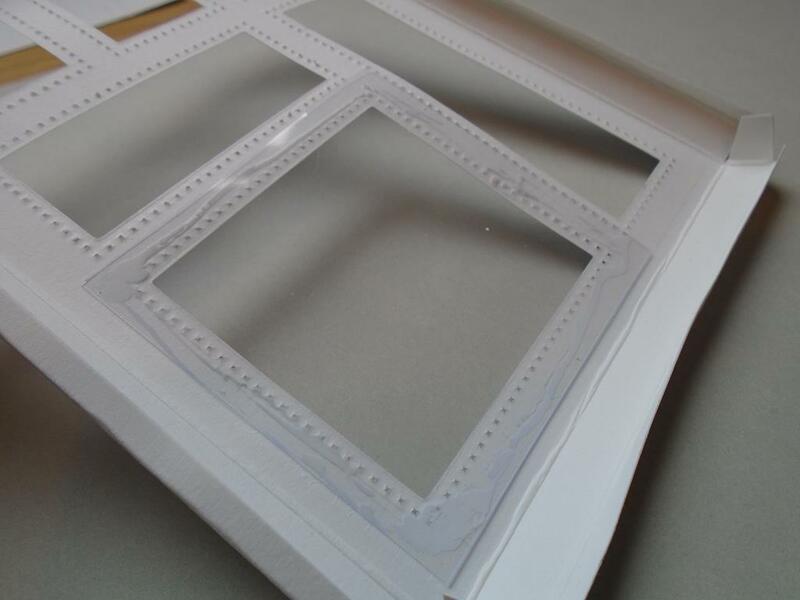 Remove the backing from the tape and attach the solid cut pierced frame onto the sticky base. Step 14. This will give you the standard easel shape base card. Although the card may look complicated it really isn`t. 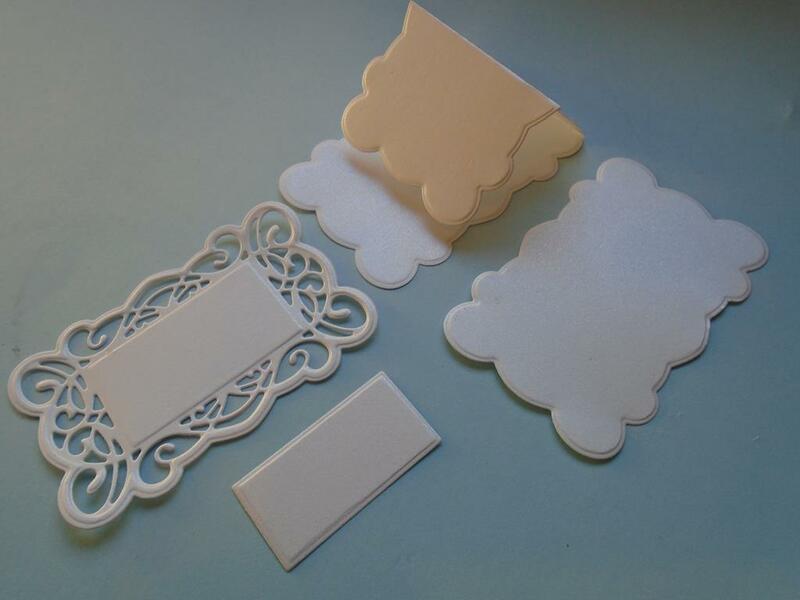 Just remember you are making 3 separate different size easel cards and then they will be added altogether later on. Step 15. For a crisp finish to the project lay the solid panel onto a clean work surface and fold the easel section back and burnish the fold line to give that sharpness the easel card movement will need. 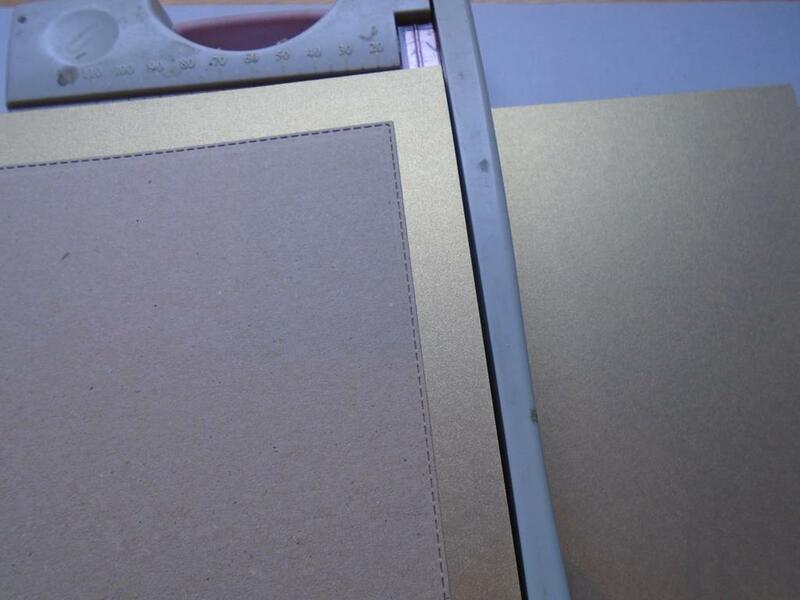 This ensures the easel card panel will tuck behind each other rather than lift as the weight isn`t correct. Step 16. 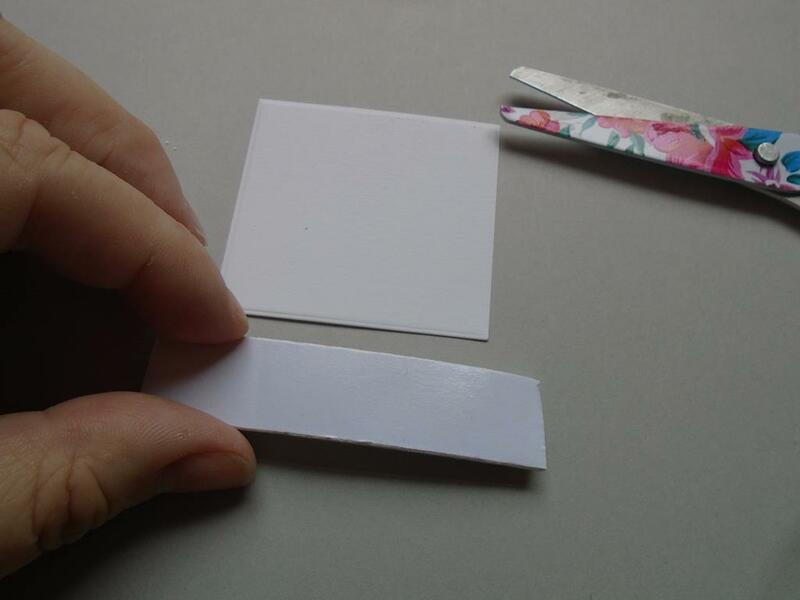 Place some double sided tape on the base of the 2nd size easel card making sure the front area of the card is left untouched. This is the area that will overlap the front of the easel base. Step 17. Remove the backing from the tape and place the piece onto the larger base making sure the front is set slightly forward as shown in the photo. Step 18. 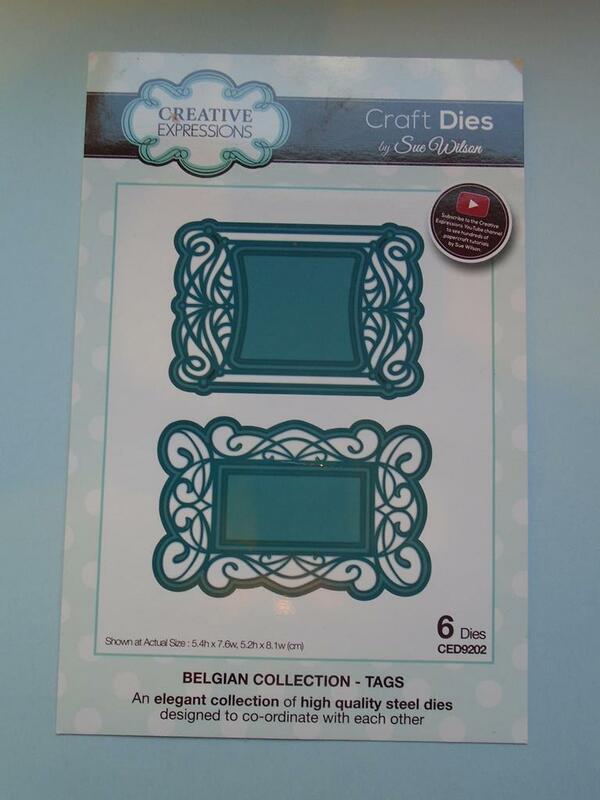 To make the 3rd easel card take the solid outer die from the Sue Wilson Belgian collection ~ tags set, add the die over a folded piece of the icicle card and make sure the top edge is placed over the folded edge so it isn`t cut. Secure in place with some low tack tape. 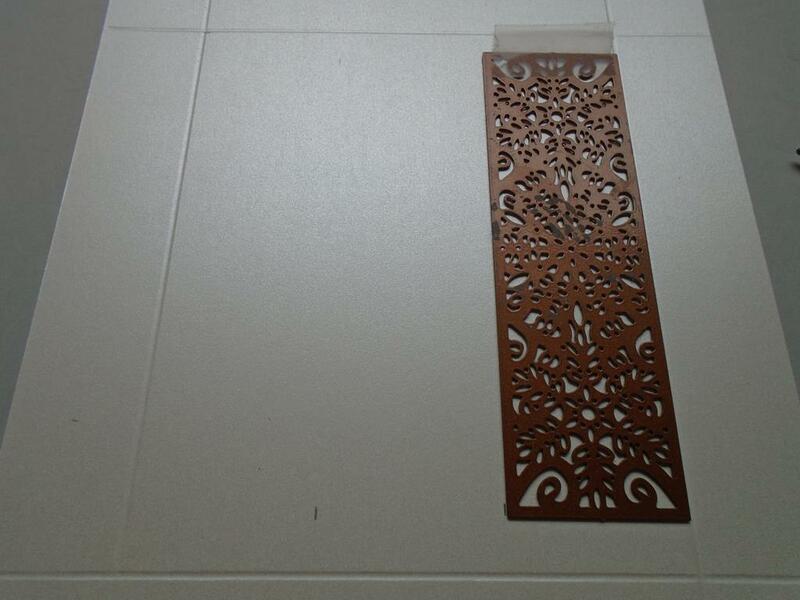 Run the piece through the die cutting machine to cut the piece out. 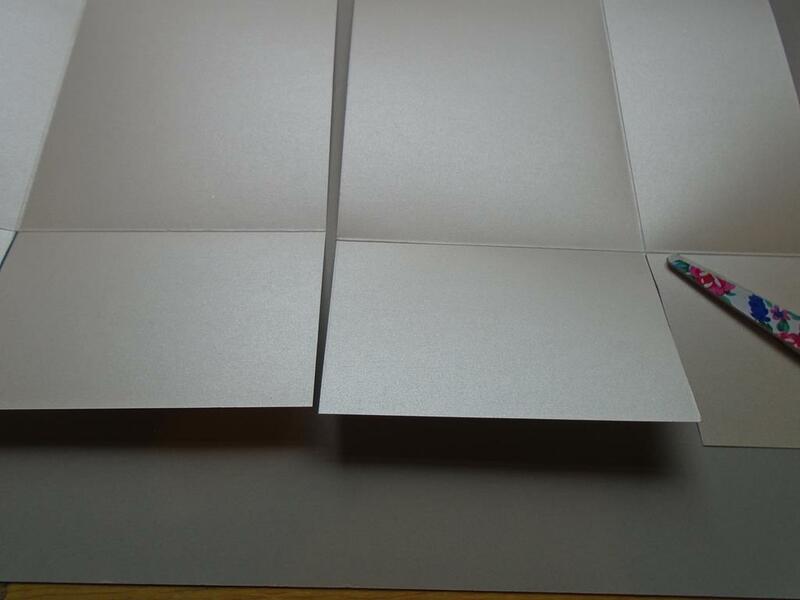 Crease the front of the folded piece in the same manner as with the other 2 easel cards to make the base shape of the small easel card. Step 19. 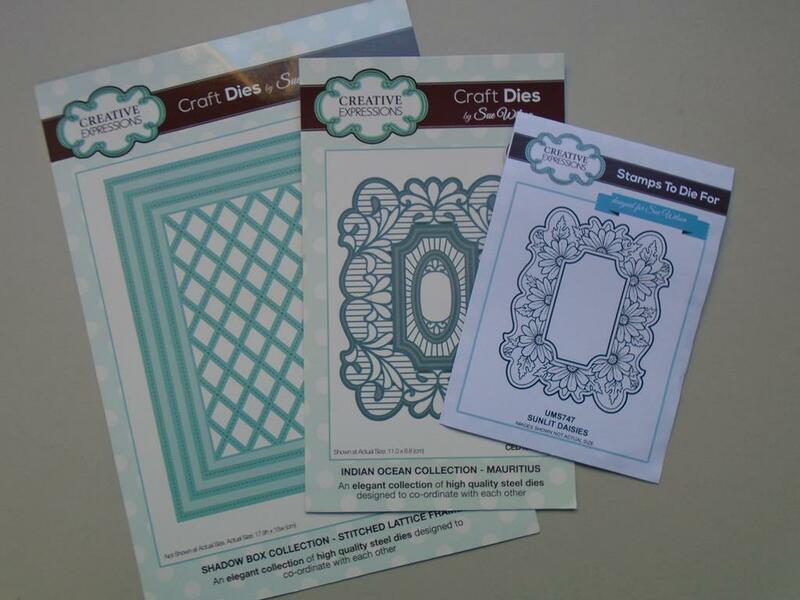 Cut a solid die shape using the same die before cut & embossing the solid shape with the next size down intricate die. 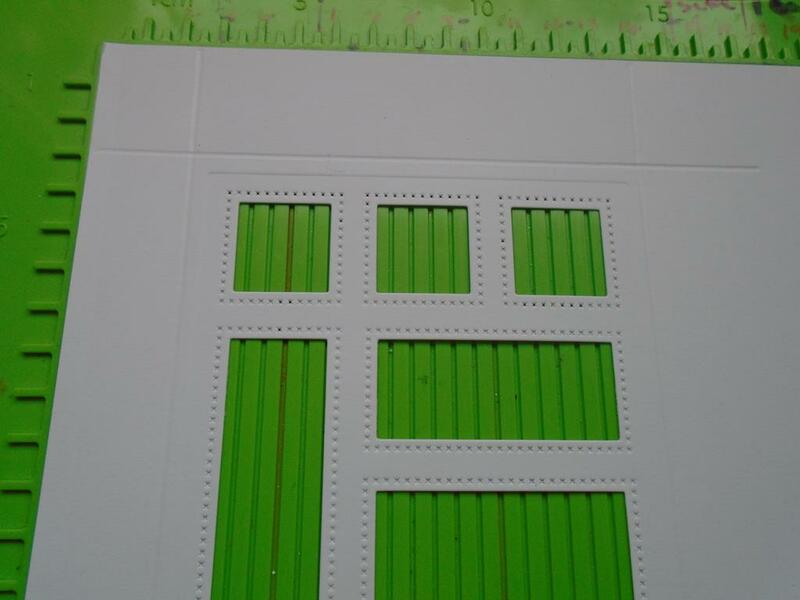 Also cut the small rectangle die shape at the same time. Step 20. 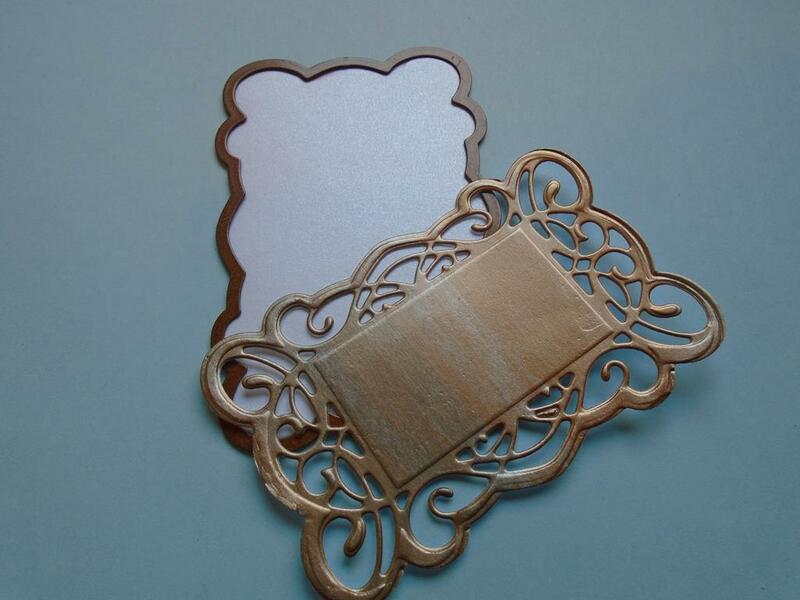 Assemble this easel card by adding the solid shape to the bottom area of the easel card and then add some foam pads behind the rectangle area of the intricate die shape and add this onto the easel card. 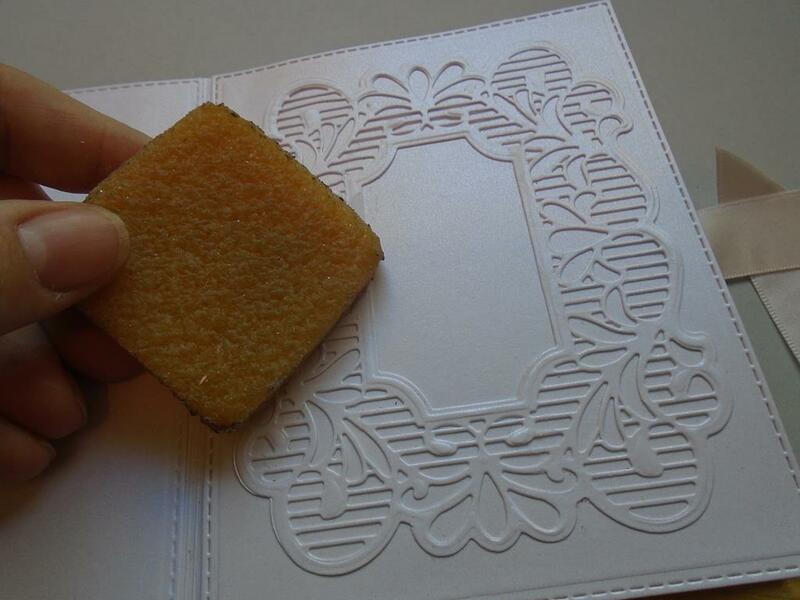 Then add the rectangle again using foam pads to finish off this small easel card. Step 21. Add some double sided tape the base of the small easel card and again remember to not have the tape at the front edge of the card. Overhang the card to complete the 3rd and final section of the easel card. Step 22. 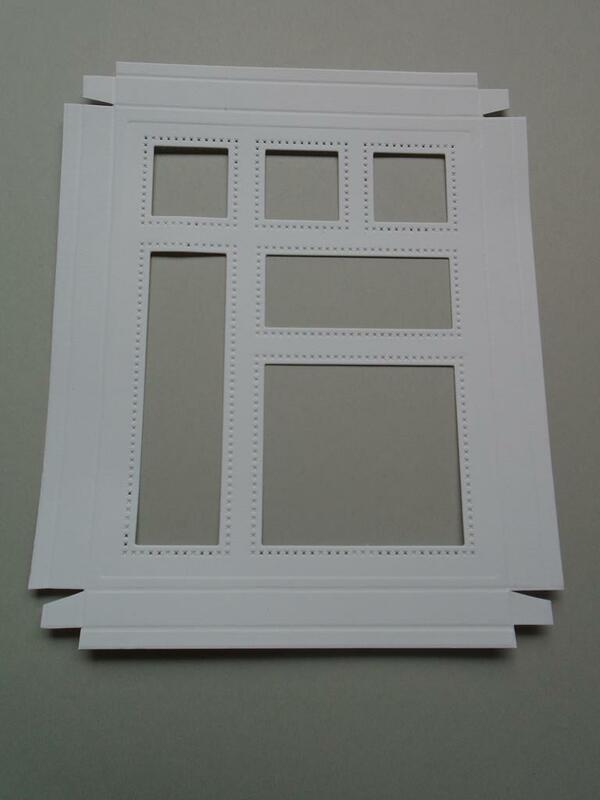 Tuck each easel panel behind each of easel card that are in front of each other. This is just to show how the finished effect will look. Step 23. 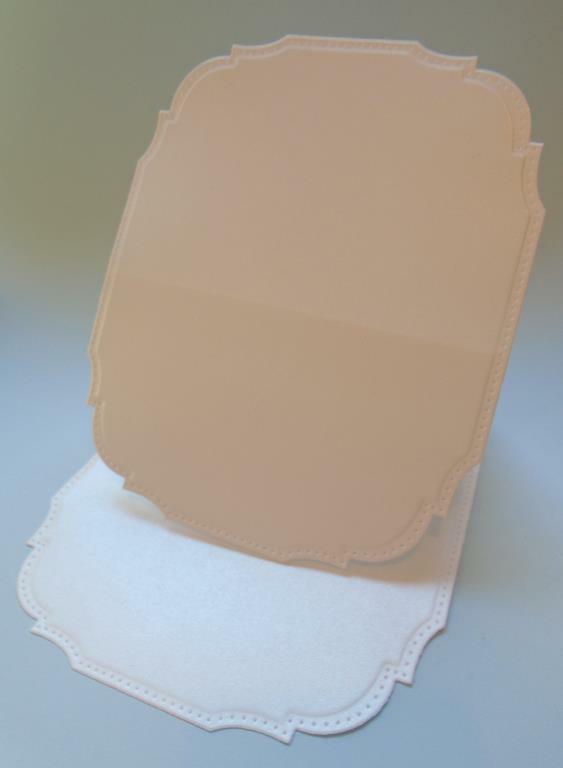 When the easel cards are folded flat the card can be flattened down which makes this great for posting. Step 24. Use the large embossed die from the Noble classic adorned die and place that in the large solid pierced die from the Noble ornate pierced die and the smaller embossed die from this set will nest perfectly in between. Secure the dies in place with some low tack tape. 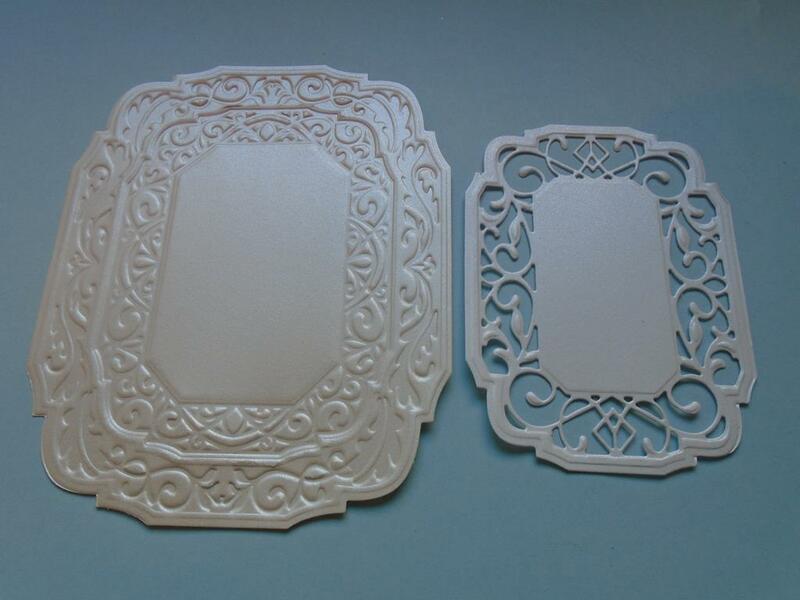 Also prepare the smaller solid frame with the next size down intricate die from the Noble classic adorned design. Once they are all secured in place cut and then emboss the dies through the Grand Calibur machine. Step 25. 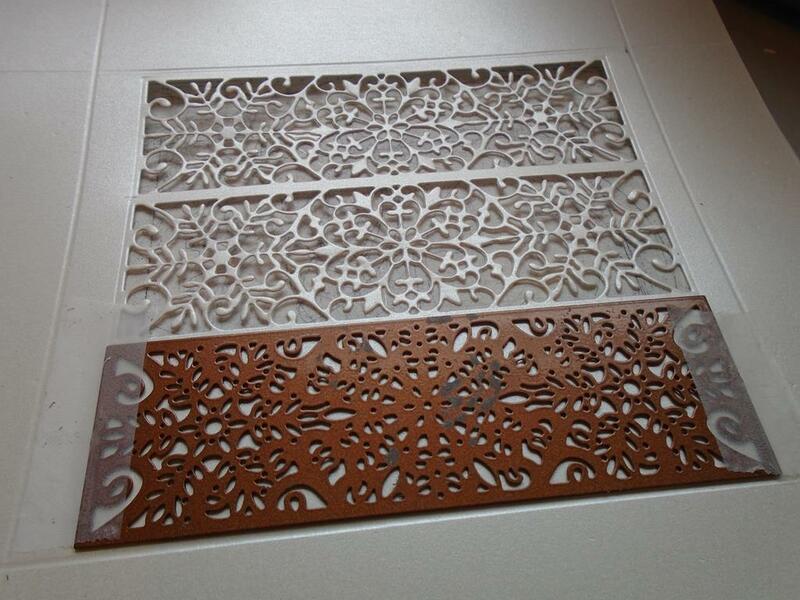 Now you will have a wonderful highly embossed panel and the smaller intricate die. Step 26. 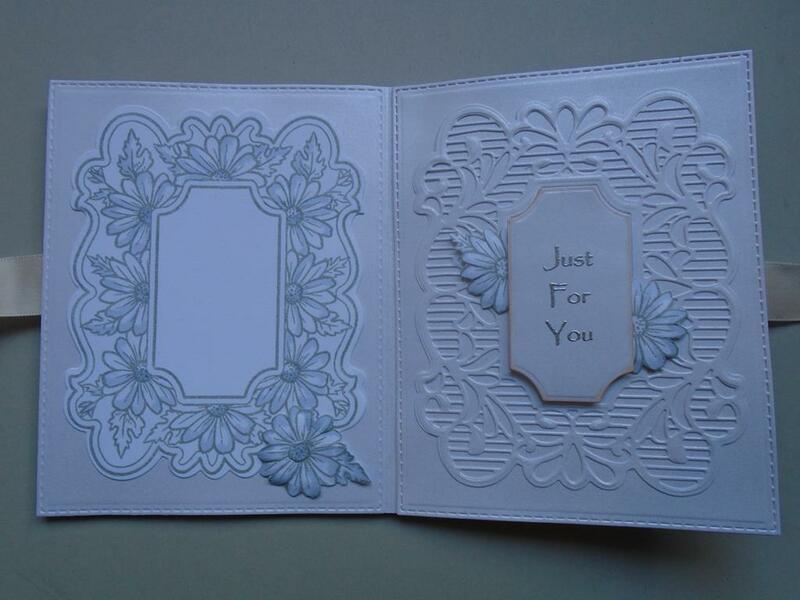 Add the embossed panels onto the plain easel sections of the card using foam pads for added dimension to the card. The complete project will be posted next Friday so please check back for the remaining part of the workshop. 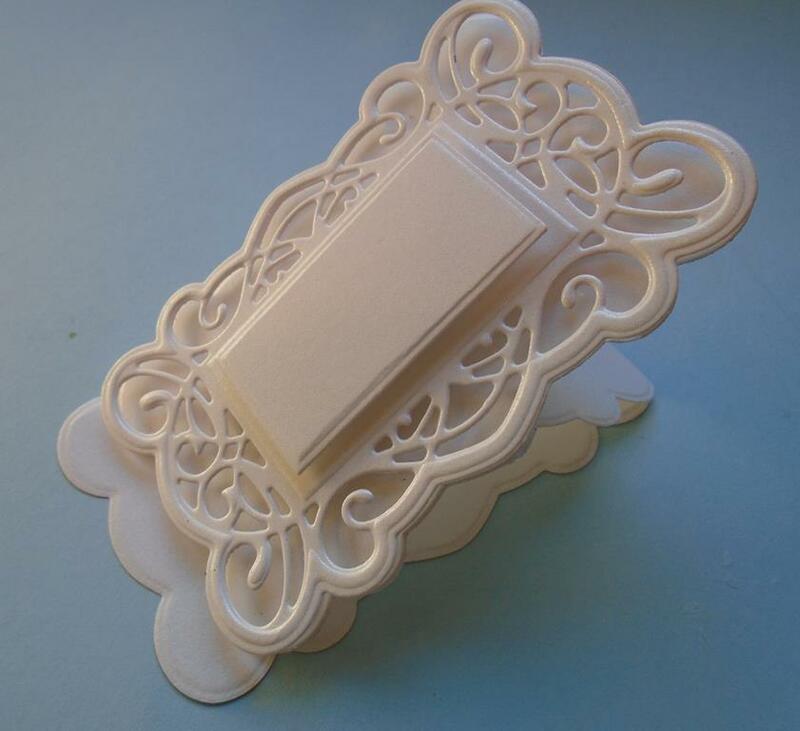 This project will show you how to make this gift card holder, for money to be added as a gift, or why not a piece of jewellery or its the perfect size to hold ATC`s. 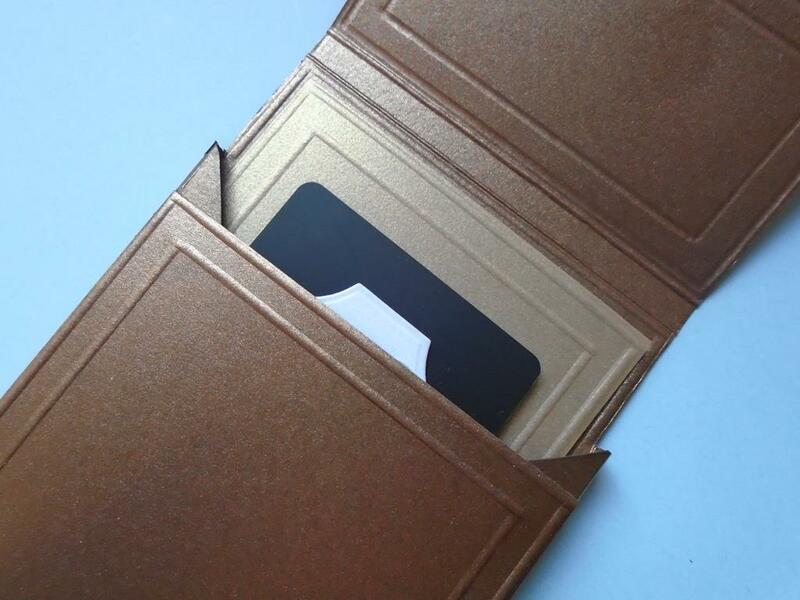 The flap is opened to reveal the top of the gift card. 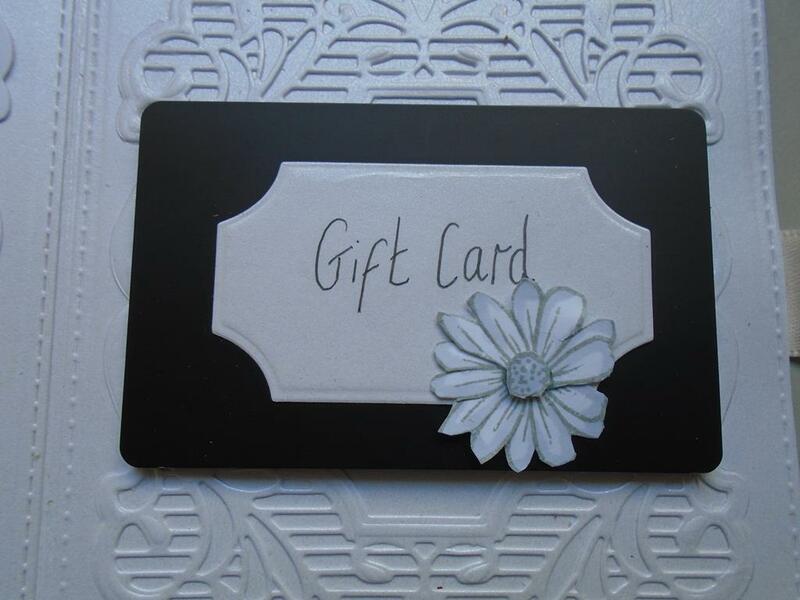 The flowers are created the sunlit daisy frame stamp but as you can see by the daisy on the gift card it has been made into a whole daisy from the half stamped daisies. 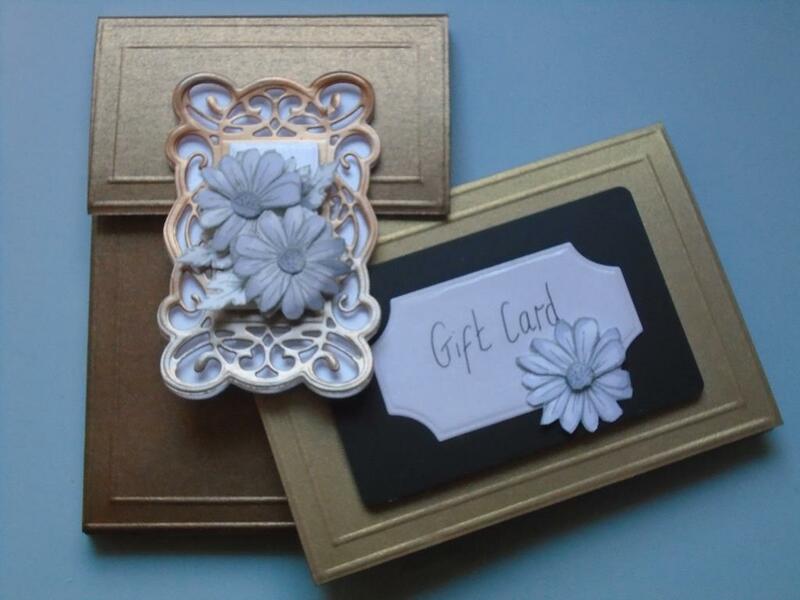 The project is perfect for presenting a gift card in. Step 1. 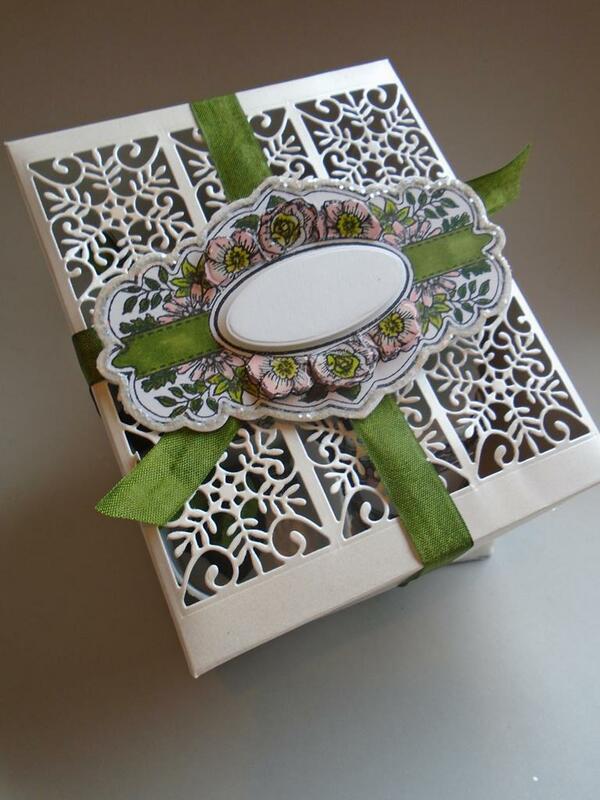 This workshop will show you how to make this useful flip up gift card holder or it can be used for ATC`s (Artist Trading Cards). 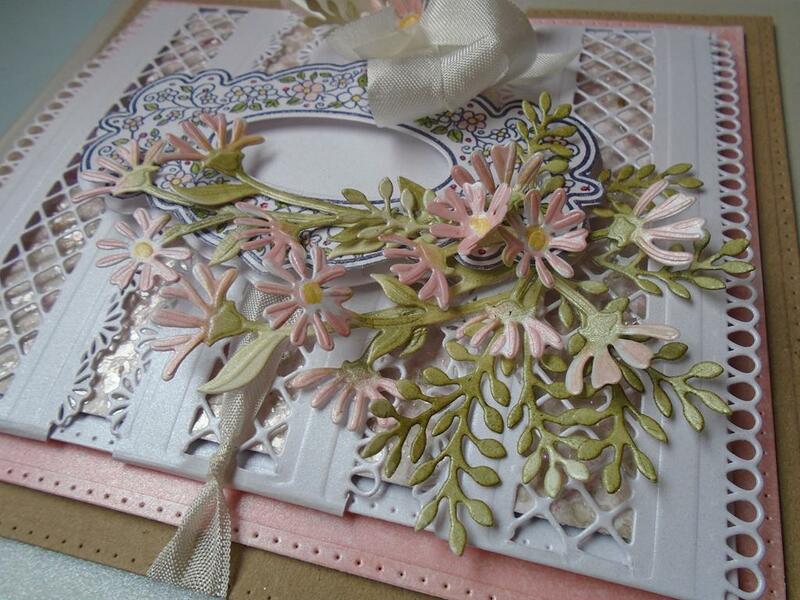 The main feature is the intricate panel which is created using the Sue Wilson Belgian collection ~ Tags with the Creative Expressions stamps to die for … Sunlit daisies stamped flowers. Step 2. 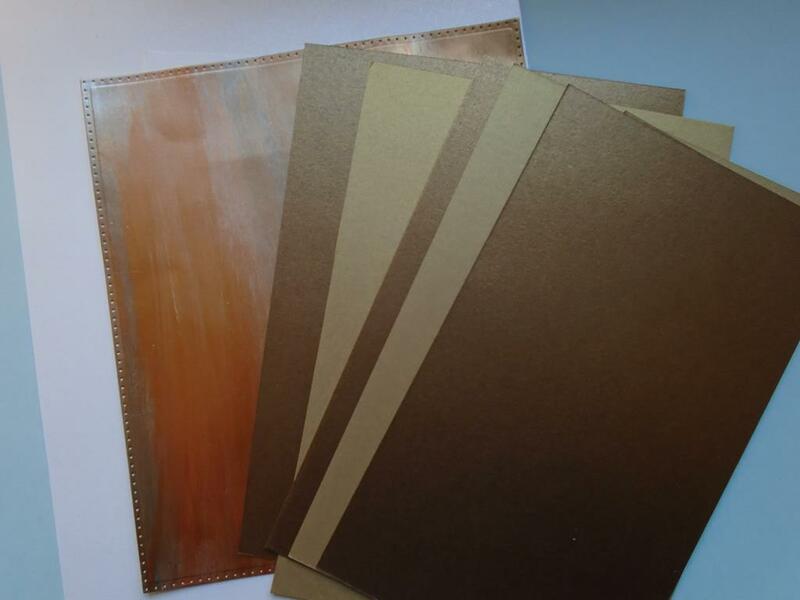 Select off cuts that you may have hanging around or use an A4 sheet of the Foundations pearl antique copper card and the antique gold card. 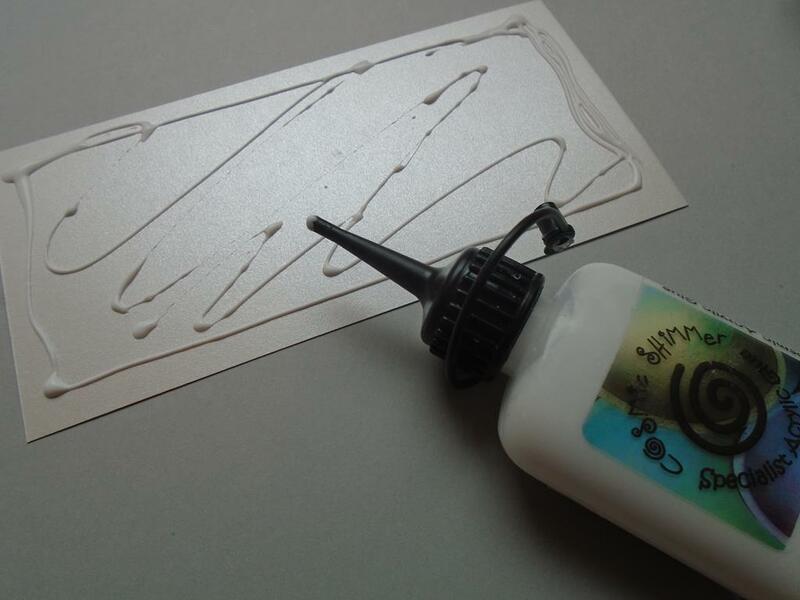 I had a piece of Cosmic Shimmer gilding polish worked card left over so i`m using that, but the next few steps will show you how it was created. Step 2a. 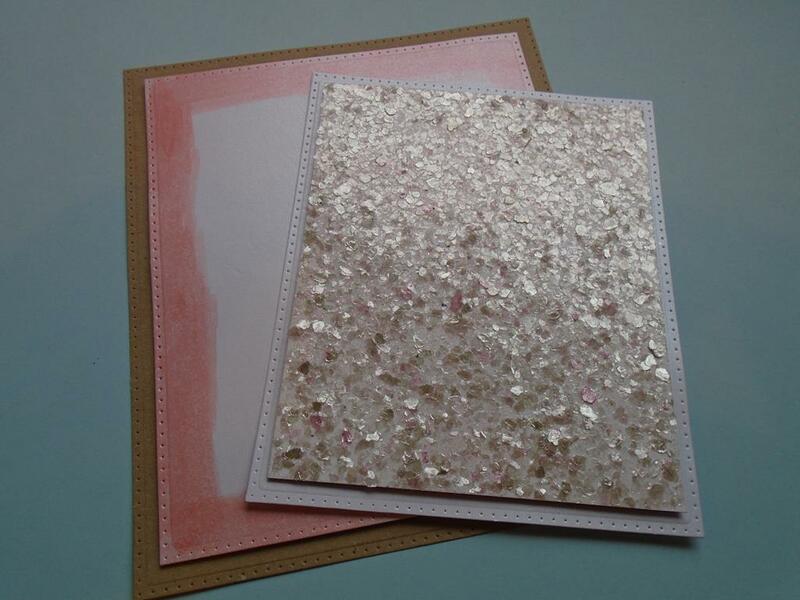 Remove the lid of the Cosmic Shimmer metallic gilding polish in prime the sponge and then add a few lines of the Cosmic Shimmer metallic gilding polish chocolate bronze onto a piece of the Foundations coconut card or white card. 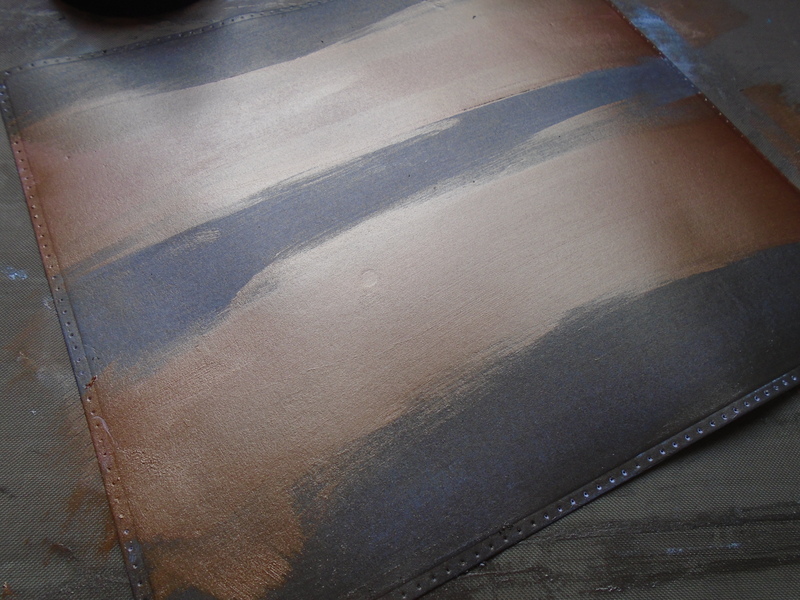 Now add few lines of the copper shine going slightly over the edge of the chocolate bronze. Step 2b. Continue to work the polish down the card so you have wide stripes of the separate colours. It may look wrong at this stage but keep with it as the next step with tie it all together. Step 2c. 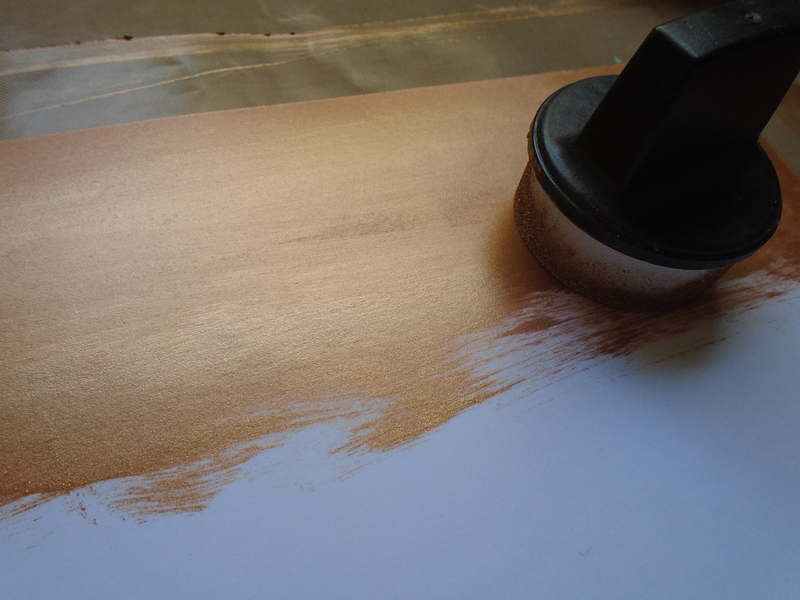 Once the piece is dry / nearly dry select the Cosmic Shimmer metallic gilding polish pearl lustre and apply this by sweeping it over the join areas. Go lightly over the chocolate and bronze borders too. 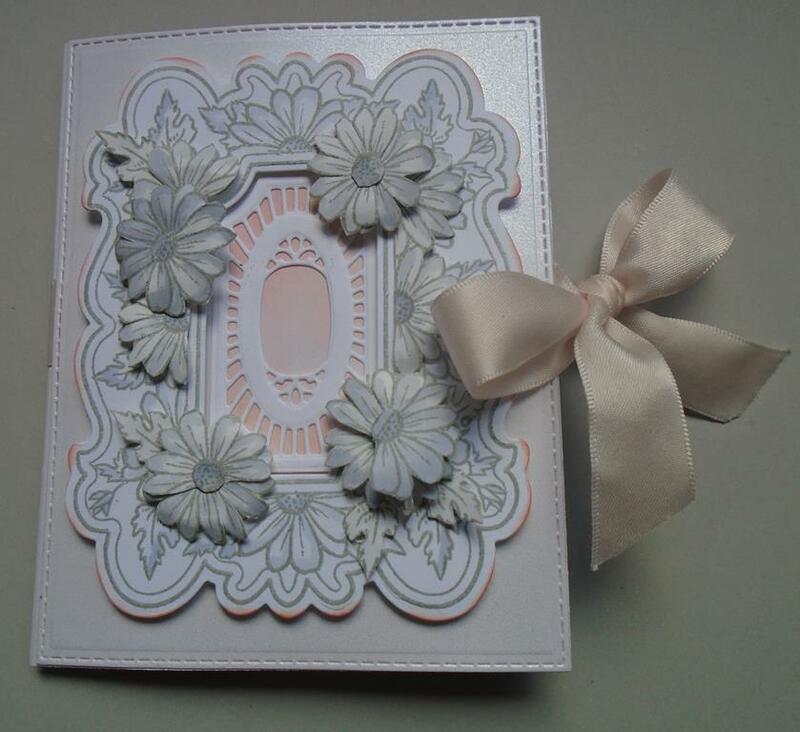 This will give a lovely soft feel to the card. 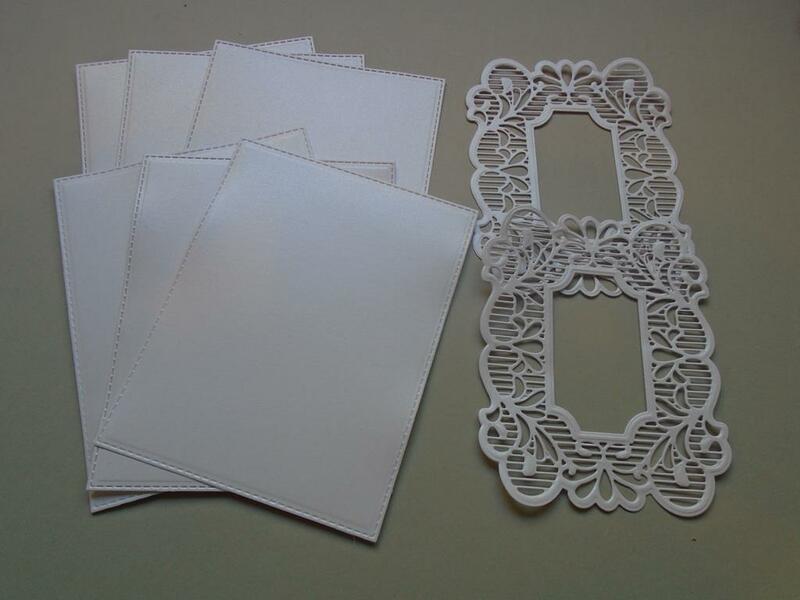 Allow the card to dry fully before die cut it. Step 3. Place the outer and the next size down intricate die onto a piece of the polished card and secure in place with some low tack tape. Step 4. 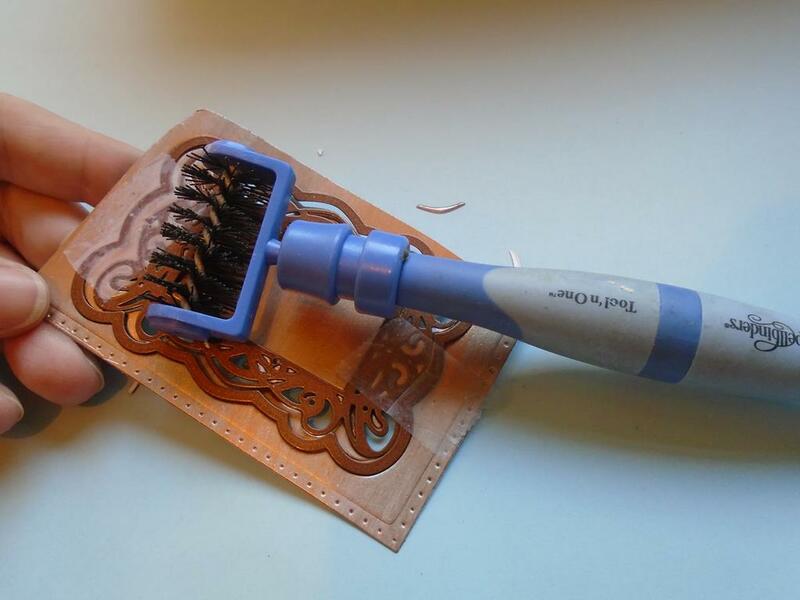 Place this through the Grand Calibur and then once cut emboss the piece using a base plate the die / card , the tan mat & then the pink embossing plate. Step 5. 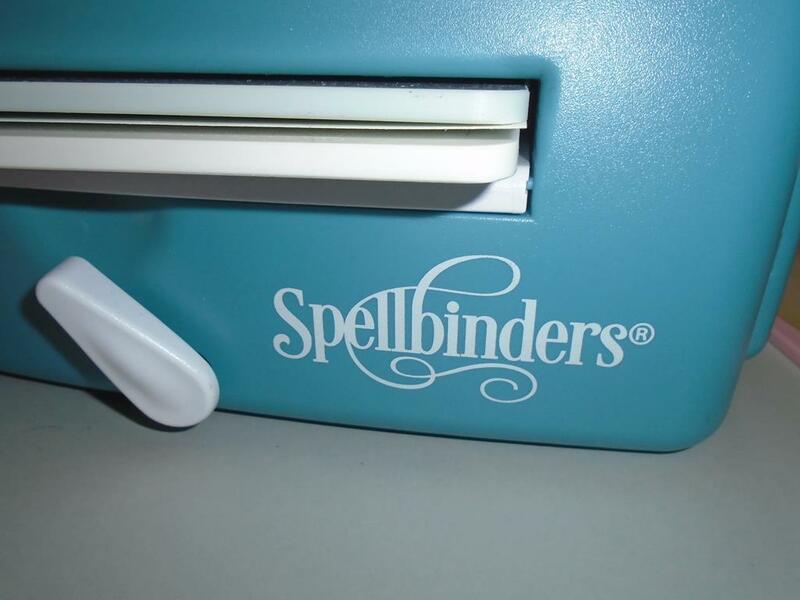 Run the Spellbinders tool in one over the card with the die still in place but the low tack tape removed. Step 6. 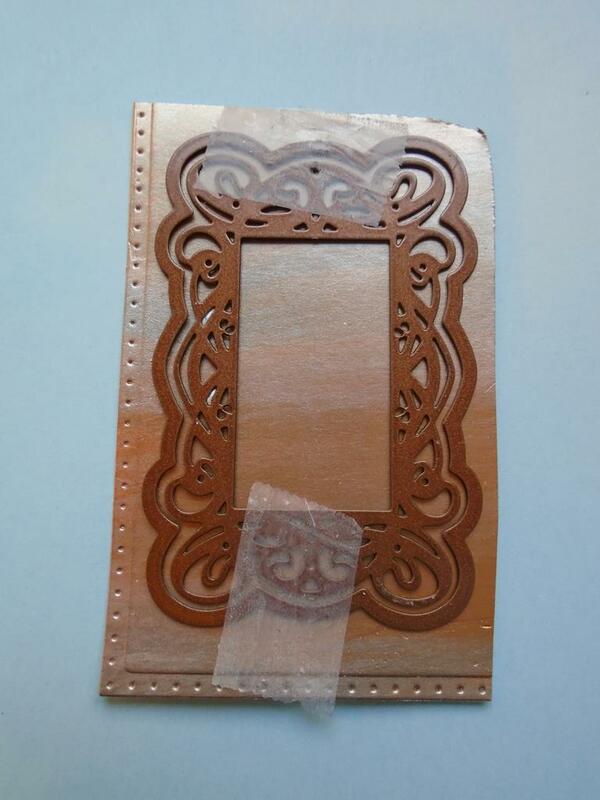 Select a piece of the Foundations pearl antique copper card and trim it to 21cms x 12 ½cms. 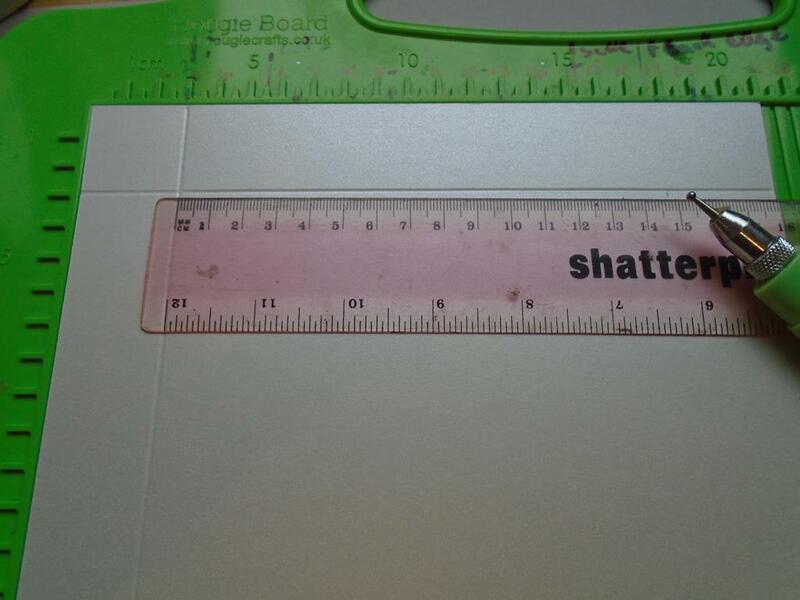 Lay the card on a score board and score at the A5 gate fold mark which is 52mm if doing this by ruler. 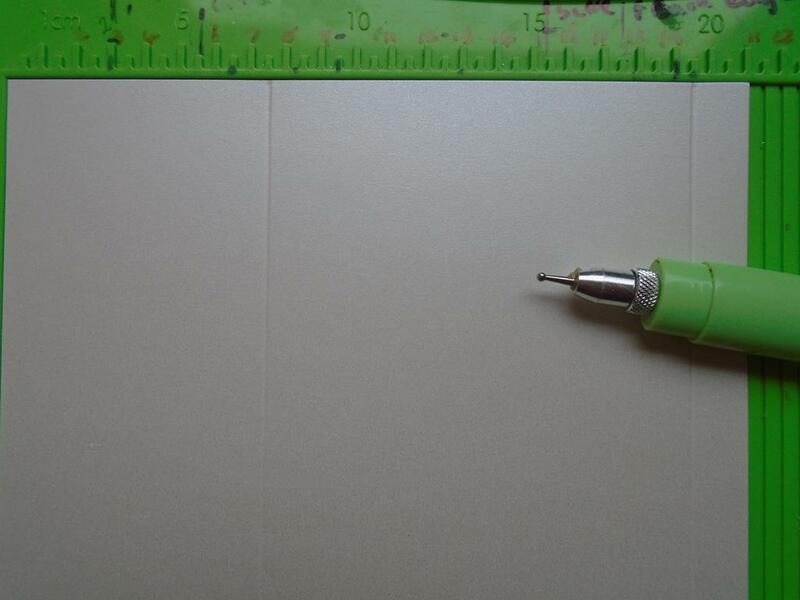 This is enough to house the depth of the die cut panel if you wanted to have this placed in this space. Step 7. Now move the last scored line to the DL line no.5 line on the Eazi score board & score down line no.6 the A5 half fold line. This will be 6mms from the last score line. Step 8. 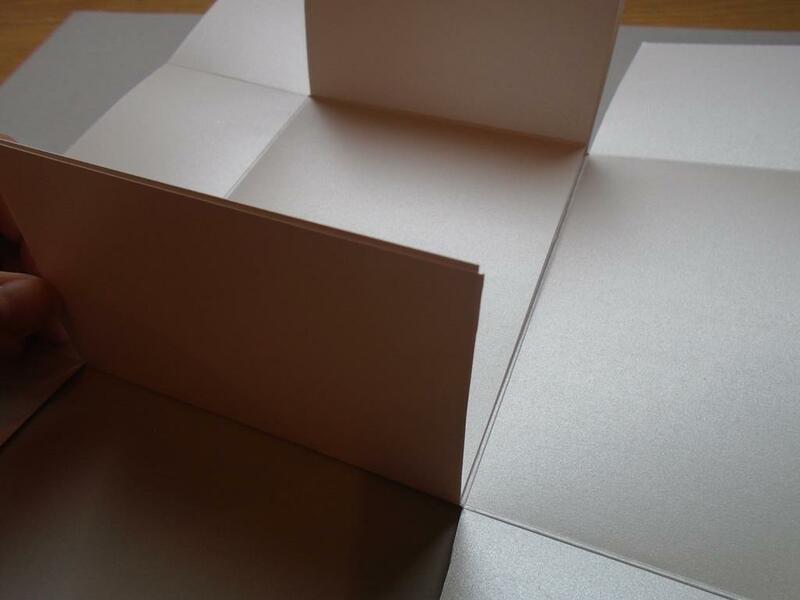 Turn the card 180 degrees and with the card right up to the side edge score at the box no.1 and then box no.2 points. By a ruler that is 18mm & at 25mm. Step 9. 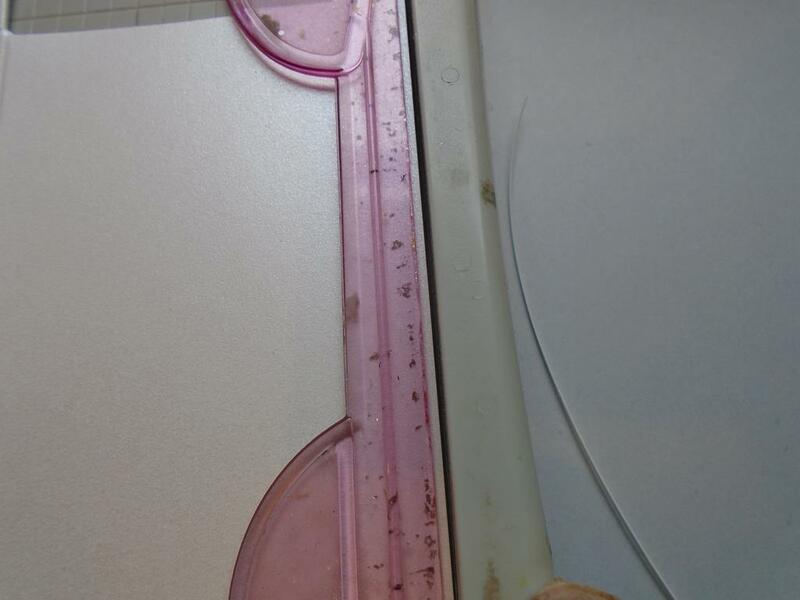 Turn the card 90 degrees and measure in 12mms and score, and then measure 6mms and score down this side edge. 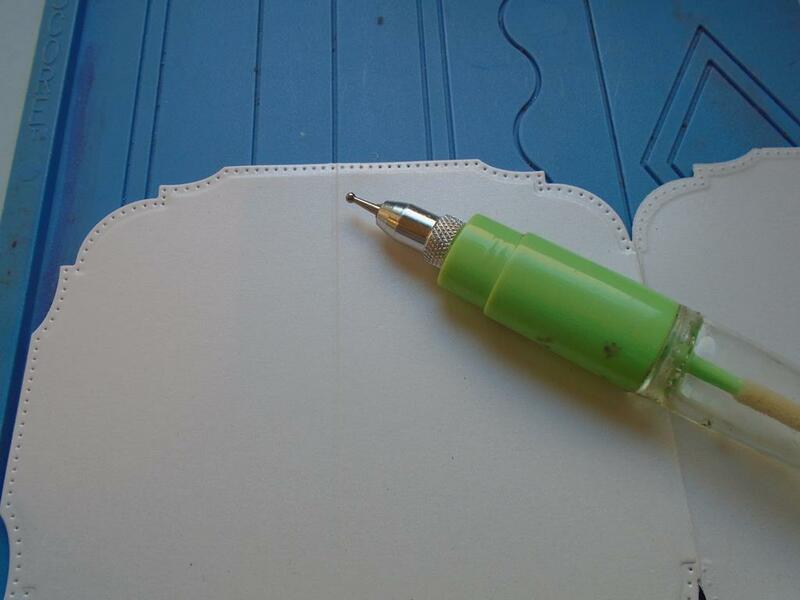 Turn the card around to the other side edge and repeat the measurements down this side. Step 10. Now you have all the score lines in place for the basic shape of the project. Step 11. From the bottom of the card cut up to the 2nd score line and in from the 2nd score line on the side. 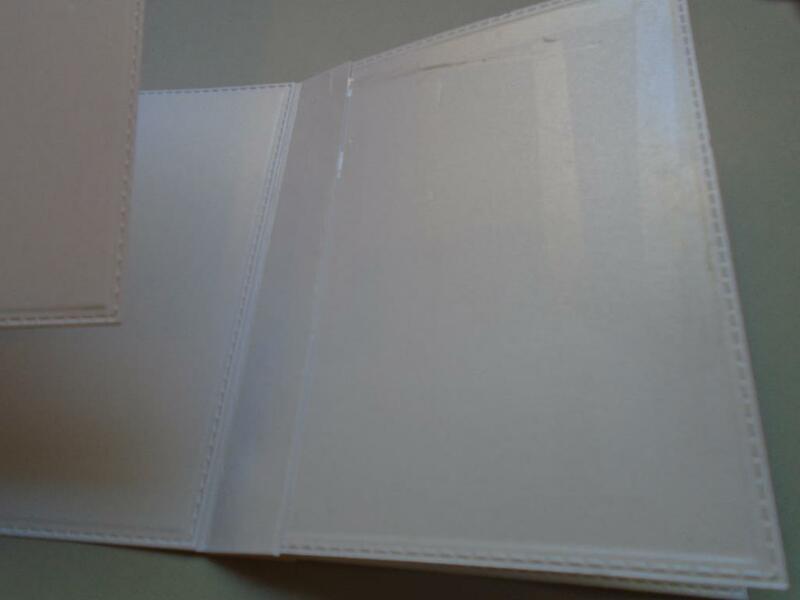 Remove the excess card to create the corner needed for the gift card holder, do this on the other bottom side. 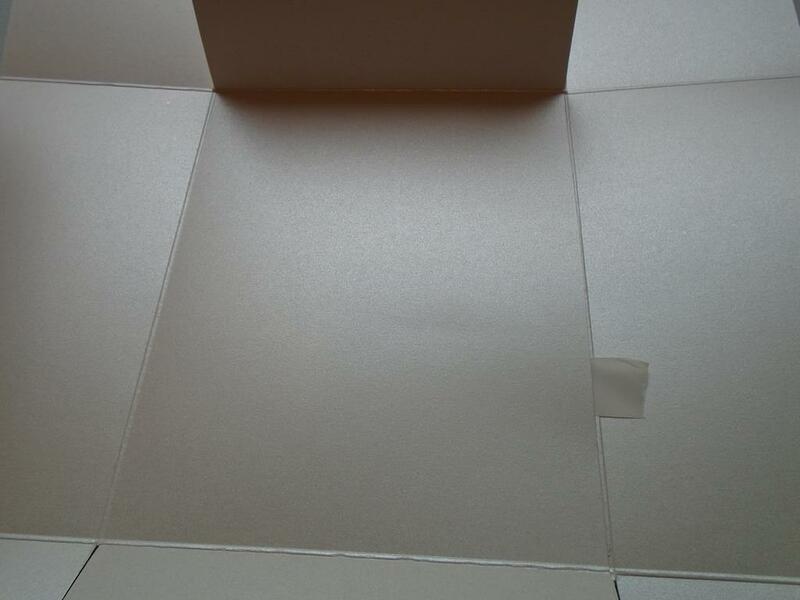 Remove the card from the corner on the top of the card, again use the 2nd in box from the top and sides. Step 12. Crease the bottom score line up and burnish this well. Then do the 2nd line which will make the depth of the gift card project. Step 13. 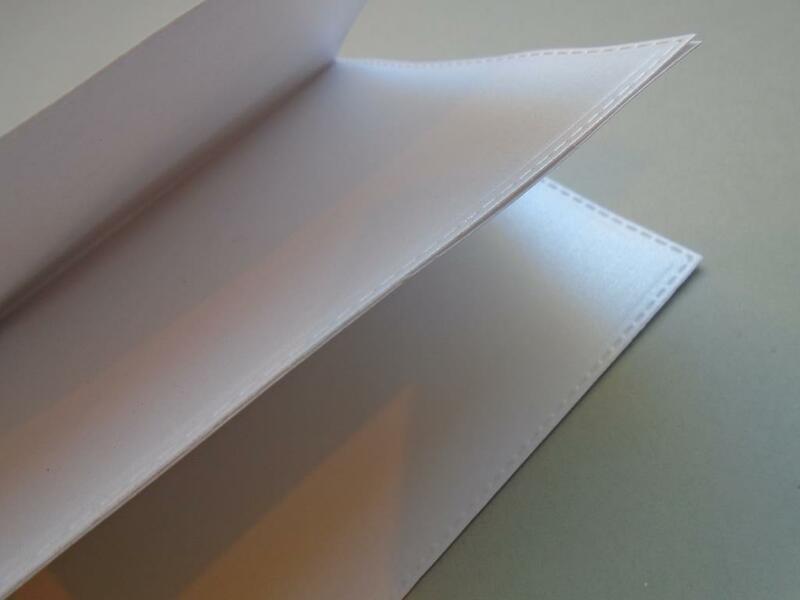 Continue to crease all the scored lines in place folding the card inwards as you work on the score lines. 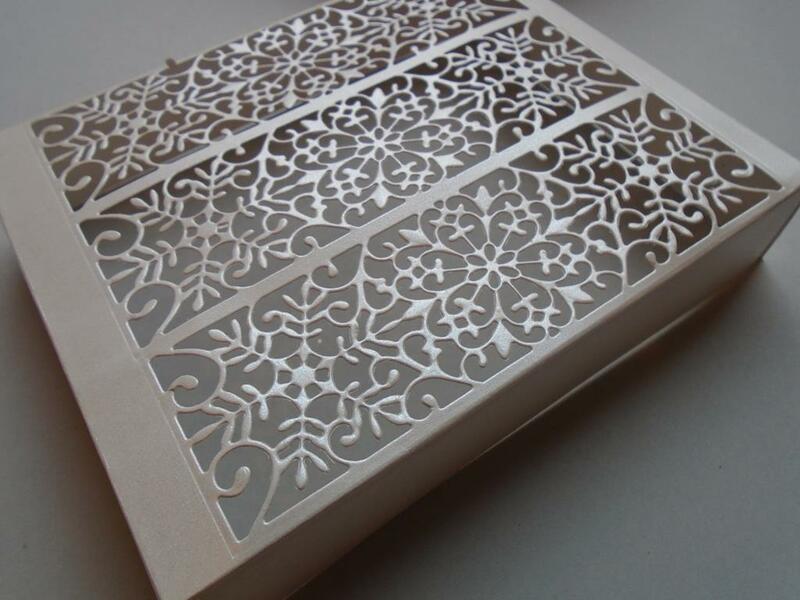 Cut a front panel to 88mm x 90mm or to the width of the box you have just created. Step 15. ……. 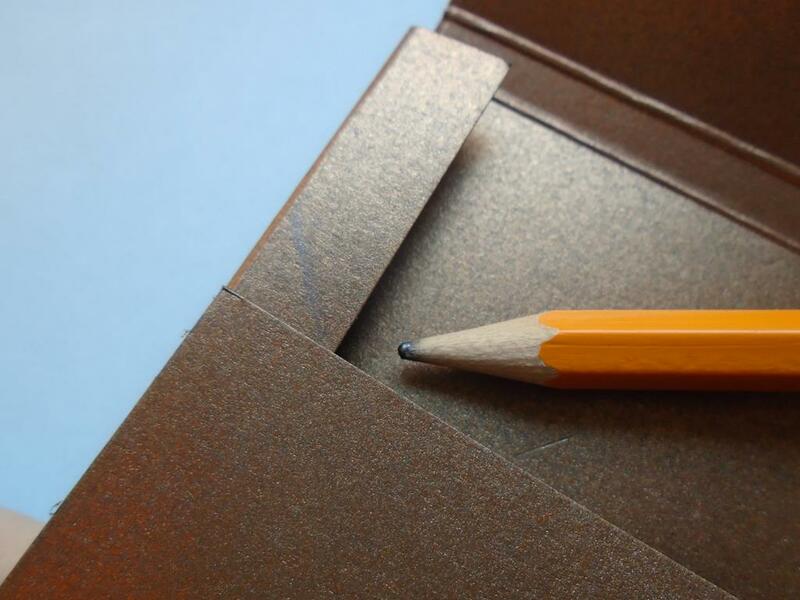 draw a pencil mark where the side inner flaps need to be trimmed at an angle. Step 16. 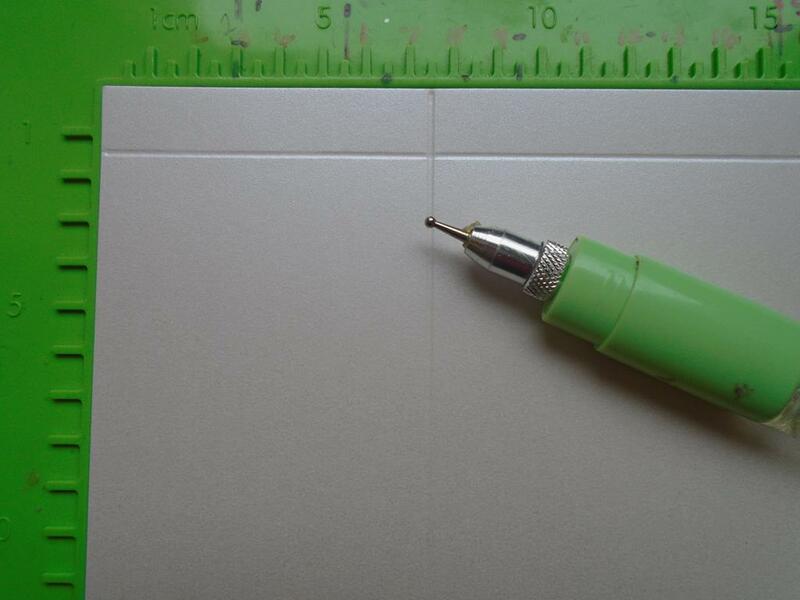 Cut away that excess card and cut the tab area on the diagonal and across the depth tab of the project. Step 17. 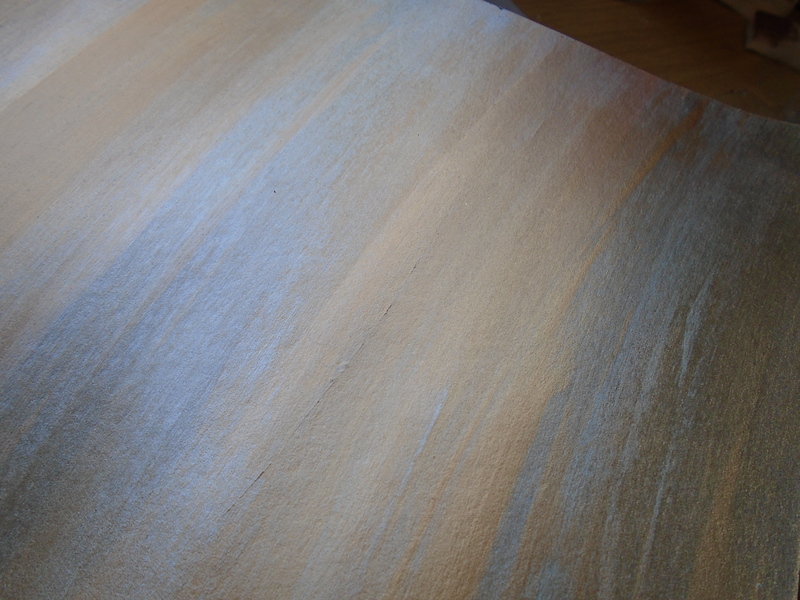 There will be a raw embossed edge where the embossed line was made when scoring earlier. Step 18. 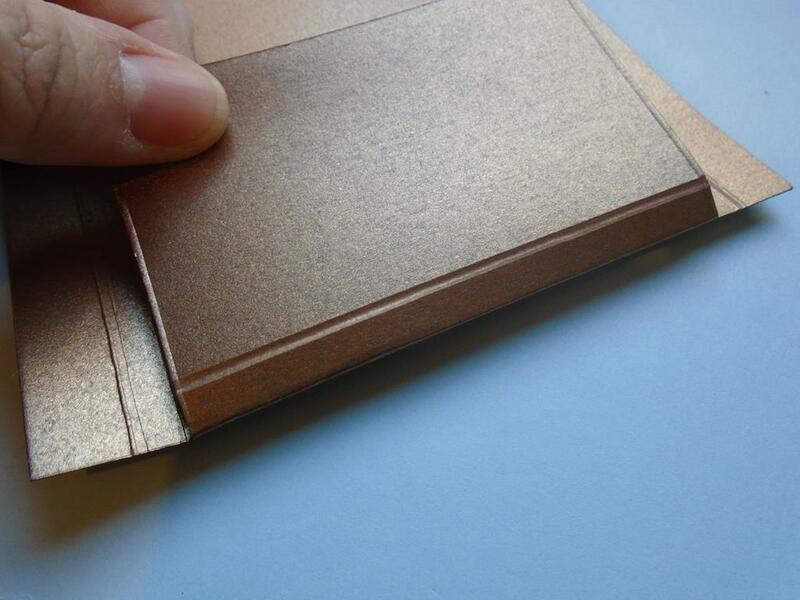 Run an embossed line around the edge on the reverse of the case to neaten this effect. Step 19. 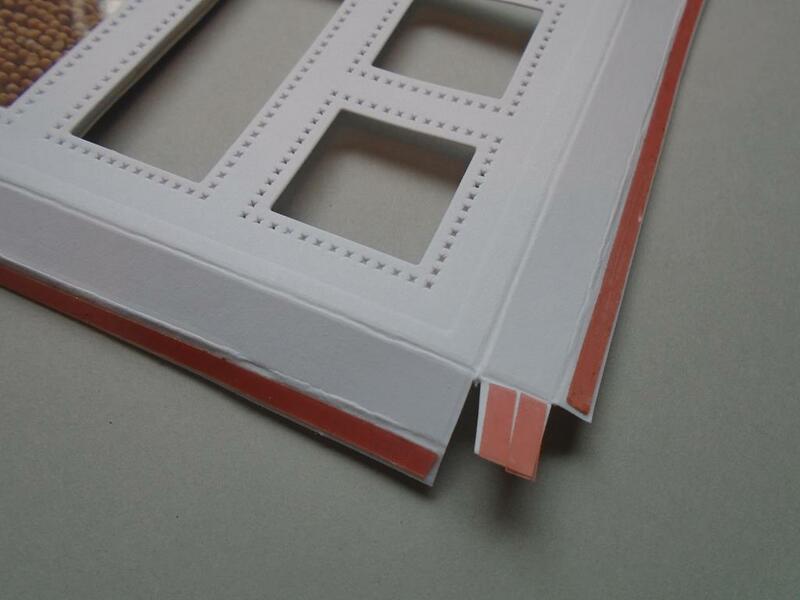 Also score a double line around the back of the front panel for added detail. Step 20. Repeat this on the top flap of the project to tie every section together. Step 21. Go back in a crease the side tabs back over again before they are glued in place. Step 22. 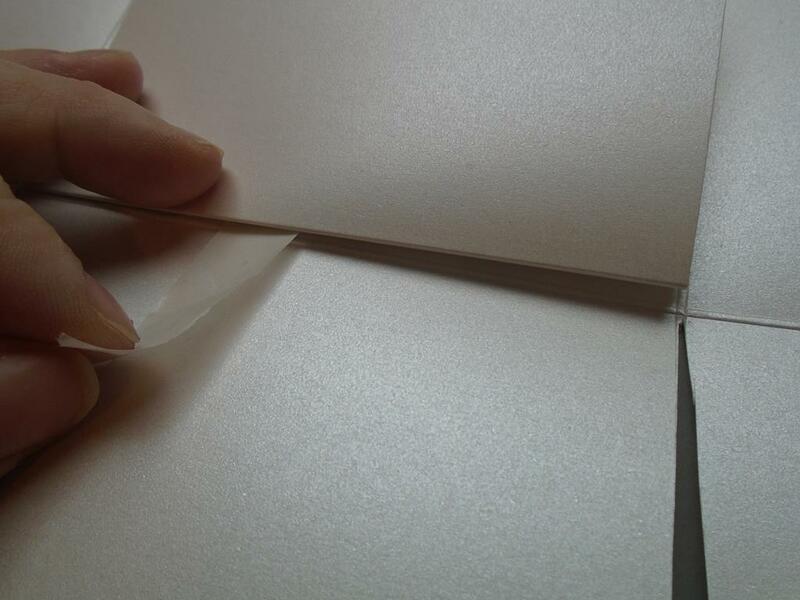 Use a small amount of the Cosmic Shimmer dries clear glue on the inner edge of the bottom flap. This will be needed on both sides of the piece. Step 23. Stick the bottom flap onto the side tabs making sure the depth of the box areas are all nice and straight when the glue is added. Step 24. Now run some of the Cosmic Shimmer dries clear glue down the sides and the front bottom area of the piece. REMEMBER not to glue the diagonal area at the top of the side piece. Step 25. 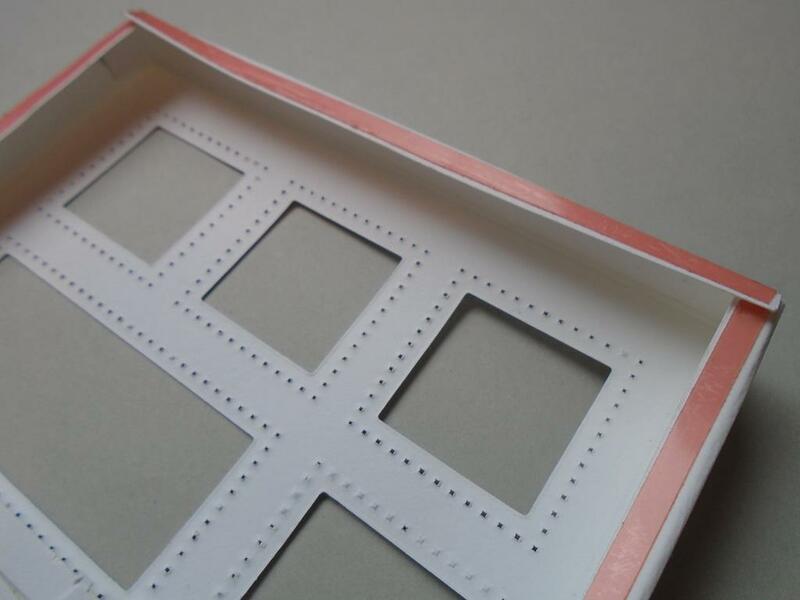 Stick the prepared front panel onto the glued tabs to create the basic shape of the case. Step 26. 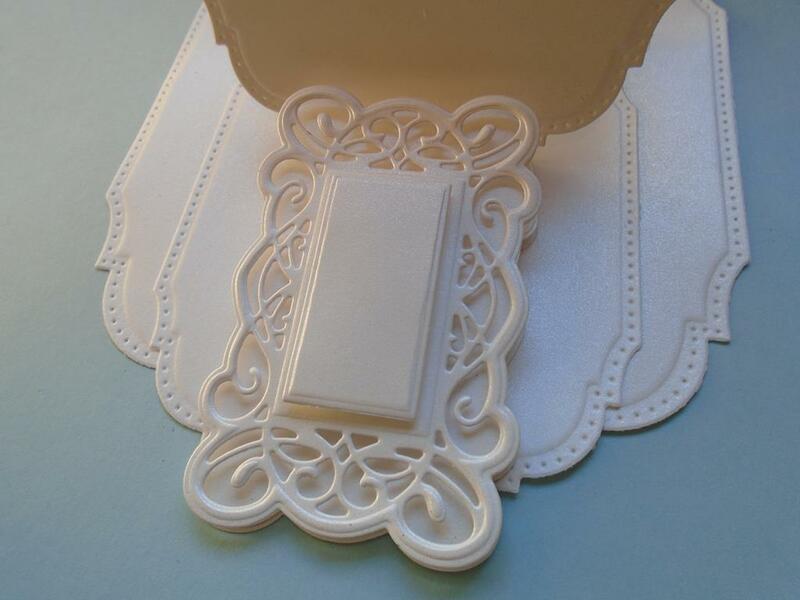 Cut a solid die shape using the outer die from the Sue Wilson Belgian collection ~ Tags die set on a piece of coconut card / white card. Step 27. 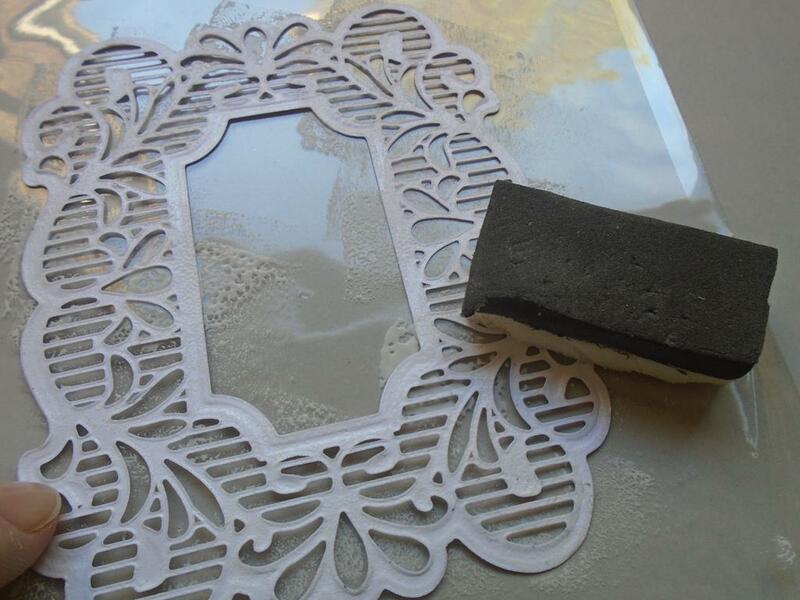 Add foam pads behind the solid area of the gilding polish piece and attach this to the solid white frame. 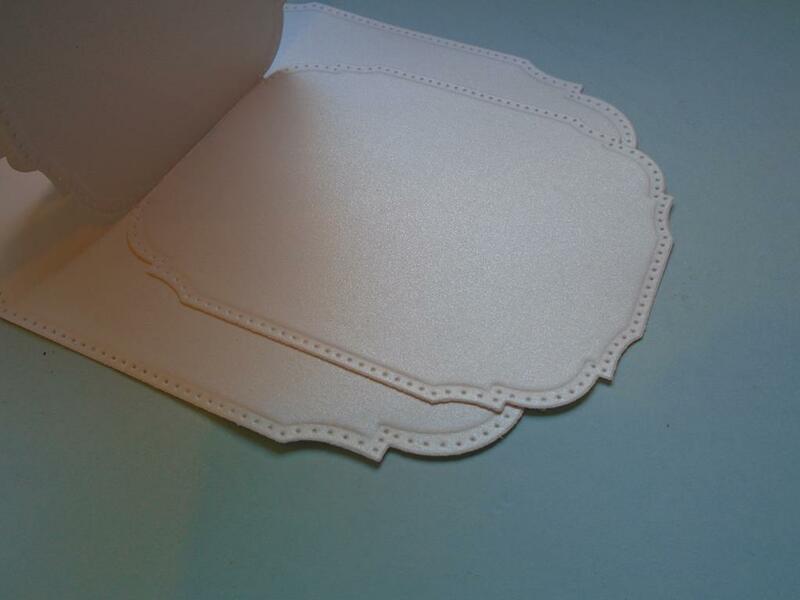 Then cut the small rectangle die from the tags set in an off cut of pearl icicle card. 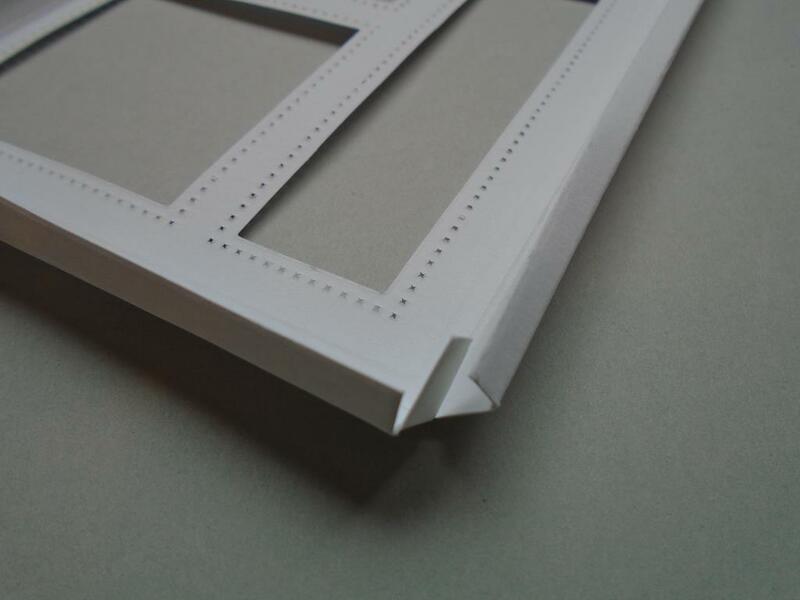 Add this to the frames using foam pads behind the piece. Step 28. 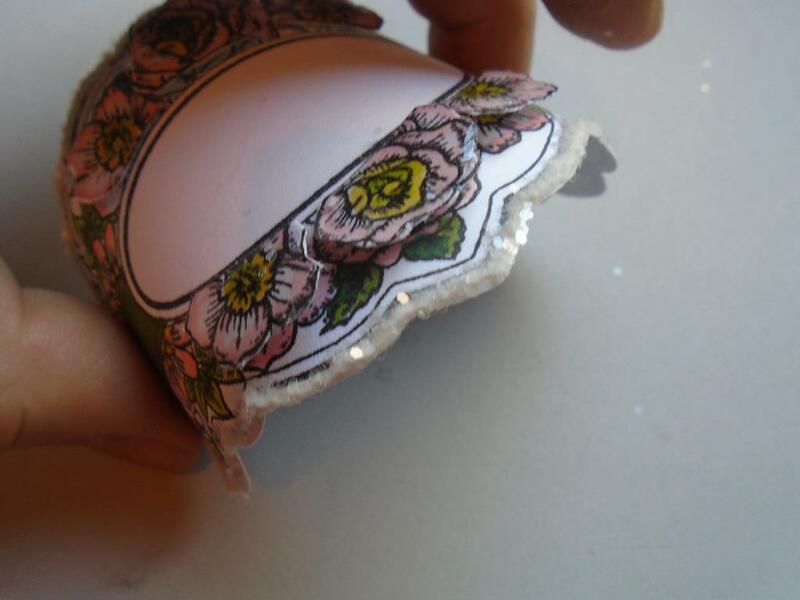 Apply some Cosmic Shimmer dries clear glue to the top area only on the reverse of the worked piece as it`s going to overhang the gift card flap. 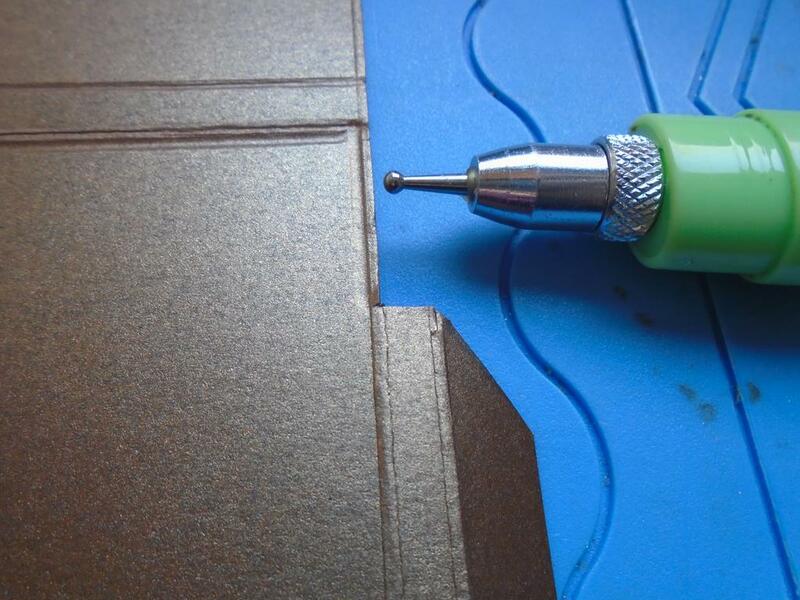 It`s best to lay the panel over the flap first to gain an idea of where the glue is needed. Step 29. 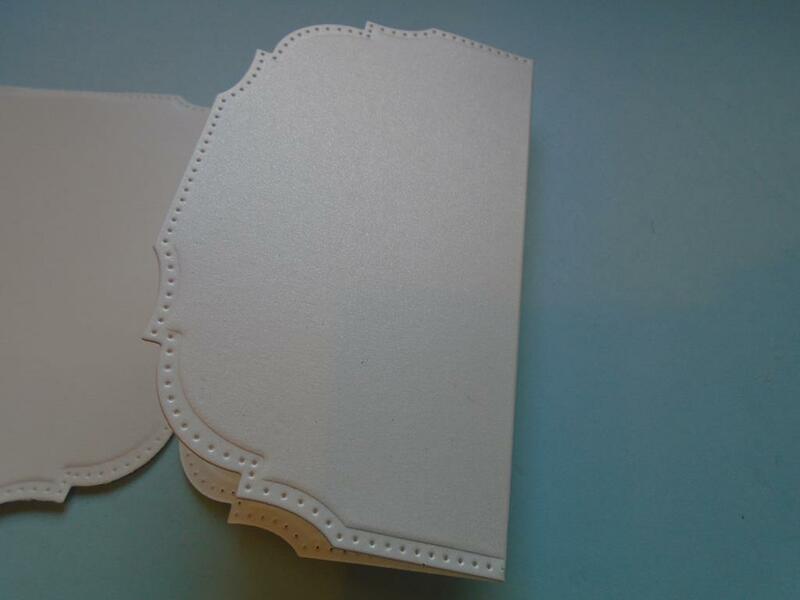 Now add the panel to the flap of card to make the feature and closure part of the card. Step 30. 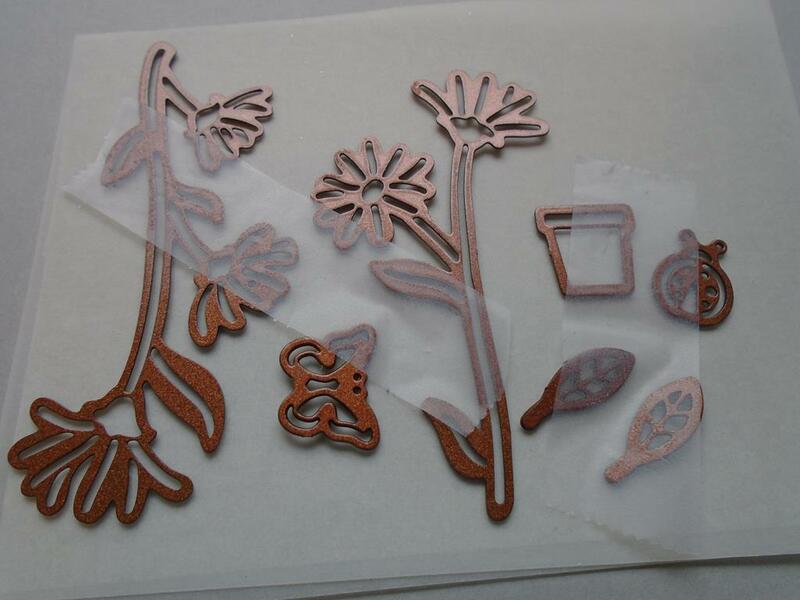 Take the stamps to die for… sunlit daisies stamp and place it on an acrylic block. Ink the stamp with some London fog memento ink pad as the Graphmaster pens are going to be used. 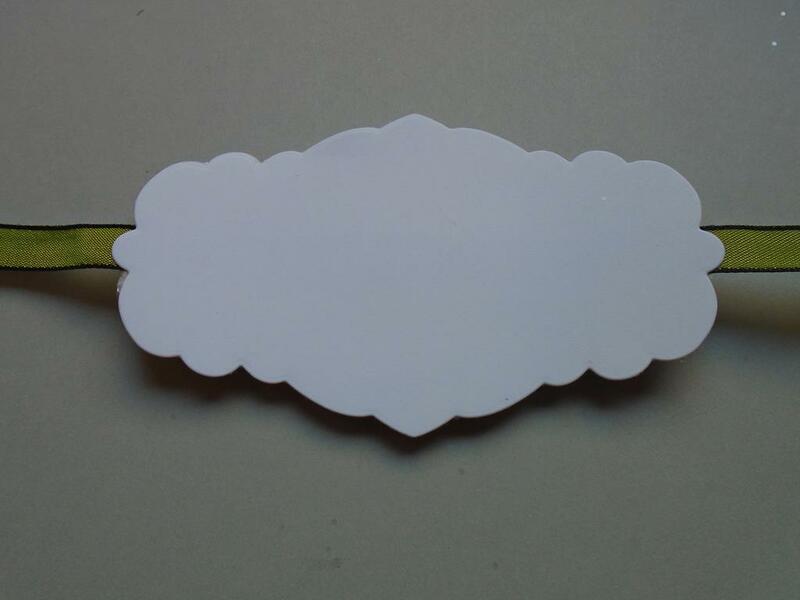 Stamp the image onto a piece of coconut or white card. Make sure it is a smooth card. Step 31. 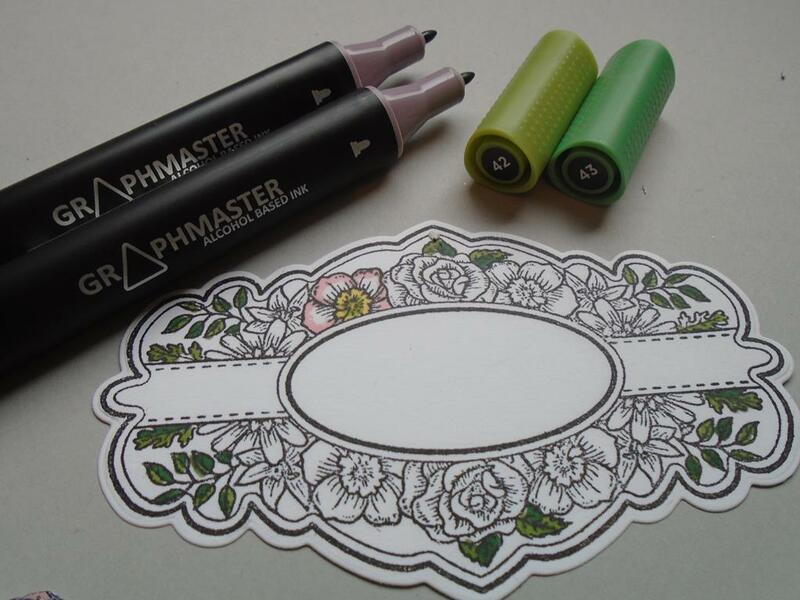 Use the Graphmaster CG1 & CG2 to shade the petals of the flowers in. The flower works well with the darker CG2 in the centre. 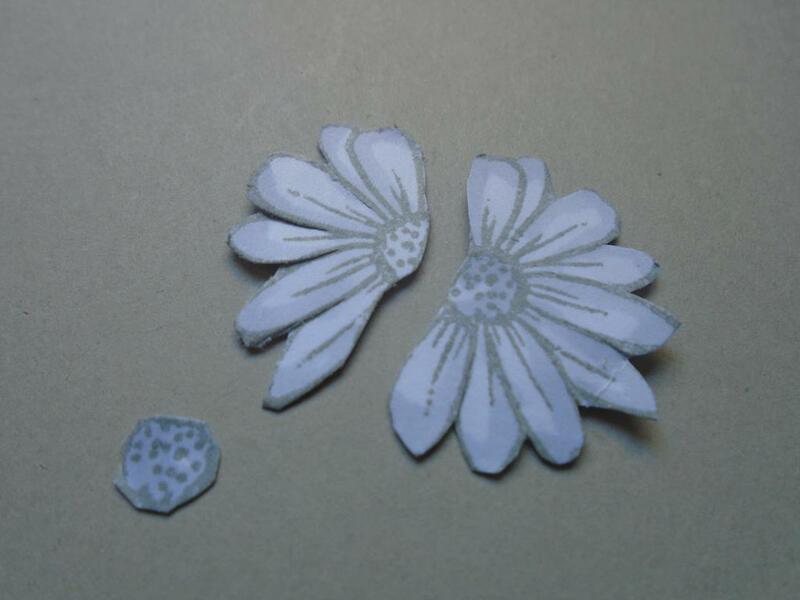 Cut 2 of the daisies out using a small pair of decoupage snips ( or whatever you are used to). Step 32. To make a full flower cut 2 of the daises out of the frame. Also cut the round centre of the daisy which can be found on a few of the flowers. As one of the flowers is larger add a small amount of Cosmic Shimmer dries clear glue onto the central edge of that daisy and lay the small daisy over the top. Marry up the petals of the flowers to make a seamless whole daisy. Make 3 whole flowers in total and cut out 3 leaves. Step 33. 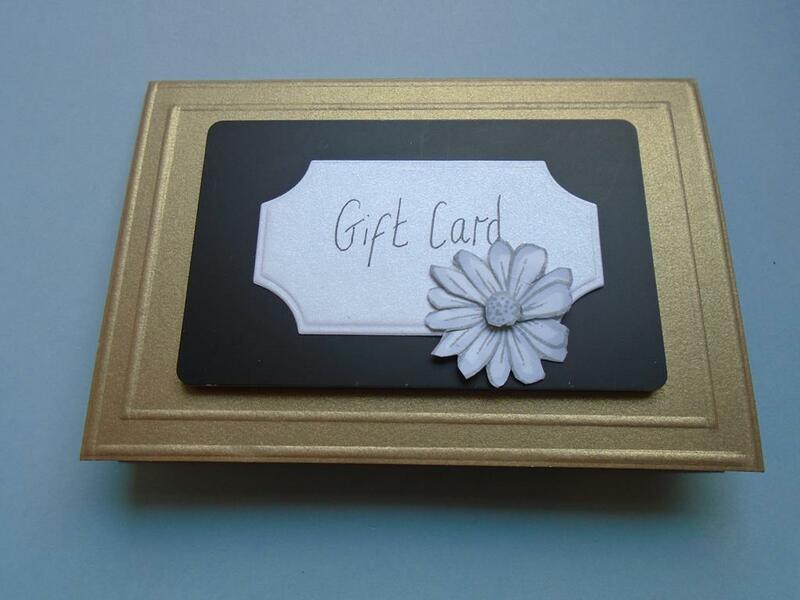 Add a gift card on a glue dot and place it onto a folded card which measures 11 ½ cms x 8cms. 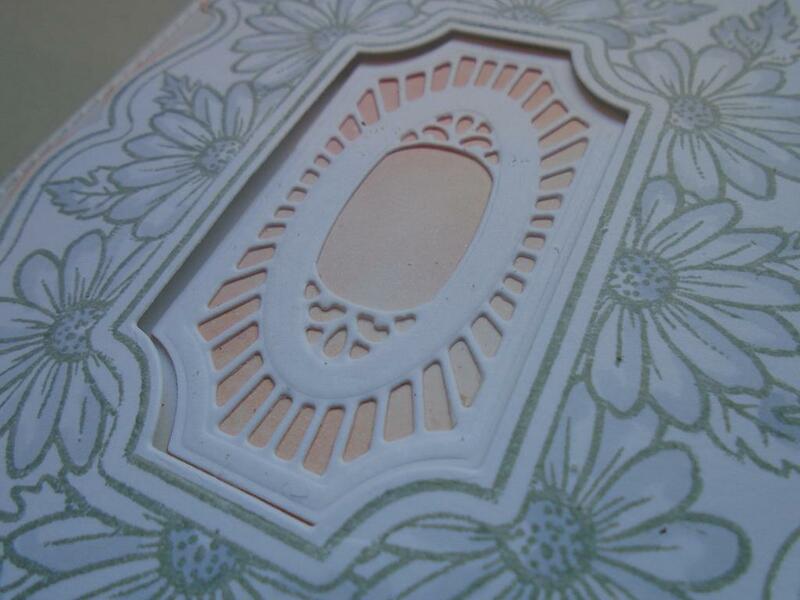 This has had a double embossed line run around the back of the card to continue the detail throughout the project. Here an old gift card has been used with the company name hidden but you can leave the new one open with the gift card wording. Step 34. Tuck the gift card into the pouch or use the piece for ATC`s. Step 35. Add the remaining 2 daisies and the leaves to the front panel to finish the project off nicely. Step 36. 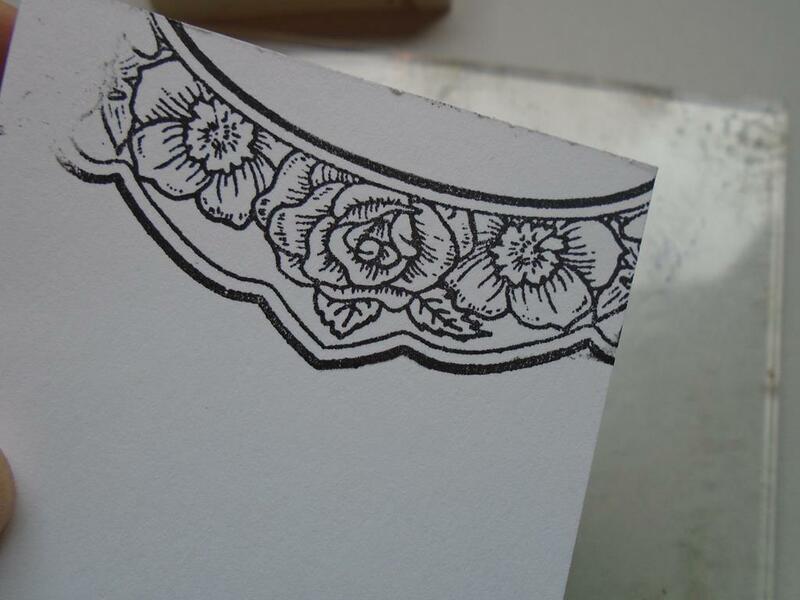 Often embossed lines can add a layered look to a project yet it`s just a single layer of card. This works well on the Foundations pearl card. Step 37.Here is the finished project with the ombre effect on the gilding polish frame. So remember to keep all your off cuts as they come in handy for small projects. 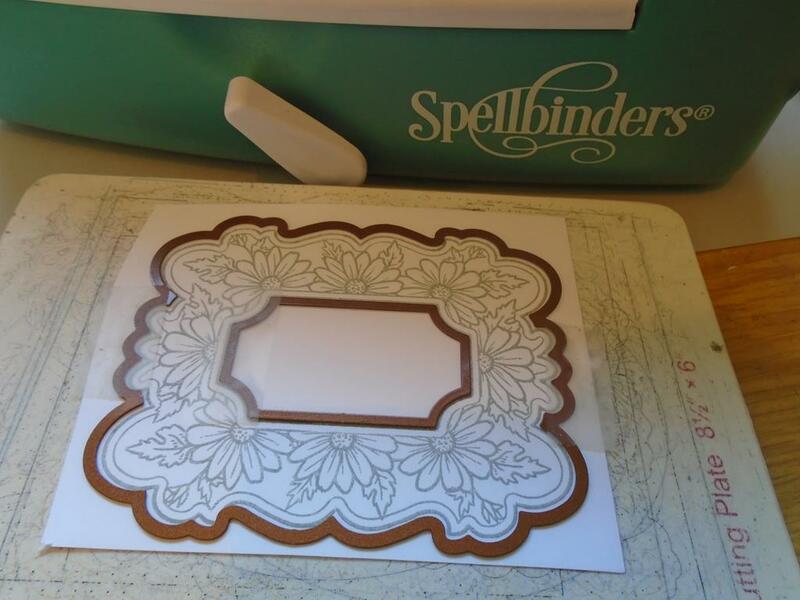 This project will show you how to make this card by curving the Sue Wilson trellis edger die cut shape around one of the pierced noble die frames. 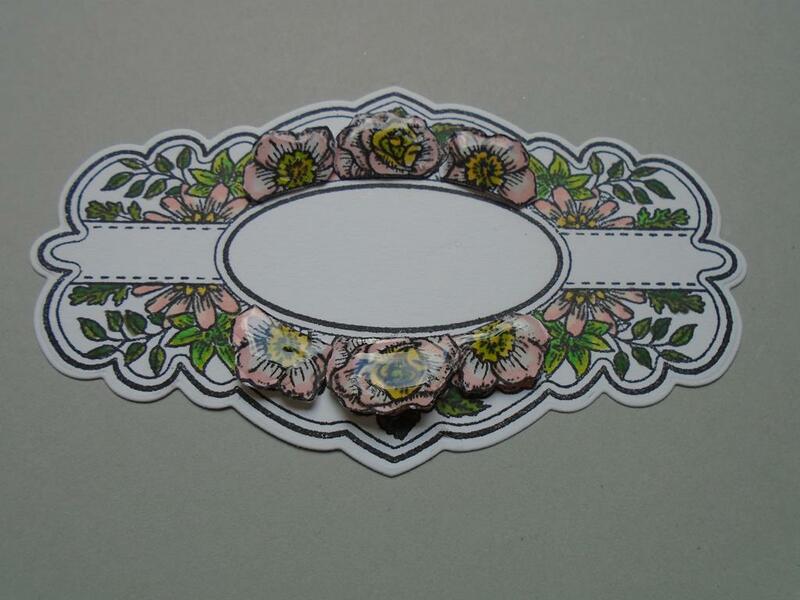 The daisies are coloured in with the Graphmaster pens & distress inks for a shabby finish. 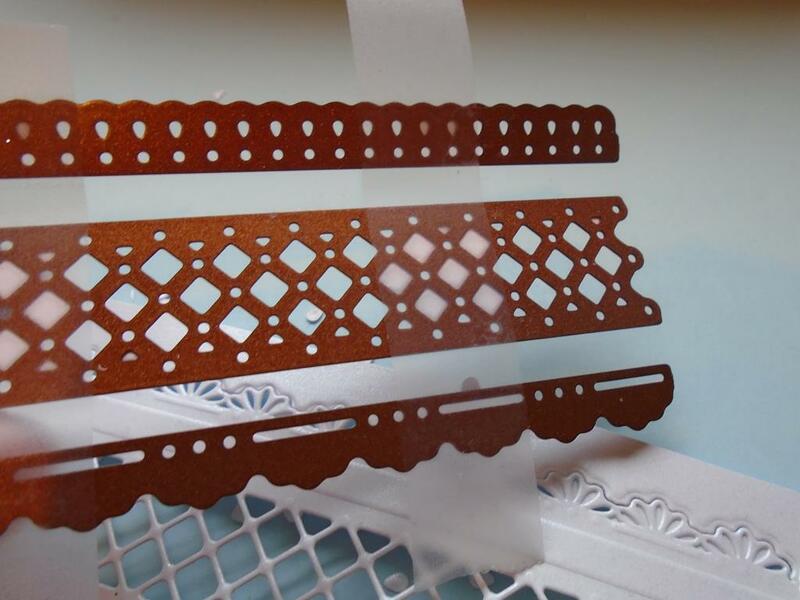 Lots of different layers with the mica flakes being seen under the trellis die shapes. 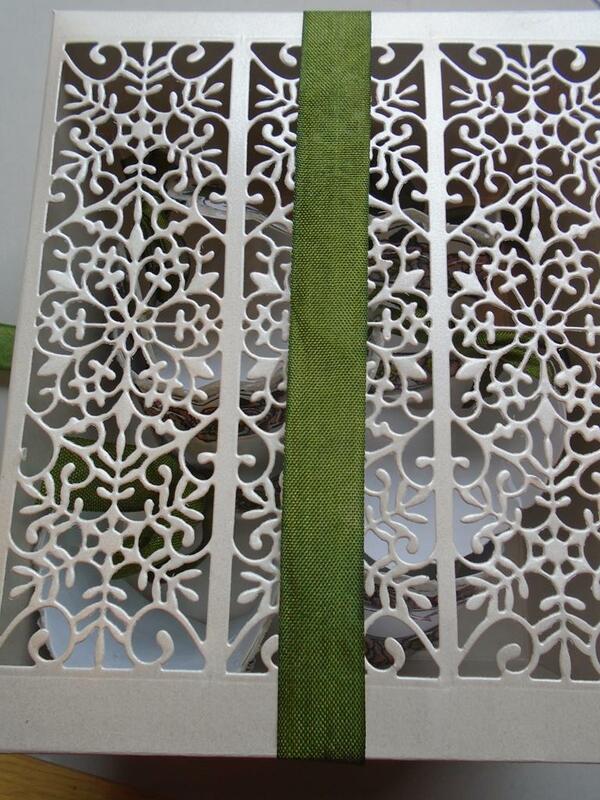 Stunning detail edges the trellis die and this works so well with the pierced rectangle die panels. Step 1. 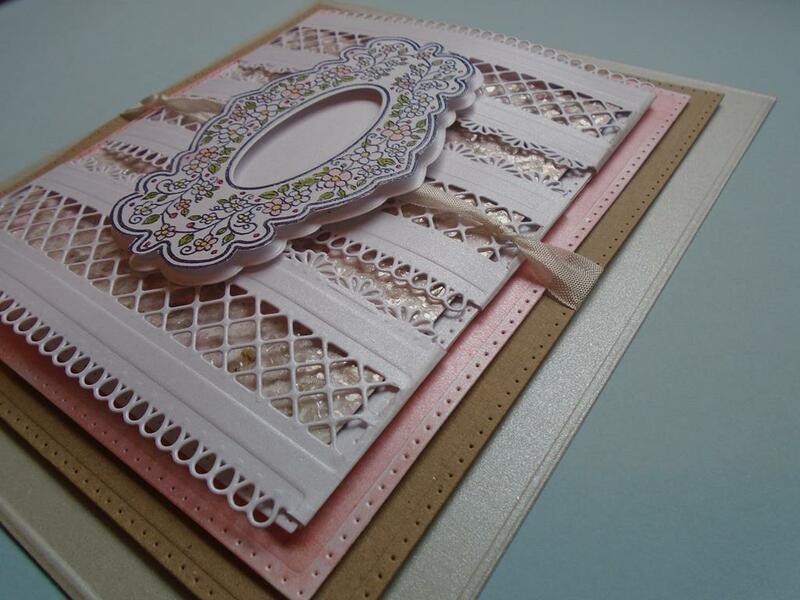 This workshop will show you how to make this dimensional card using the trellis die but by curving it as you`ll see later on. The colour scheme can be changed for whatever season you wish but I’ve just gone for fresh colours tones. 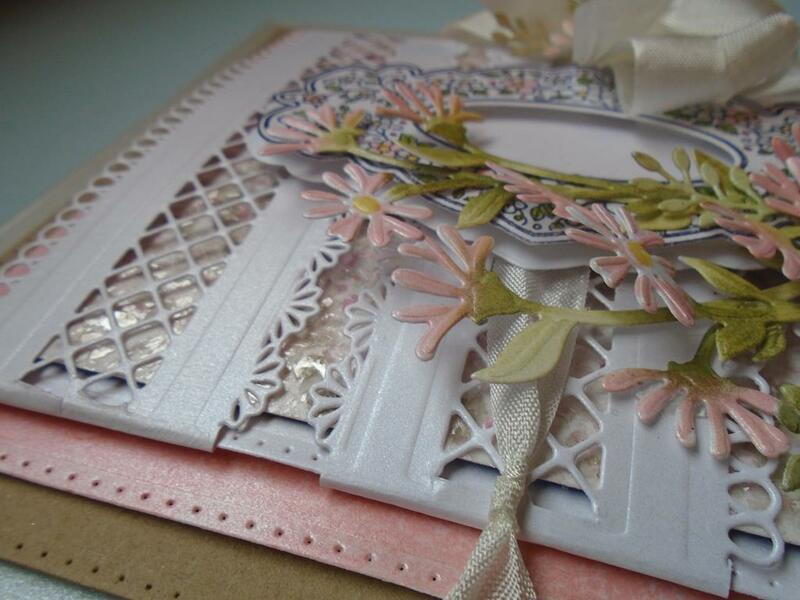 The main products used are the Sue Wilson configurations trellis edger die, the Noble double pierced rectangle die set, the frames & tags collection Molly die, the delightful daisies die, the delicate fronds die along with the stamp to die for ……. 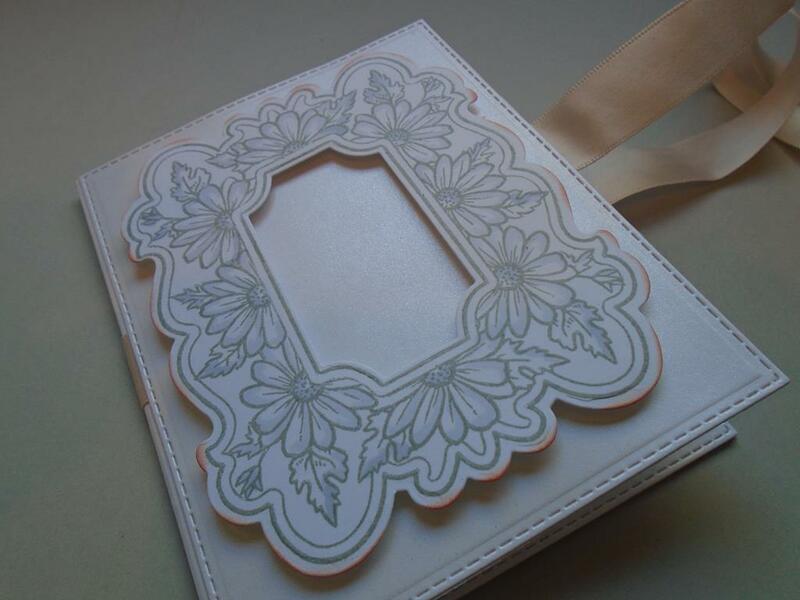 delicate floral frame. The shimmer behind the trellis is created using the Cosmic Shimmer mica flakes ~ marshmallow. Please see full product list for all the other items used in this project. Step 2. 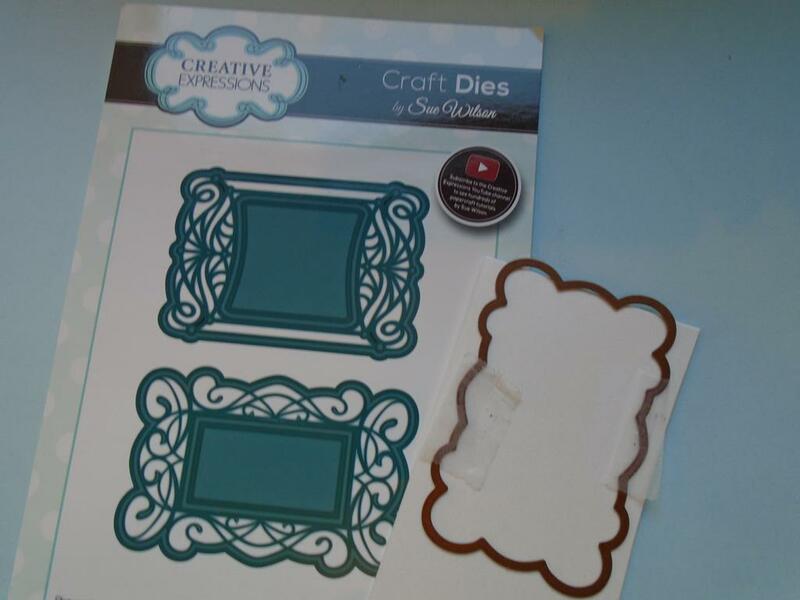 Place the dies from the Sue Wilson configurations trellis edger die set onto a piece of the Foundations pearl icicle card. 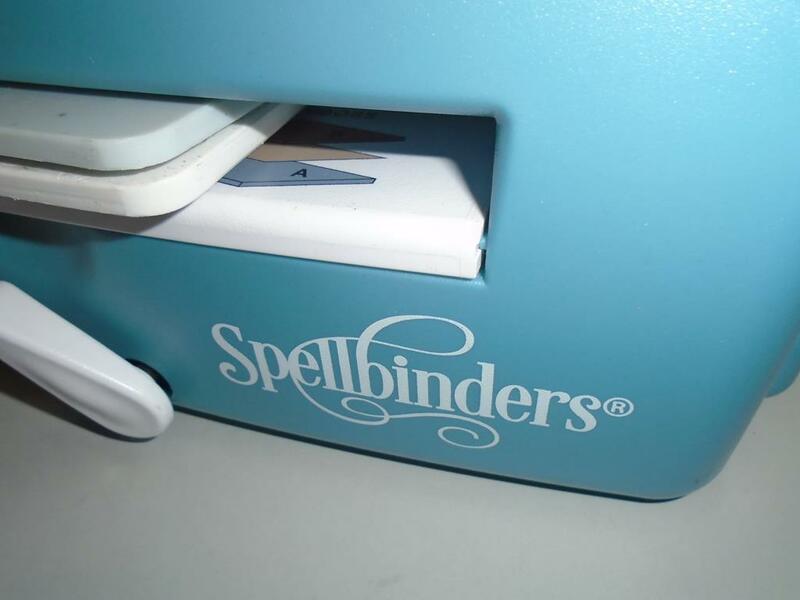 Separate the dies apart and secure them onto the card using some long strips of the low tack tape as you`ll need to lift the dies up altogether later on and this will help. 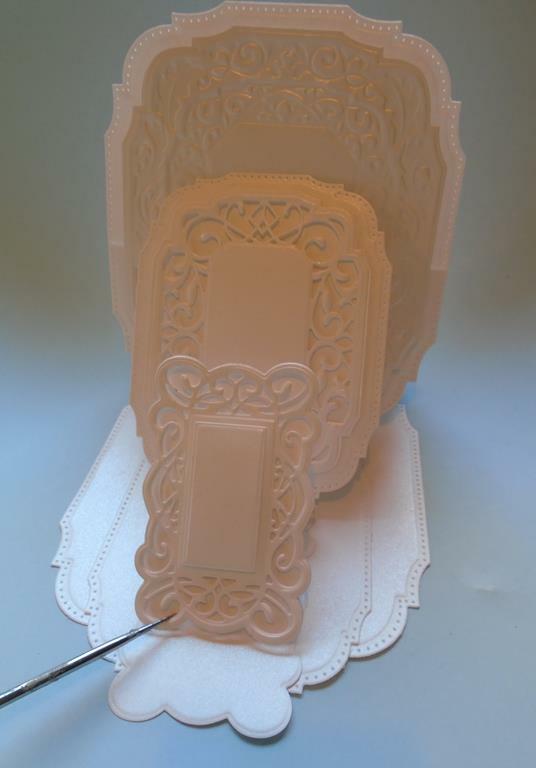 As you can see a small gap has been left to make a wider panel and in turn this will leave a nice embossed section once the dies are removed from the card. 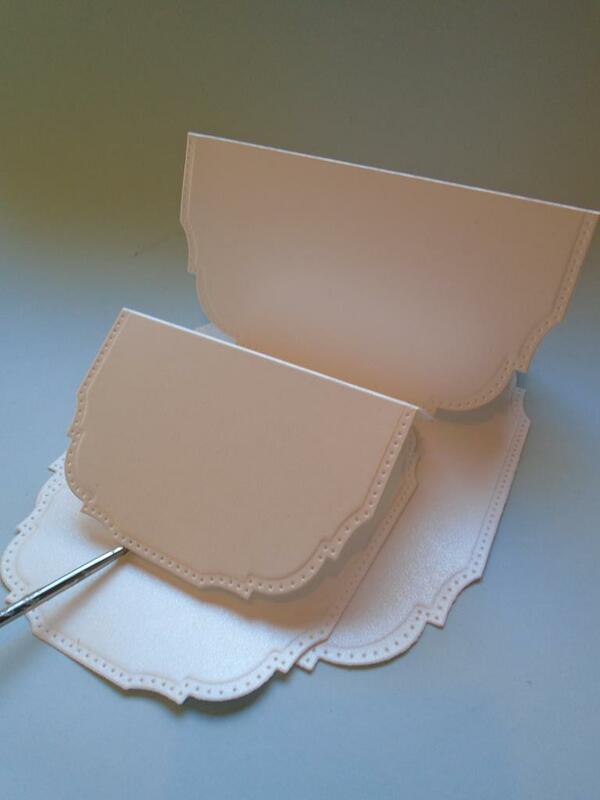 MAKE SURE you leave a 1cm gap down the side of the dies as this will be used as a tab later on. Step 3. Pass all the prepared die shapes through the Grand Calibur machine twice to cut and then emboss them using the pink plate, tan mat & base plate. 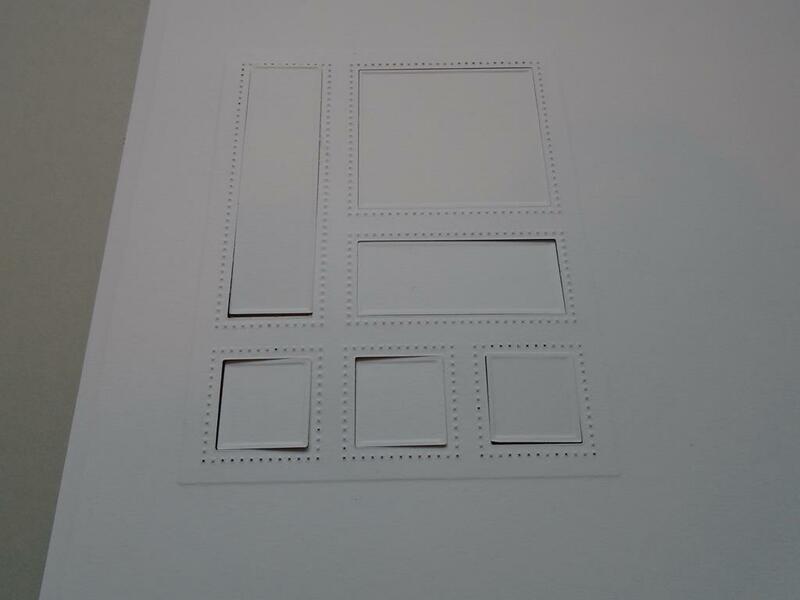 Doing the panels separately means you can emboss each panel. Step 4. 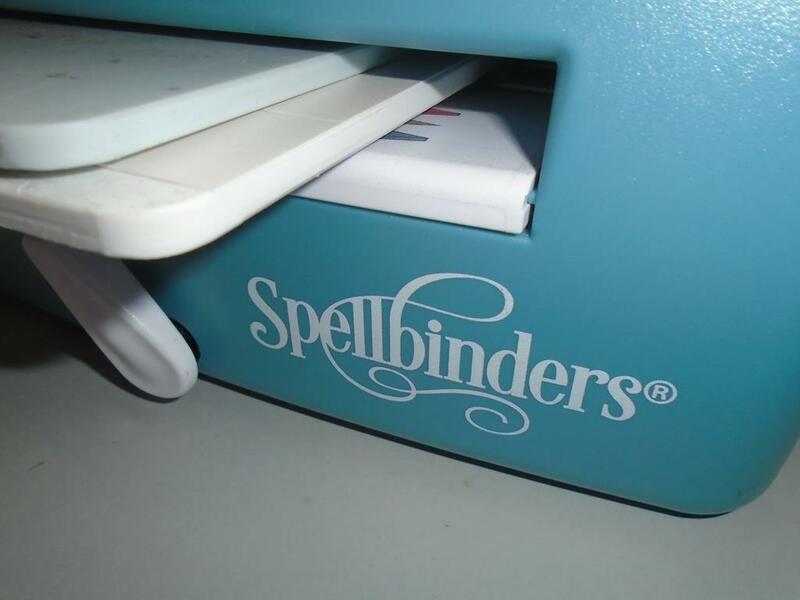 Use the Spellbinders tool in one to run over the die and card stock. 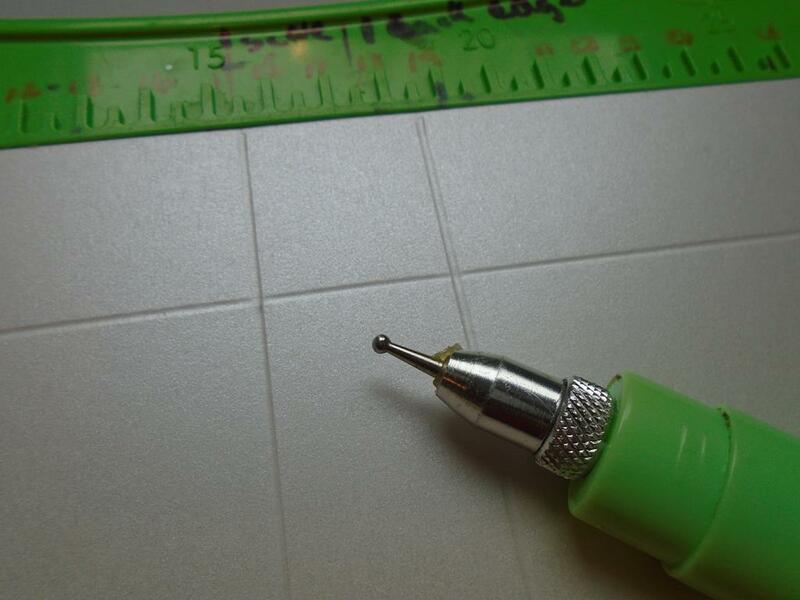 This will remove most of the small detailed pieces from the die & card. Step 5. As you can see the small pieces of card are still on the low tack tape but they can be poked through the front using the tool in one pokey tool end as you do want to remove the card with the low tack tape still in place on the dies. Step 6. So remove the die from the card and poke the pieces out. Step 7. 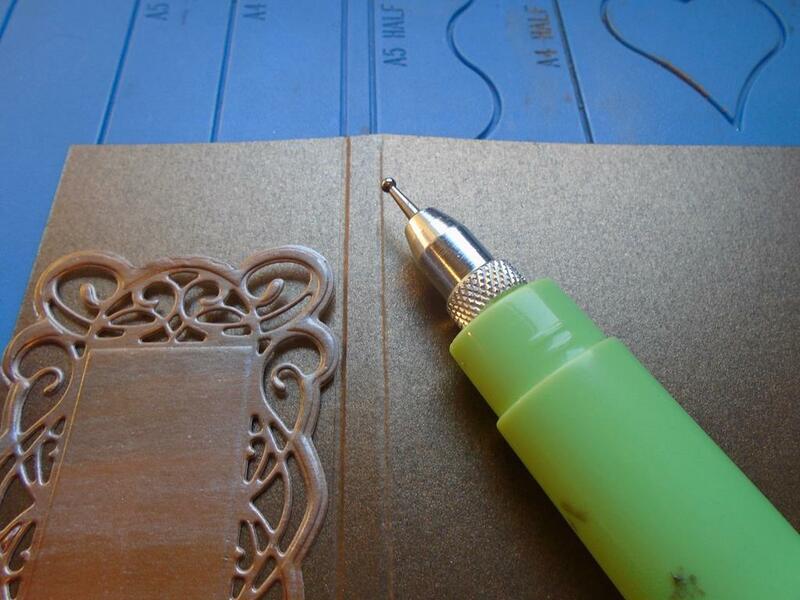 Snip from the edge of the card to the 1st detailed die cut area. This will leave a small tab end. 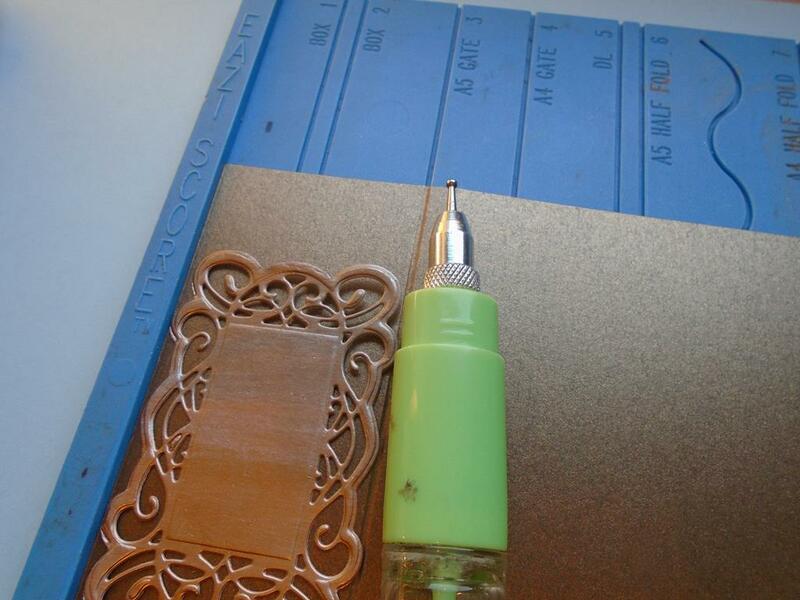 Do this on the other end, but this time you`ll also have to trim the 1cm tab at the end of the die as the die was cut on a larger piece of card. Step 8. 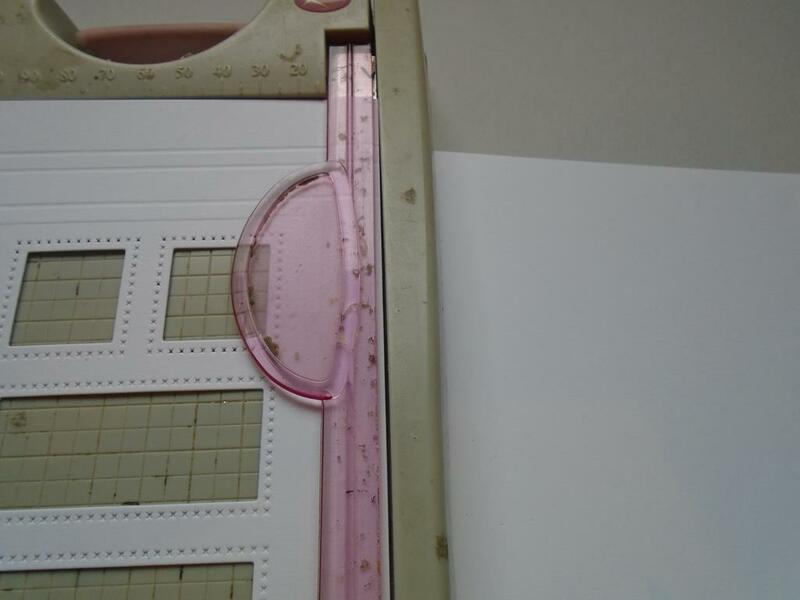 Place the die cut panel onto a score board and score a line down the edge of where the die finishes. Step 9. Crease the score lines downwards to reveal the 2 end `V` shapes, trim along the solid line to remove the `V` on both ends of the die strip. Step 10. Fold the tab downwards to create the tab effect. Step 11. Continue to do this process so you end up with 3 trellis panels. Step 12. 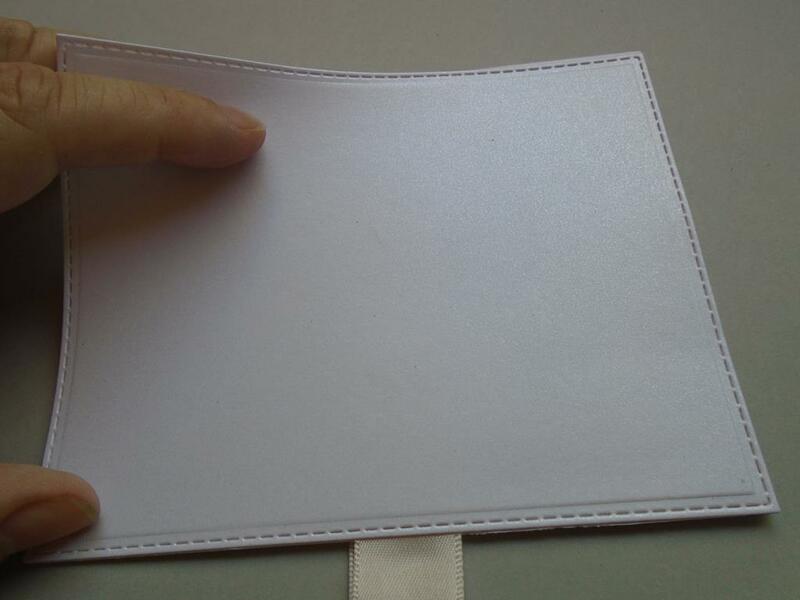 Here the tab area has been held down to show how it will look once it`s been placed behind a solid piece of card. It means the panel will have dimension created by the card itself. Step 13. 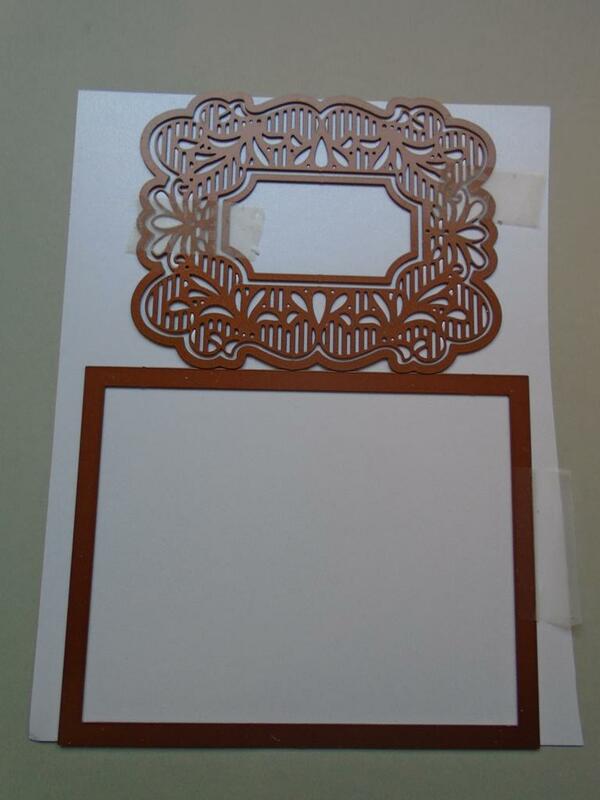 The solid outer die from the Sue Wilson frames & tags collection Molly die set has been turned upright to show how the die will look on the background of the 3 trellis panels. 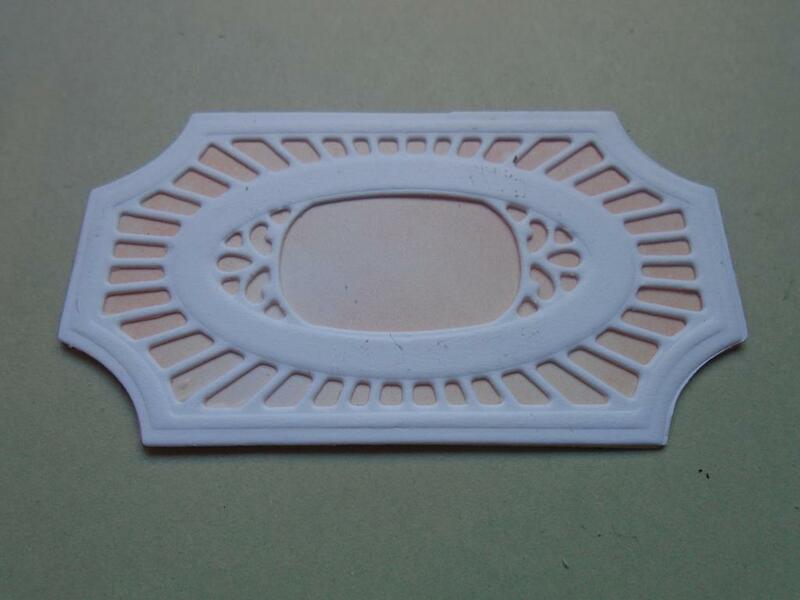 (don`t cut with this die like this it`s just to see if the shape fitted nicely). Step 14. Select a piece of the Foundations coconut card and place the stamp to die for ……. 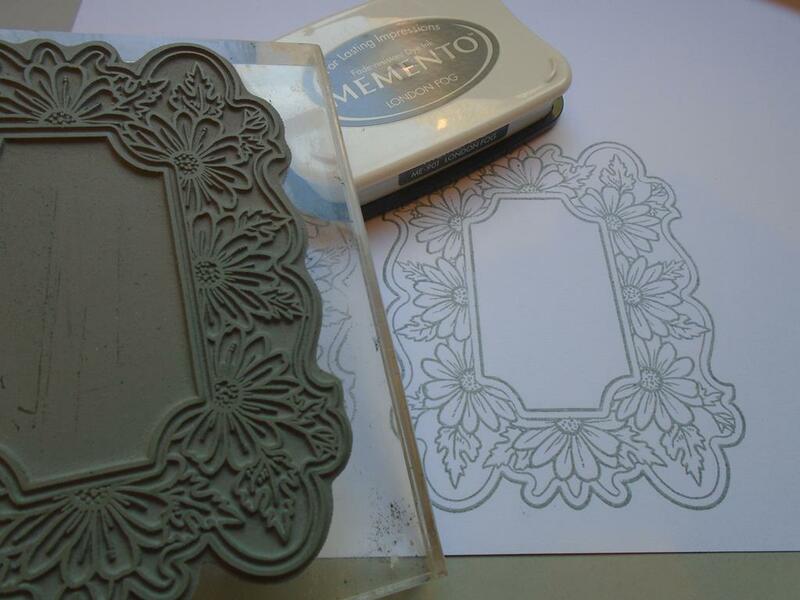 delicate floral frame stamp on an acrylic block. 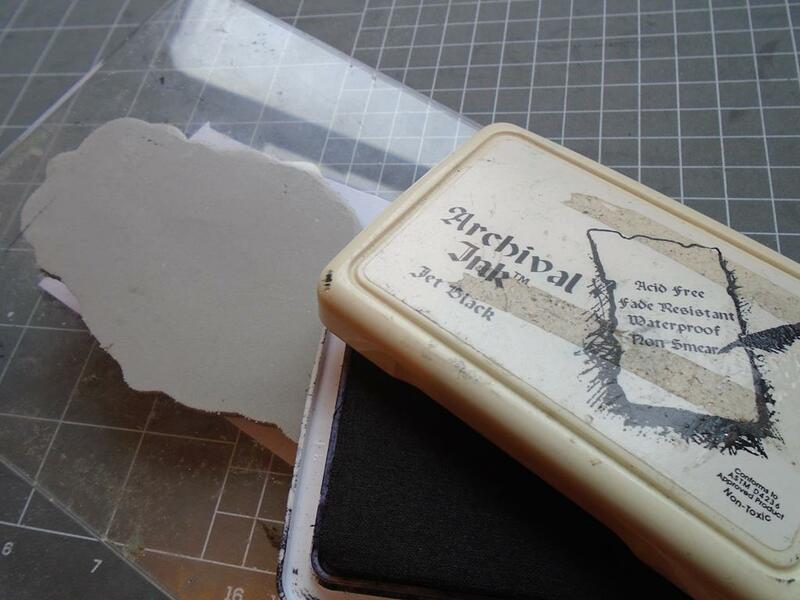 Ink it up using the black archival ink pad. Step 15. 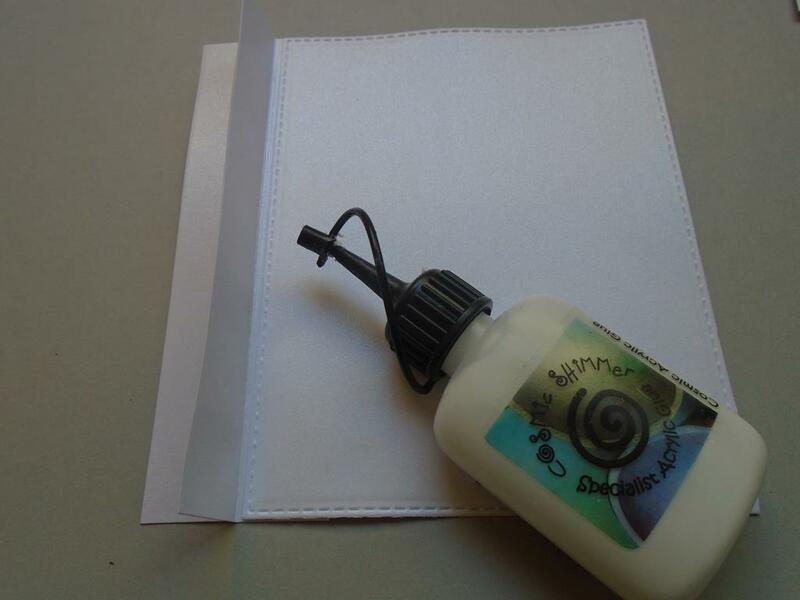 Stamp onto the card and then add the Cosmic Shimmer clear embossing powder over the ink as quick as you can. 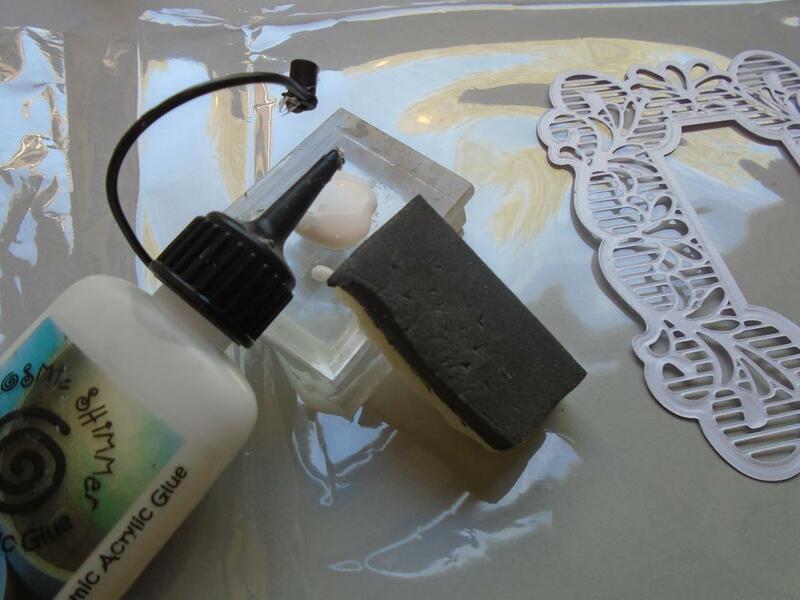 Tip the excess powder onto a piece of paper and then heat set the embossing powder. Step 16. 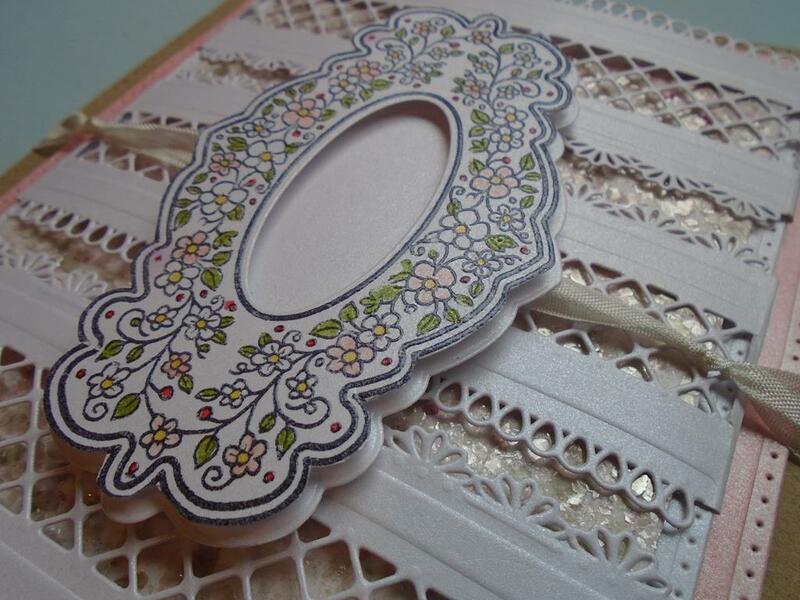 Cut out a solid frame using the Sue Wilson frames & tags collection Molly die on a piece of the pearl icicle card. Set aside for later. Step 17. 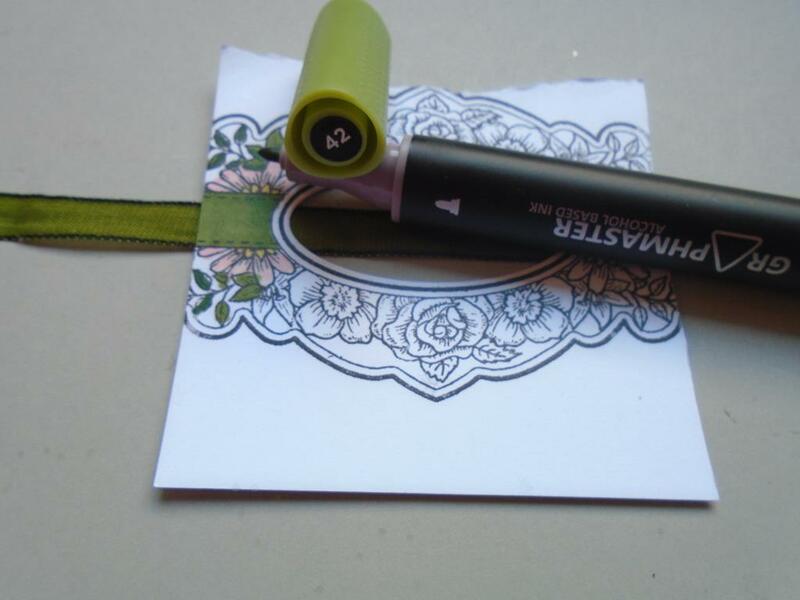 Take the Graphmaster number 42 green pen and colour the leaves in the stamped panel. Step 18. Now take the Graphmaster number 37 yellow pen and colour in centre of the small flowers. Step 19. Take the Graphmaster number 28 pink pen and colour in the flower petals on the panel. Step 20. Use the Graphmaster number 12 red pen to colour in the remaining dots that are on the stamped images as this will pull your eye into the detail more. Step 21. 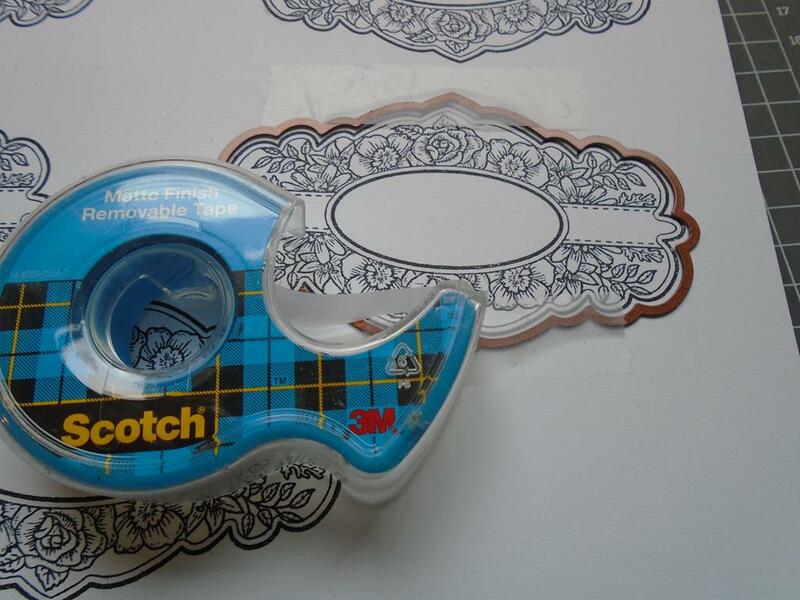 Take a pair of decoupage snips and go around the outside of the embossed edge of the stamped image. 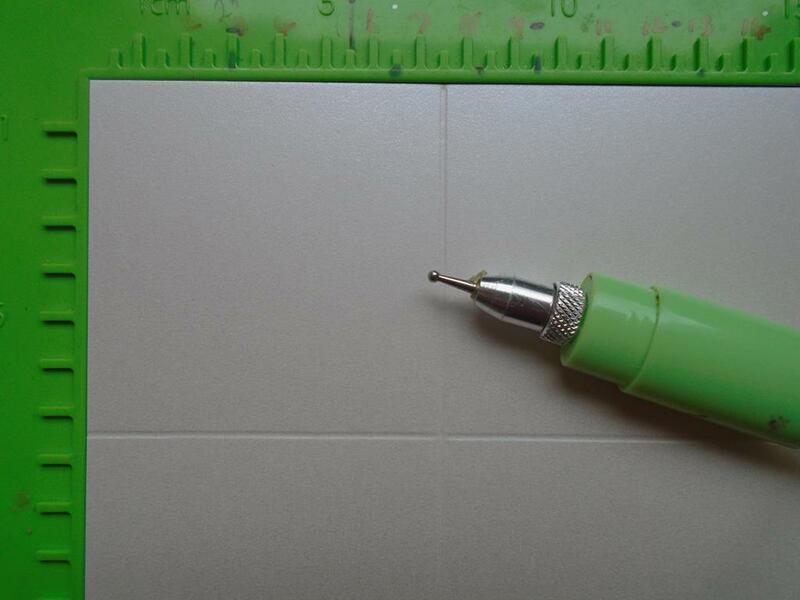 Be careful as you don`t want to cut the embossed lines as it can cause it to crack off. 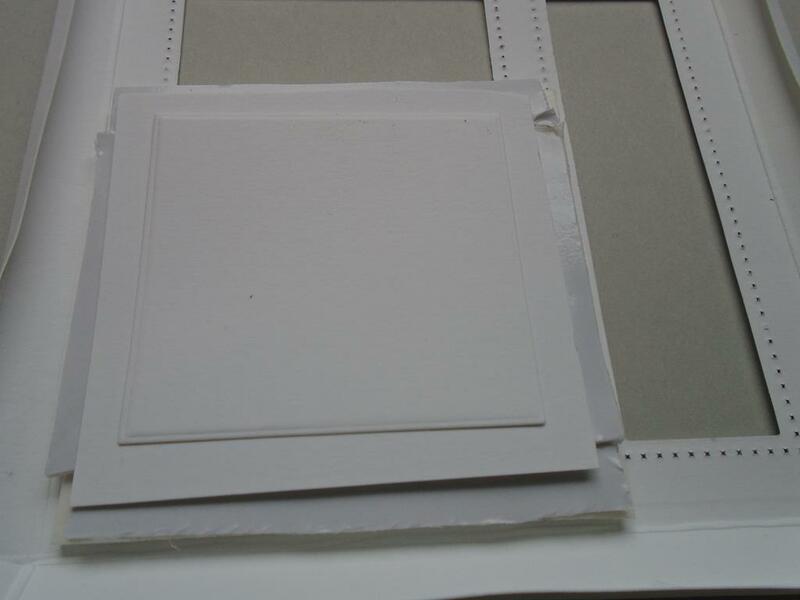 Place the image onto the solid pearl panel that was set aside earlier using foam pads for dimension. Step 22. 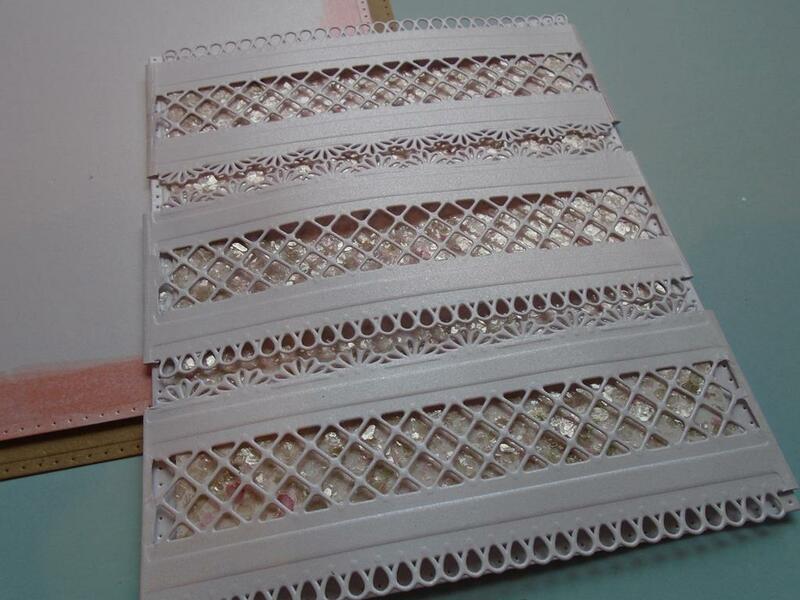 Cut a panel in the pearl icicle card using the similar size Noble double pierced rectangle die. 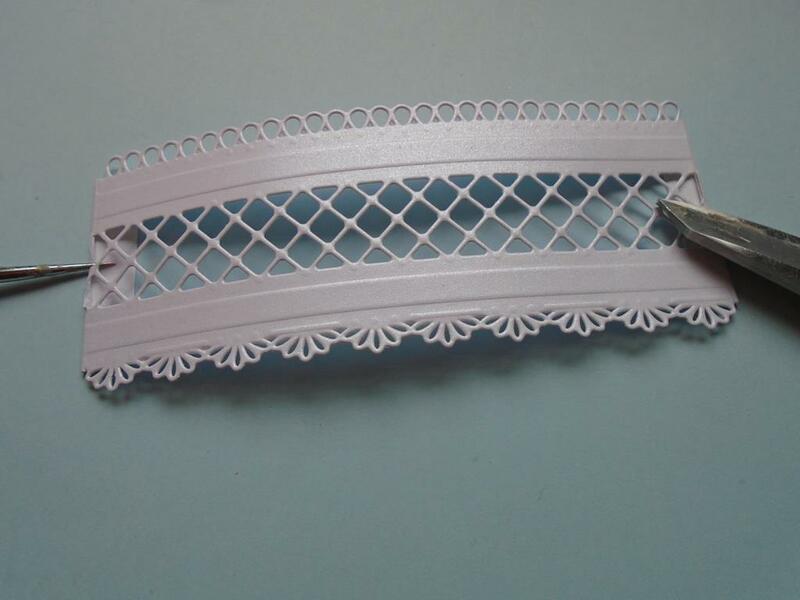 It`s the die shape that measures 13cm by 15.5cms and it`s useful for the width of this trellis die. Step 23. 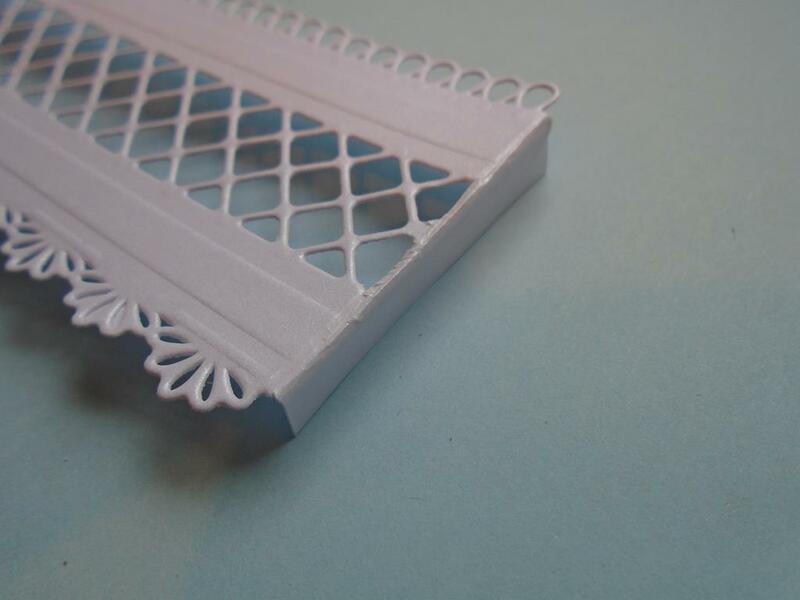 The prepared trellis needs to be the right size that when it`s placed over the pierced panel it will curve. 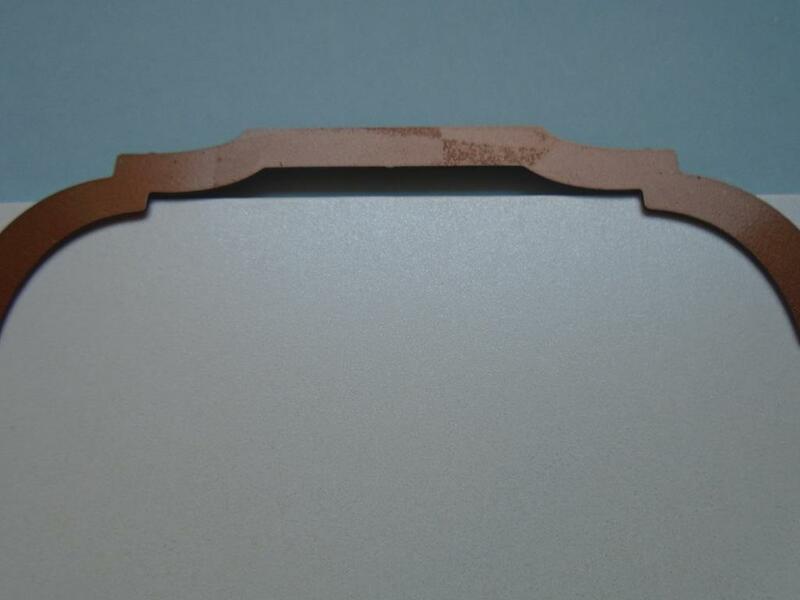 So you may have to score the tab 1mm or 2mms further out towards the edge of the tab. You`ll see when you come to fit the trellis over. Failing that just use a solid cut panel and place the trellis panels over. Step 24. 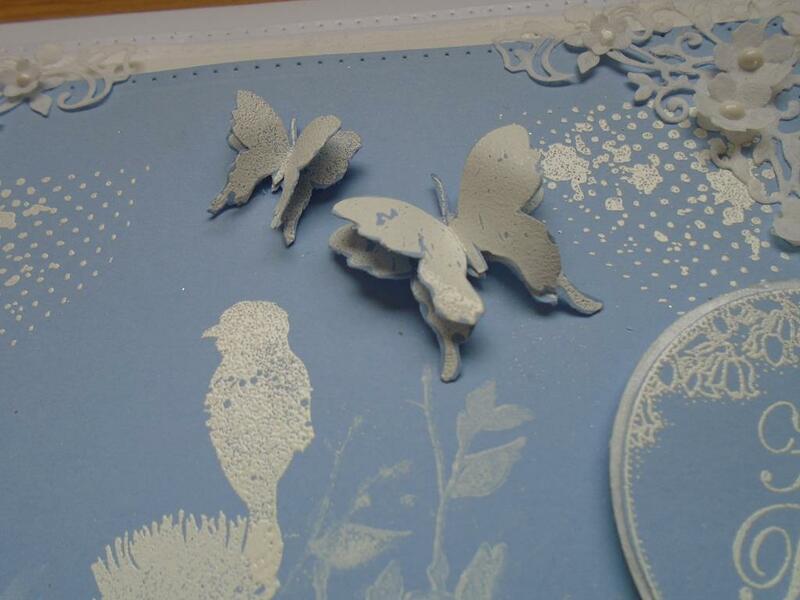 Cut the next size up pierced die again in the pearl icicle card and then the next size up in the kraft card. Step 25. Take the pink no. 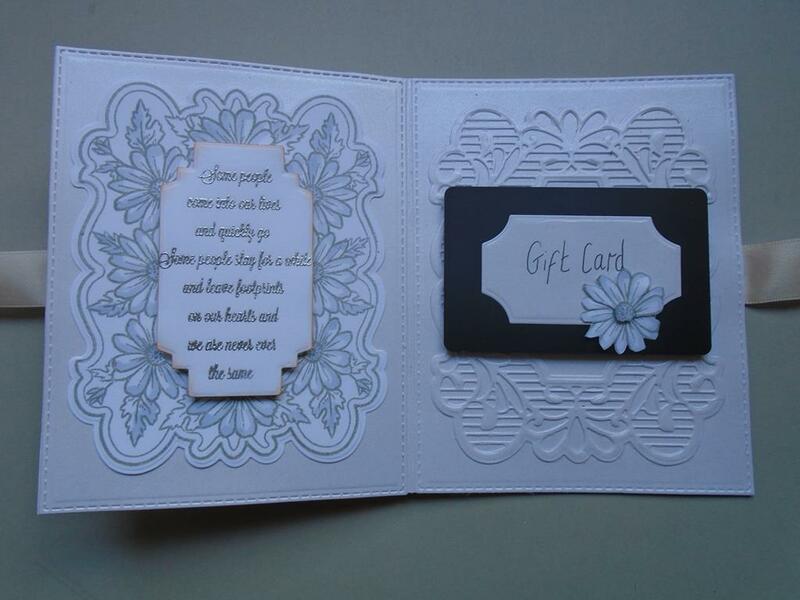 28 Graphmaster pen and use the chisel end to swipe 3 maybe 4 rows deep around the edge of the middle pierced card. No need to do to wide as it won`t be seen under the first panel. Step 26. 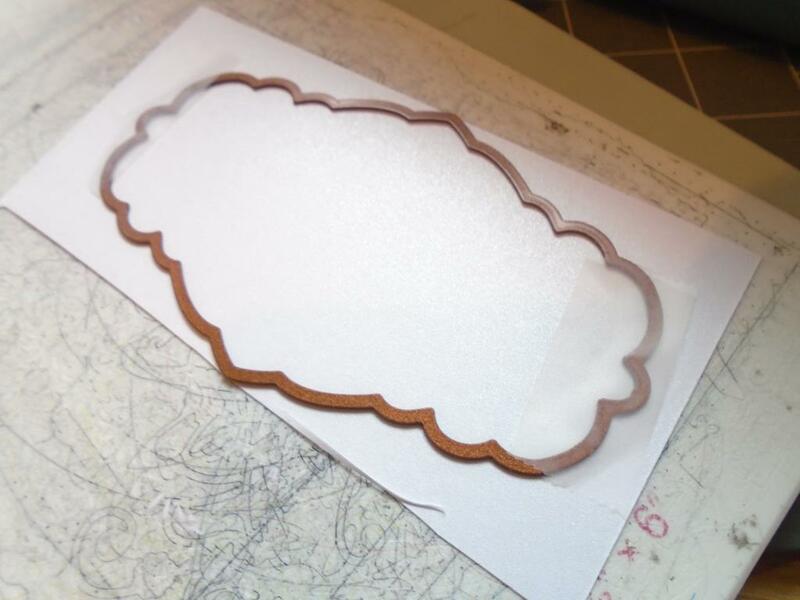 Cut a piece of the Creative Expressions sticky sheet so it fits just on the inside of the pierced border of the smallest panel area. 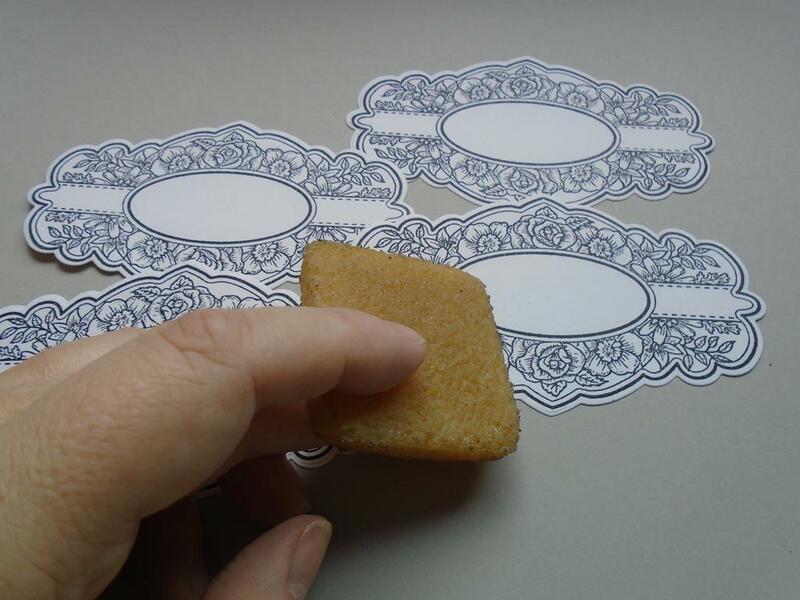 Attach the sticky to a piece of white card and select a pot of the Cosmic Shimmer marshmallow mica flakes. Step 27. 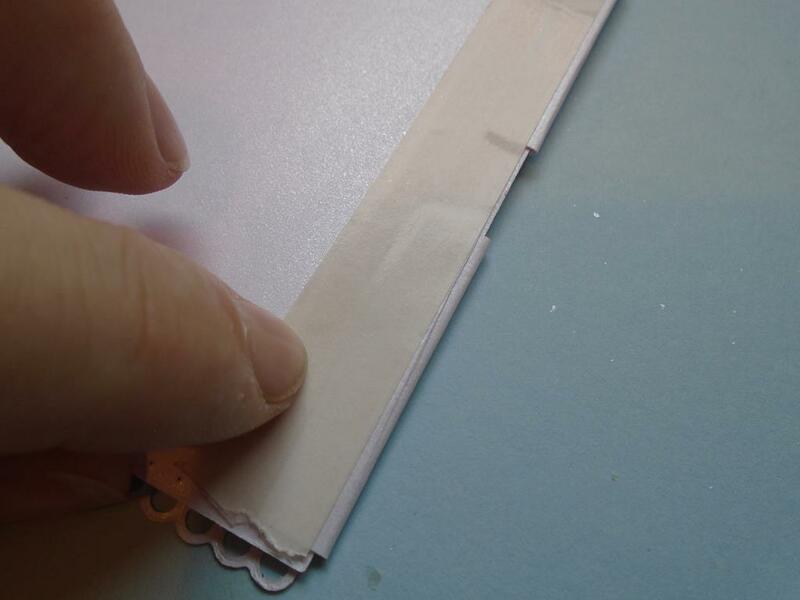 Remove the backing off the sticky sheet and with it placed in a plastic container tip the flakes over the sticky. Step 28. 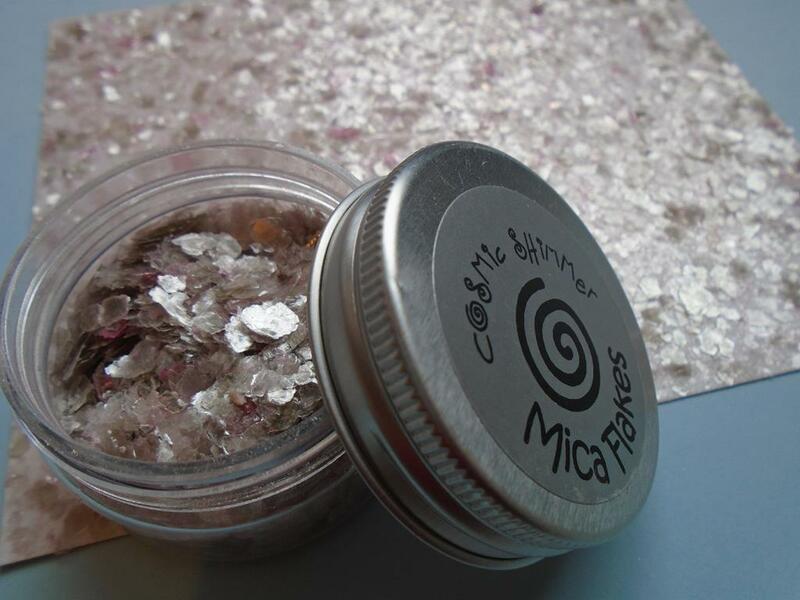 Run your fingers over the mica flakes to burnish them into the sticky and to remove any excess flakes into the container. Step 29. Return all the unused flakes back into the pot for another project. Here you can see that not many have been used yet you have covered the whole panel. Step 30. 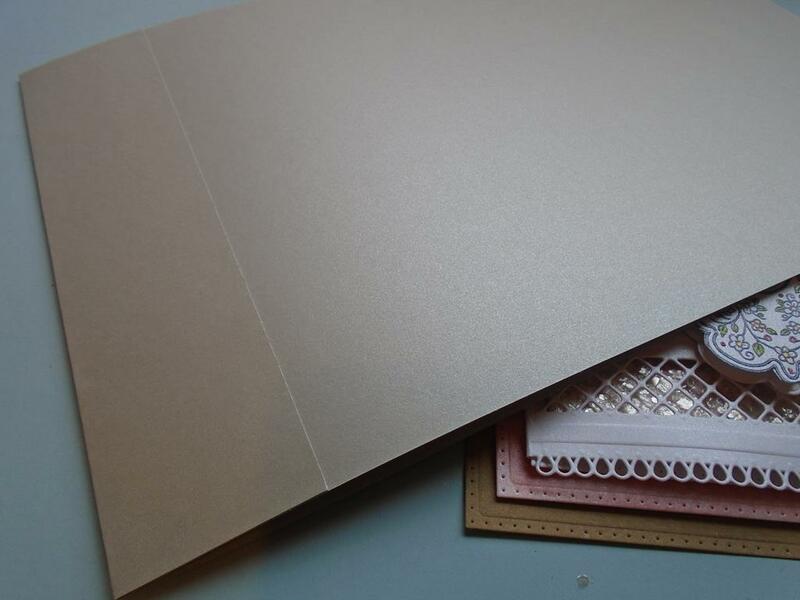 Use some foam tape to add the pink edged panel onto the kraft card panel. 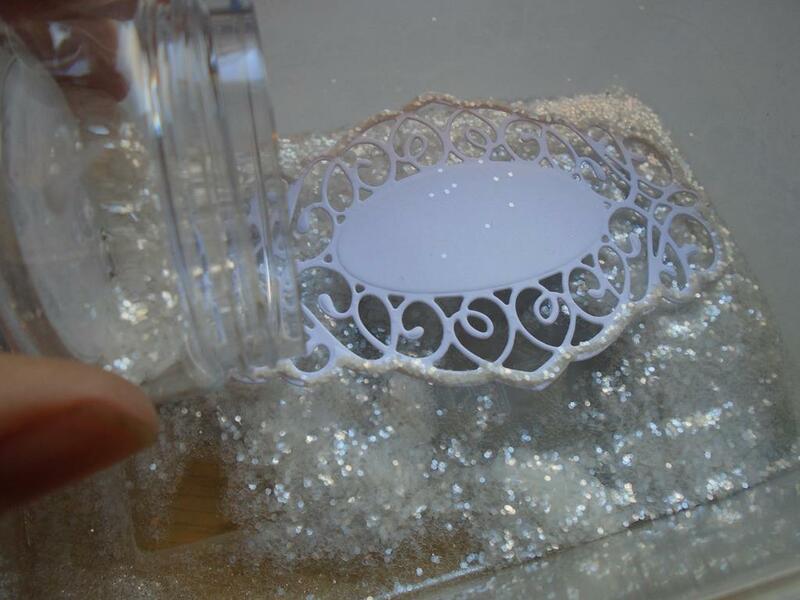 Now add the mica flake panel onto the smaller pierced panel using foam tape for added lift. Step 31. 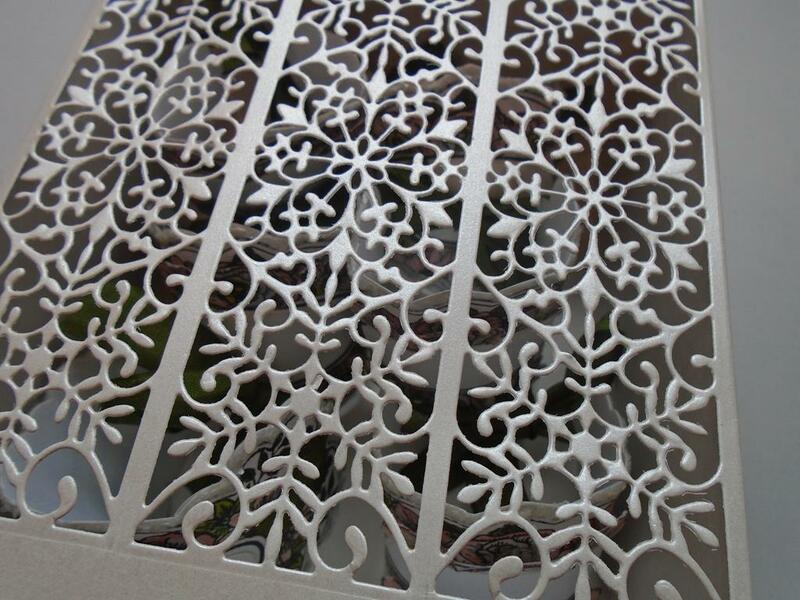 Place each of the trellis panels so they hang over the edge of the mica flake / pierced panel. 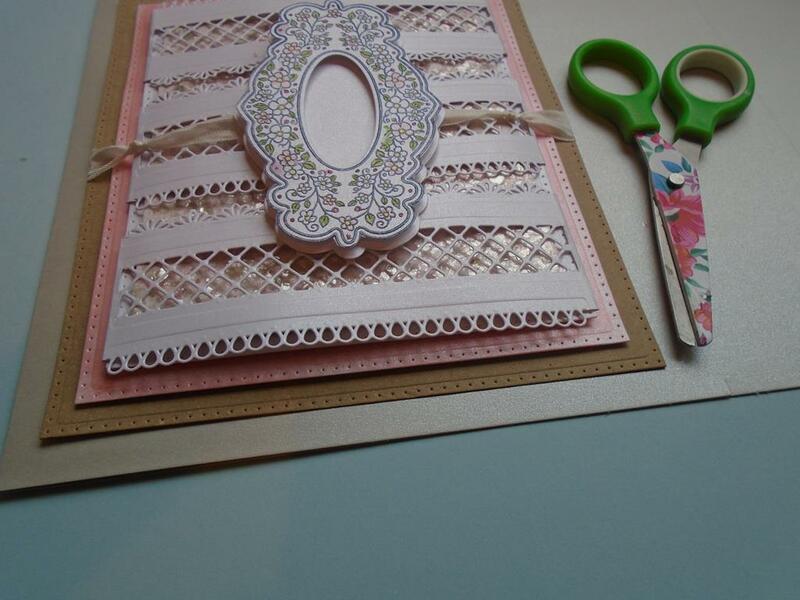 Place the 2nd trellis in the centre of the card and space the other 2 either side. This is just a visual as you will need to take them off again to add the next step. Step 32. 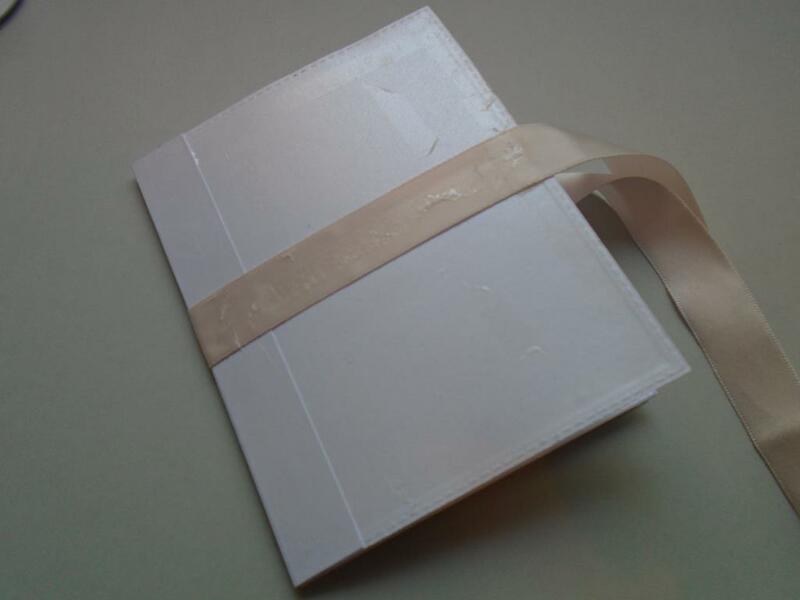 Add a line of double sided tape down each side on the reverse of the card. 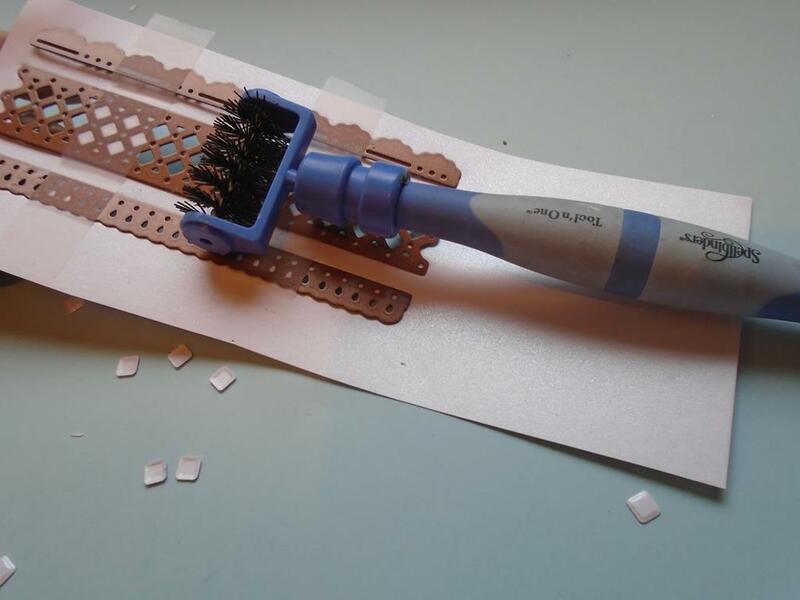 Remove the backing from the tape. Step 33. Press each of the side tabs down on one side only onto the tape. Step 34. 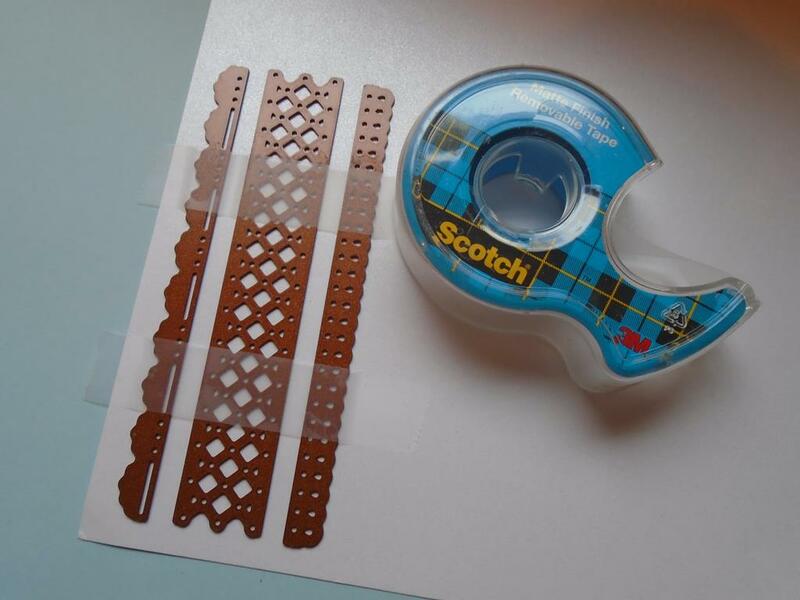 Place another line of double sided tape over the tabs and press firmly down all around them. Step 35. 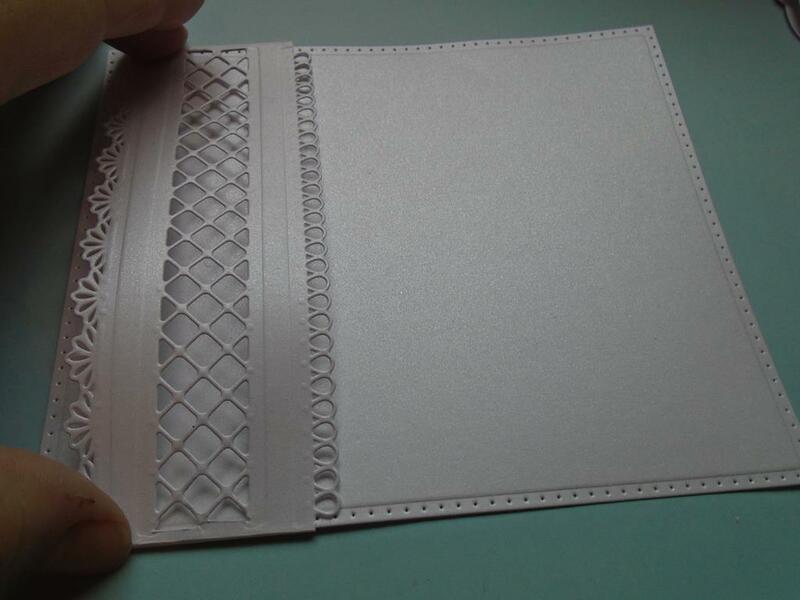 Repeat the process on the other edge but this time the trellis panels will be brought in closer to the card creating a curve effect. Repeat the process securing the tabs down as the other side tabs were attached and then you`ll be left with this loved bevelled effect on the front of the card. Step 36. Knot a length of the vintage ribbon in 3 places and this will allow the ribbon to go in and out either side of the stamped panel later on. Step 37. 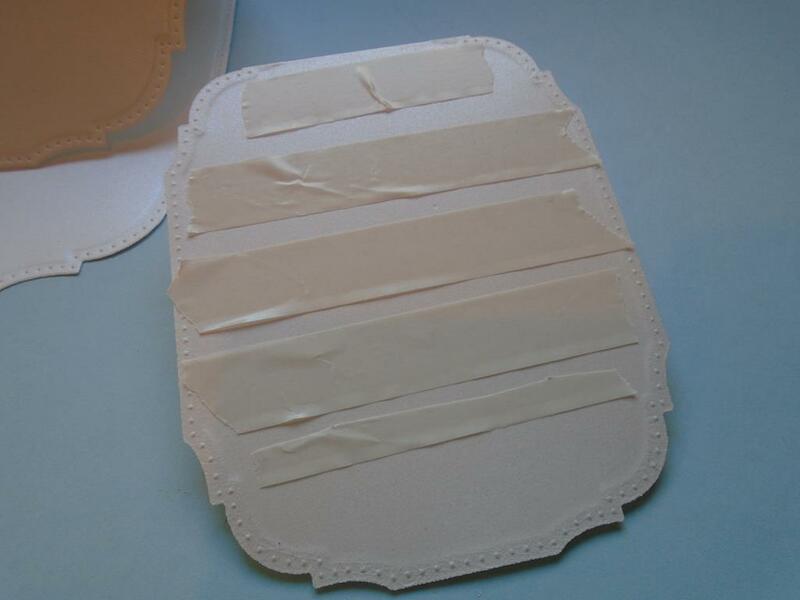 Attach the ribbon around the back of the kraft card. Step 38. Join 2 pieces of the pearl icicle card using a tab effect down one edge and stick a 2nd sheet onto the inside of that tab. Step 39. 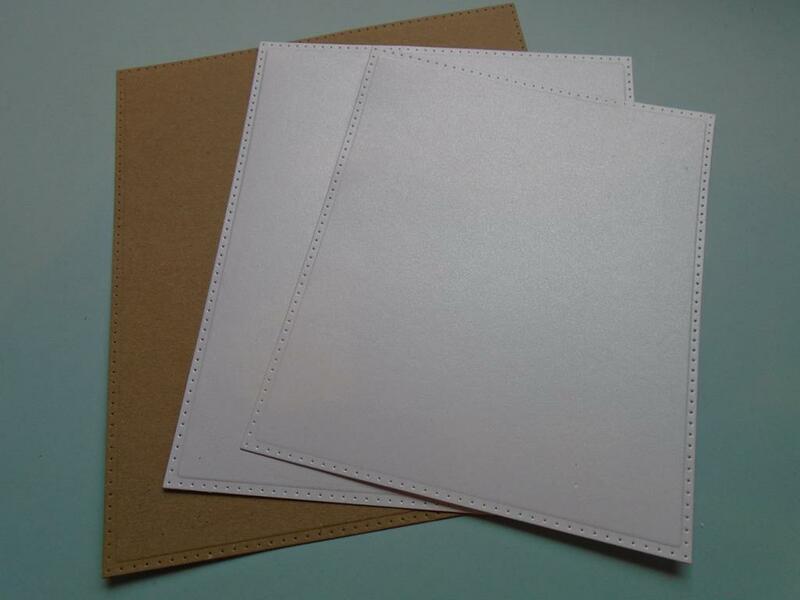 Turn the card over and place the worked panels onto the card and leaving the same border all around the edge of the kraft card. Mark with a pair of scissors where the card needs to be trimmed off to make the base card. Score a line around the outer edge for added detail if you wish. Step 40. Add the kraft card on base card using foam tape for dimension. Step 41. 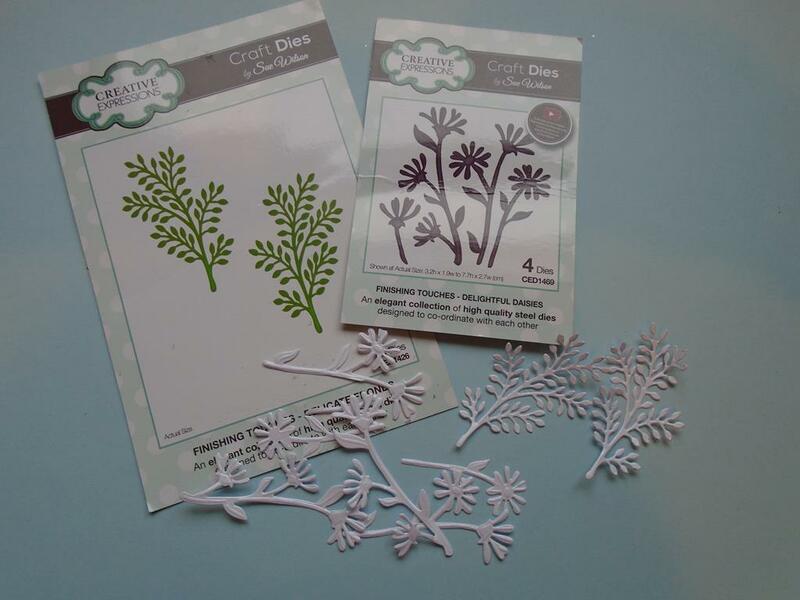 Cut some of the flowers & foliage using the delightful daisies die & the delicate fronds die on some of the icicle card. Step 42. 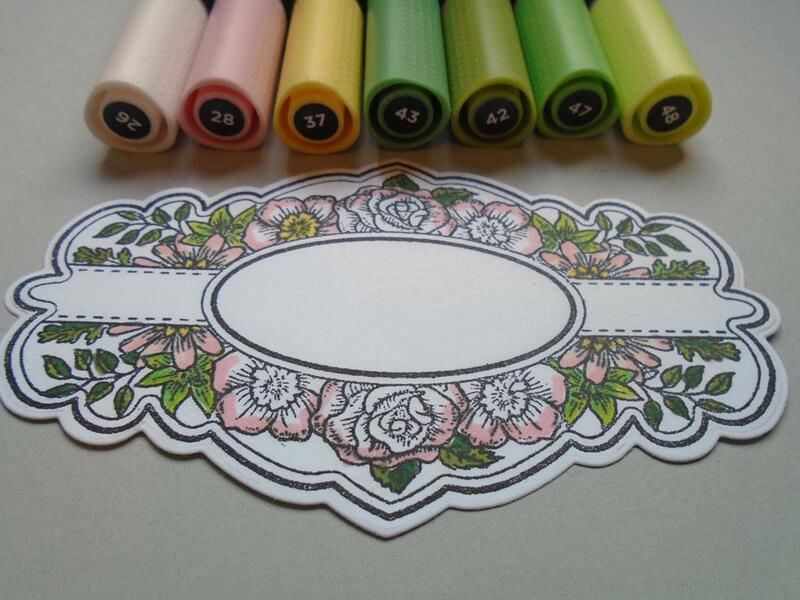 Use the pink, yellow and green Graphmaster pens to colour in the flowers & leaves. Here I made 1 error with a red dot on the frame but this flower will be used to cover it over. I did use the blender pen but red is a harder colour to remove completely from the card. Step 43. Continue to add the flowers down the corner of the frame. Step 44. Wrap 4 loops of the vintage ribbon and here as I didn`t want a bulky knot I’ve tied a thin piece of ribbon around the middle of the folded ribbon. Step 45. 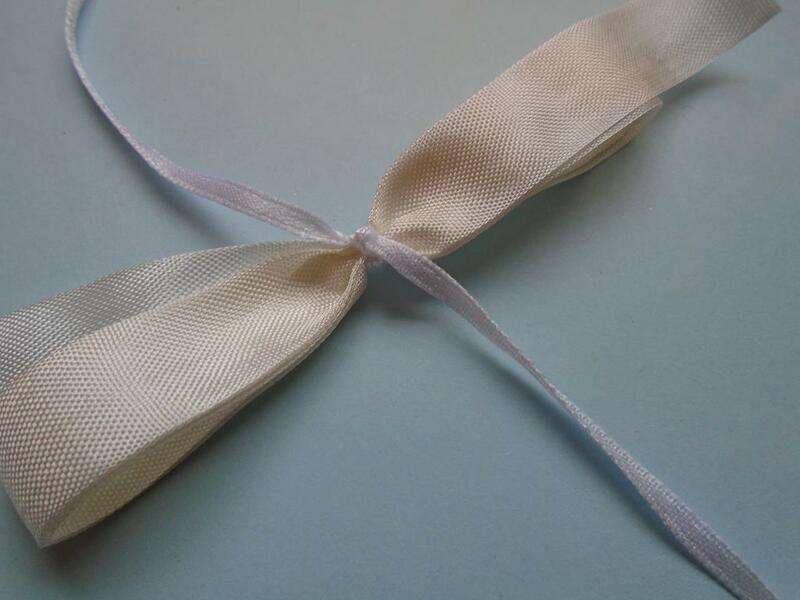 Tie the knot firmly and trim the ends off close to the knot. Step 46. Ruffle and pull the loops of the ribbon out before trimming one of the loops in half at the end so it makes 2 more straight ends to the ribbon. Step 47. Add the foliage behind the flowers and the add a few leaves and 3 flower heads to the knot of the bow. Step 48. 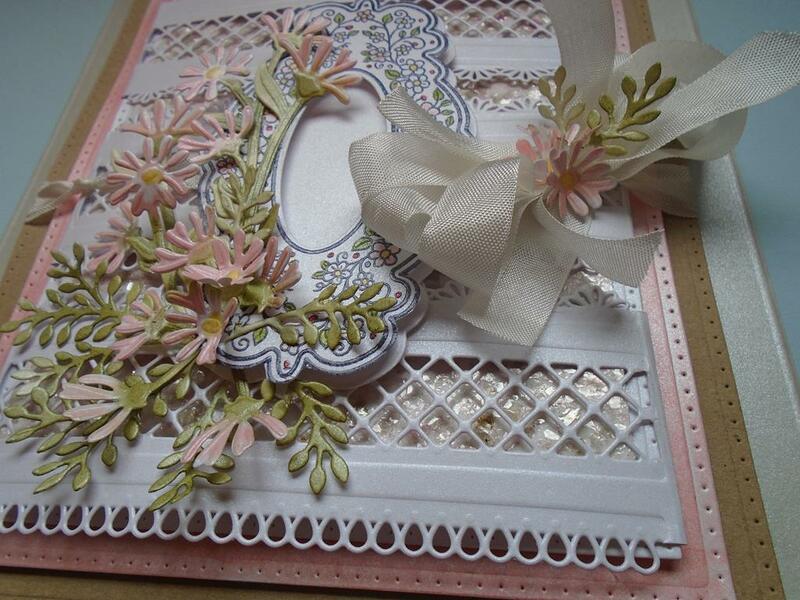 Here you can see the dimension the curved trellis gives to the card along with the pierced panels too. Step 49. So a bit of sparkle from the mica flakes in the background of the trellis and the stamp with co-ordinates with the die shape. Step. 50 The piercing shows through in between the trellis panels. 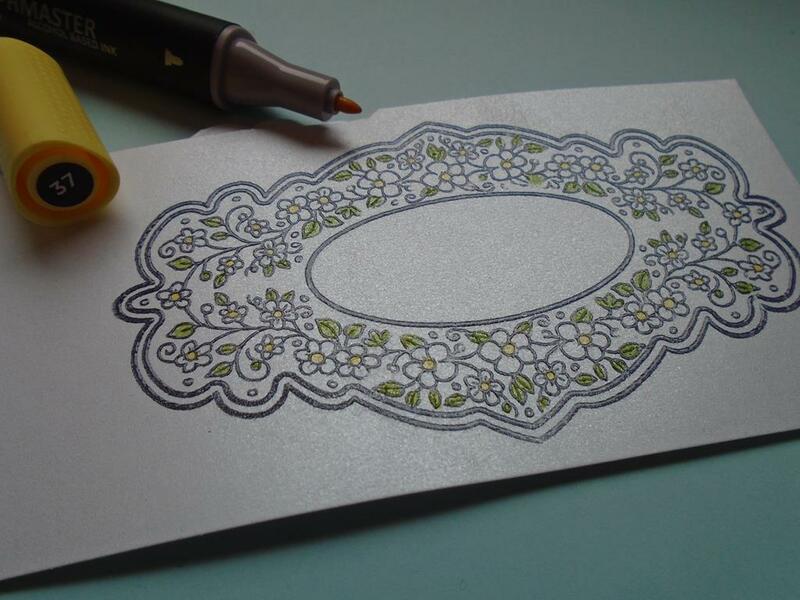 The border colour of the Graphmaster pen mirrors the flowers for a nice finish to the project. 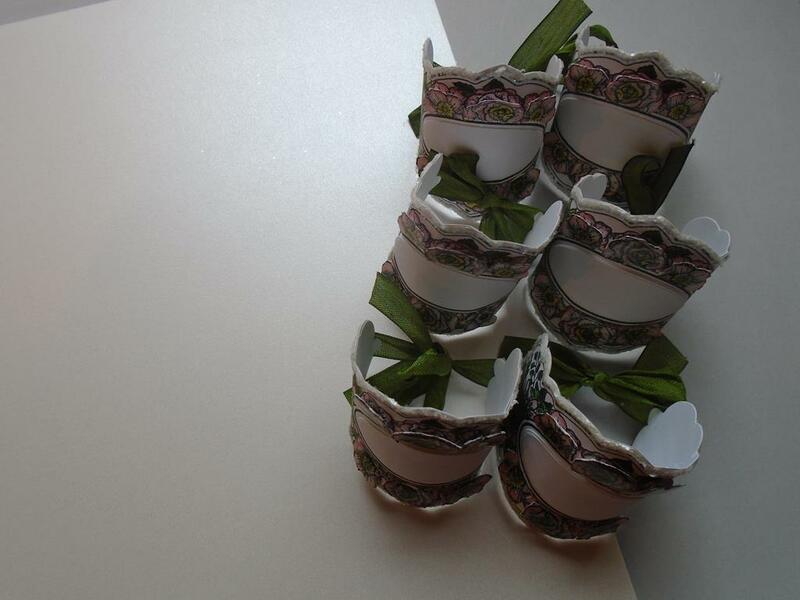 This project shows how to make a intricate lidded box to house 6 of the lovely Christmas rose napkin rings in. 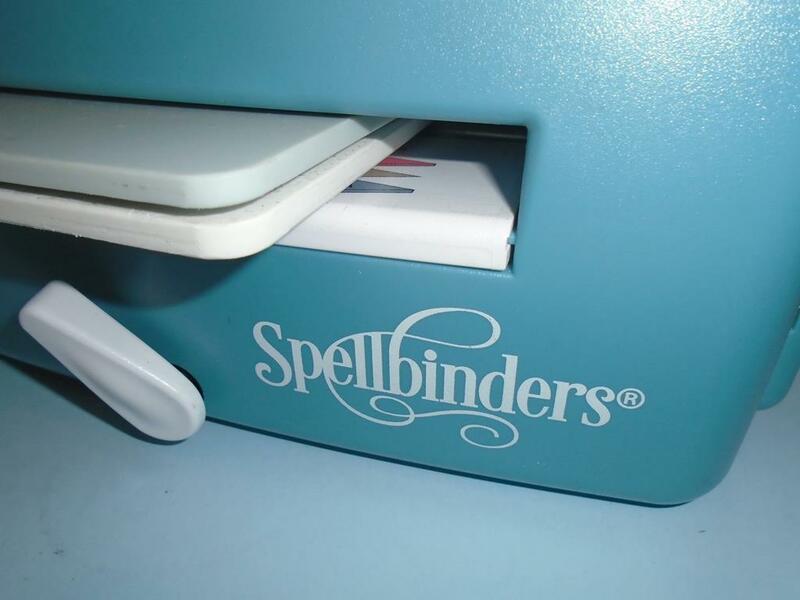 The box is sized especially so it fits 6 napkin rings and also takes 3 of the mini striplet dies on the lid of the project. 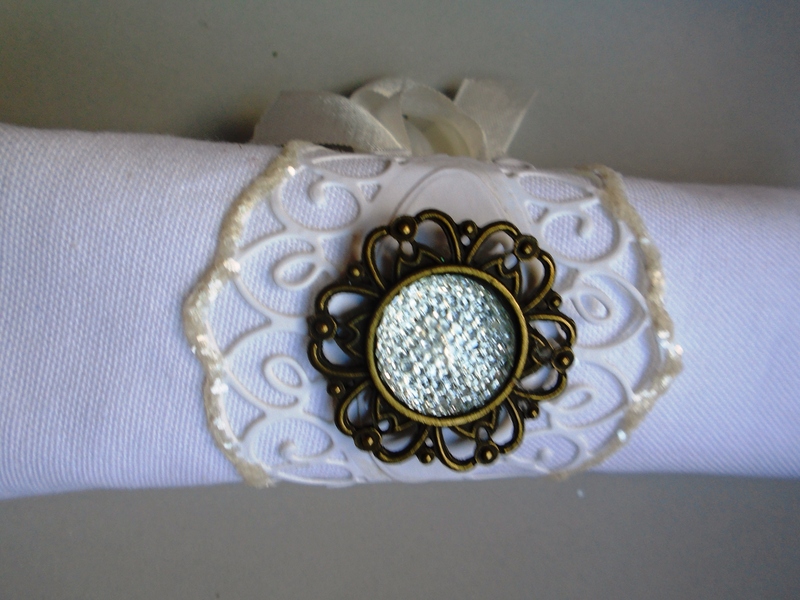 full workshop on how to make these napkin rings. Step 1. 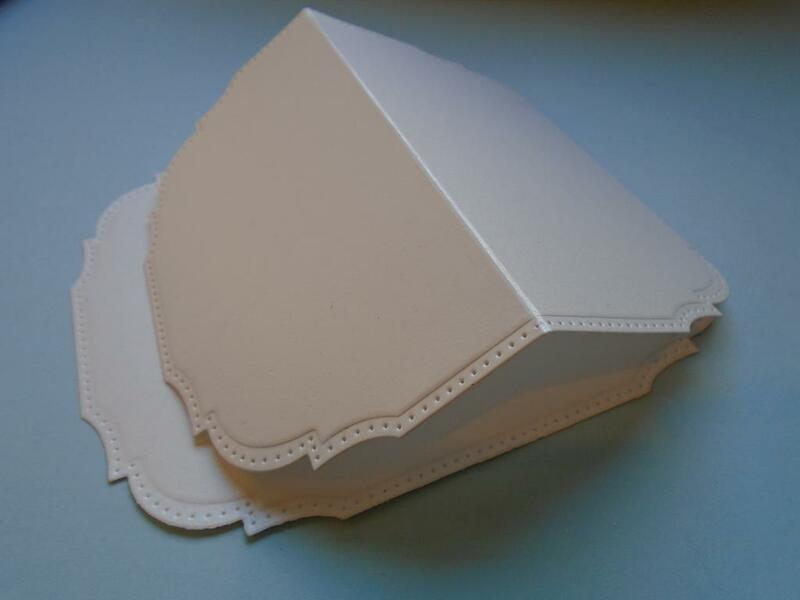 Following on from the previous napkin ring workshop this project will show you how to make a box the perfect size to house 6 napkin rings or it can just be made for a nice deep box. 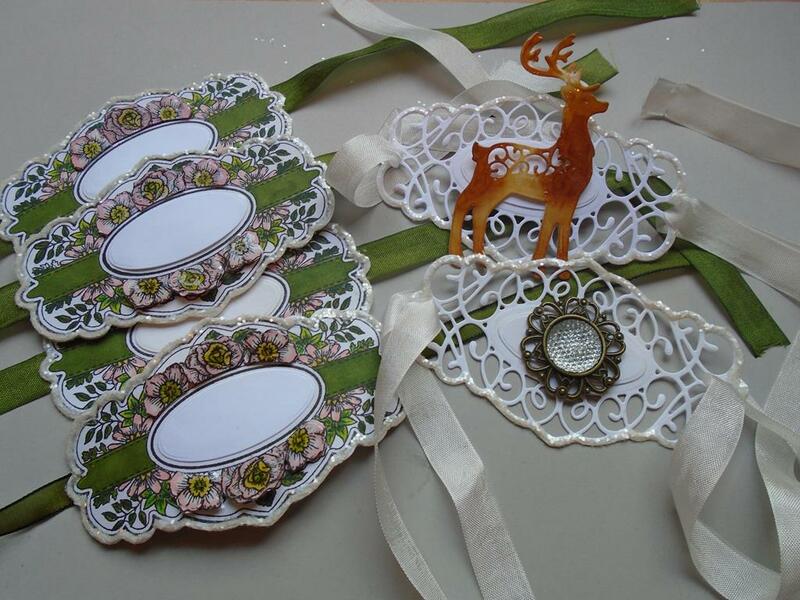 The following main products are…… Sue Wilson festive collection snowflake mini striplet die with the napkin rings made using the frames & tags Molly die set and the Creative Expressions stamps to die for …. Ribbon rose frame. Step 2. Place the A4 piece of Foundations pearl icicle card in a portrait position on a score board and score at 7 ½ cms & 19 ½ cms. Step 3. Turn the card to a landscape position and score at 7 ½ cms in from the left hand side of the card. Step 4. Turn the card 180 degrees and score in 7 ½ cms from the left hand side again. 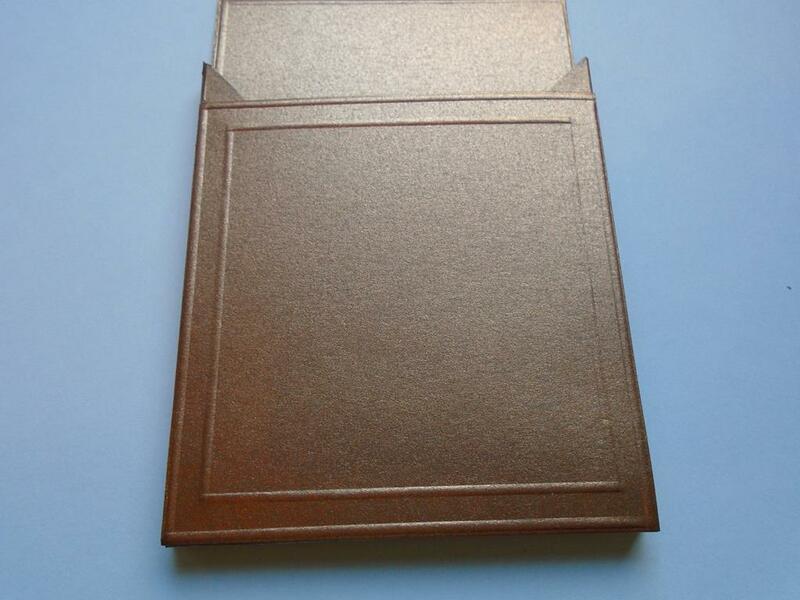 This is important to turn the card as now the middle section of the card is an odd number but all the outer sides of the box measurements will be 7 ½ cms. Step 5. Repeat this on a 2nd sheet of the icicle card. Step 6. 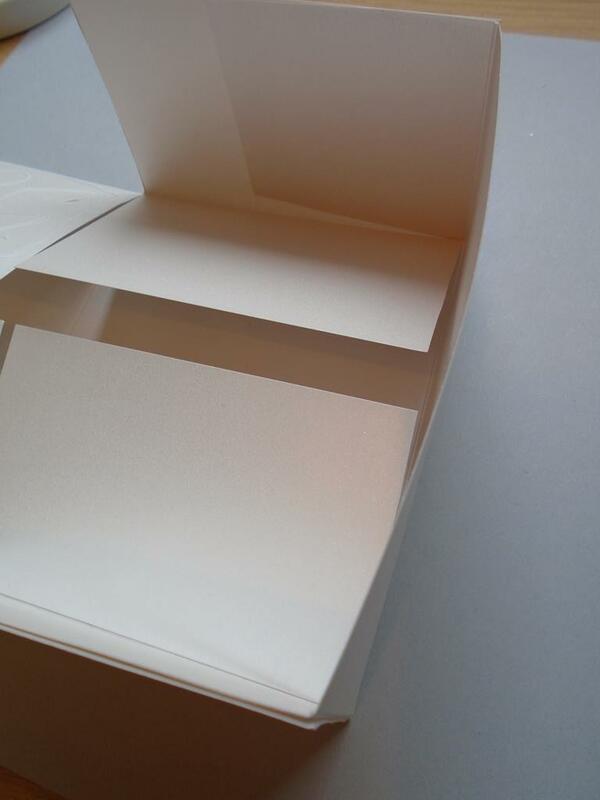 Fold the card over at one of the 7 ½ cm sides to make the card small enough to fit in an A5 guillotine (or leave unfolded and just use a larger guillotine). 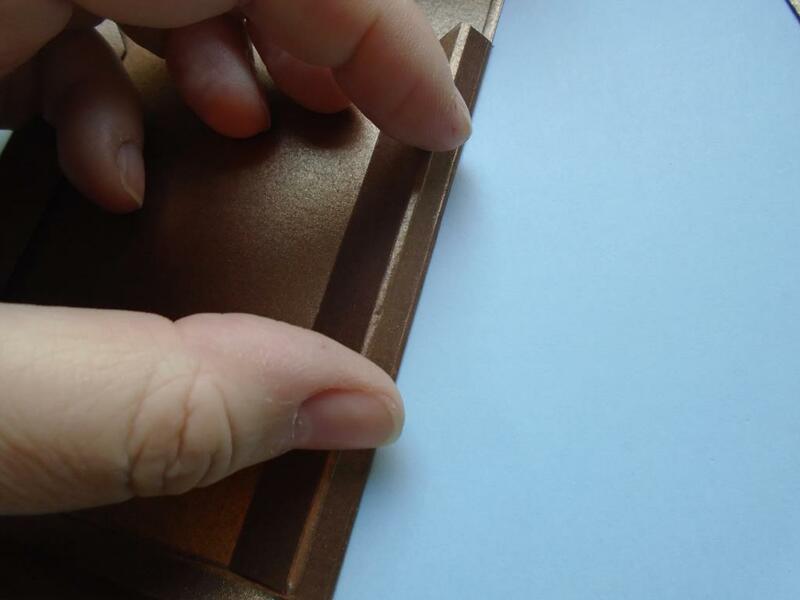 Cut off the 1 ½ cm piece which is left on the right hand side of the card. Do this on both pieces. Step 7. Now crease both scored panels into place ready for them to be joined. Step 8. 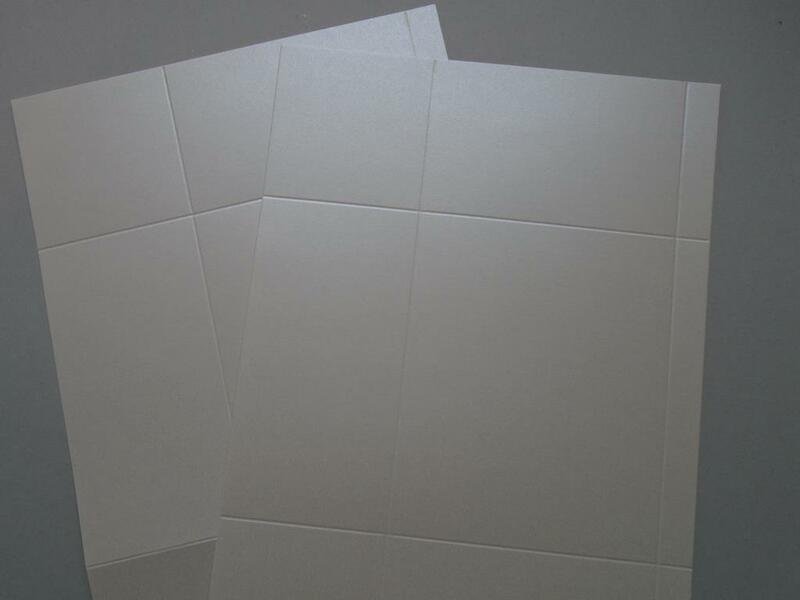 Lay both panels side by side so the 7 ½ cm sides are facing on the outside. Cut up to the 1st score line on the corner scored line and then cut another line on the diagonal up to the same point to create the corner tab which will be used to close the box sides up with. Step 9. Place the 2 main large areas of the box base over each other and look at how the sides will look. 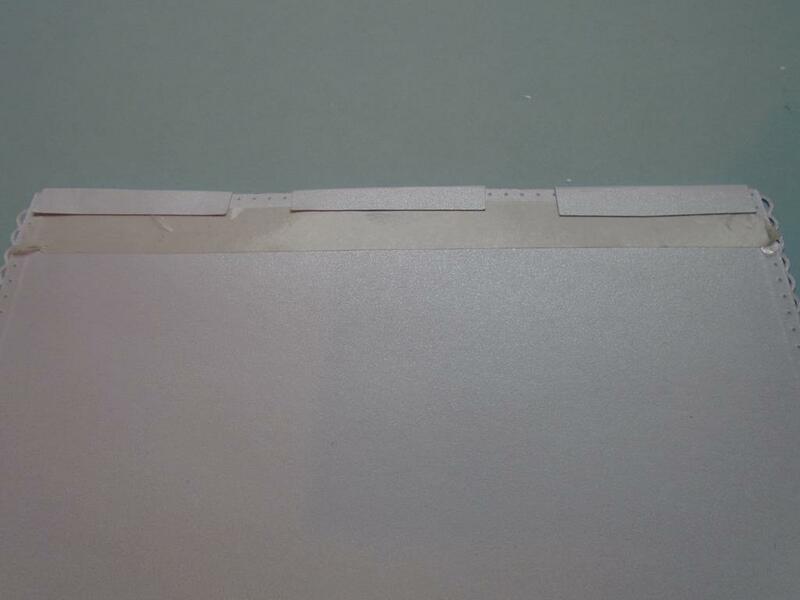 Here you can see a small amount of card needs to be trimmed off the inner flap. 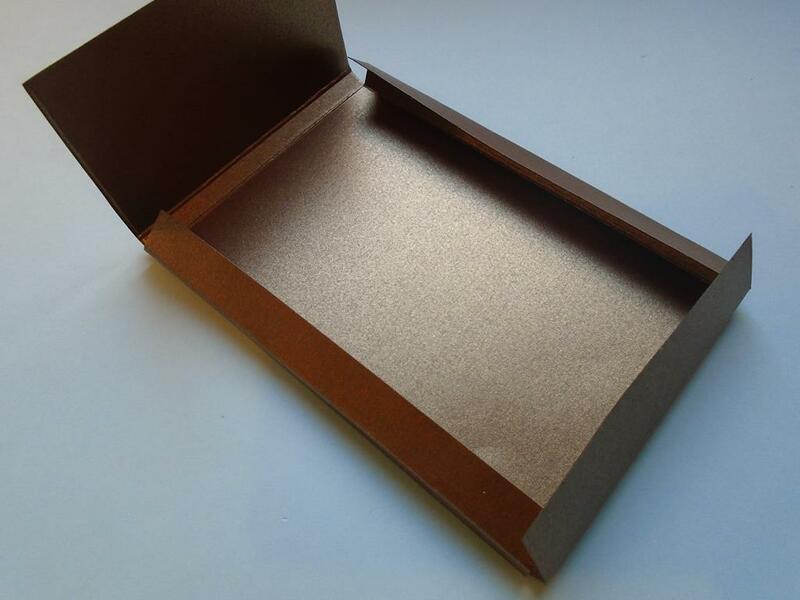 But this box is made this way to make the sides sturdy and to allow the box to be made out of A4 card. Step 10. 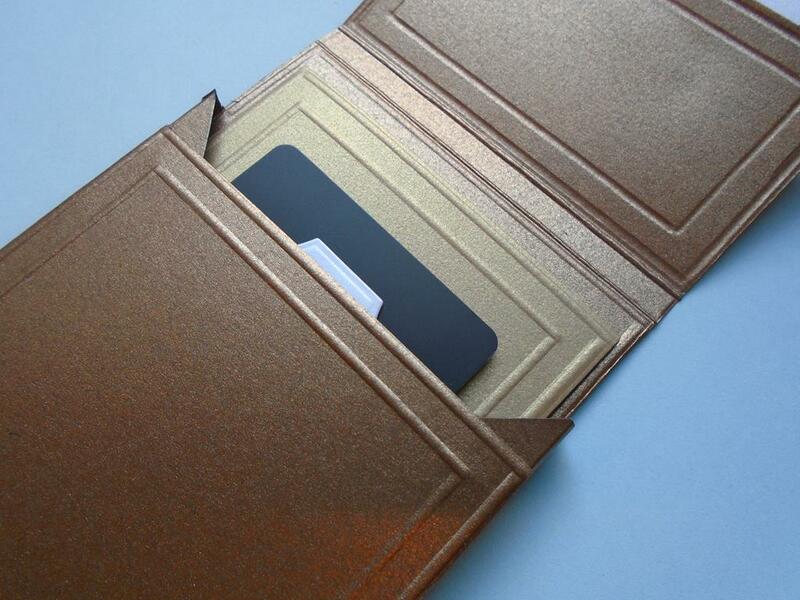 Trim off that excess card to leave a wonderful finish later on. Step 11. 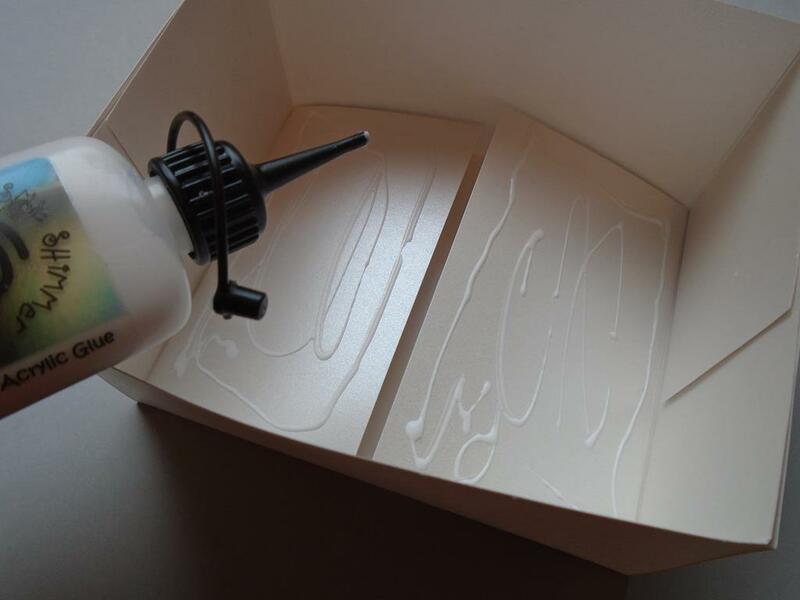 Add a line of double sided sticky tape on the inner base of the box panel you have just trimmed. 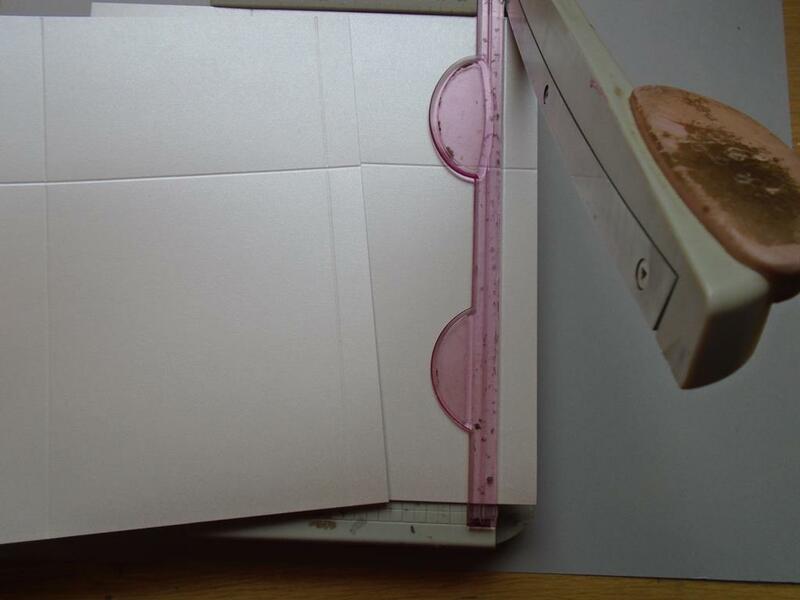 Lift the backing sheet of the tape up and fold it back over the edge of the box as this will act as a tab to be pulled to allow the card to be stick correctly in place. Step 12. 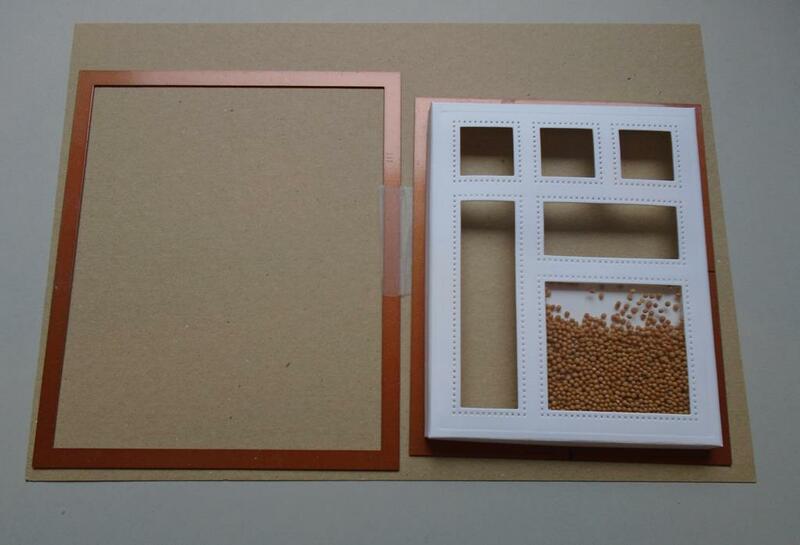 Place the panel over the box panel ( make sure you have the 7 ½ cm sides all around the outside of the box). Leave the tabs showing on the outside. Step 13. Once the card is fully in place and you are happy the side flaps marry up, go ahead and pull the tabs from under the panel. 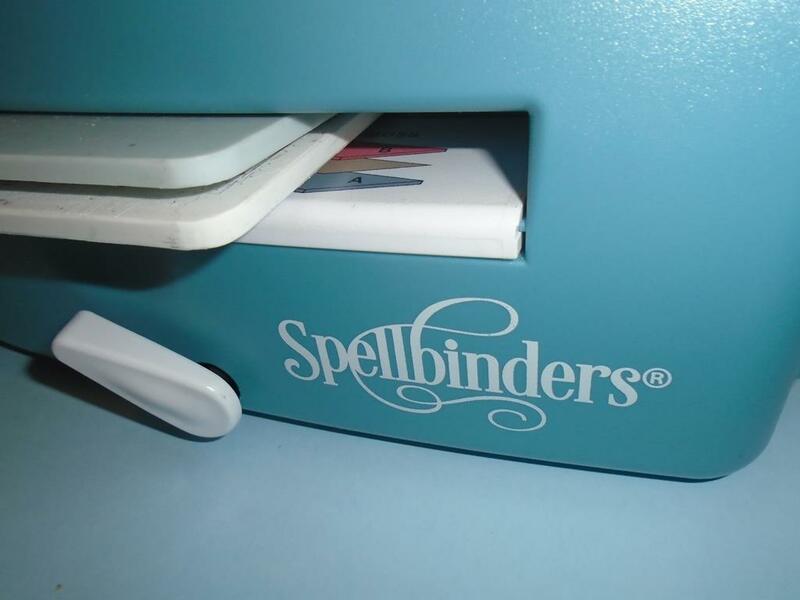 This technique allows the card to be lifted if it`s stuck down in the wrong place. Step 14. Fold all the corner pieces inwards making sure the top and bottom panel has the outer flap still flat as this will be used to cover the tabs in-between the flaps later on. Step 15. Add some Cosmic Shimmer dries clear glue on all 4 folded down corner flaps. You may want to do 2 at a time but I like to do all 4 so it`s up to you how you add the glue. KEEP THE 2 FLAPS THAT ARE IN THE MIDDLE FLAT & DO NOT GLUE THEM OR MOVE THEM OVER THE NEXT STEP. Step 16. Stick one of the flaps onto the inside of the box side (the outer flap that was left flat) Repeat this on all 4 flaps making sure no tabs are stuck to the outside of the box. Step 18. …… and raise them up & stick them to cover the box tabs that were just stuck down. Step 19. 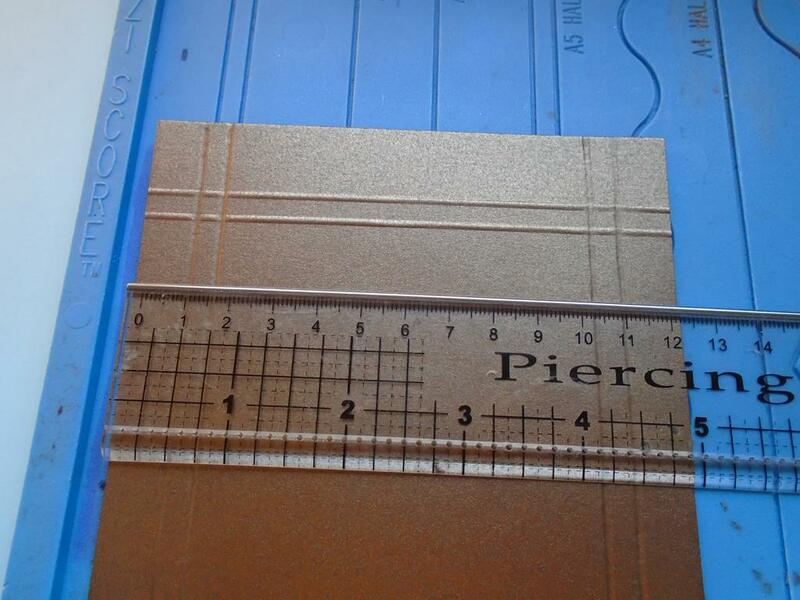 Cut 2 panels for the sides of the box which should measure 145mm x 73mm. Step 20. 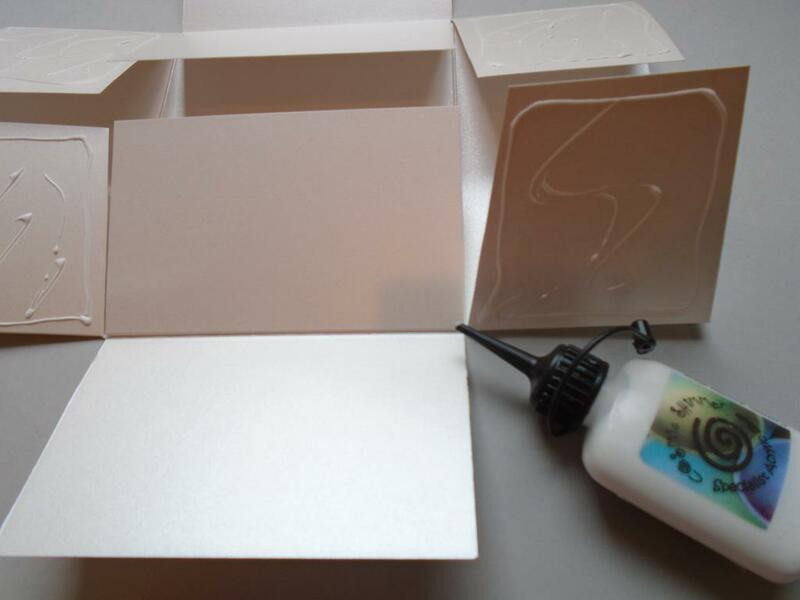 Attach the panels on the inside of the box using the Cosmic Shimmer dries clear glue. This will complete the box base and it`s now ready to make the lid for this project. Step 21. Place the 6 napkin rings in the box. You may want to raise the napkin rings up slightly to allow them to fit perfectly but this will just show them off more. Step 22. Place a piece of the icicle card in a portrait position on the scoreboard and score down at 3cms in and then measure at 147mms and mark that line. Now move the mark across to the nearest scoreline and score down this channel. Step 23. Just double check the box base will fit on this measurement. It just needs to be 2mms larger than the base. Step 24. 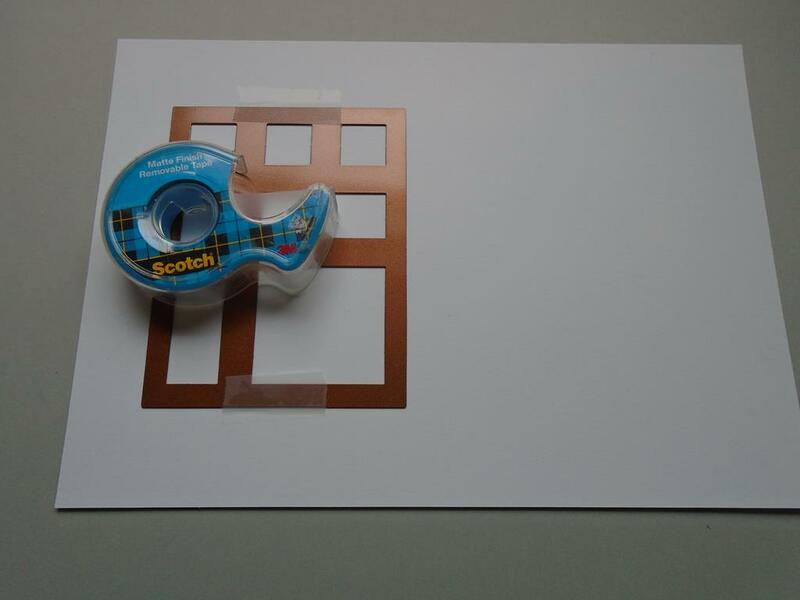 Turn the card into a landscape position and score at 3cms and then measure at 122mms. Again mark that line and the move the mark across to the nearest scoreline and score down this channel. Step 25. Score a 3cm line down the side on the 147mm and the other sheet at the 122mm scored lines as this will complete the 4 outer sides need for the lid. 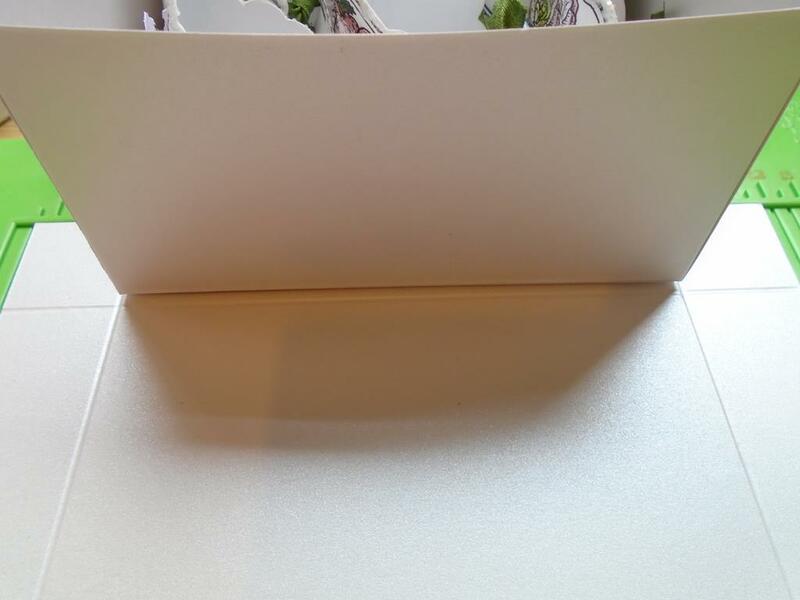 Trim away the excess card the other side of the scored lines to make the box lid shape. Step 26. 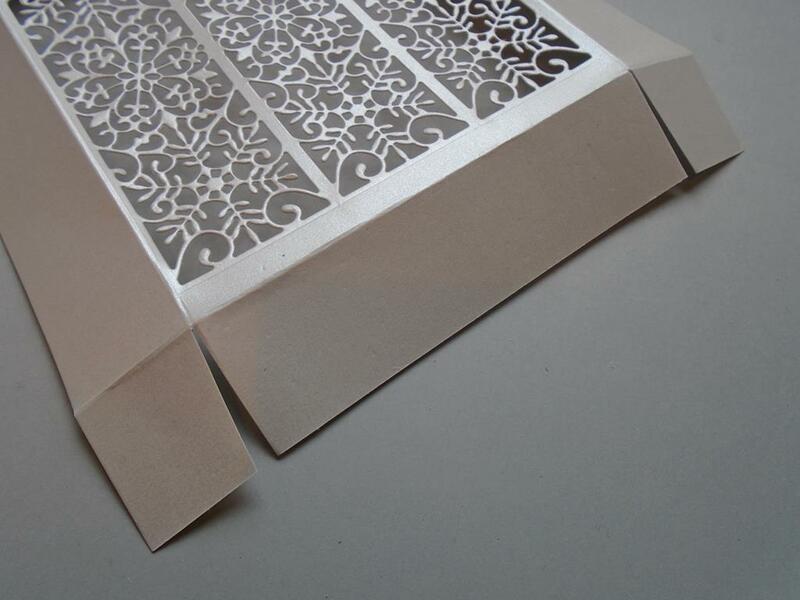 Lay the main inner intricate snowflake striplet die in the centre of the box lid area. Mark with a pencil at the top and bottom of the die and repeat the process on the left hand side of the box. Make sure you keep within the scored line of the edge of the box lid. Step 27. 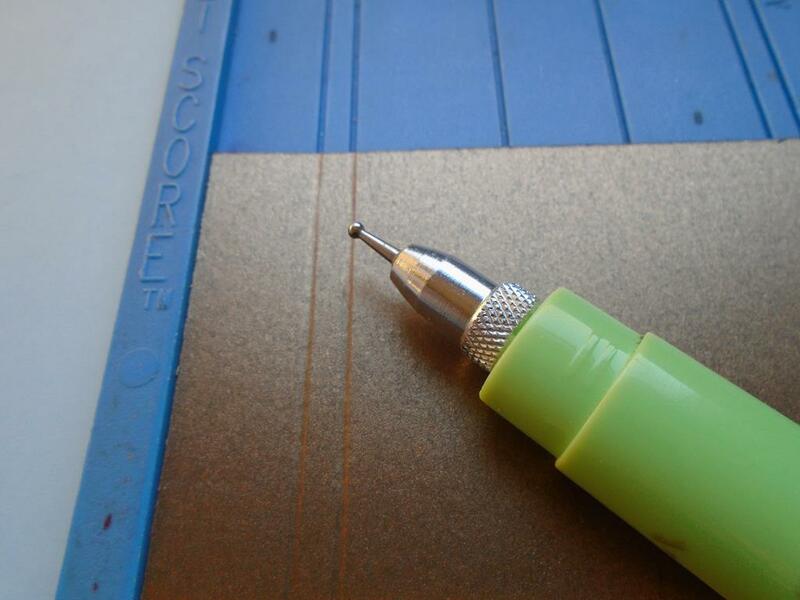 As you have the spacing laid out, place the die in the centre of the pencil lines which are either side. Secure the die in place with some low tack tape. Step 28. Now run the piece through the Grand Calibur machine. Step 29. 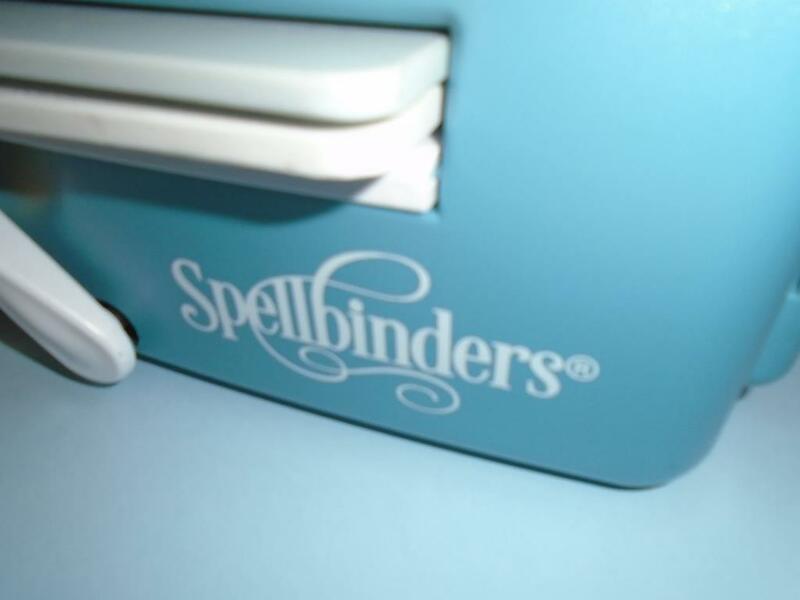 Use the Spellbinders tool in one whilst the card is still in the die so it will remove the tiny pieces easily. Step 30. Repeat the process until you have cut all 3 panel on the box lid. Working from the centre outwards means you`ll get a lovely spaced flow to the piece. Step 31. Go in and crease all of the scored lines in the lid. Step 32. Now cut the corners by cutting up to the 1st score line on the corner and then cut another line on the diagonal up to the same point to create the corner tab which will be used to close the box sides up with. Repeat this on all 4 corners of the box. Step 33. 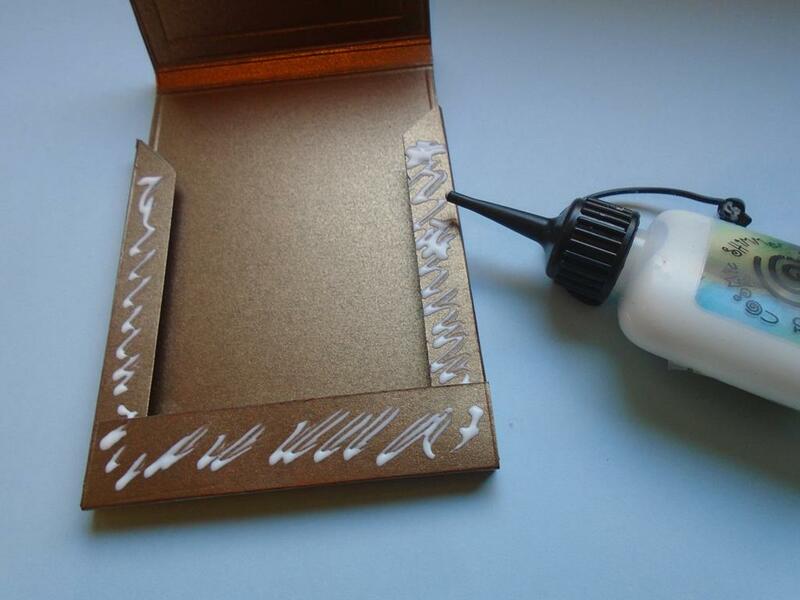 Use some Cosmic Shimmer dries clear glue to stick each tab onto the main inside sides of the box. Step 34. Place all of the napkin rings into the box. Step 35. 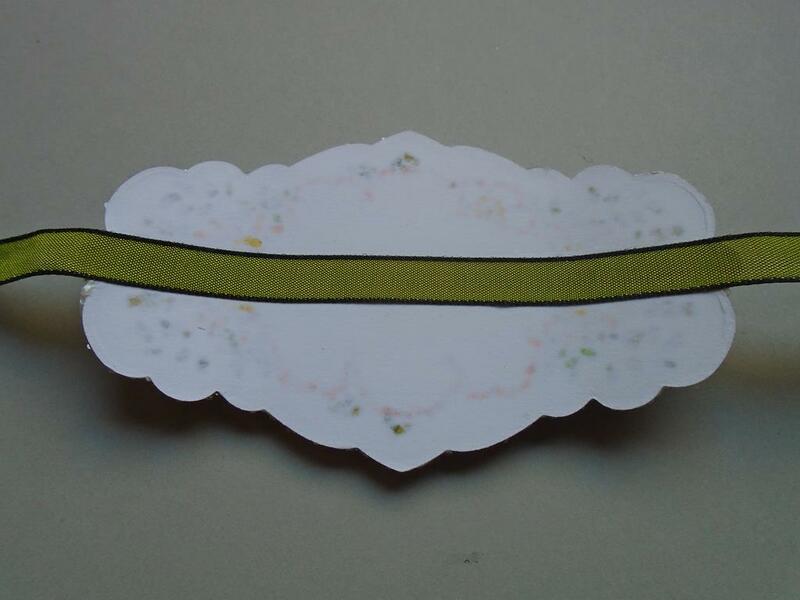 Colour or use a moss green vintage ribbon and place the centre of a long length of ribbon so it passes from top to bottom on the front of the box. Step 36. Pass the ribbon under the box and cross the ribbon over before bringing it back up the sides. Finish the ribbon off in a bow or a knot and then place another worked topper to match the napkin rings but this time keep it flat. 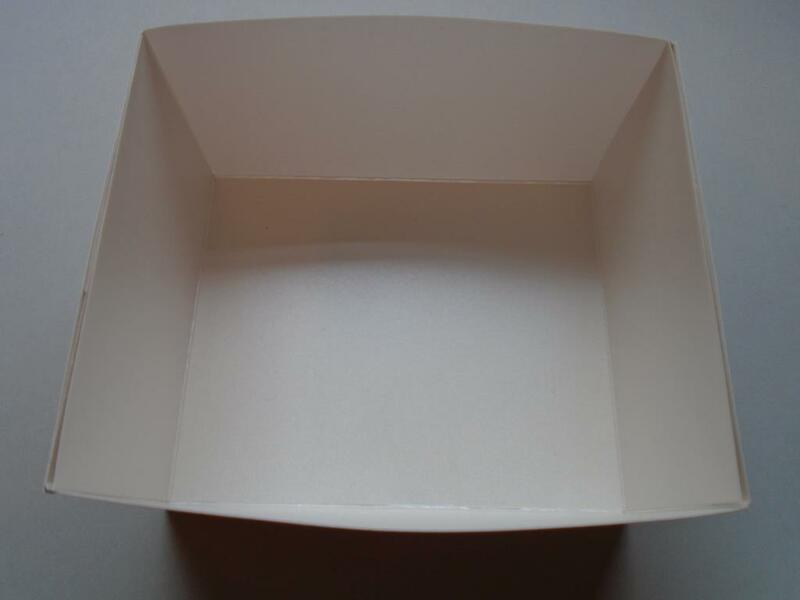 If you add a solid plain die shape in the box with instructions, the tag and ribbon from the box could be made into a napkin ring as and when the family grows !!! Step 37. 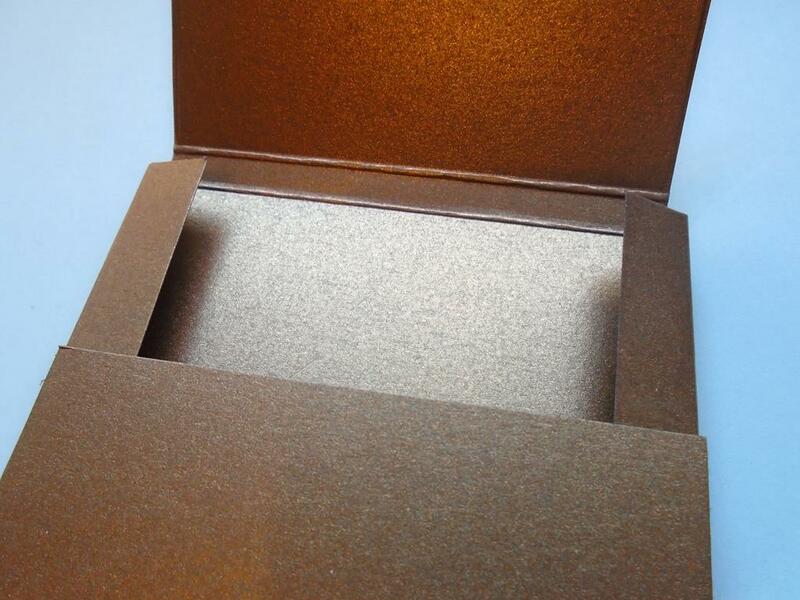 So a delicate box with a very tidy base perfect for the napkin rings or another gift could be added instead. Step 38. Just a slightly different angle to see more of the sides of the box. This project shows how to make some lovely Christmas rose effect flowers using the Stamps to die for …….ribbon rose stamp and the co-ordinating Sue Wilson Molly die. These napkin rings could be used a name place. The oval would make a perfect space for a handwritten or computer written name. 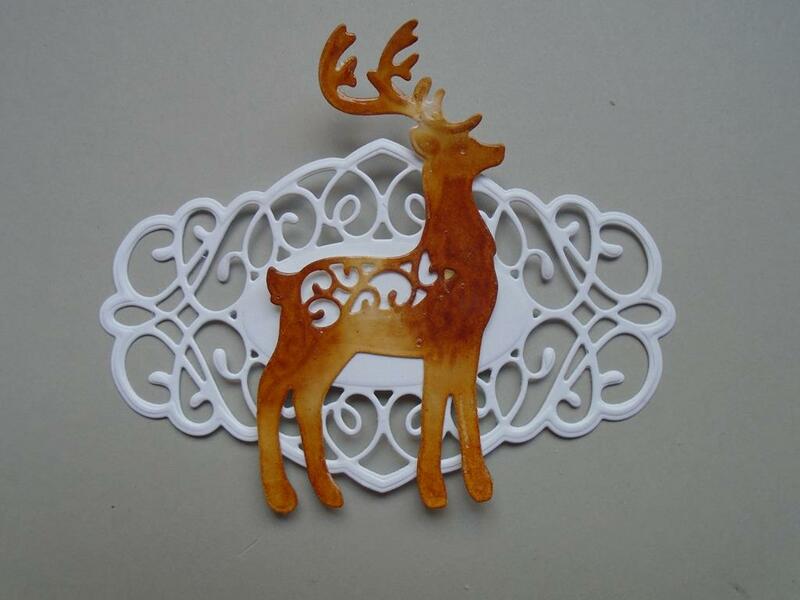 Here is the intricate version of the die adorned with a glossy accent deer for the Sue Wilson deer family die set. 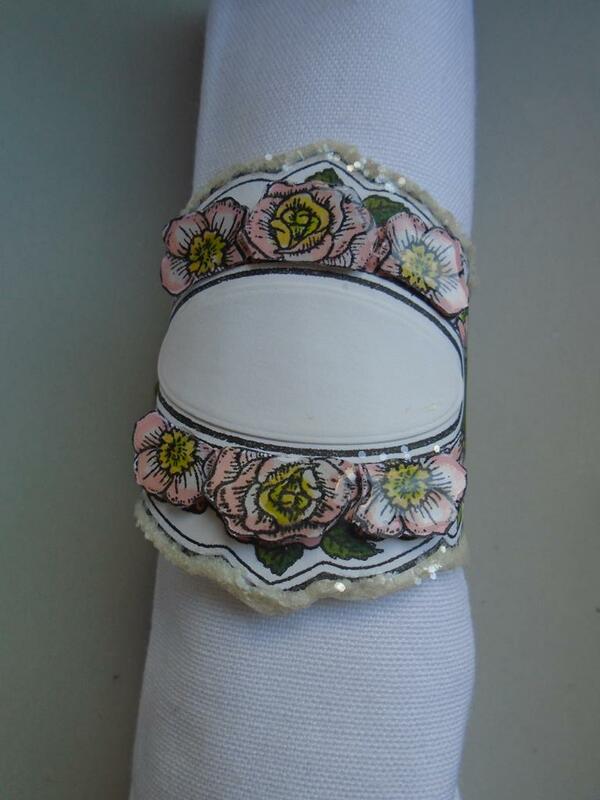 Why not use a Creative Expressions dazzler setting & dazzler to complete the napkin ring. There are lots of different opportunities. Step 1. This workshop will show you how to make these sturdy napkin rings which would be perfect for a Christmas table setting place. 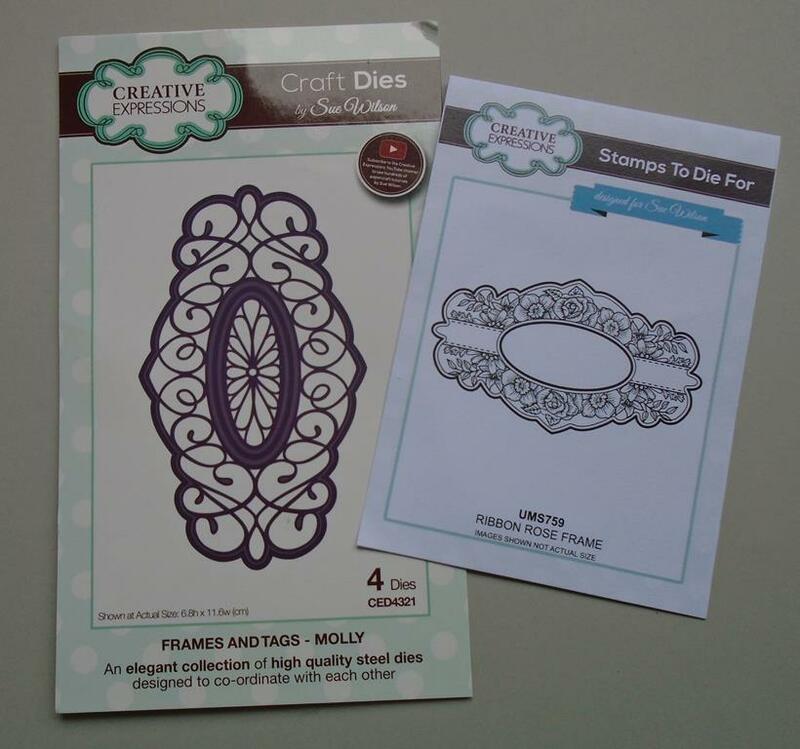 The main products needed are…… the Sue Wilson shadow collection ~ stitched lattice frame die set, the frames & tags Molly die set and the Creative Expressions stamps to die for …. Ribbon rose frame. The pens used are the Graphmaster no. 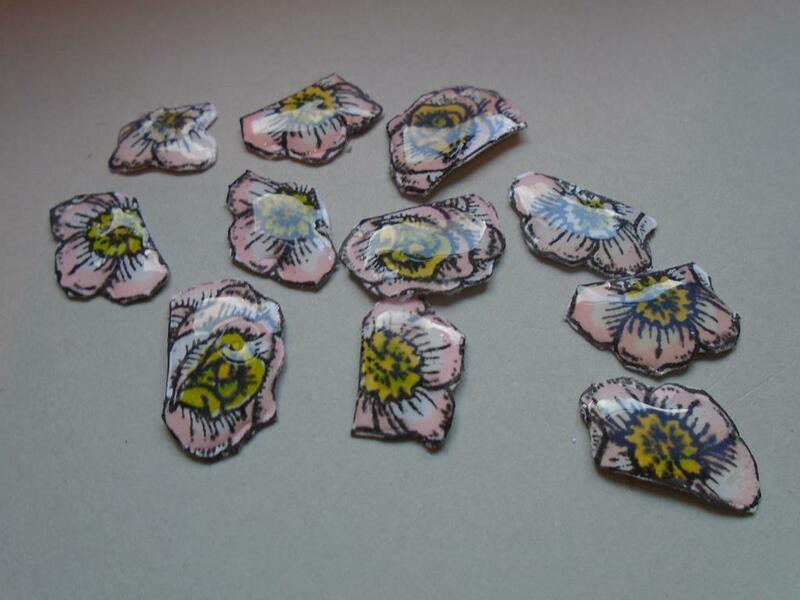 26, 28, 37, 42, 43, 47 & 48 and the glossy accents is used over the top of the flowers for a glazed finish. The Cosmic Shimmer iced snow glitter jewels are added to the edge of the die stamped shapes to create a lovely frosty feeling. Step 2. 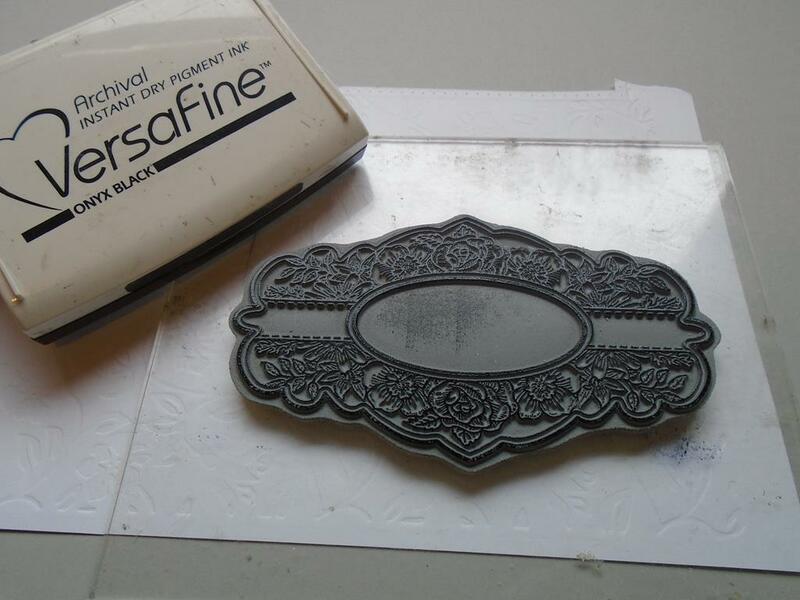 Attach the rose ribbon die onto an acrylic block and ink it up with a black versafine ink pad – a pigment ink which will need to be fully dry before using or a Memento ink works well (this is used as a permanent alcohol ink pen is going to be used over the stamped image). Step 3. Stamp onto a scrap piece paper on the Creative Expressions stamping mat if this is the first use of the stamp & then stamp onto a piece of the Foundations coconut card. Step 4. 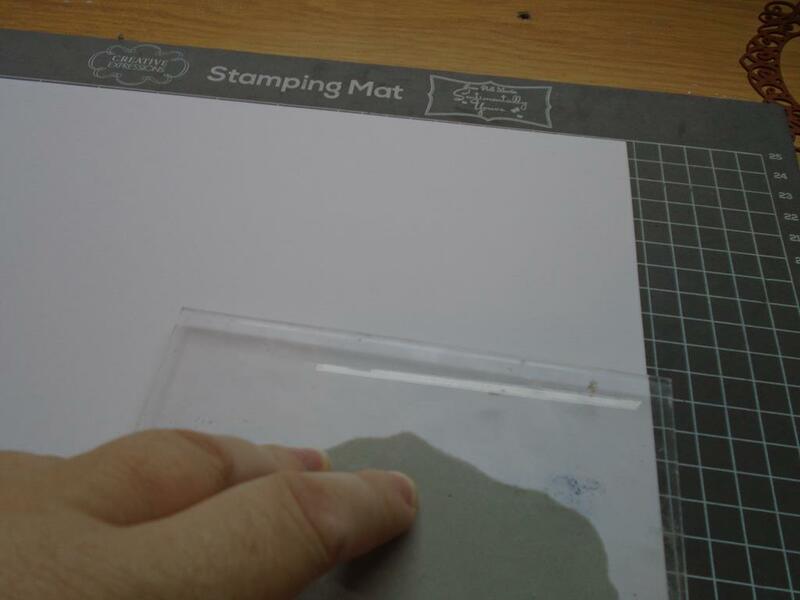 Stamp the image 5 times on the A4 card making sure you leave enough plain card around the edge of the stamped image so they can be cut out using the co-ordinating Molly die. 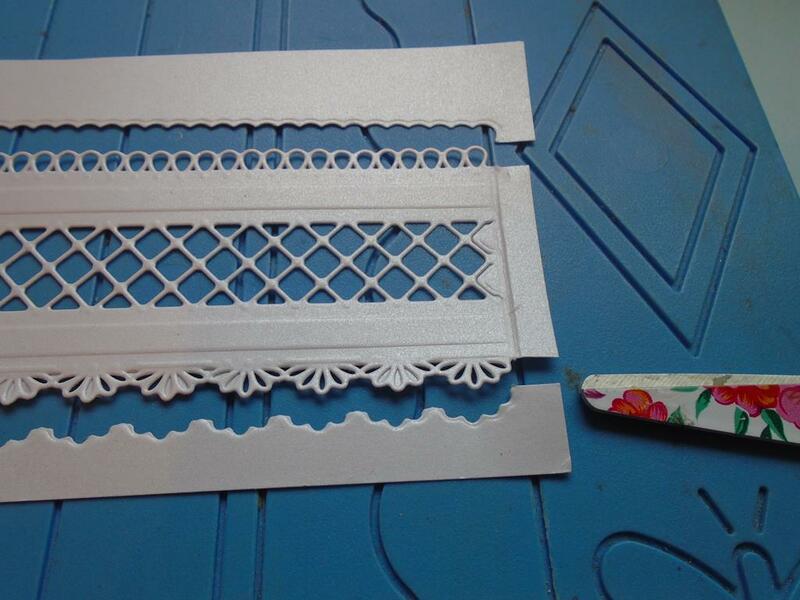 Also stamp the main flowers out and this can be done on an off cut as the ends of the image don`t need to be cut. Step 5. Secure the outer Molly die over the stamped image using low tack tape. Step 6. 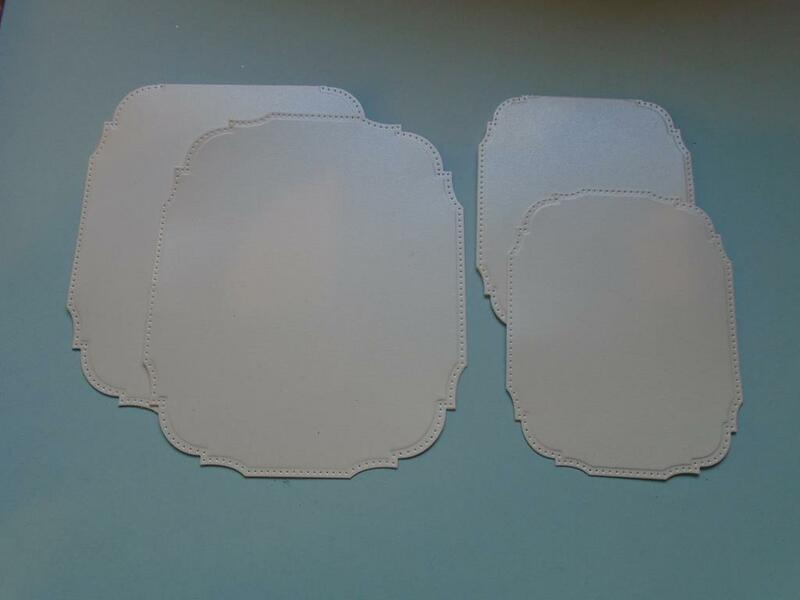 Here the card has been cut near to the die to remove it from the larger sheet and to allow each frame to be cut separately. Step 7. 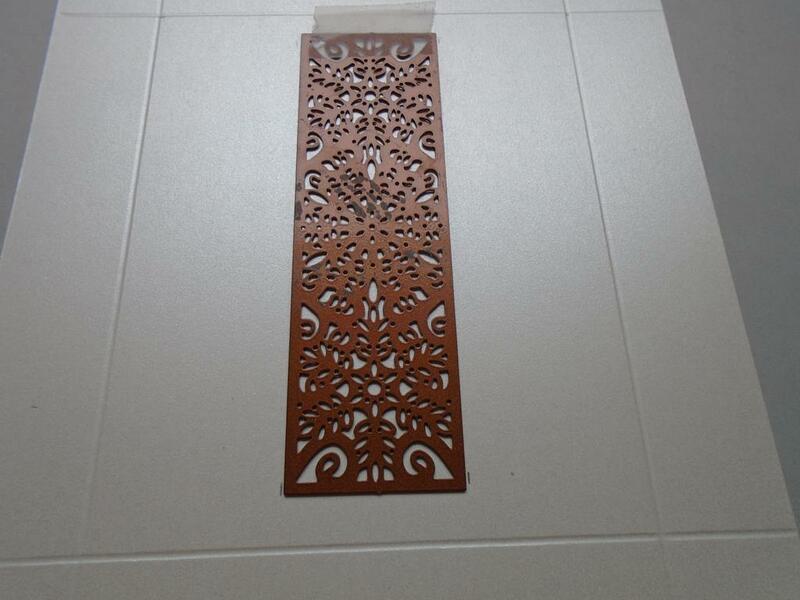 Run the piece through the Grand Calibur die cutting machine. Step 8. 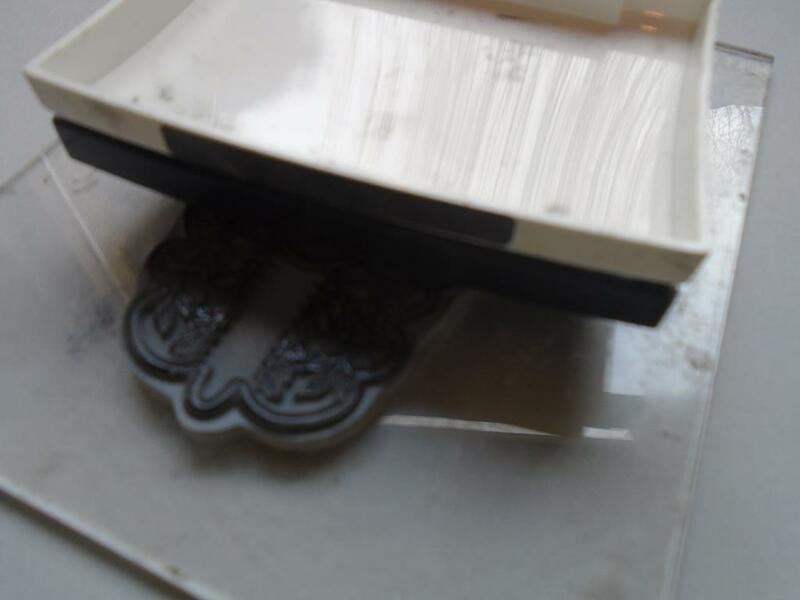 Use the adhesive rubber to remove any sticky left from the low tack tape. Step 9. 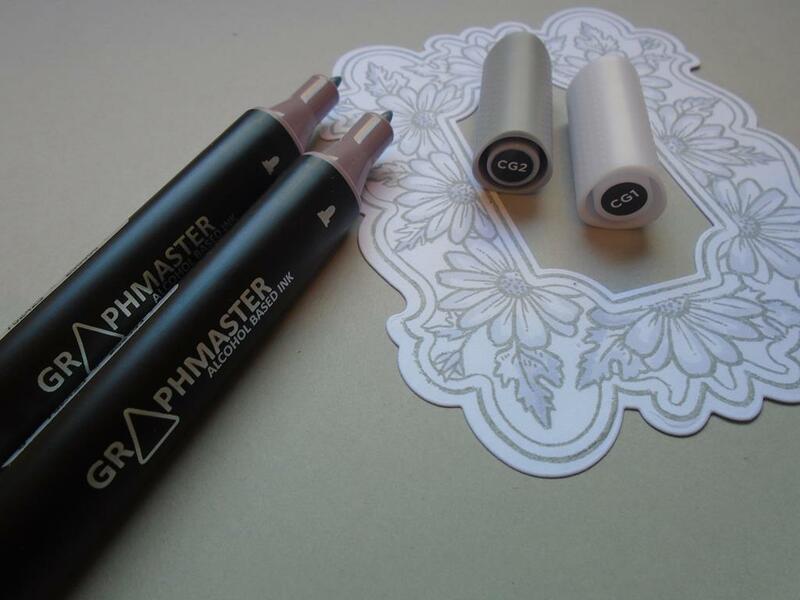 Use a fine line Graphmaster pigment pen to touch up any slight blemishes if they occur during the stamping. I have to say only 2 minor ones happened in all the stamping. Step 10. 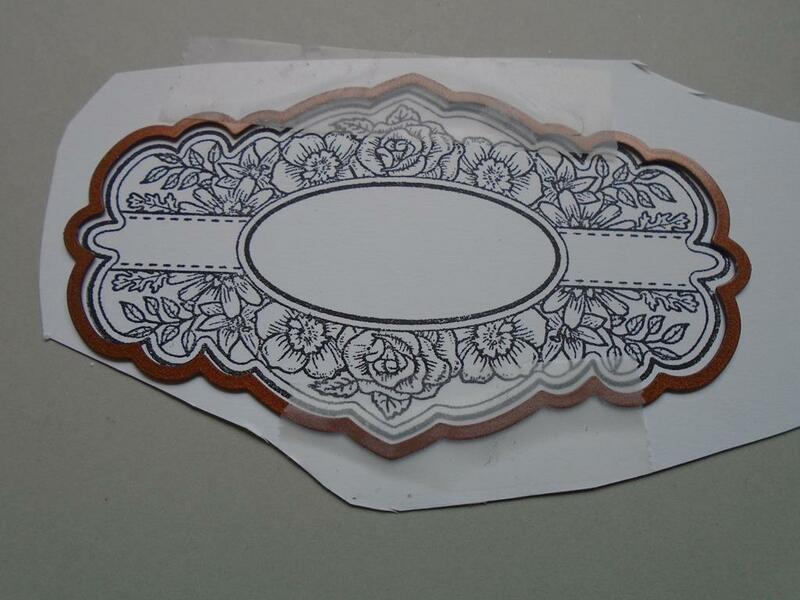 Use the oval die in the Molly set to cut out the inner oval on the spare flower stamped images only, Keep the main stamped cut out shapes whole. Repeat this on all 4 of the pieces or ALTERNATIVELY use a thinner card than the 240gsm coconut card as this card does need to curve later on and it was tested to the full so a lighter card might be better. Step 11. Ink up just the inner flower section of the stamp with the versafine ink pad. Step 12. 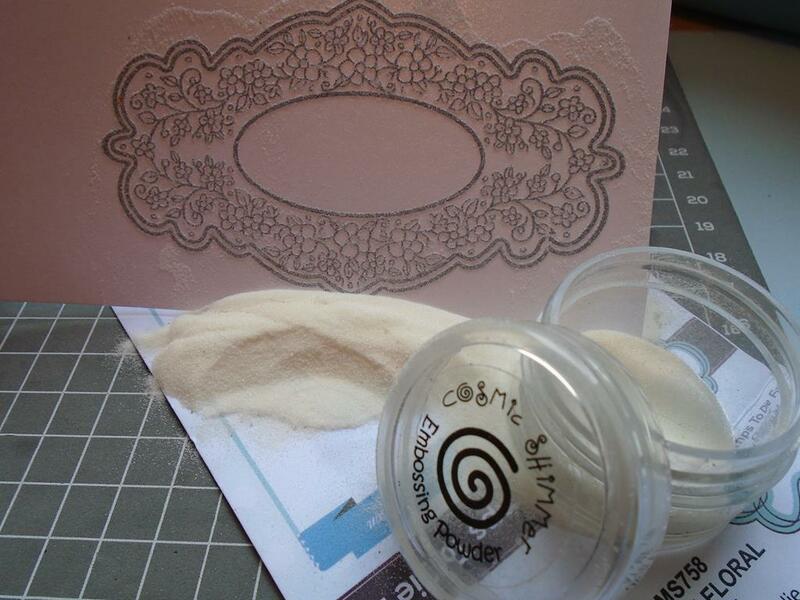 Now press a scrap piece of card onto the just inked area….. Step 13. ……. to reveal the 3 central flowers needed to be decoupaged. Step 14. 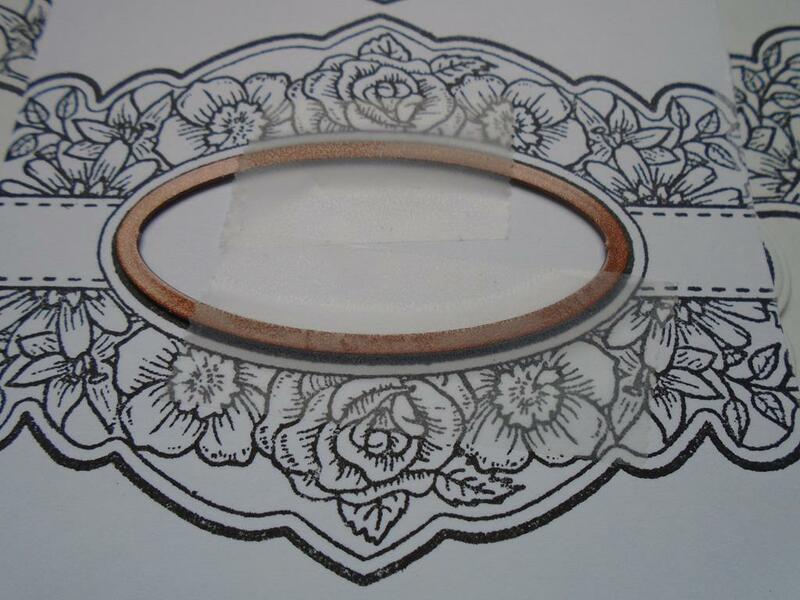 For an alternative napkin ring you can use the 2nd largest intricate die in the Molly set to have a lovely detailed frame and examples / ideas will follow. Step 15. So back to the stamped image. 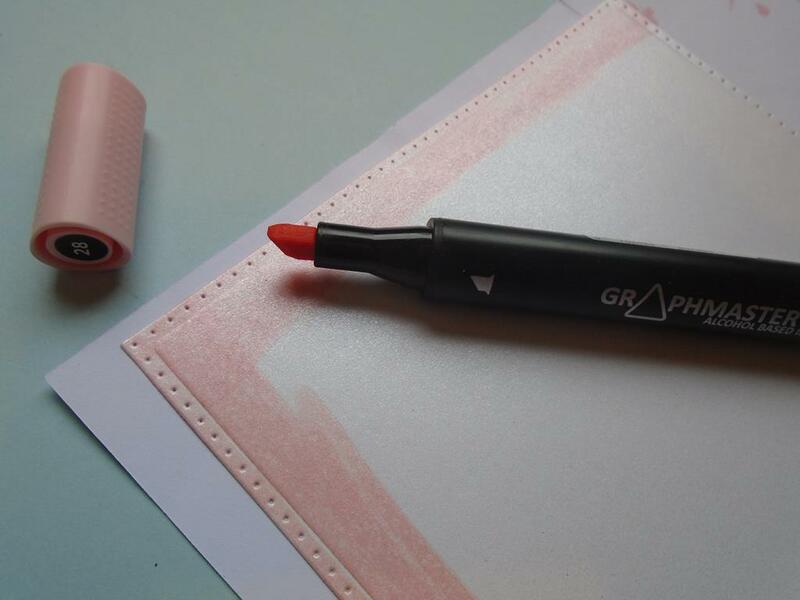 Use a heat tool if you don`t think the inked image is dry before using the Graphmaster pens. 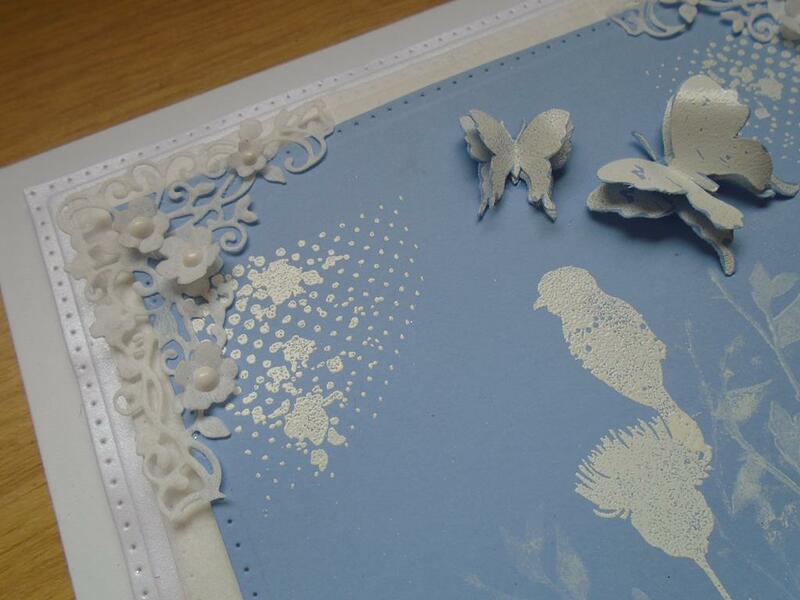 I am working on the base layer which will be covered with the decoupaged glossy accent flowers later so it`s a great way to try out the colours. Place a dot of the yellow pen no.37 & then a circle of the no.48 pen going back round the outer ring of the centre of the flower with the yellow no.37. This will give the feeling of a Christmas rose. Step 16. Now just use the no28. pen on the outer leaves of the rose. Once happy with the colouring move to the extra stamped roses and colour all the flowers in the same way remembering just to colour the outer rose leaves with the pink leaving the rest of the flower clear. Step 17. 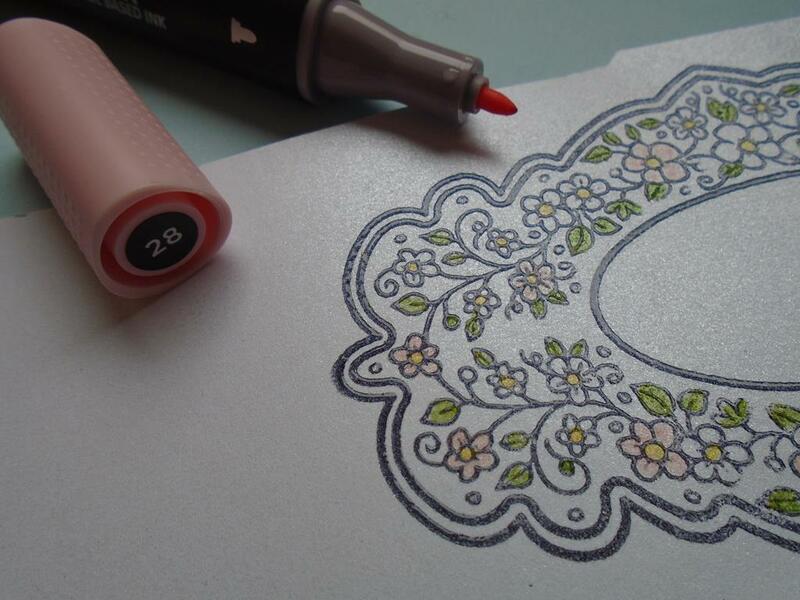 Repeat the colouring in and then cut out all the flowers with a small pair of decoupage snips or small scissors. 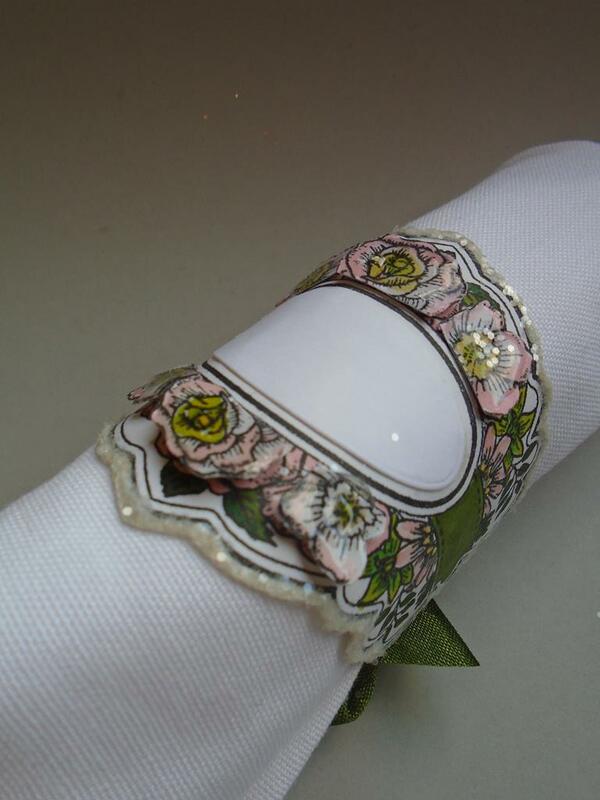 You will need 6 flowers for each napkin ring and remember each flower is a different shape on the stamped image. Step 18. Apply glossy accents over each of the flowers. Step 19. Set the flowers aside to dry. Don`t forget where they are and accidentally lean on one and get it stuck to your sleeve – not a great look !!!! Step 20. 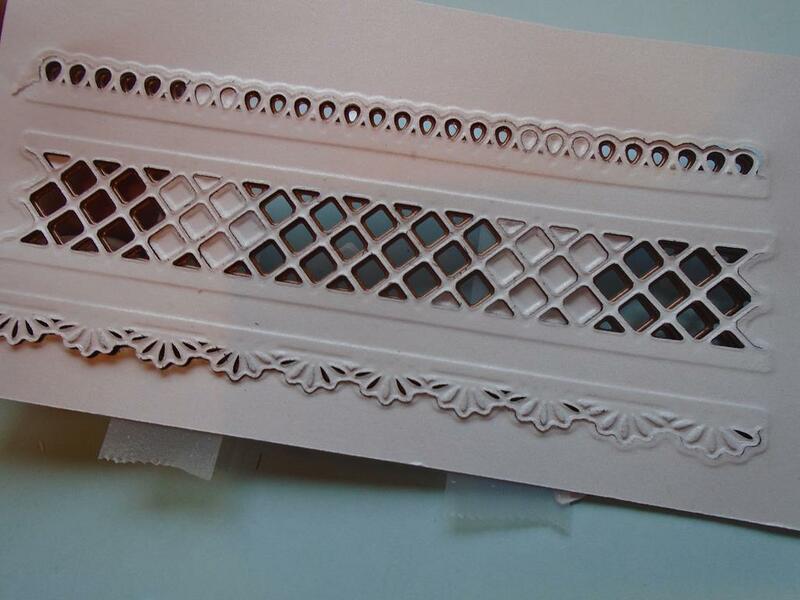 Use the Graphmaster no.42 & no.43 to colour the small leaves on the ribbon rose main cut out panel. Step 21. Colour all of the rose outline image with the no.28 pen and use a mix of the no.26 & no.28 pen on the daisy like flower towards to edge of the die shape. Use the no.47 & no.48 pen to colour the flower in next to the rose to lift the green within the project as you want a Christmassy feel to the piece. Step 22. 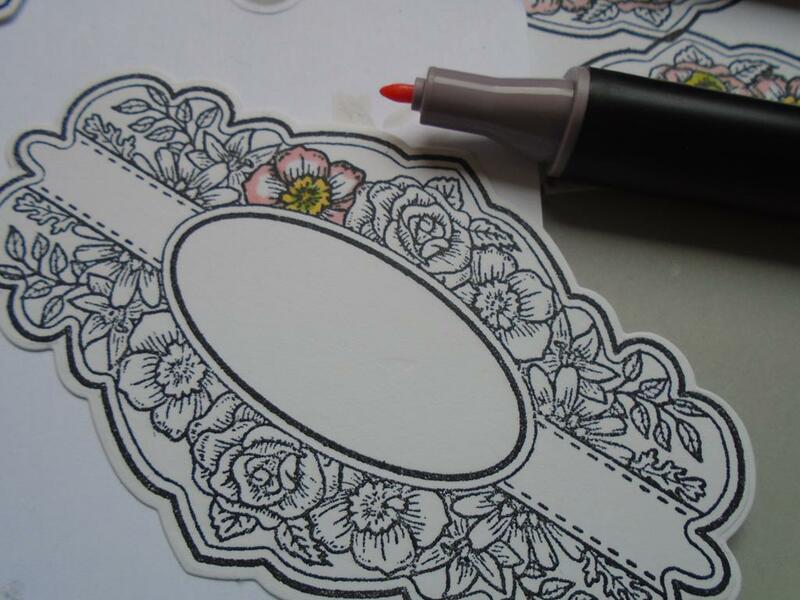 Add the dried glossy accent roses to the coloured in panel using a silicone glue for added dimension. Angle the roses lower towards the front inner oval and lift the rose towards to back. Step 23. 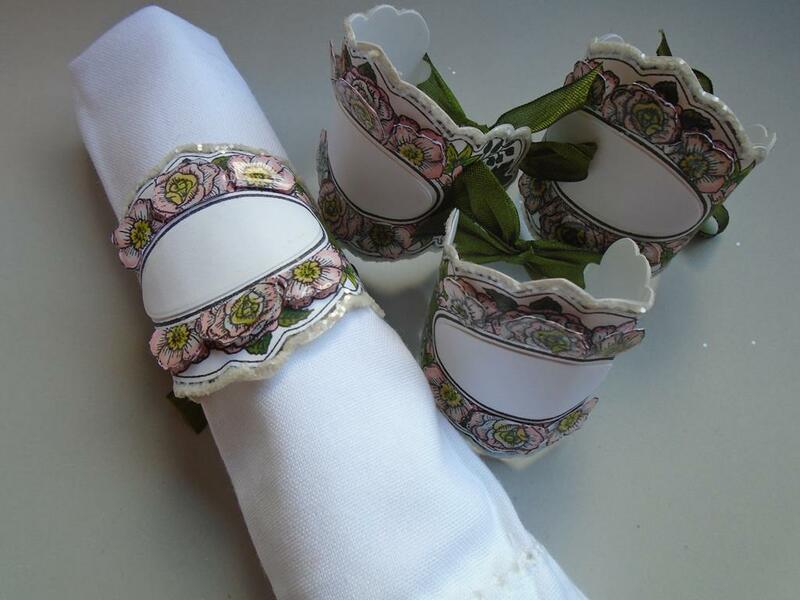 Complete all 4 rose napkin rings with the roses that you prepared. 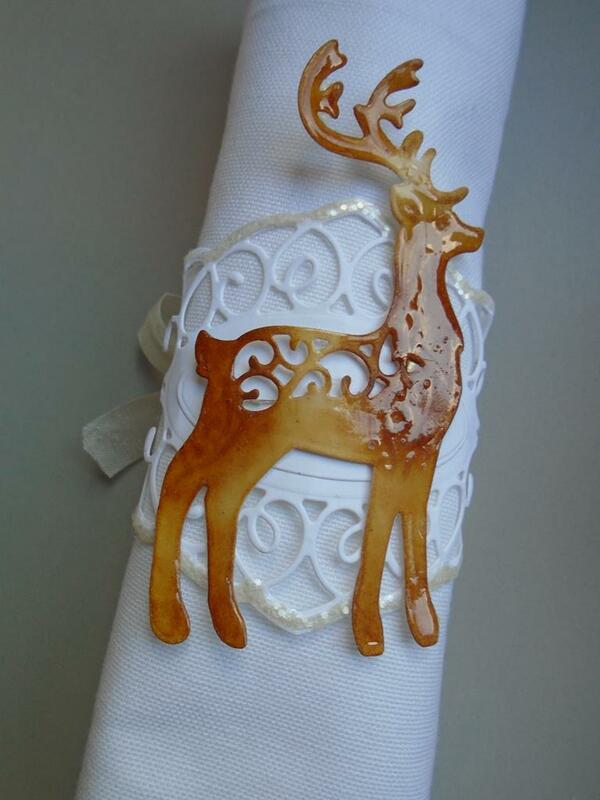 Here are 2 alternatives ~ use a Creative Expression dazzler setting and dazzler to give a lovely elegant feel for a napkin ring or use one of Sue Wilson`s deer die cuts and ink it up and add glossy accents over the whole deer. Use either the Creative Expressions finishing touches ribbon or like I’ll be using the two tone moss ribbon & the vintage ribbon coloured using the Graphmaster no. 42 pen. Step 24. On either of the napkin rings take some of the Cosmic Shimmer pearl PVA glue and run a line of the glue around the edge of the Molly frame. 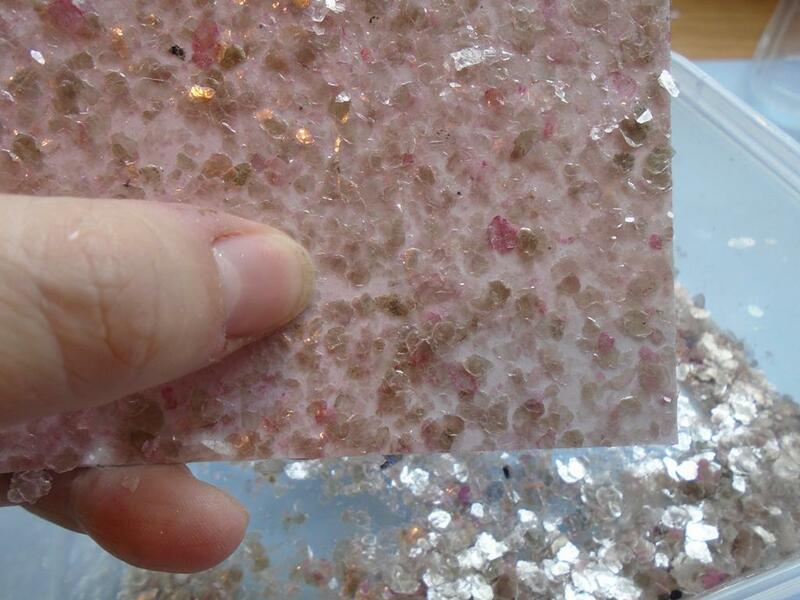 ( Pearl PVA is used so it doesn`t go clear under the glitter jewels ). Step 25. 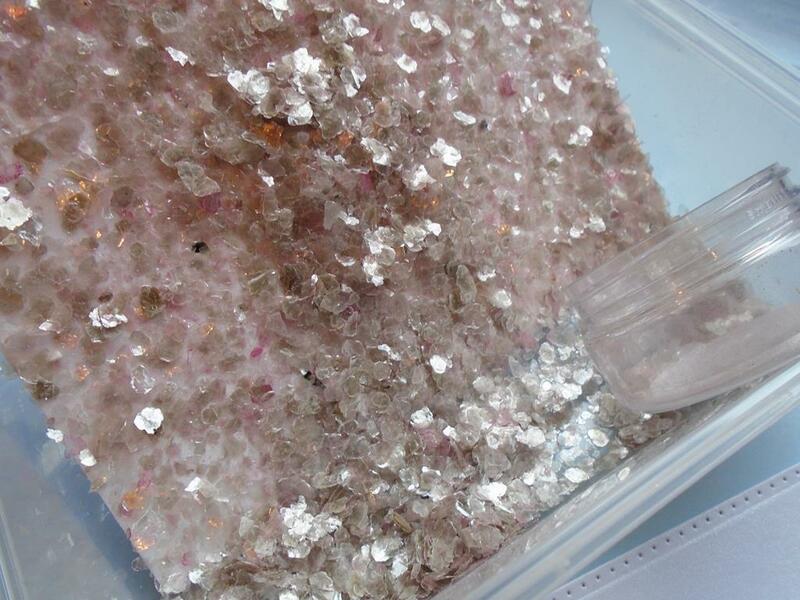 With the piece in a plastic tub sprinkle the Cosmic Shimmer iced snow glitter jewels over the glue and tap off the excess. Step 26. Here is the glossy accent deer which has just had some Tim Holtz gathered twigs ink added with some areas having more ink on key areas like the front of the deer and the horns and legs. 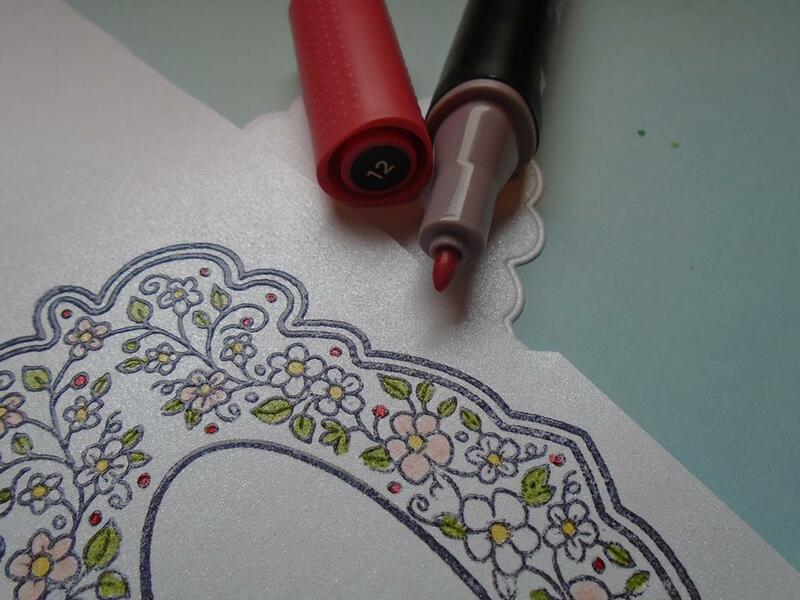 The glossy accents is applied over the ink which then highlights the inked areas when it`s dry. Step 27. Here I have used a scrap piece of the rose image to check the tone of ribbon and the Graphmaster no.42 works well with the 2 tone moss ribbon. Step 28. 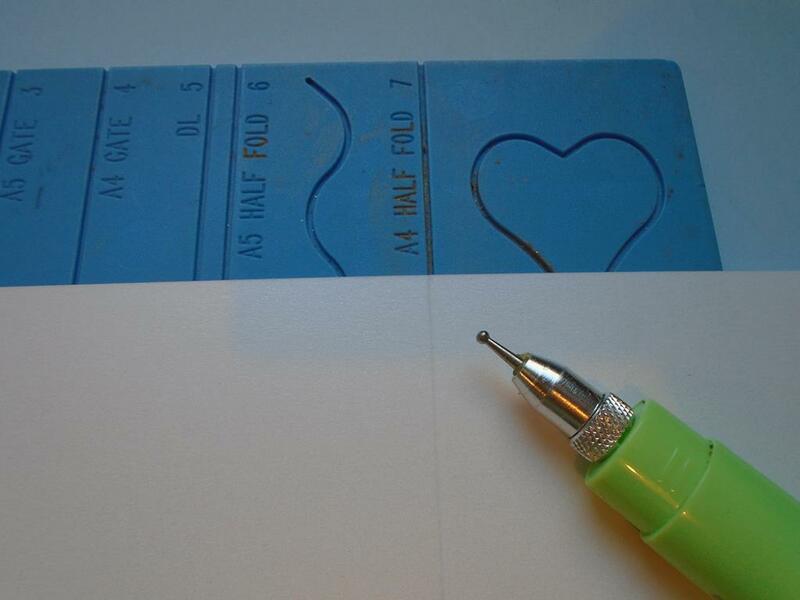 Gently curve the worked piece so you don`t crack the card in places. 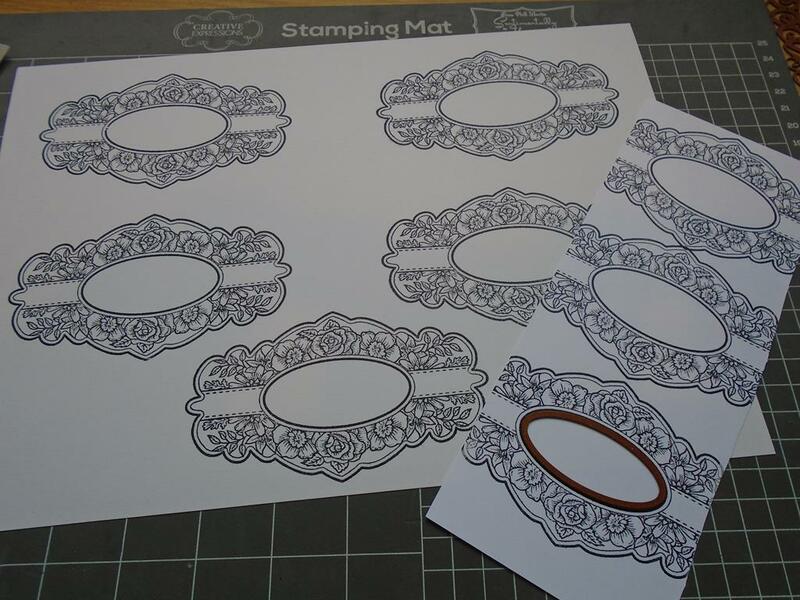 Cut 4 solid outer die shapes from the Molly die to use as backing for the napkin rings. Step 29. 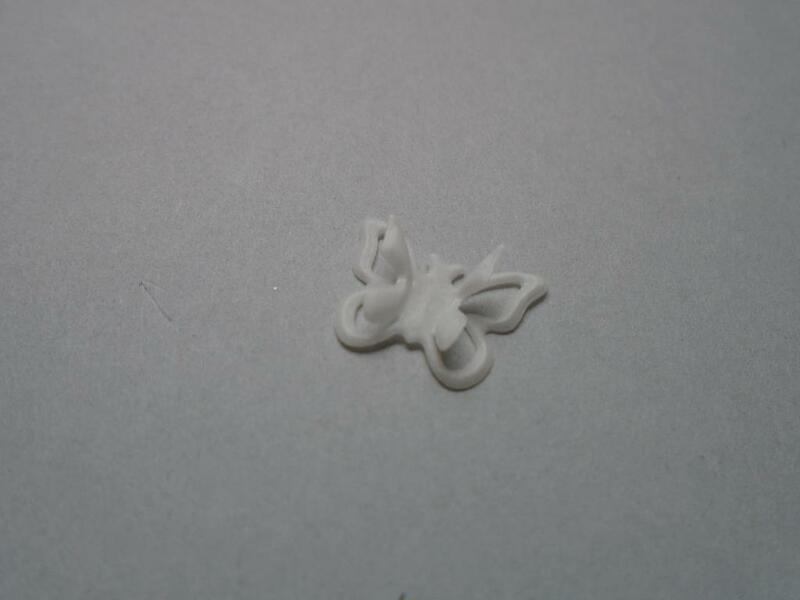 Attach a length ( I used 15inces of ribbon ) across the centre of the reverse of the piece. Turn it over to check the ribbon is lined up with the faux ribbon on the stamped image. Step 30. Use the Cosmic Shimmer dries clear glue to stick the solid backing over the ribbon making sure the ribbon area has the glue right up to the end for a firm hold as this area will be curved later on. Step 31. 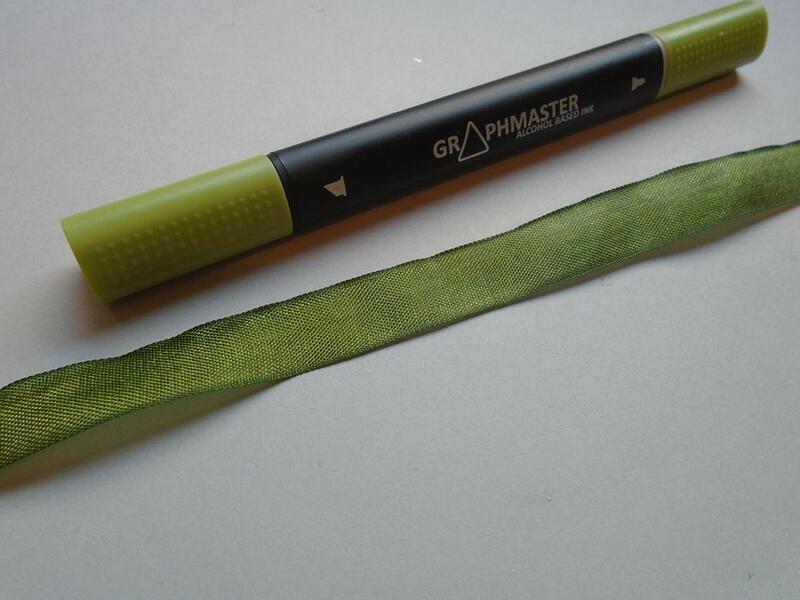 Use some of the Graphmaster no.42 pen to colour some vintage seam ribbon if you run out of the 2 tone ribbon !!!! And as you will have this ribbon on a napkin make sure it has been heat sealed by a heat tool or I laid mine on a radiator for 10 minutes !!! Step 32. 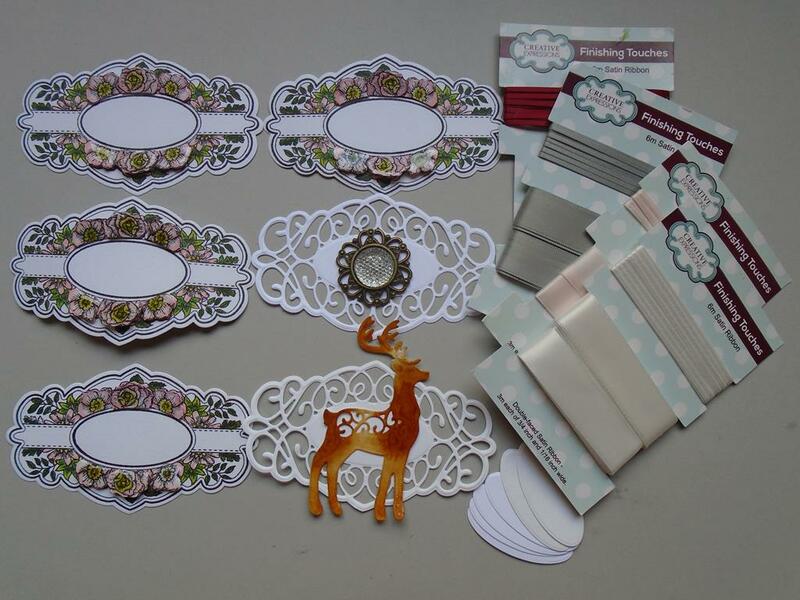 As the detailed filigree design needs to be seen on the Molly die cut then the back panel hasn`t been added on the deer & dazzler napkin ring. A length of vintage seam ribbon in doubled up though the end of the die piece. Step 33. 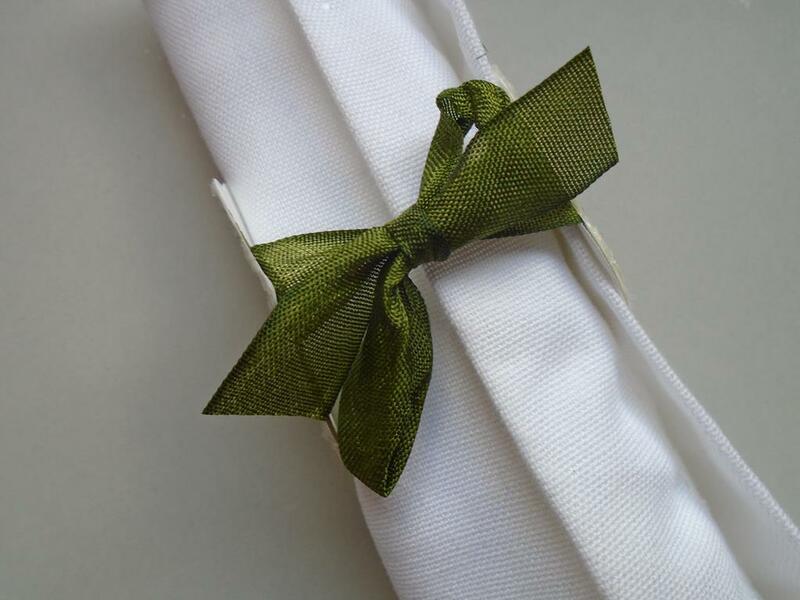 Going back to the Christmas rose ring tie the ribbon in a bow at the back of the piece before or after adding a linen napkin or a nice paper serviette. Step 34. 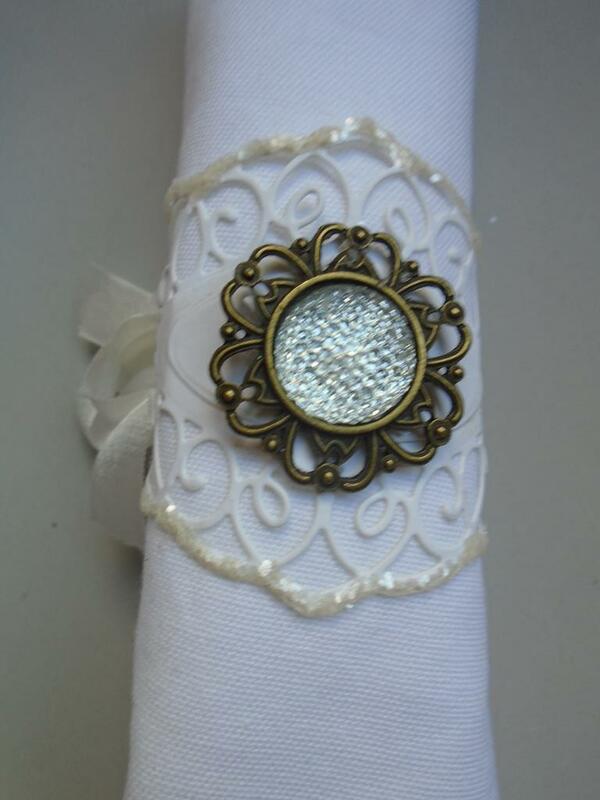 Here is the finished sparkly look to the napkin ring with a lovely linen napkin inside. Step 35. 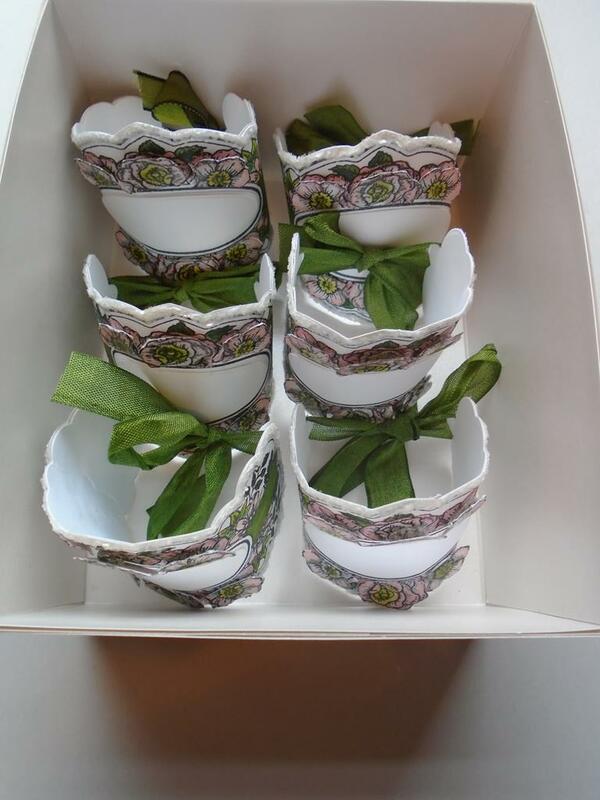 The napkin ring can be made as a gift and sent in a box with or without the napkins. 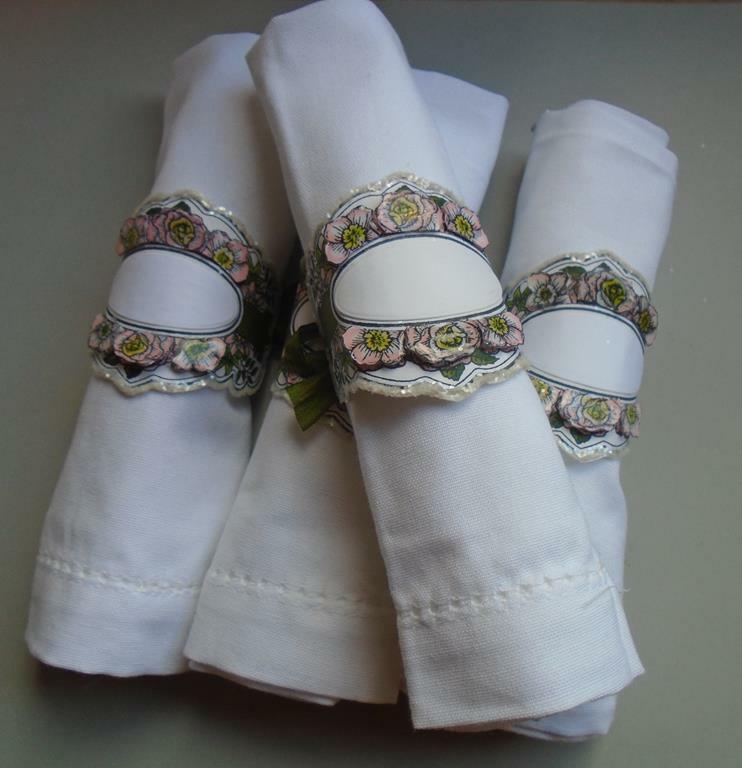 I`m thinking a nice set of 6 napkin rings would make a lovely set for a gift. Step 36. These napkins were only £5 for 4 and have a lovely detailed edging – they came from a major supermarket beginning with T and ending with S !!!! Step 37. Here is the lovely glossy deer which I think i`ll be making a set for my table as so many people have commented on the deer when I made them last year. Step 38. Here is the dazzler in the dazzler setting. There are so many different colours in the dazzler range so you can marry up you colour scheme perfectly. Step 39. 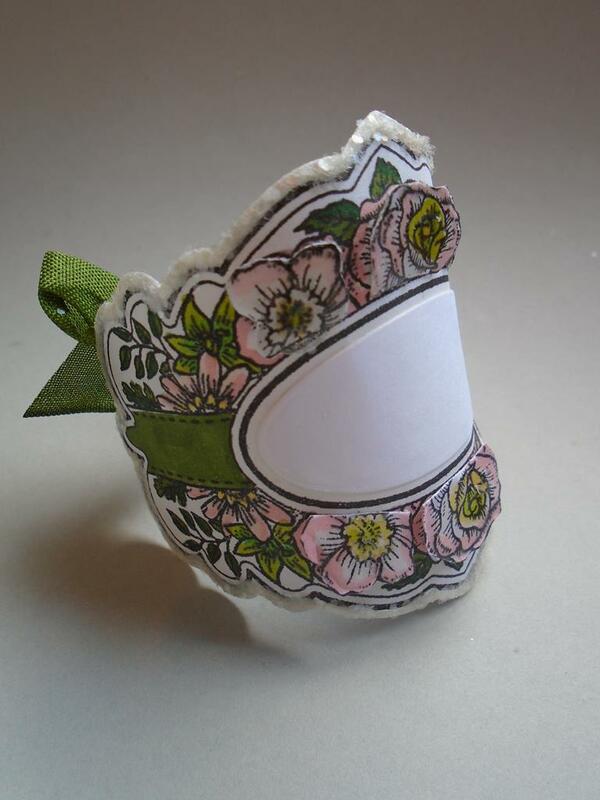 Just another single image of the Christmas rose napkin ring. Step 40. 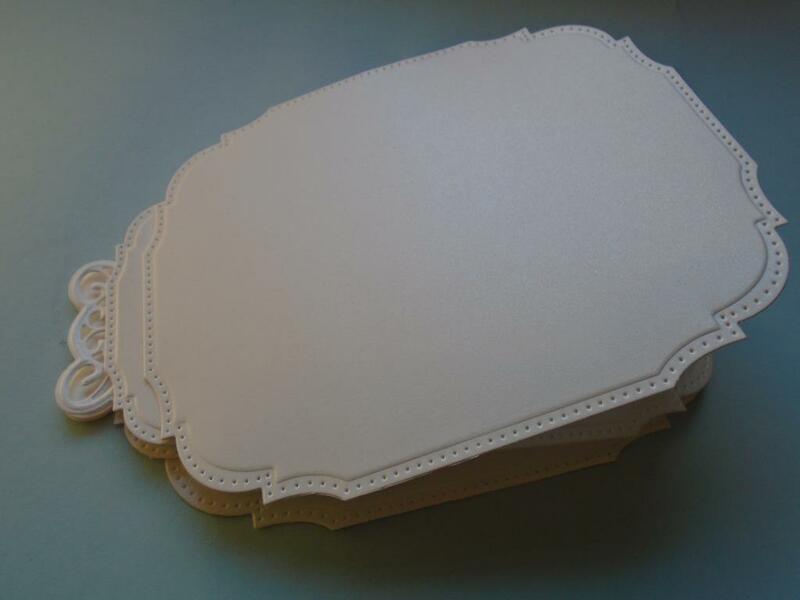 Names can be added to the centre oval to make them as place settings too. The weight of the finished rings are wonderful and you would struggle to think they are made of card. 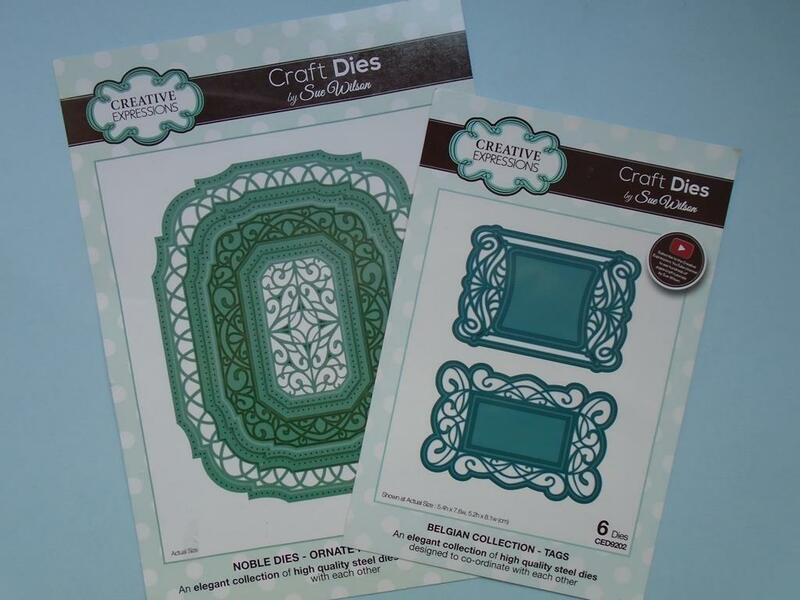 This project will show you how to make this Sue Wilson box frame shaker card using the Sue Wilson Shadow Box Collection ~ In The Garden Die Set along with the Sue Wilson Shadow Box Collection ~ stitched lattice frame and the Delightful Daisies Die Set. 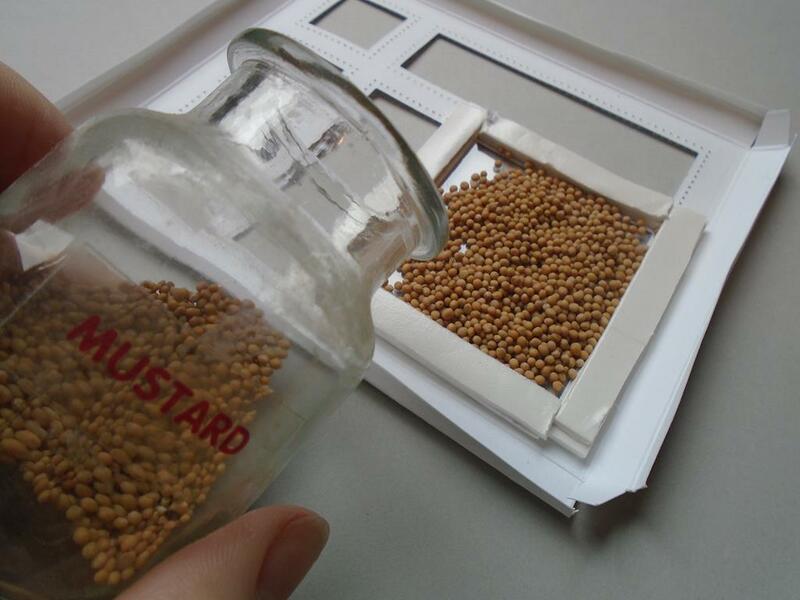 Mustard seeds are used to create the seed effect in the shaker section. 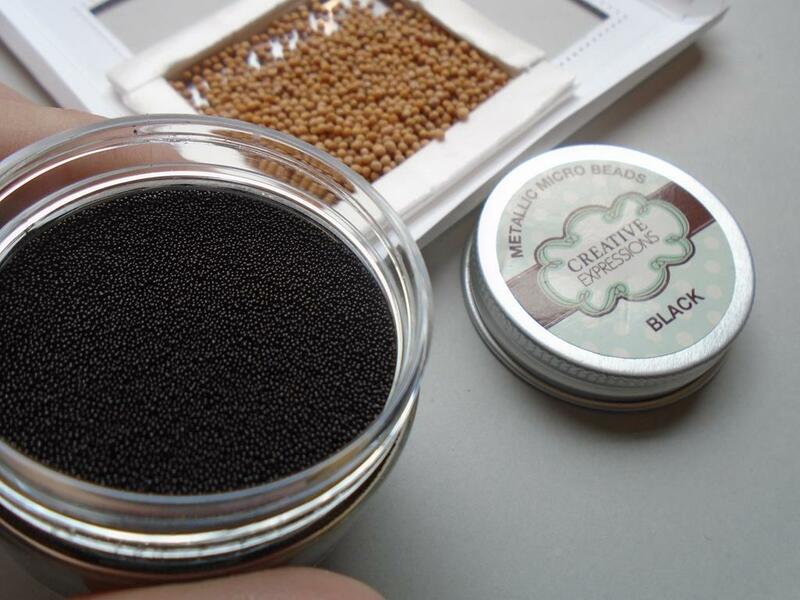 The Creative Expressions black micro beads could be used along with a poppy die to make a remembrance card instead. 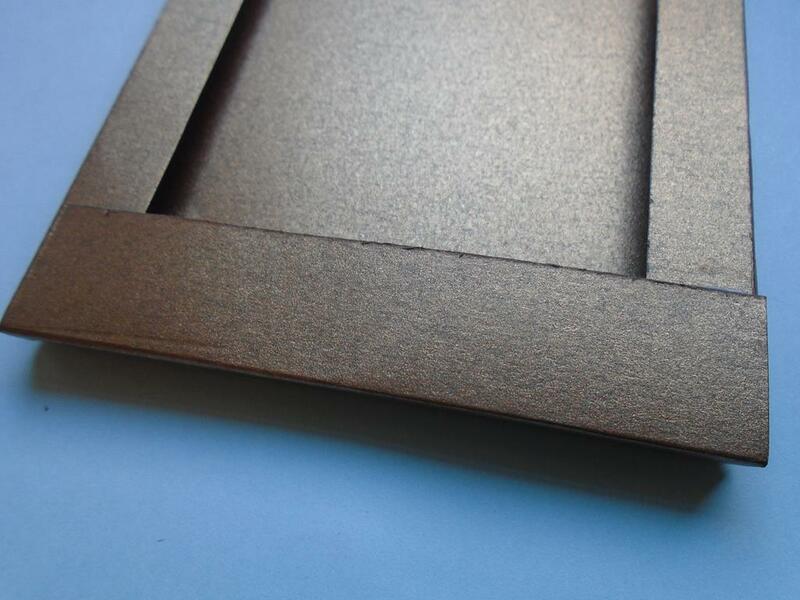 This view shows the depth of the side of the card as it covers up the shaker section and also saves on foam tape. Step 1. 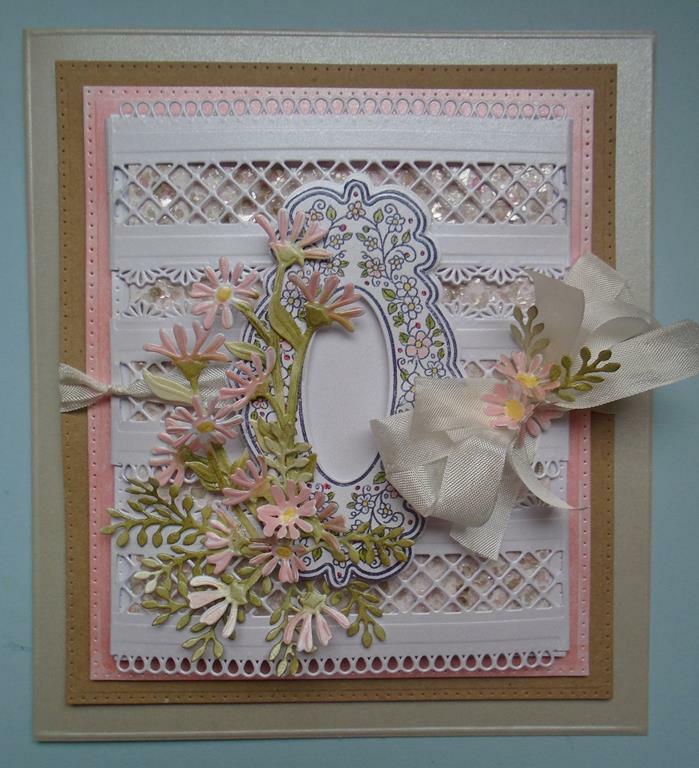 This workshop will show you how to make this box frame card but with a twist. 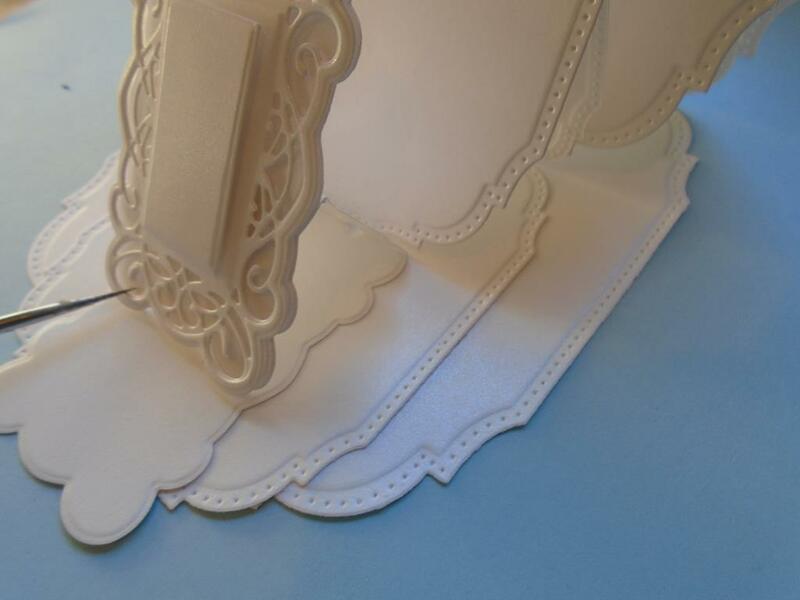 The sides have been extended to create an enclosed look, the sides also cover up the foam tape used to make the shaker section in the card which means you`ll use less foam mounting tape. 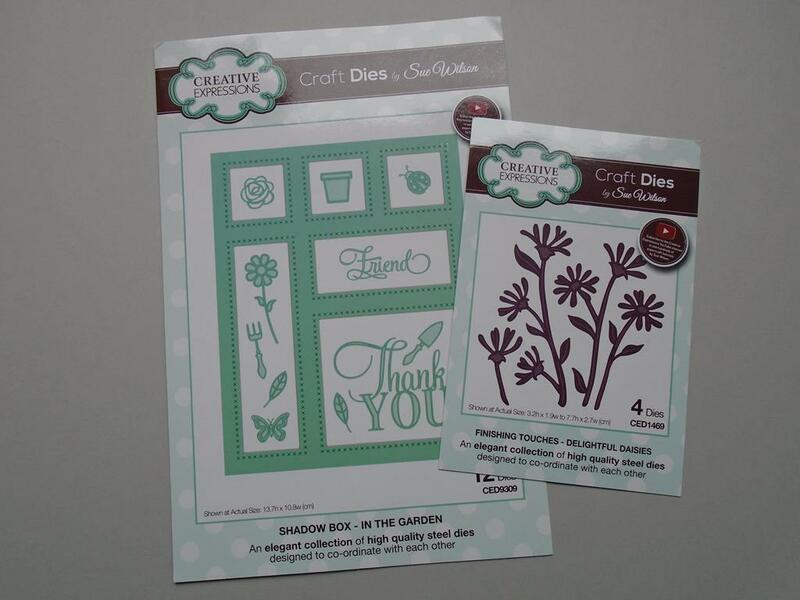 The main products for the card are the Sue Wilson shadow box collection ~ in the garden die set, the Stitched lattice frame die set and the delightful daisies die set. 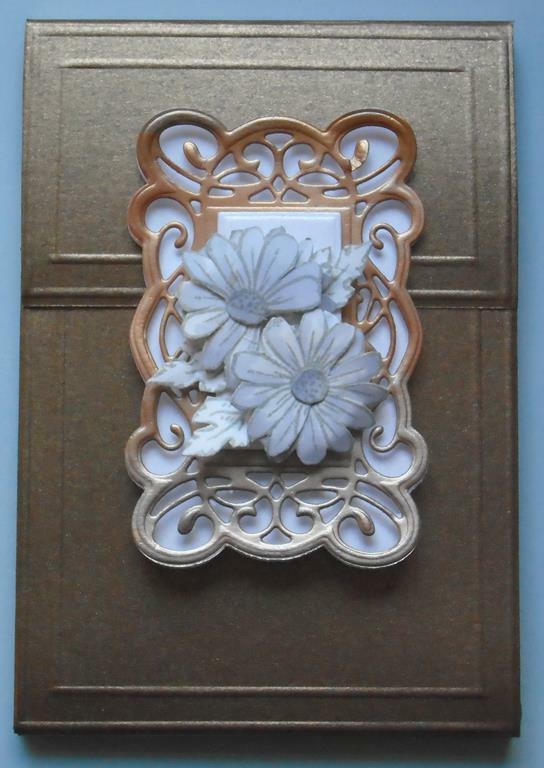 Doubled up vellum has been used to make a thicker piece for the detailed die pieces and the flowers too. Step 2. 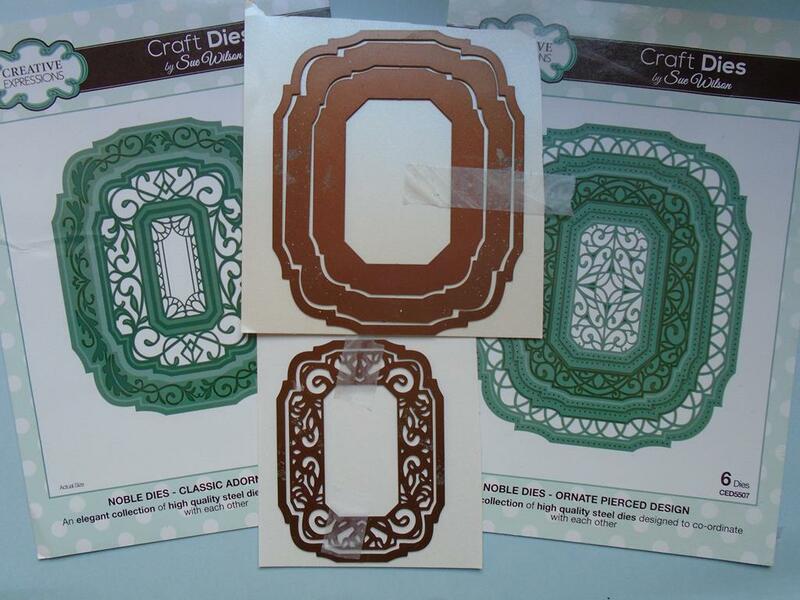 Select the main outer die from the Sue Wilson shadow box collection ~ in the garden die set. Where you place it will be up to you depending on the depth of the frame required. I started with a ½ cm score line and then a 1cm score line then the frame die, but later on found out it works better with a ½ cm spacing on both. Also keeping the die up towards the side will allow 2 frames to be cut from the one sheet. Secure the die in place with some low tack tape. Step 3. Run the piece through the Grand Calibur machine and then pass it back through again. 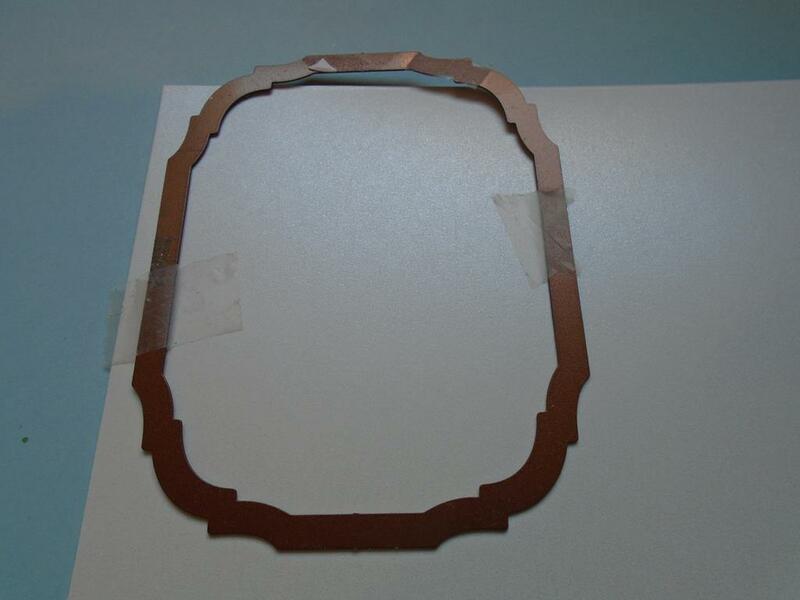 Please make sure the die goes through lengthways as this will give a better cut to the piece. 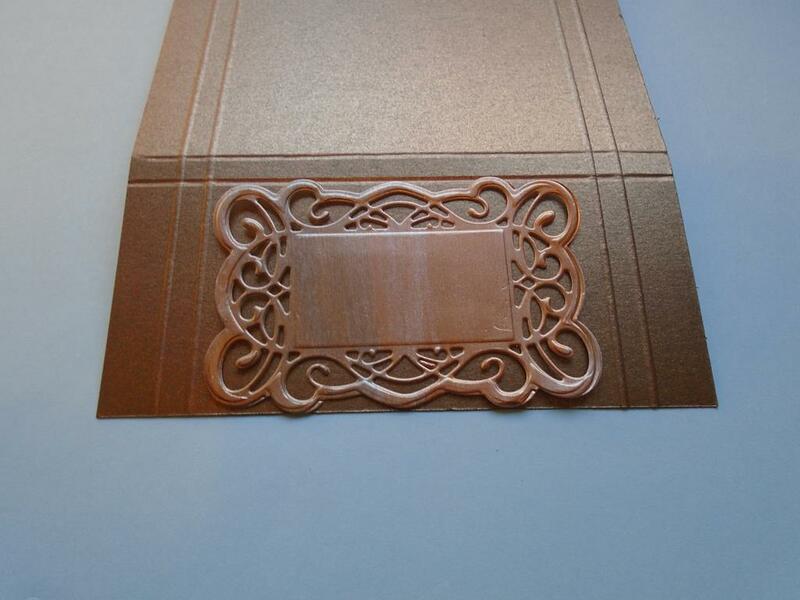 Now use the pink embossing mat, the tan mat & base plate to emboss the cut panel. Step 4. 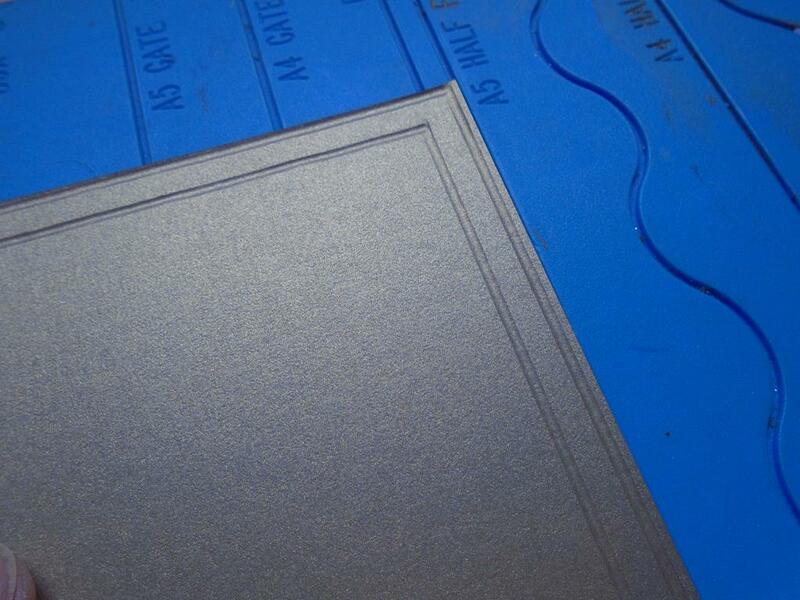 Embossing will have brought out the amazing detail in the die. It`s optional but you make want to prick through the tiny `X`s to remove any small pieces of card that stayed in the design. I found it very therapeutic and it didn`t take long either. Step 5. Score a line about 1cm out from the embossed ridge the frame left. Complete this all the way around the 4 sides. Step 6. Decide which width you want the box height. I originally did a 1cm scoreline but ½ cm score line and then another ½ cm score for the tab that will sit under the box and hold it to the base card is needed. So go ahead and score 2 lines ½ cm apart from the just scored point. Step 7. Trim away the excess card where the outside line falls. Step 8. Here is the basic box frame shape. Step 9. 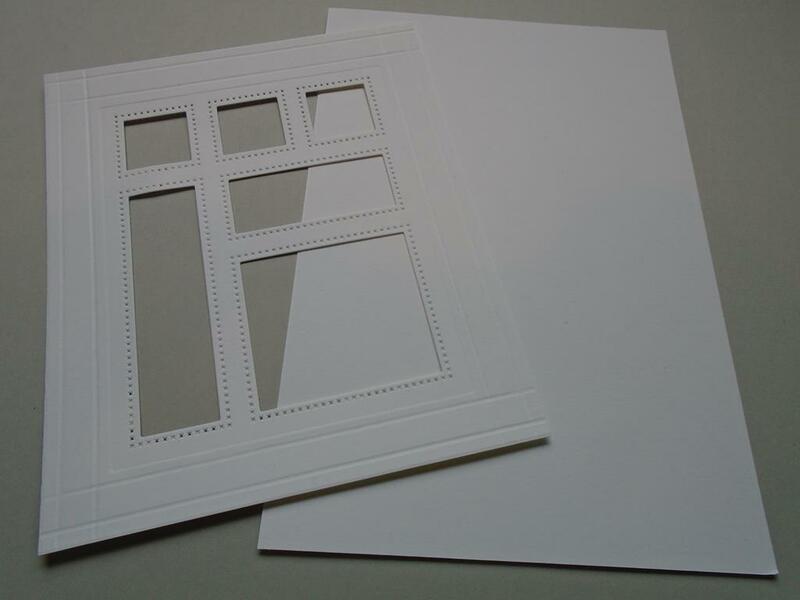 There is also enough card to make a 2nd enclosed box frame card with the off cut. Step 10. 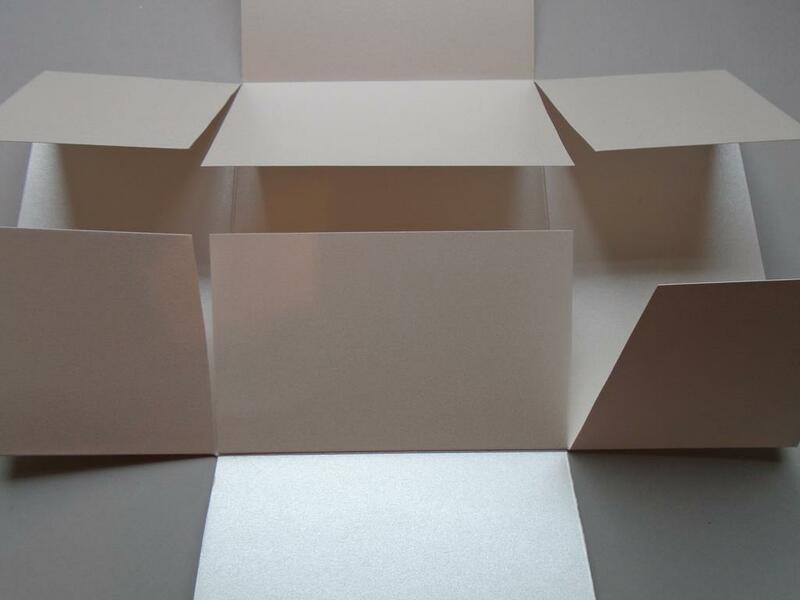 Cut all the outer box pieces from the corner of the card leaving the solid inner square in place. Step 11. Now cut into the top of the square up to the next score line and then repeat the process at an angle to make an inverted `V` shape tab. Step 12. Repeat this on all 4 corners of the card. Step 13. 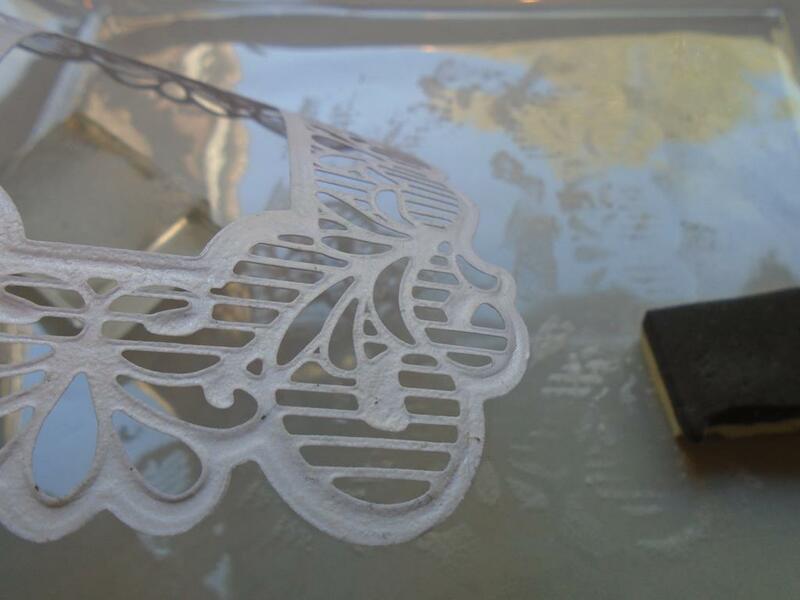 Here you can see all the pricked out detail of the `X`s made using the intricate die. Step 14. Fold and crease up all the score lines including the corner tabs. You may want to do this step after the shaker section has been made but I prefer to do it first. Step 15. Add a line of Cosmic Shimmer dries clear glue around the edge of the bottom square frame which will be used as the shaker section. Step 16. 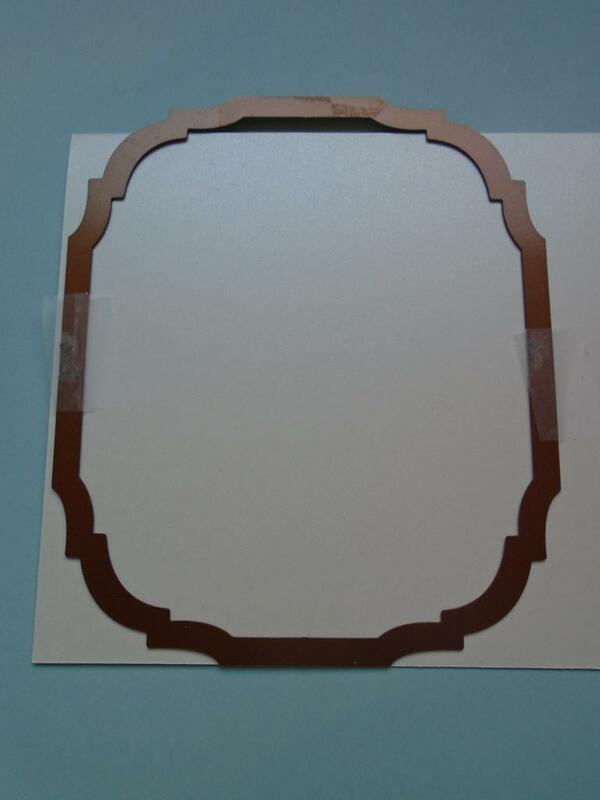 Cut and place a piece of the acetate over the square making sure it stays within the frame border. Allow the glue to stick before carrying on. Step 17. 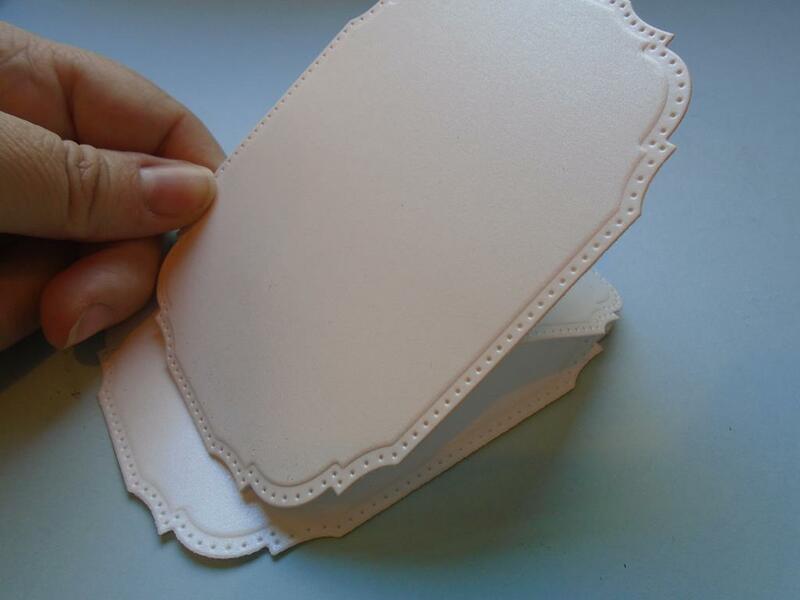 Use the off cut pieces that came from the frame to use as a guide when cutting the foam tape for the shaker section of this card, just make sure it`s a bit longer either end. Trim the foam tape down the centre to get the required size foam width needed. Step 18. Attach it to the top and bottom of the frame. Step 19. Complete the other 2 sides making sure that the foam tape meets together so it doesn`t allow any of the shaker contents to escape. 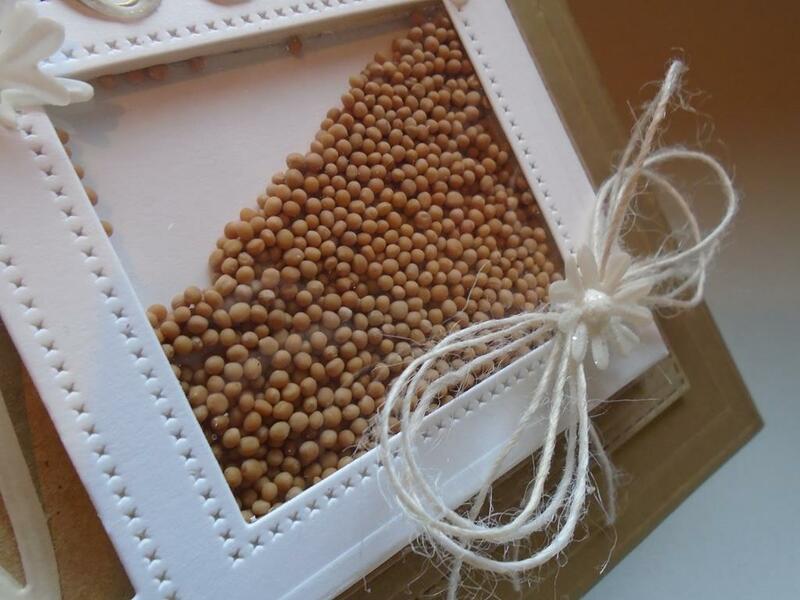 Cut to size another white piece of card to be used to cover the seeds and seal them in later. Step 20. I have added 2 rows of the foam tape to take up the depth of the seeds. Remove the backing from the foam tape and pour in the mustard seeds. Step 21. Alternatively you can use the Creative Expressions black micro beads if you are using the poppy dies / stamps as these resemble the seeds of the poppy. This idea would also make a lovely remembrance card too. Step 22. 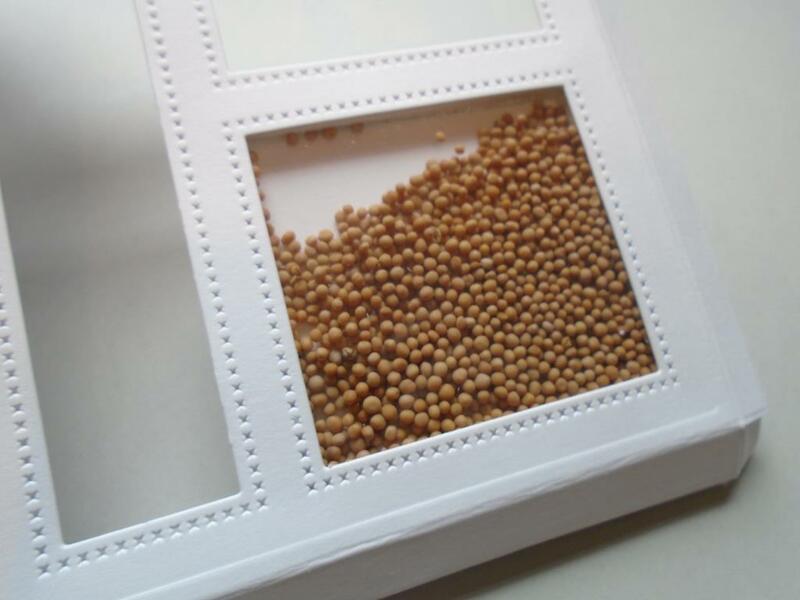 Place the white backing card over the mustard seeds to seal them all in. You may want that card slightly larger so it covers the sticky of the excess foam tape !!!! Step 23. 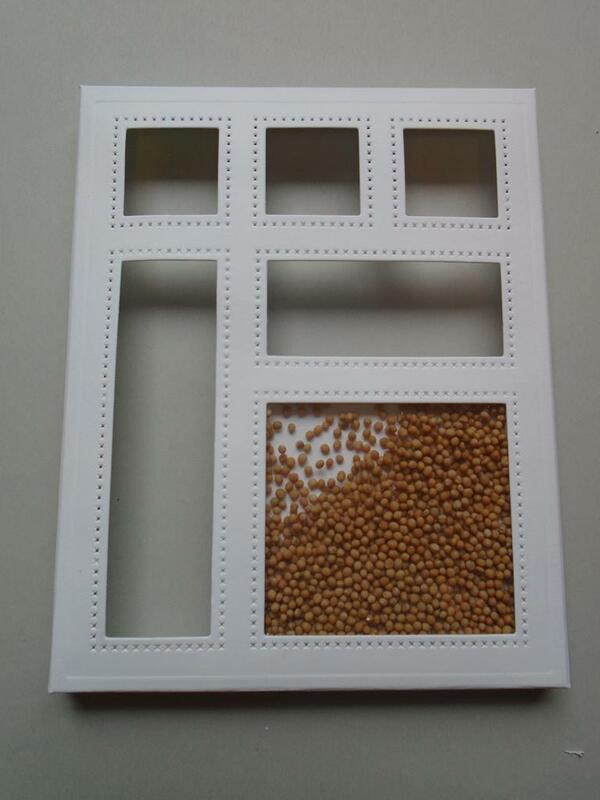 Turn the piece over to reveal the mustard seed shaker section of the box frame. Step 24. 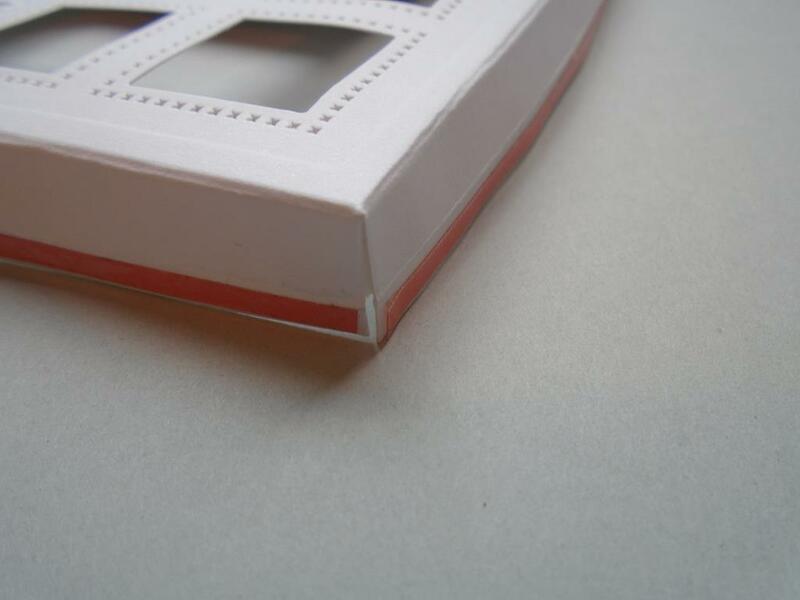 Add some strong tape along the outer edge of the box tabs and also on the corner tabs. Step 25. 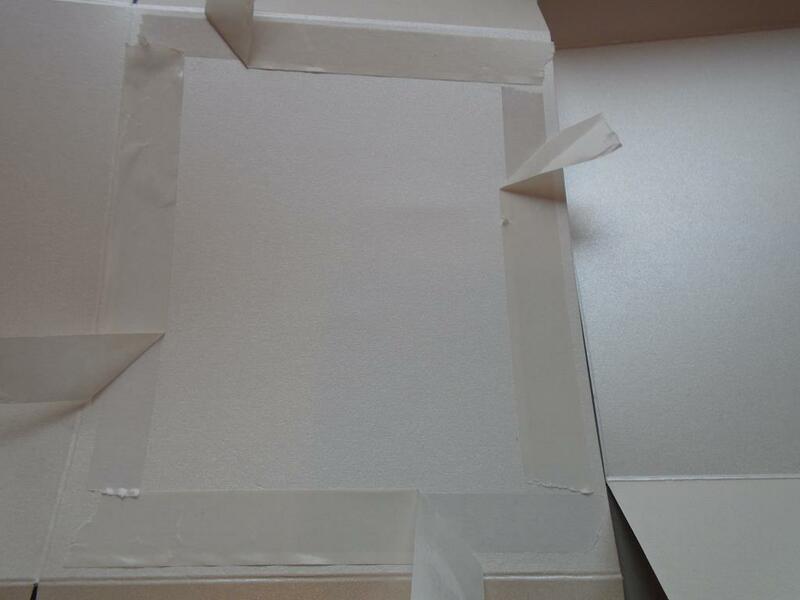 Remove the backing from the corner tabs before fixing them in place on the inside of the box sides. This will start to create the covered box side shape. Step 26. Now fold the over sticky tape sides down as it is this piece which will stick the back to the base card. Step 27. Turn the piece over to see the box frame taking shape. Step 28. 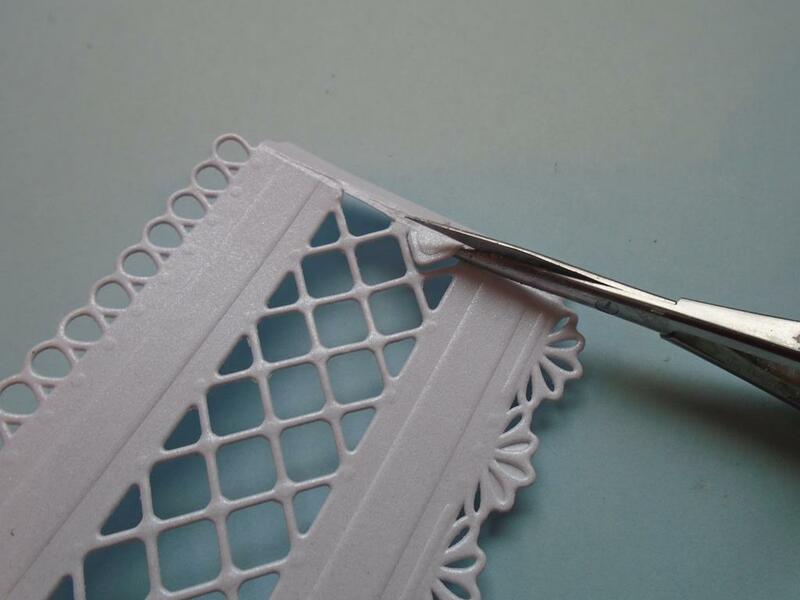 Lay the box frame onto a piece of kraft card and here you will see the frame sits perfectly over the inner Sue Wilson stitched lattice frame die and then cut and emboss the larger stitched die at the same time. (Remove the box before cutting the piece !!!) 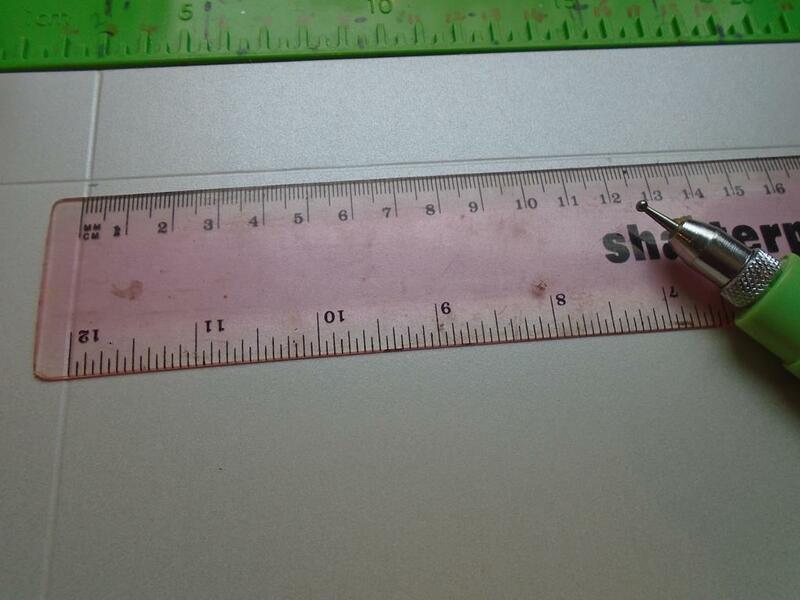 it`s just to show the sizing is correct if you use the 2 ~ ½cm score lines. Step 29. This photo just shows the reduced side tabs as there were 1cm at the start of the project but that made it to deep for this project. 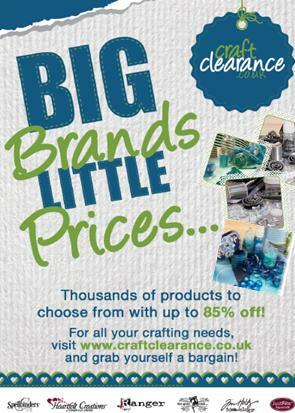 I have left it in as it may be useful for another crafter to see how you can still save project. Step 30. 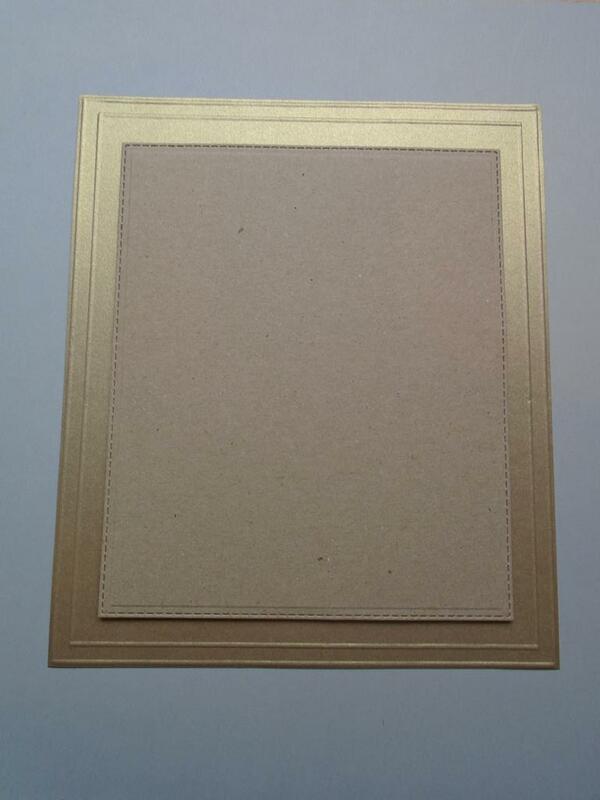 Remove the backing off the tape on the bottom of the box and stick the box onto the stitched kraft card panel. This effect saves using lots of foam tape and you don`t get to see the workings of the shaker section this way either. Step 31. 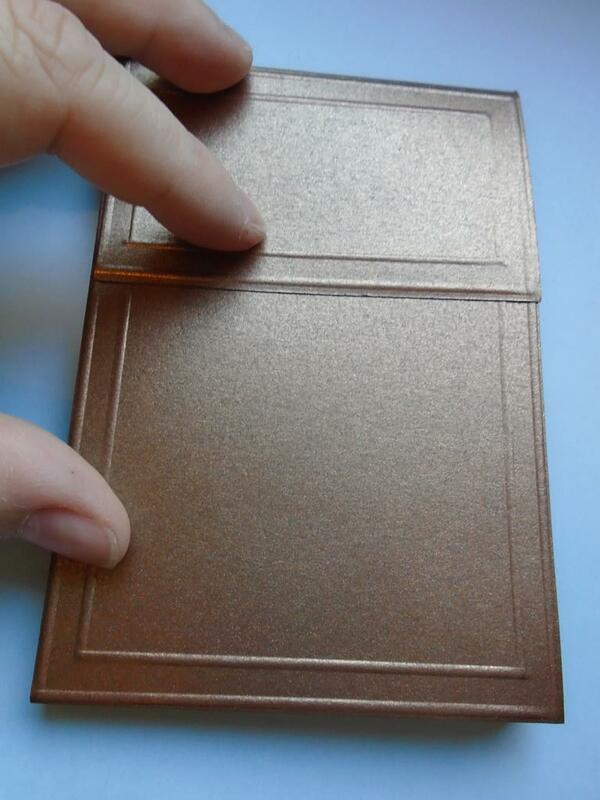 Trim the Foundations antique gold card to 7” x 8 ¼ “ or fold a tab and attach another piece of card to make a folded base card. Step 32. Place the gold card onto a score board and score around the outer of the card and then repeat a smaller inner line a ¼ “ in, again all the way around. Step 33. 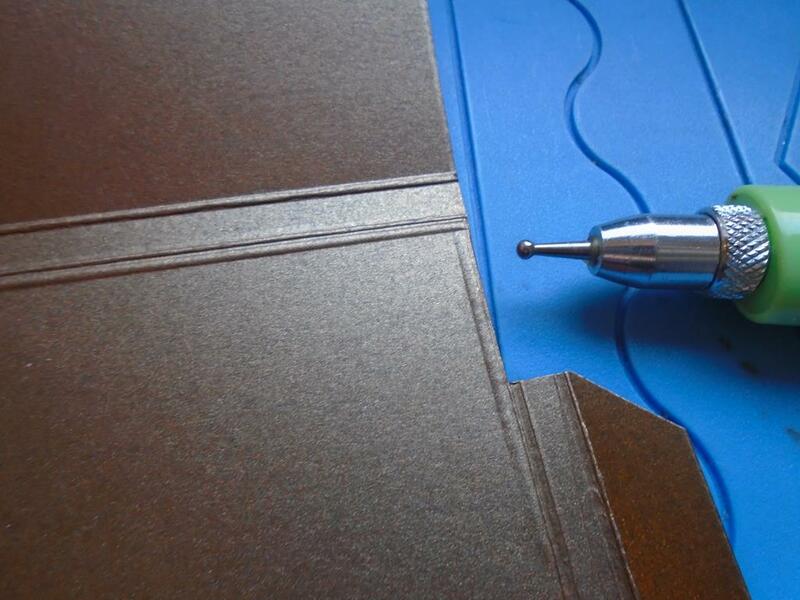 Add the larger kraft panel onto the base card using foam tape for added dimension. Step 34. Add the already prepared box frame panels onto the base card using foam tape and just look at the depth created with 4 layers of card. 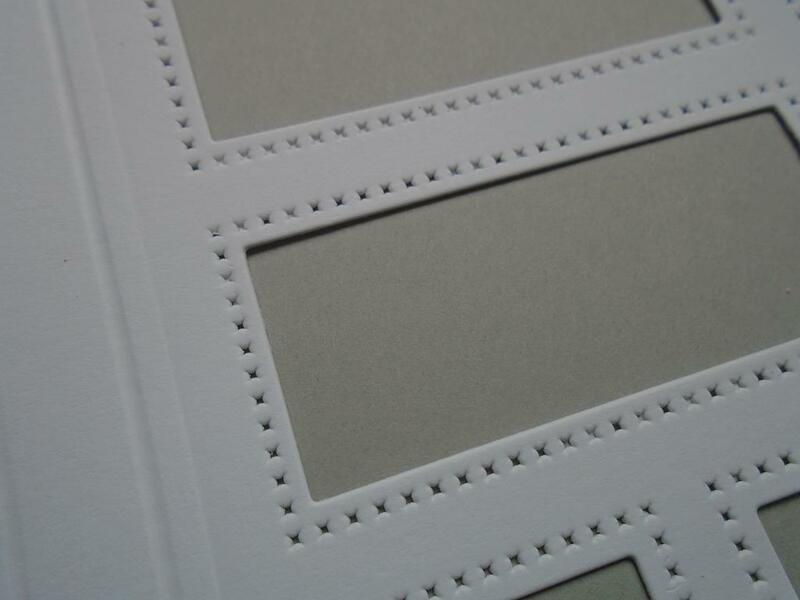 The embossing, stitch effect and the box frame all play a part in the overall dimensional finish. Step 35. 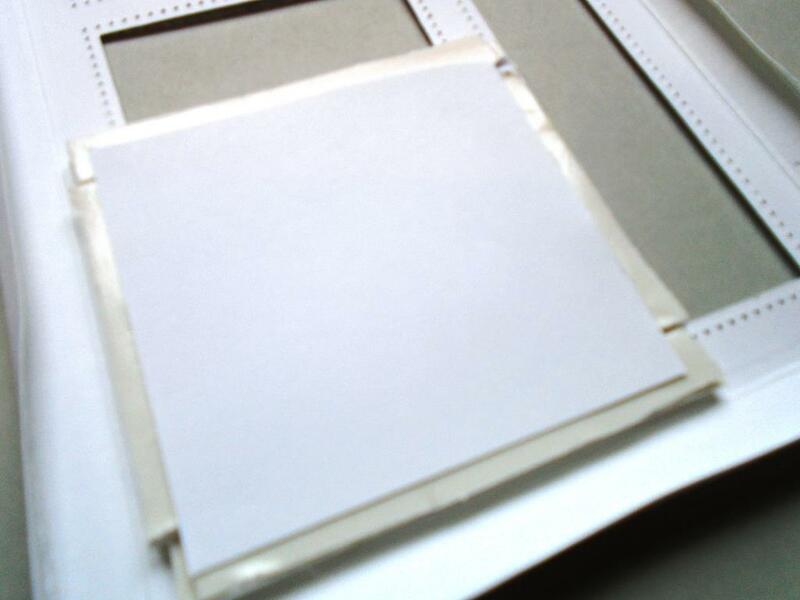 Take a piece of A4 Foundations vellum and fold it in half, width wise. 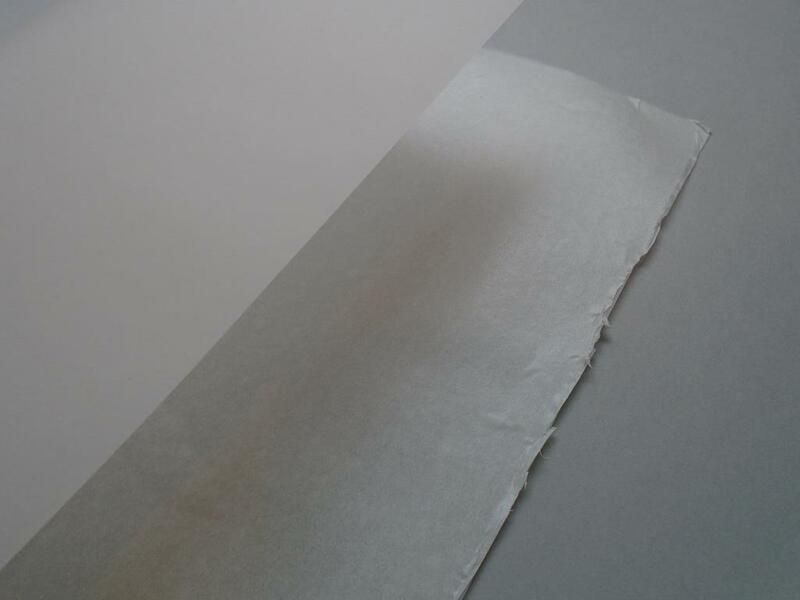 Cut a piece of sticky A4 sheet in half and remove the backing and stick it down on the inside of the vellum. 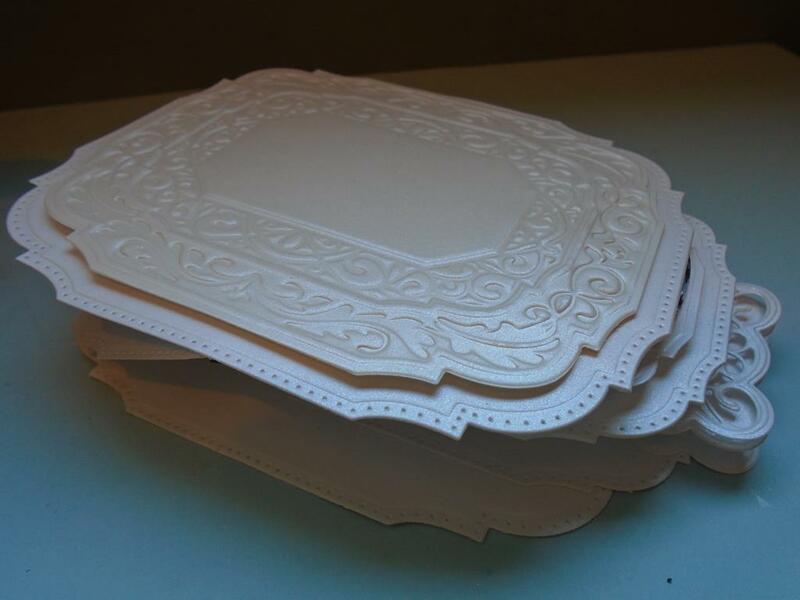 Then fold the other side on top to create a lovely weighted piece of vellum. 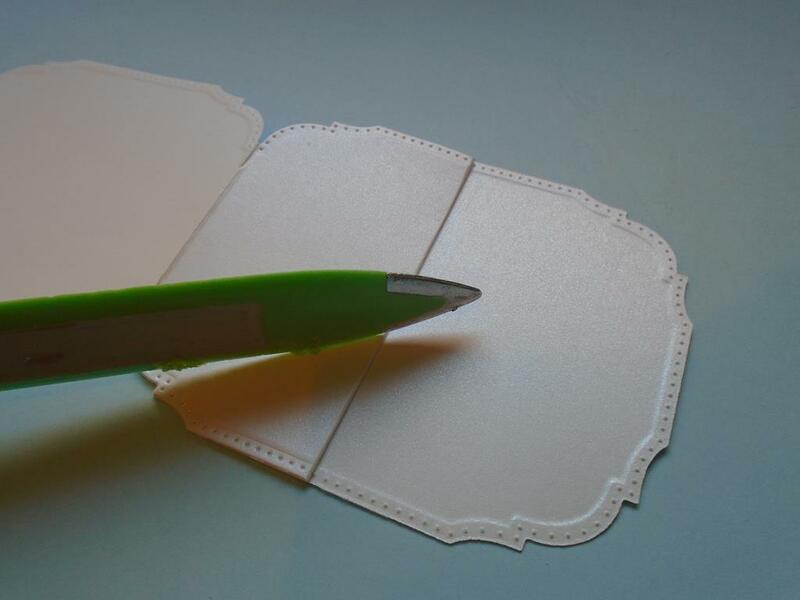 This is helps when gluing the die cut pieces onto the card as it`s harder to see the glue underneath yet still have the soft effect of the vellum. Step 36. 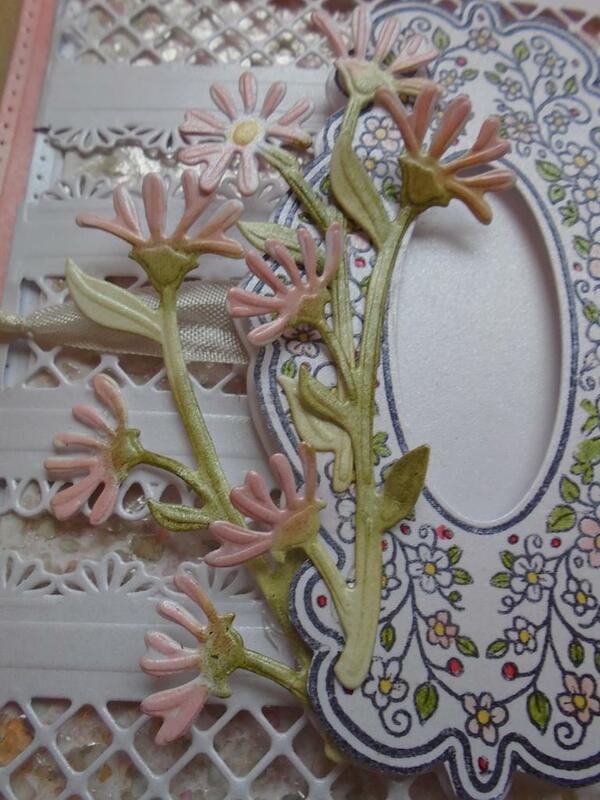 Select the flowers from the Sue Wilson delightful daisies die set and then add the small garden embellishment pieces from the shadow box collection ~ in the garden die set. IMPORTANTLY use low tack tape to secure the dies in place and so they do not move and cut into each other. Step 37. 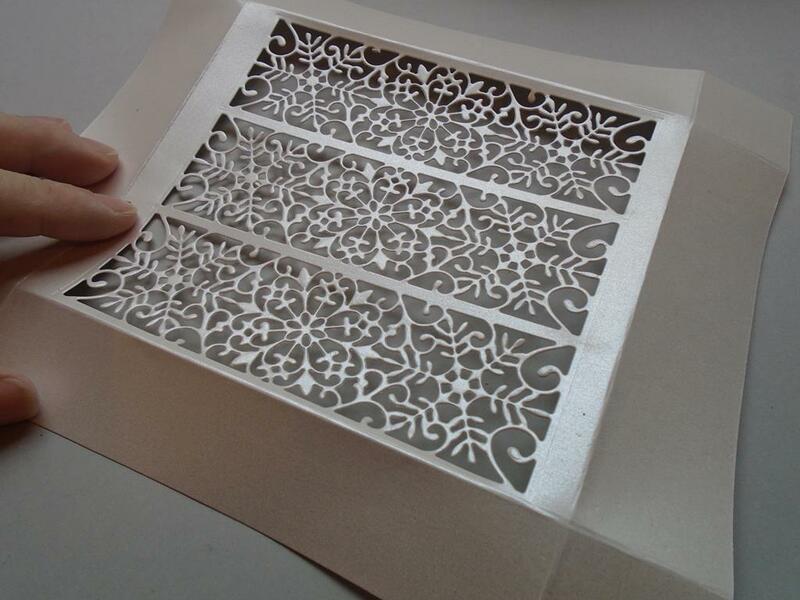 Cut and then emboss the vellum through the Grand Calibur die cutting machine. Step 38. 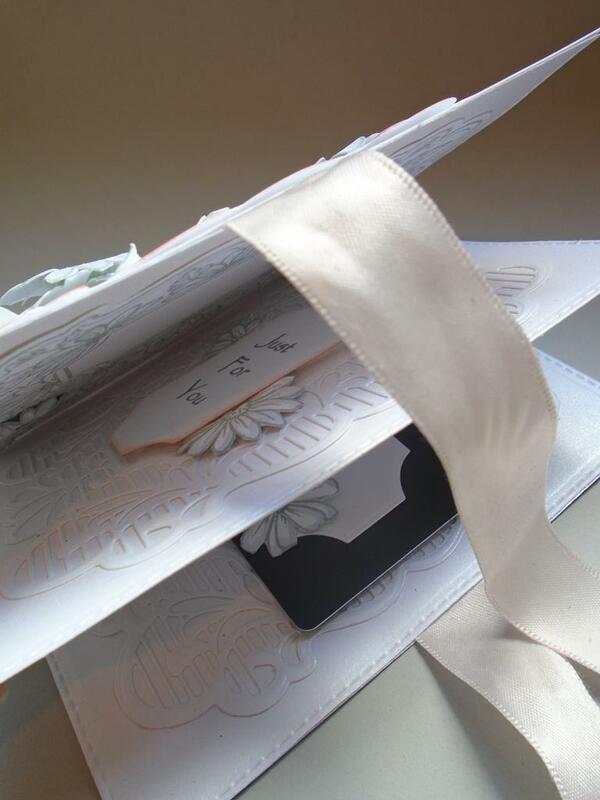 Poke through the die to release the vellum and the lovely detail the embossing brings. Step 39. 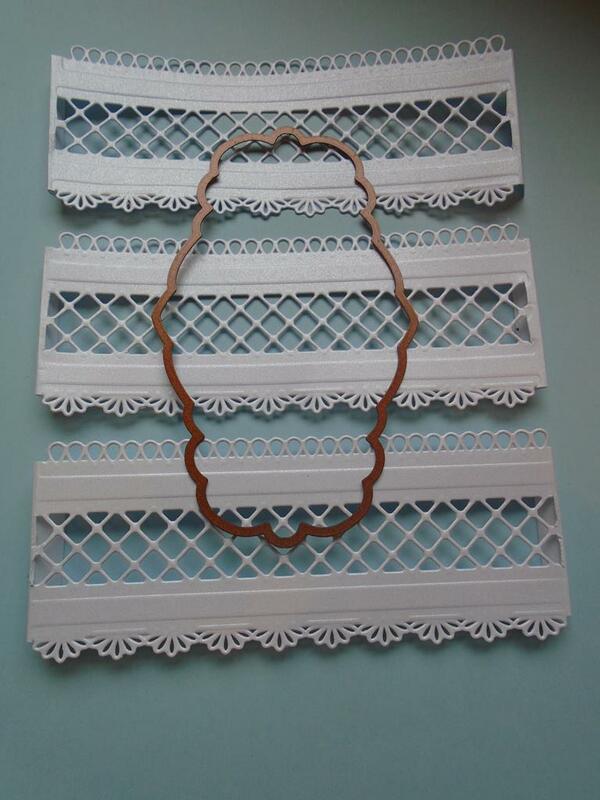 Here are all the pieces cut in one pass. Step 40. Poke the wings up on the small butterfly for added detail. Step 41. Repeat the following so that the flowers can be decoupaged. Cut extra leaves, a butterfly a pot and a ladybird can be added. Step 42. 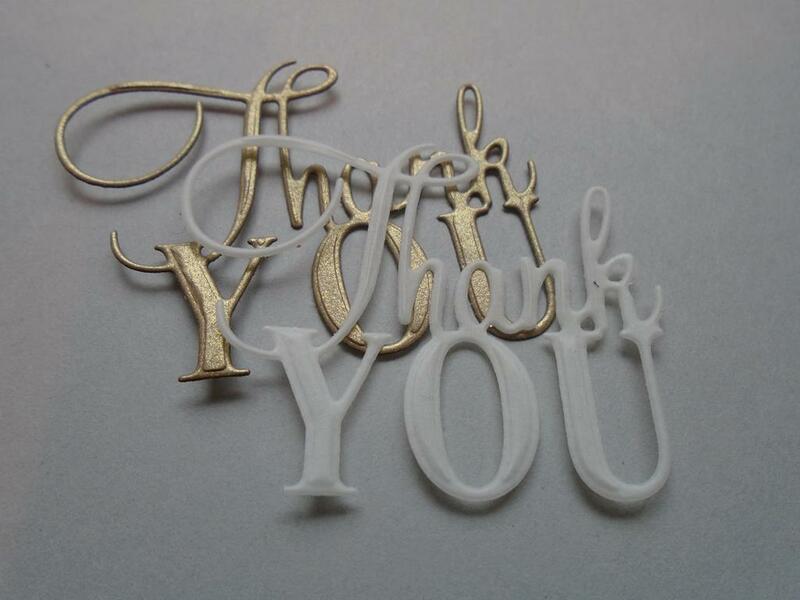 Cut and emboss another `Thank You` in the antique gold card so it can be shadowed. Step 43. 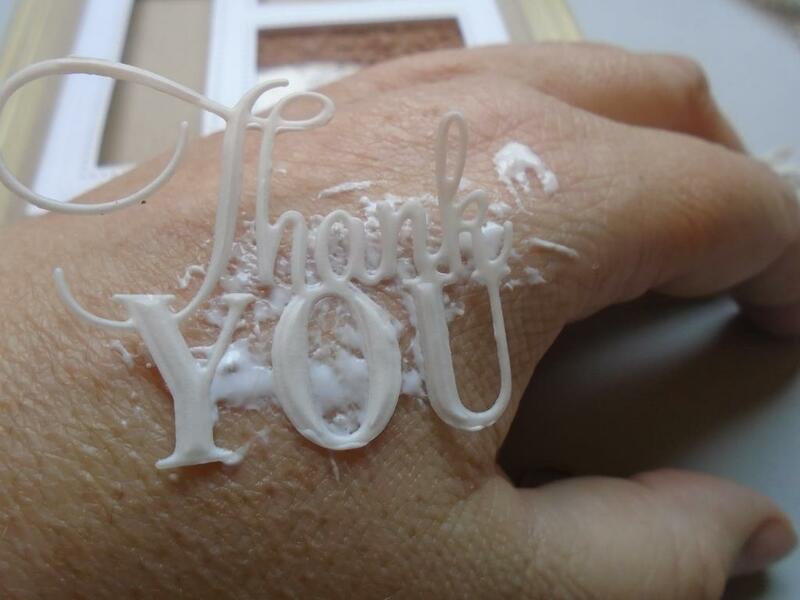 Add some Cosmic Shimmer dries clear glue onto the back of your hand and tap the vellum `Thank You` over the glue before off setting it over the gold `Thank You` sentiment. Step 44. 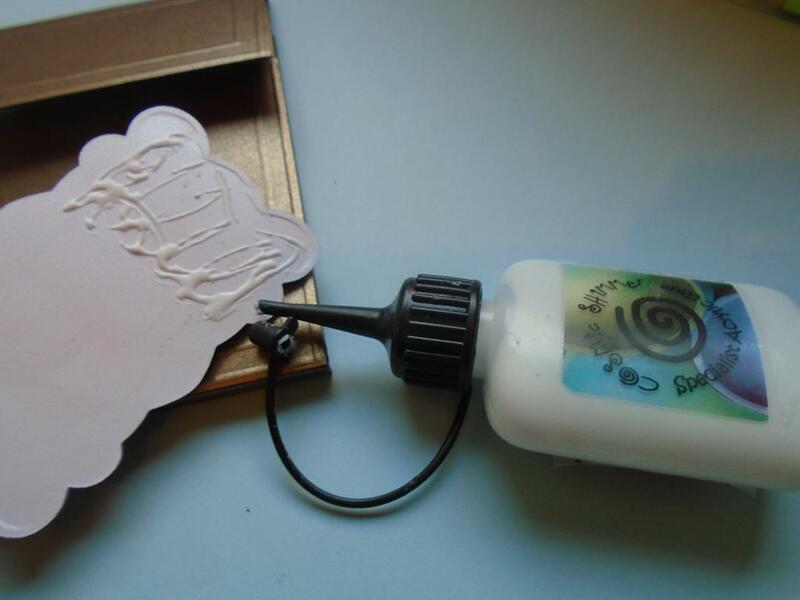 Place the different elements into the shadow box using some silicone glue for dimension. Lay the `Thank You` over the box above the seed shaker section. Add the delightful daisies so they are mainly stick at the bottom of the box and then the flower heads fall over the edge of the box. Decoupage some of the flower heads up. Step 45. Cut one of the full flower daisies off the stem….. Step 46. 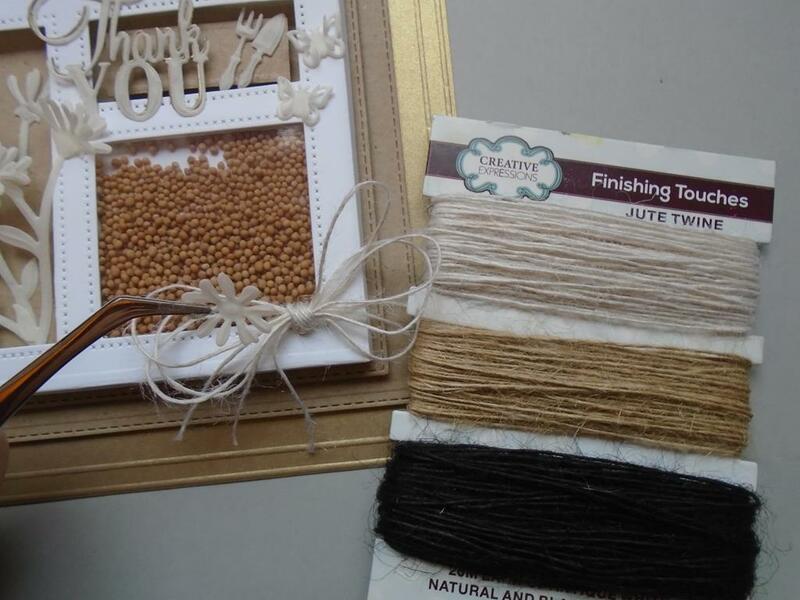 ……..make a nice jute bow using the lightest jute from the natural twine bundle. 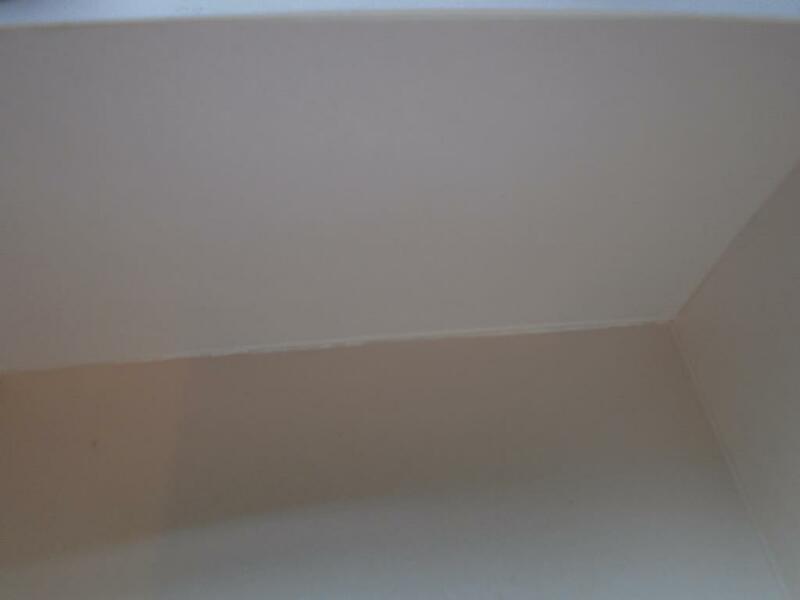 Add the bow to the corner of the shaker box. Step 47. Add the daisy head to cover the knot of the bow. 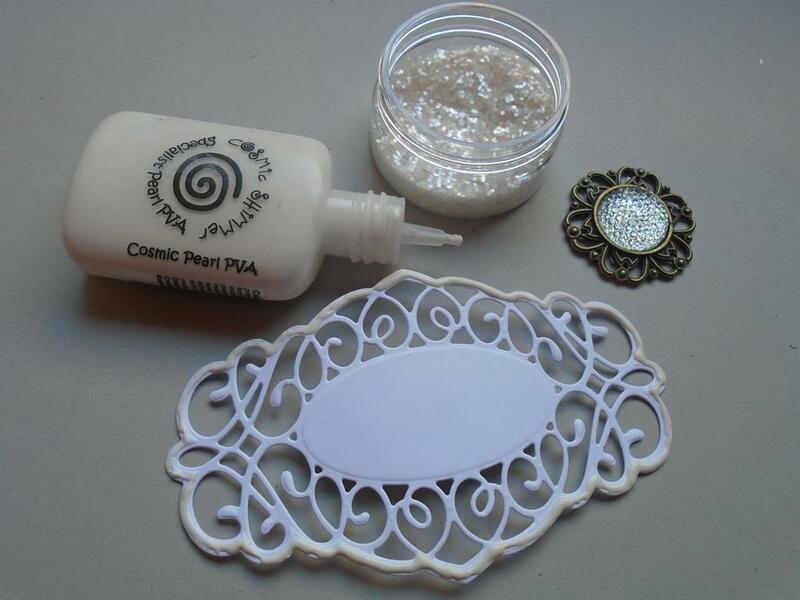 Add some of the Cosmic Shimmer pearl PVA glue to the centre of the whole daisy heads and then sprinkle some of the Tim Holtz distress dry rock candy glitter over the glue and tap off the excess. Step 48. Here is a close up of the twine bow which completes the seed shaker section. Step 49. 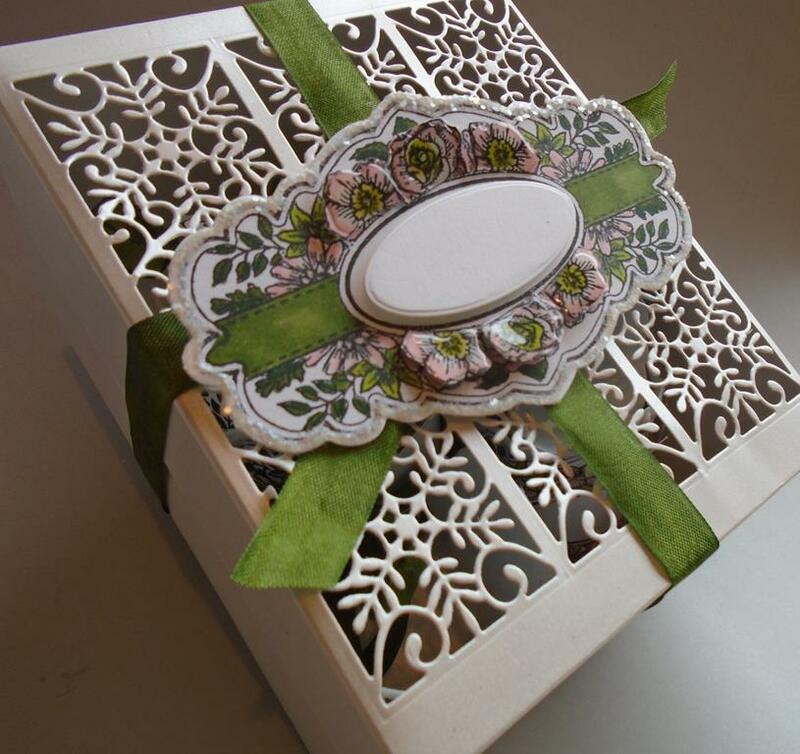 The vellum daisies climb up the bottom left hand box to compliment the garden theme. 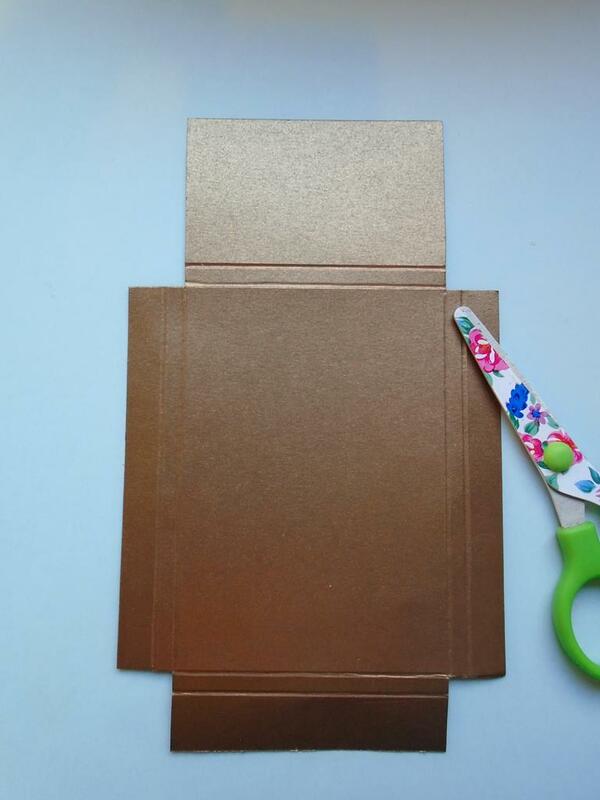 This project will show you how to make this gift card booklet which can also be a mini scrapbook, photo book or whatever you want to fill it with. The die was so well with the Sue Wilson Mauritius die and the co-ordinating Stamps to die for… sunlit daisies stamp as they work hand in hand. 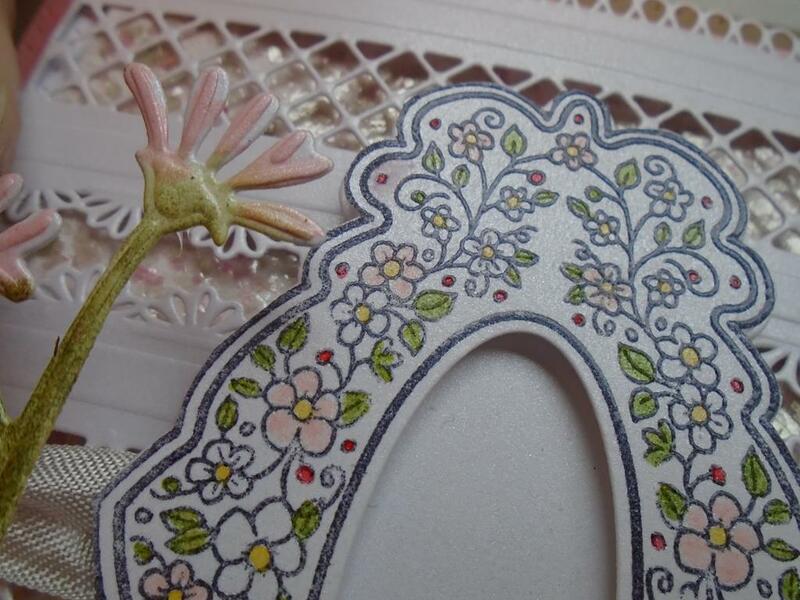 The flowers are created the frame stamp but as you can see by the daisy on the gift card it has been made into a whole daisy from the half stamped daisies. The stitched panel from the Sue Wilson range are perfect when making a booklet as they add detail to the edge of the project. Step 1. 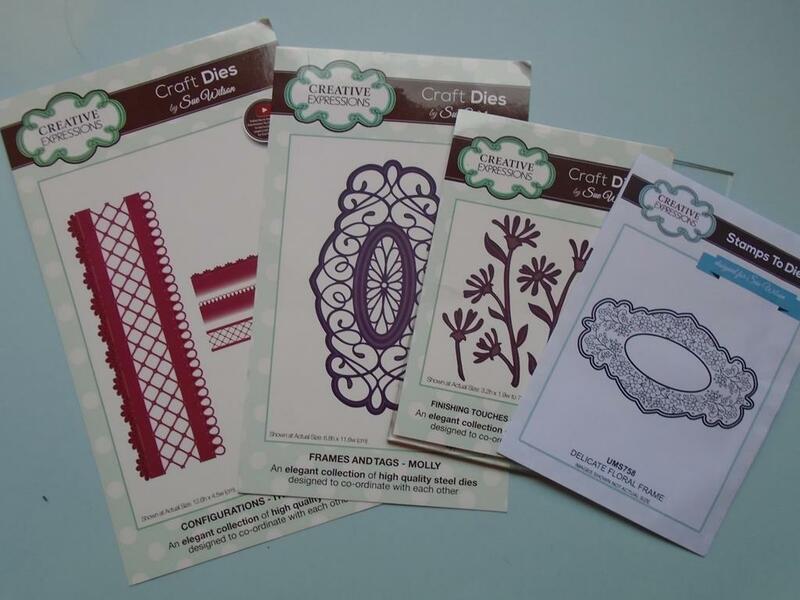 This workshop will show you how to make a lovely gift card booklet which has been made so easy by using the Sue Wilson die shapes. For this you will need the Sue Wilson Indian Ocean collection ~ Mauritius die, the shadow collection ~ stitched lattice frame die set, the Caribbean Island collection ~ St Barts die along with the Creative Expressions stamps to die for … sunlit daisies stamp. The Graphmaster CG1 & CG2 from the Cool Grey 12pk are used to shade the daisies in for a soft feel to the project. You will also see how to create a whole daisy from the stamp plate as they are all just part of a daisy in the stamped image !!!! Step 2. 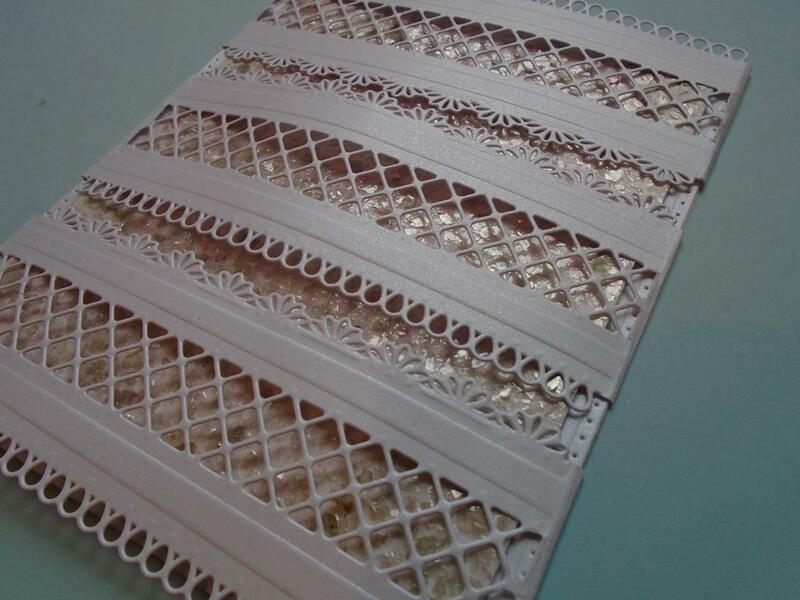 Add the 3 outer dies from the Sue Wilson Indian Ocean collection ~ Mauritius die and the inner / smallest solid stitched die from the shadow collection ~ stitched lattice frame die set onto a piece of Foundations pearl icicle card securing them in place with some low tack tape. 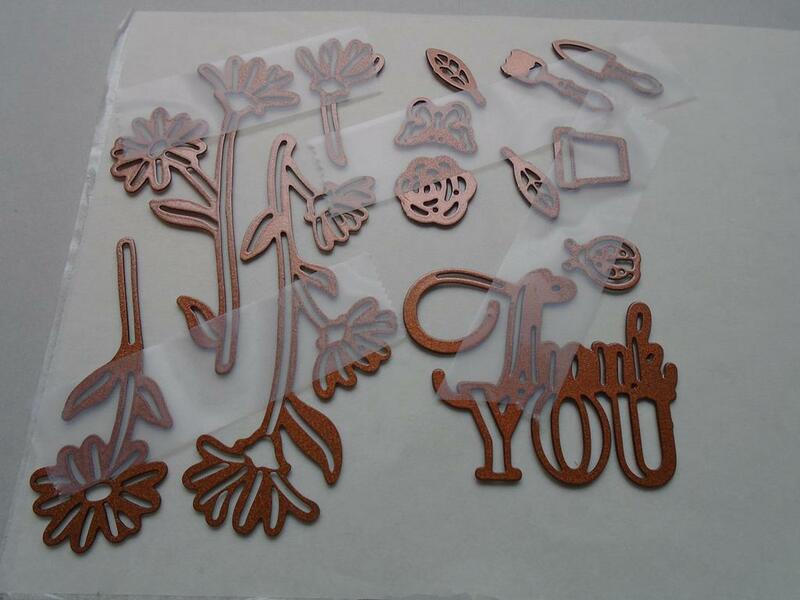 Cut and then emboss the dies through the Grand Calibur machine. Step 3. 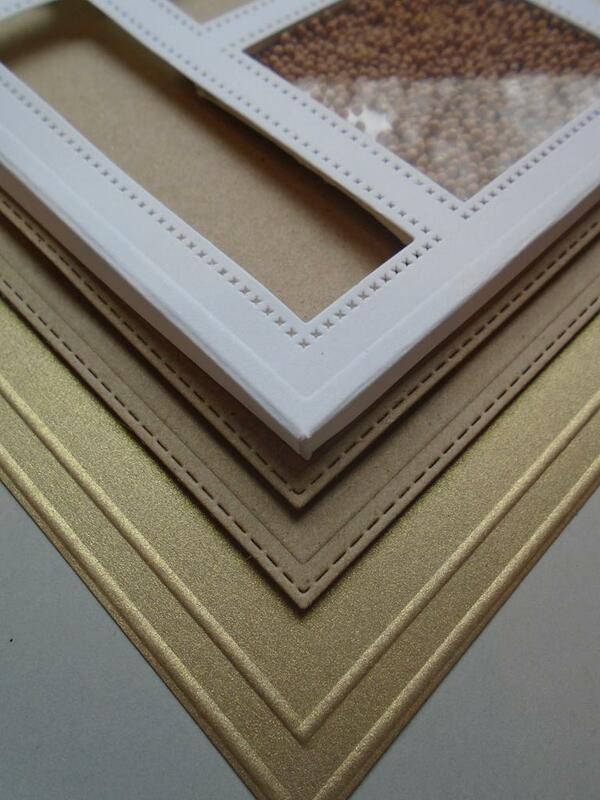 Continue until you have cut 6 stitched panels and just 2 of the delicate Mauritius frames. Step 4. Measure a piece of the icicle card to 137mm x 80mm or 5 ¾ “ x 3 1/8 “ I like to work in cms as it`s easier with the score board. Now with the 8cm width lined up on a score board score a line downwards at 2cm intervals. Step 5. Cut the panel down the centre at 4cms and fold each piece in half along the score line. 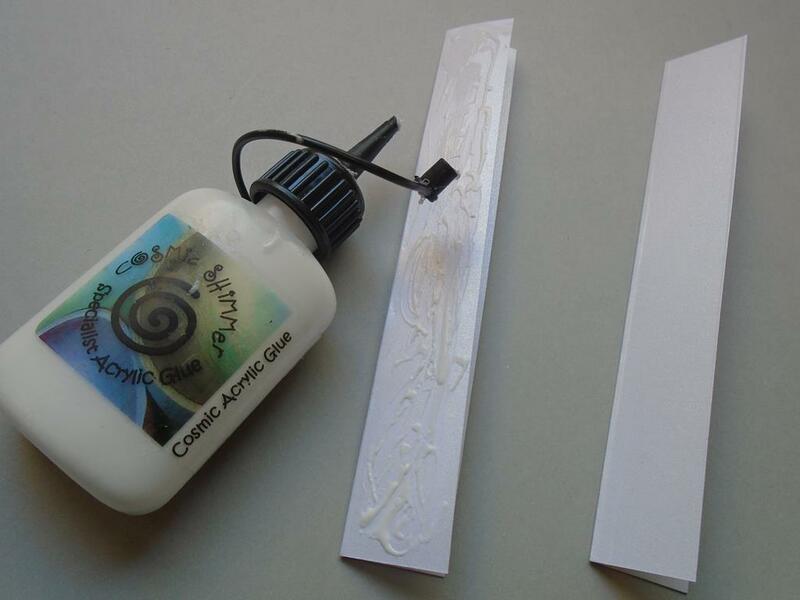 Add some Cosmic Shimmer dries clear glue over one of the folded strips. Step 6. Join the 2 strips together making sure the both of the folded edges are lined up against each other. This method works better I feel than having the fold line on the inside of the booklet as it makes slightly more bulkier !!! Step 7. 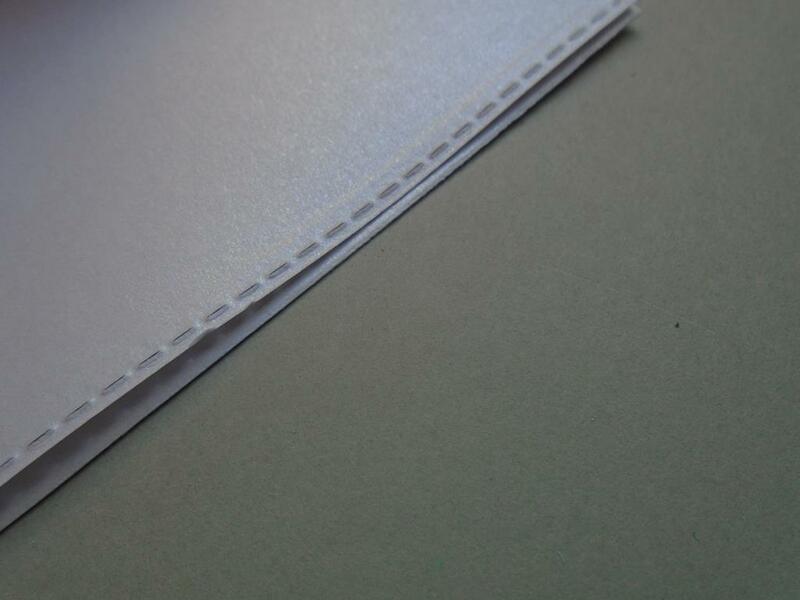 Ease each side downwards to reveal the core shape for the booklet panels to be added onto. Step 8. Add some Cosmic Shimmer dries clear glue onto the right hand top side tab. Now add the first stitched panel so the top side is facing upwards. 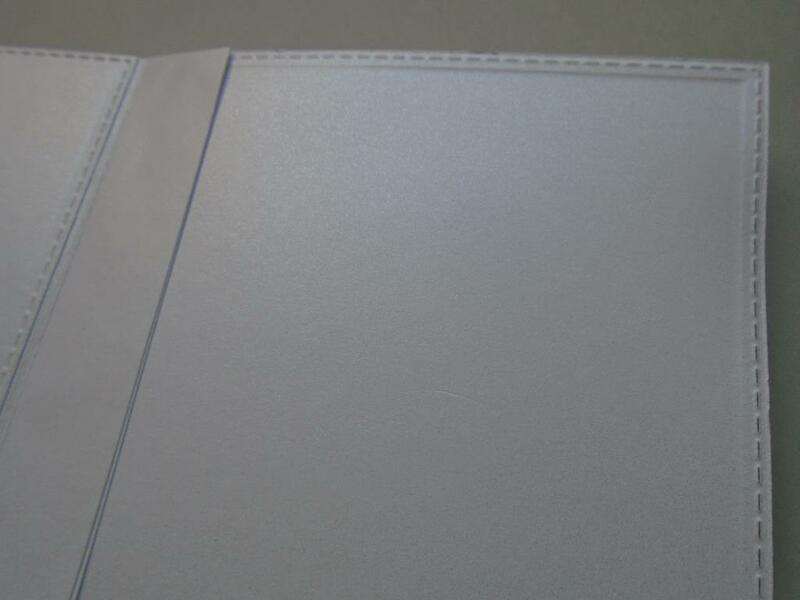 MAKE SURE the panels is added with a 2mm gap on the tab as this will create the back page slightly overlapping the inner pages, this will mean the inner pages will lay perfectly inside with no overhang. Step 9. Here you can see how the above step will help. Step 10. Add another stitched panel onto the left hand side flat tab so the joined central piece remains upright. Place the panel with the stitching on the top side. Step 11. Now add another stitched panel on the right hand side of the central tab making sure the panel goes right up to the scored line (this will ensure the page don`t over hang the edge of the back of the booklet, as was shown earlier) The wrong side of the panel needs to be facing upwards as it will be covered next. Step 12. Apply so glue or tape runner around all of the just laid panel. Step 13. Place the panel with the right side up stitched detail being placed on the side edge first so you know the panel will sit perfectly once laid down. Step 14. Now you have the central pages in place. You could even cut an aperture out before doing these steps and add a photo or some acetate. There are lots of options for the booklet. Step 15. Take a long length of the Creative Expressions finishing touches sideshow rose satin ribbon and stick it around the front, over the spine and round the back of the booklet using a tape runner or double sided tape. 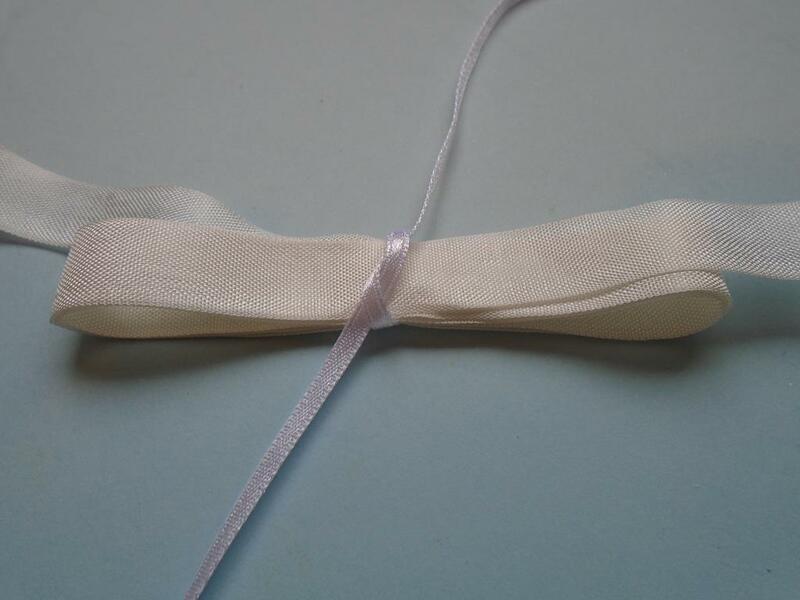 Make sure you leave long tails of the ribbon so that it can be made into a bow later on. Step 16. Add some more of the tape runner. 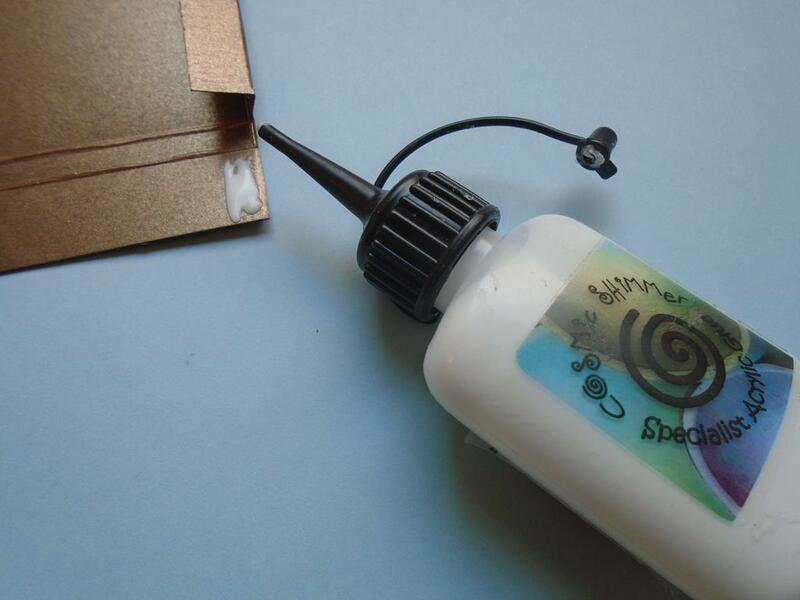 You can use Cosmic Shimmer glue but go sparingly as you don`t want to make the panel to wet. Step 17. Add another panel onto the cover marrying up the edge of the panel as you lay it down. Have the stitching facing right side up as this is the front cover. Step 18. 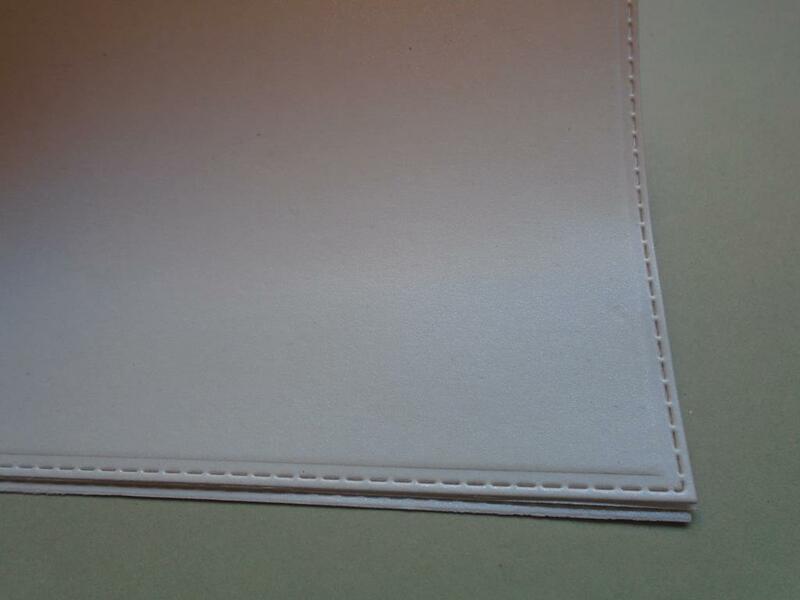 Turn the booklet over and repeat the process with the last panel with the stitching facing on the top. 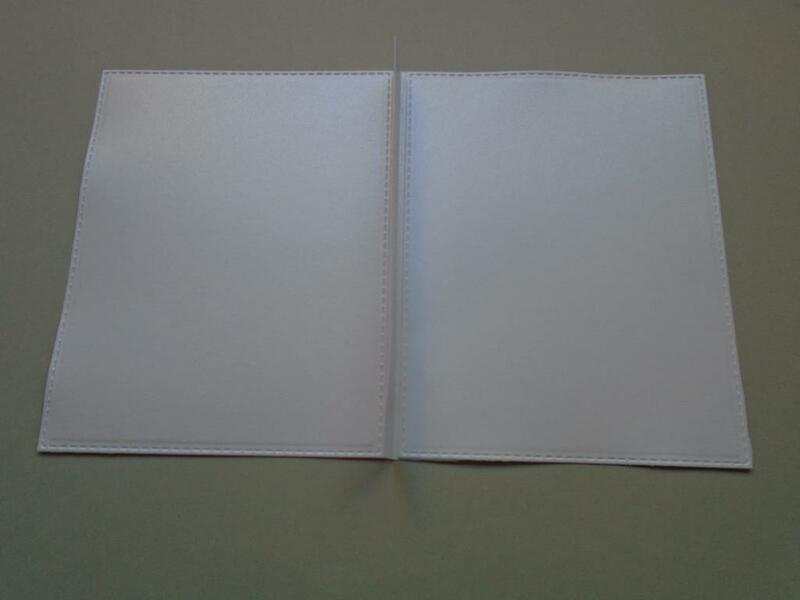 This completes the basic shape of the booklet. 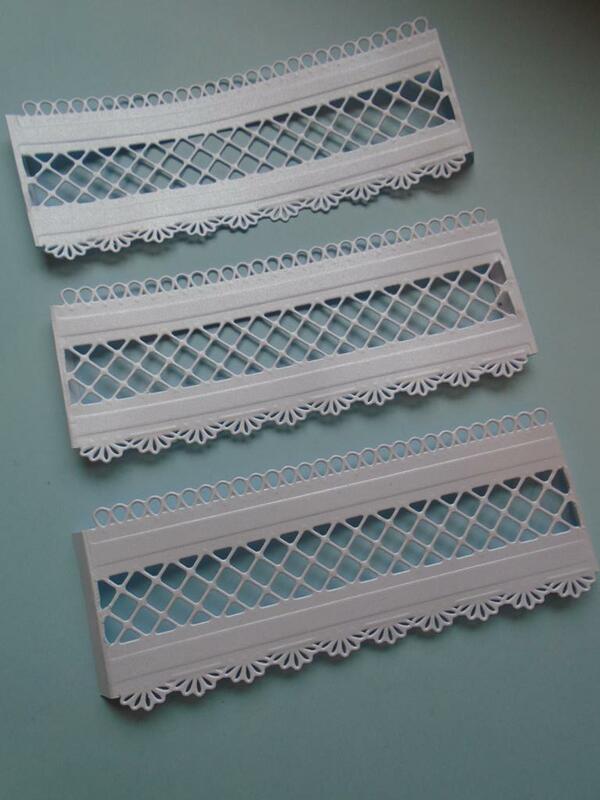 It`s made extra easy by having the panels all the same size and with the detail of the stitching too. Step 19. 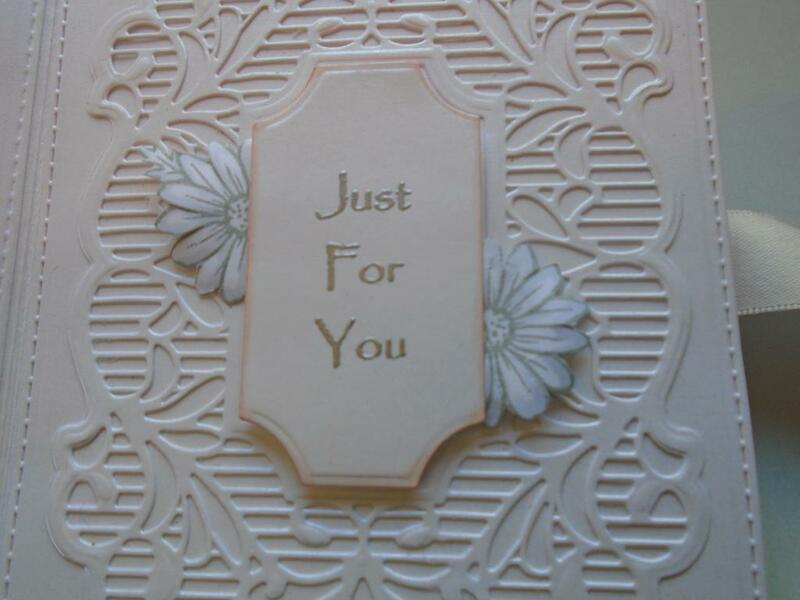 Make a `Just for You` sentiment from the Creative Expressions amazing sentiment stamp set. 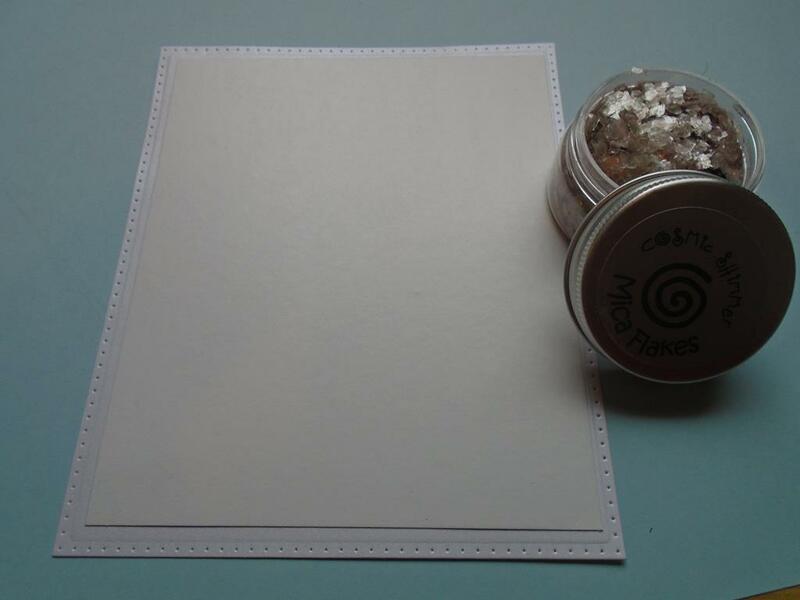 Use the Perfect Medium ink pad when stamping the sentiment onto a piece icicle pearl card, then use the Cosmic Shimmer silver shine embossing powder over the ink and then heat set it. Cut the sentiment out using the curved rectangle die from the Sue Wilson Mauritius inner rectangle die. Step 20. 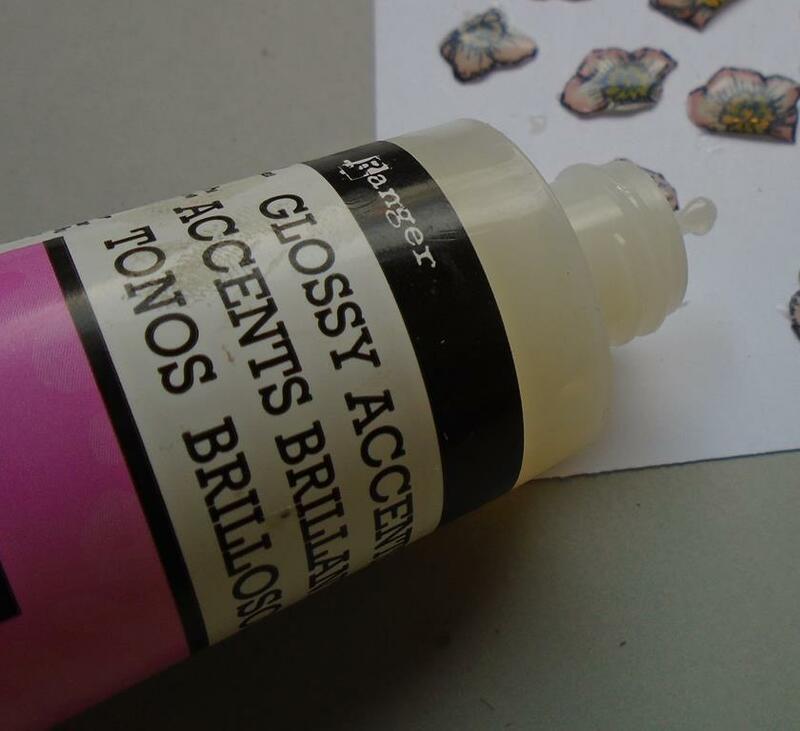 Add some of the Cosmic Shimmer dries clear glue onto an acrylic block in this case. 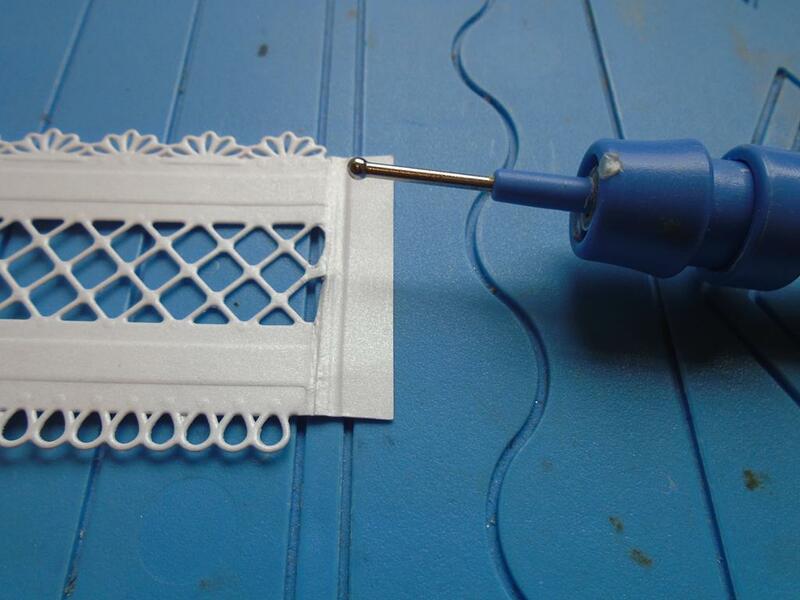 This is how the glue will be applied to the intricate reverse of the Mauritius frame. You could use a spray glue or the fine Cosmic Shimmer highlighter glue. Step 21. 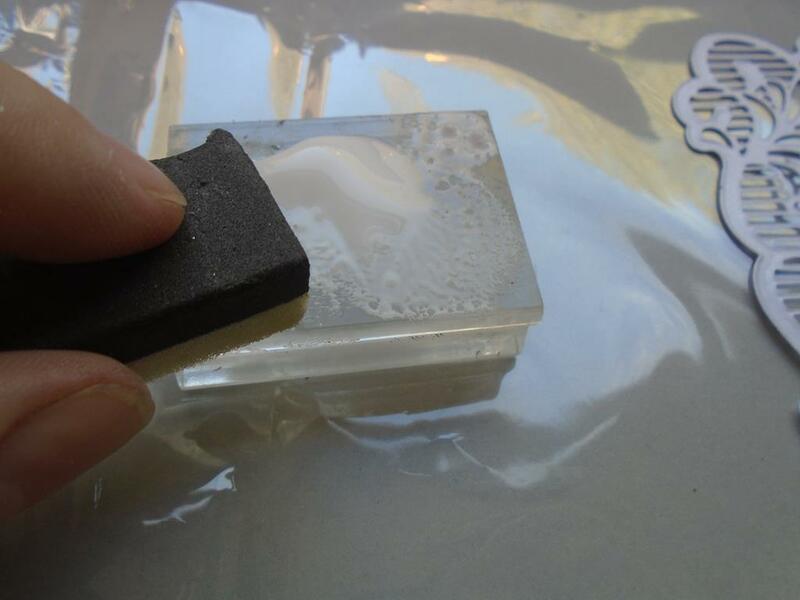 Dab a small piece of cut and dry foam over the glue to prime the foam pad. 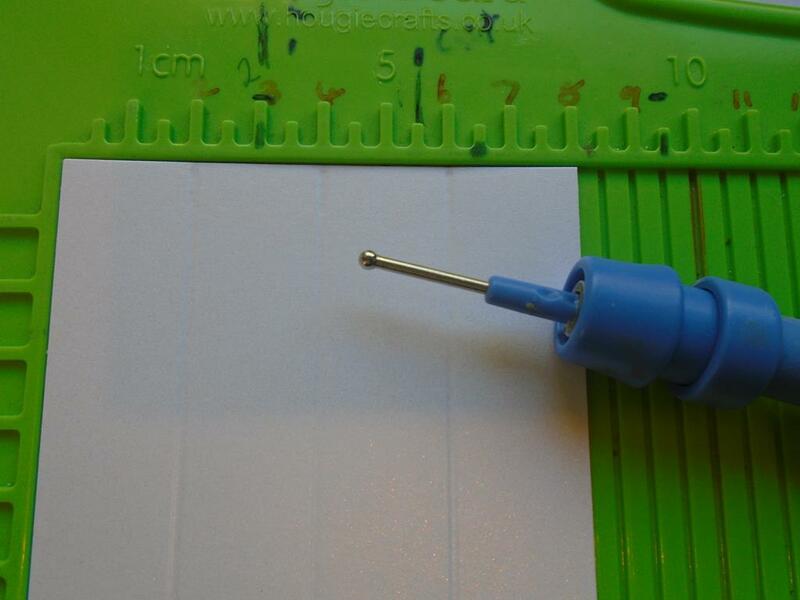 This will make sure you don`t have big blobs of glue on the pad. Step 22. 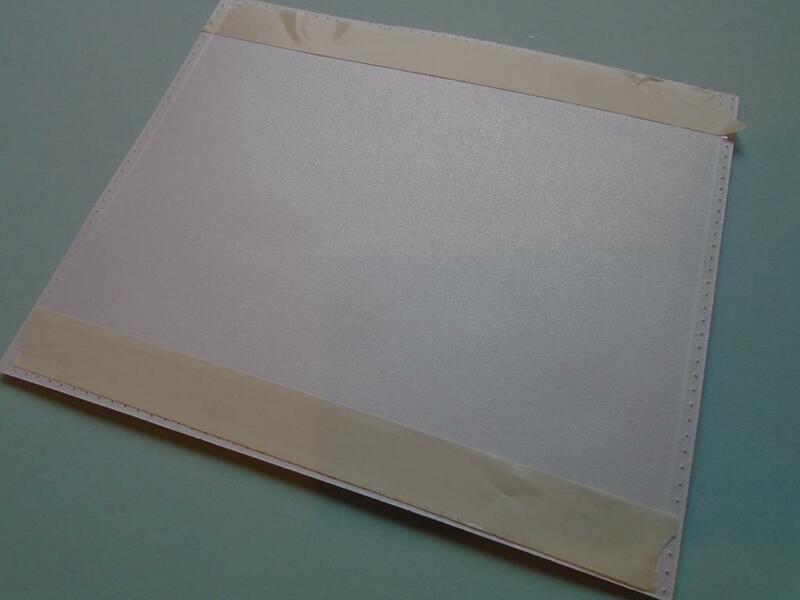 With the frame on a piece of cellophane (this is to help the frame not stick to the below surface and it can be thrown away as it will only take one use). 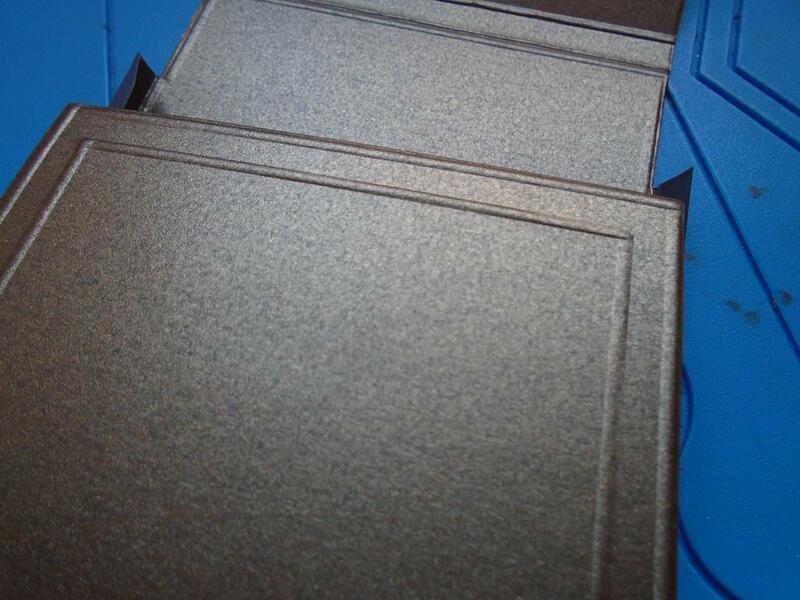 Dab the foam pad over the frame making sure you don`t move the frame as you work quickly. Step 23. 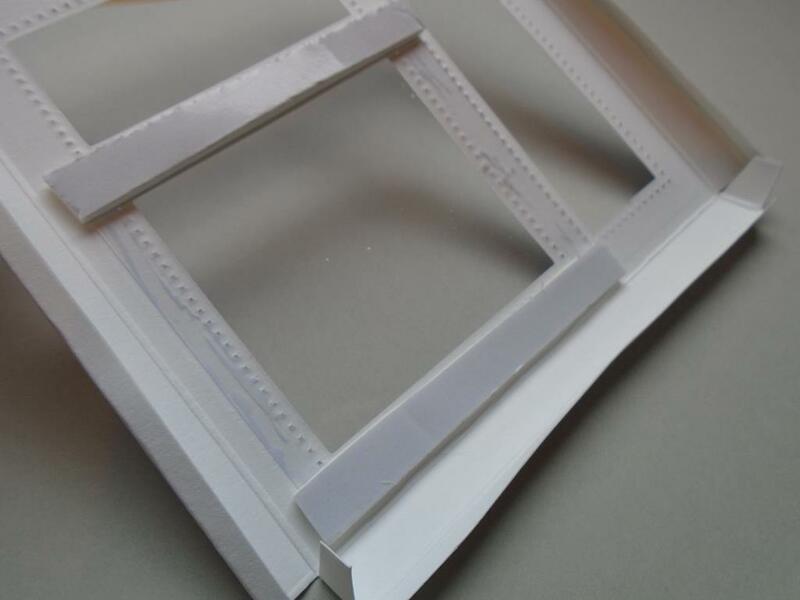 Lift the frame upwards so the glue doesn`t touch the front of the frame. Step 24. 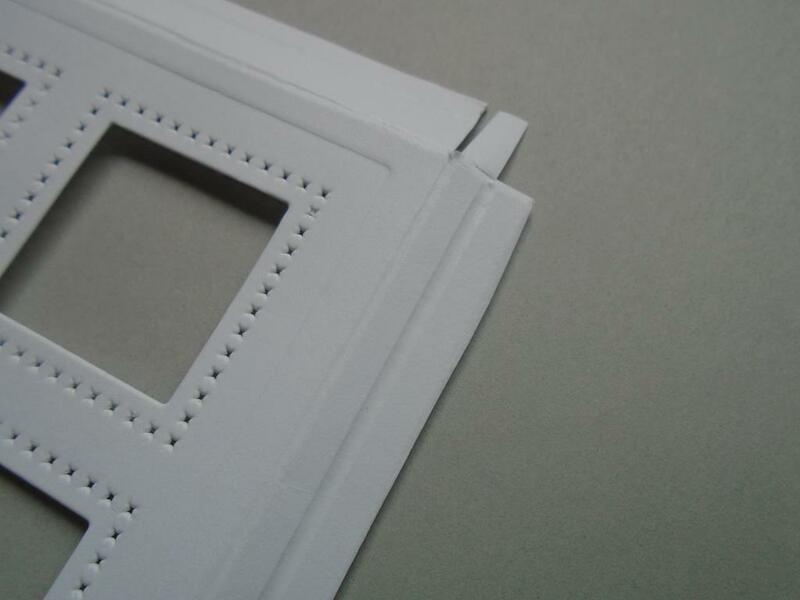 Place the frame into the right hand panel in the centre of the booklet. 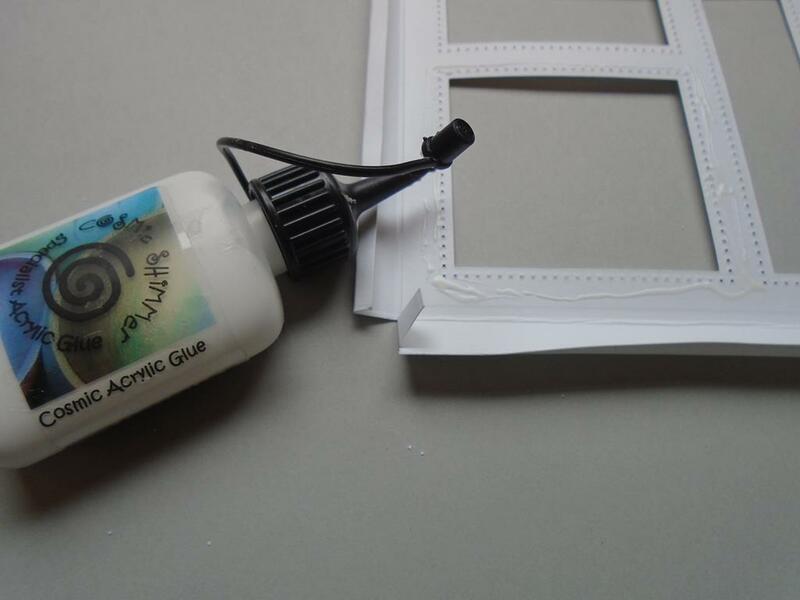 Once the glue is dry use an adhesive rubber to gently remove any excess glue. I found using this technique you might just get 1 or 2 small bits of glue on the thin detail of the frame but it was removed with the rubber. Repeat the process but on a clean piece of cellophane and add that frame to the back inside right hand stitched panel of the booklet. Step 25. 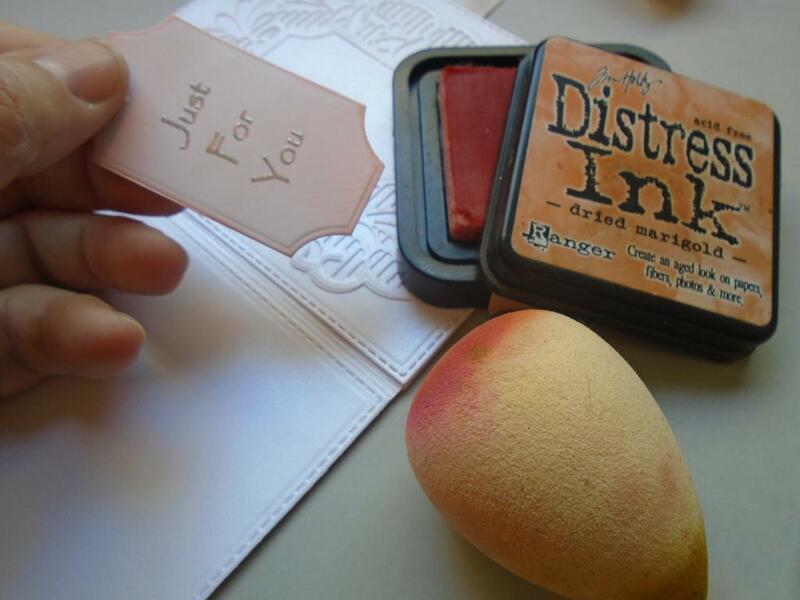 Add some of the Tim Holtz dried marigold ink around the edges of the `Just for You` sentiment on a Creative Expressions smoothie. 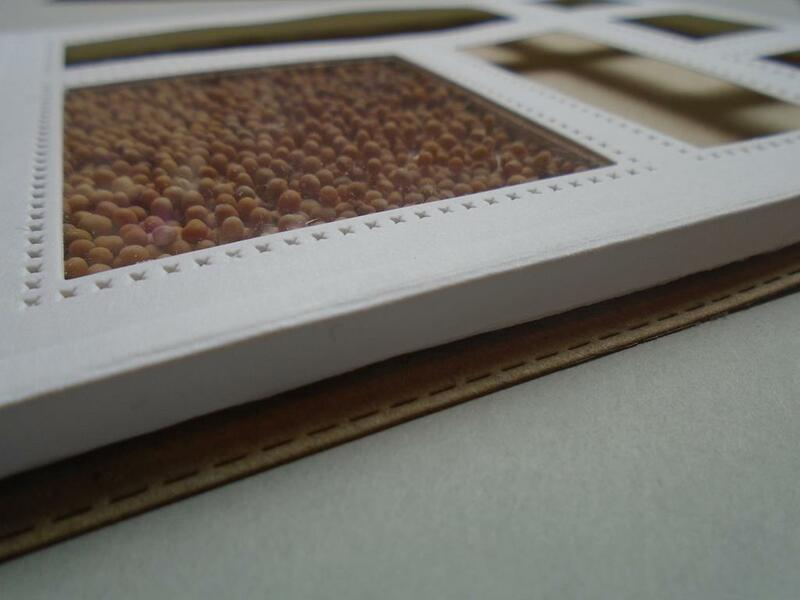 Place that onto the centre of the frame using foam pads for added dimension. Step 26. 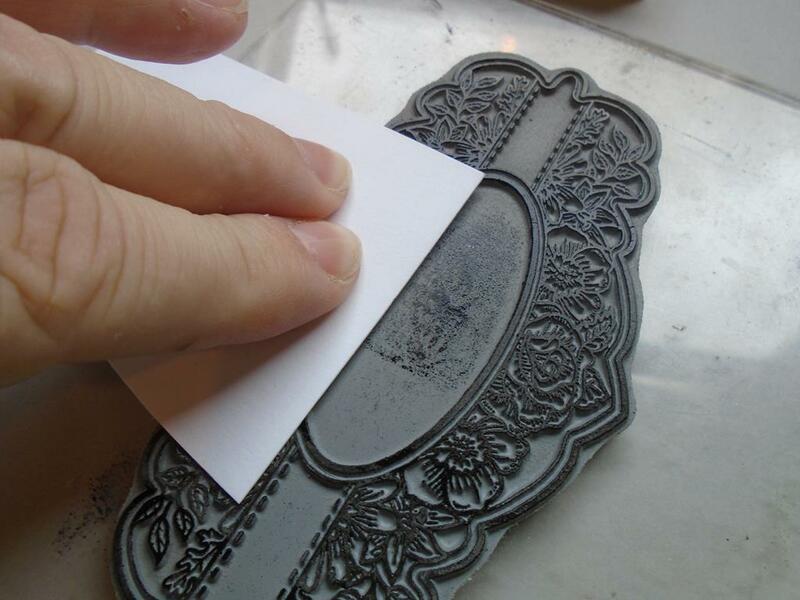 Take the stamps to die for… sunlit daisies stamp and place it on an acrylic block. Ink the stamp with some London fog memento ink pad as the Graphmaster pens are going to be used. 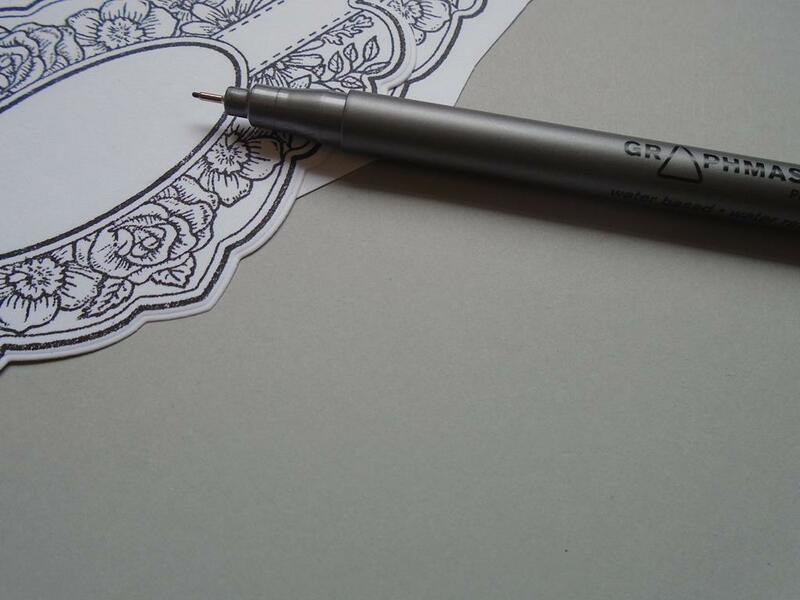 Stamp the image onto a piece of coconut or white card. Make sure it is a smooth card. Step 27. Add the outer die and the largest inner frame die from the Mauritius die set onto the stamped frame and secure it in place with some low tack tape. 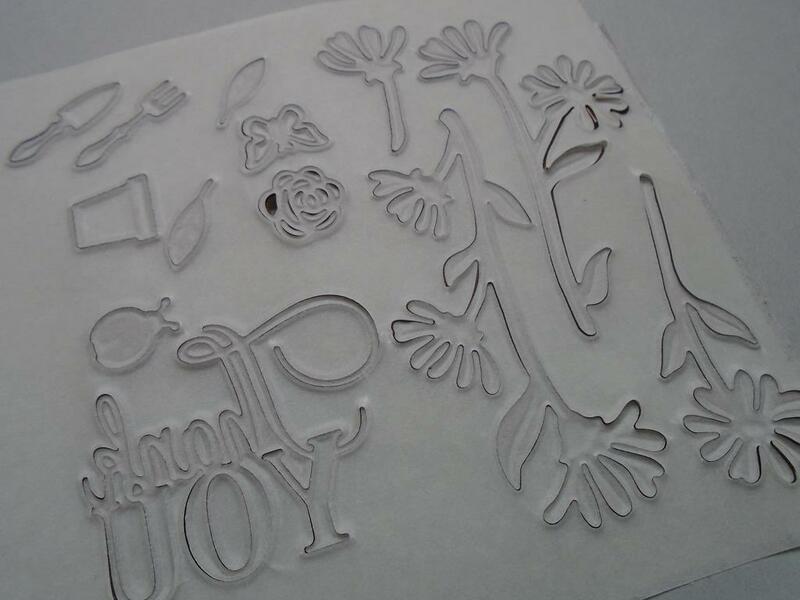 Now cut the piece out using the Grand Calibur die cutting machine. Stamp and cut another 2 frames out but this time omit the inner rectangular frame and just cut solid frames around the daisy design. Step 28. Stamp 2 or 3 more sunlit daisies images onto a piece of coconut card. 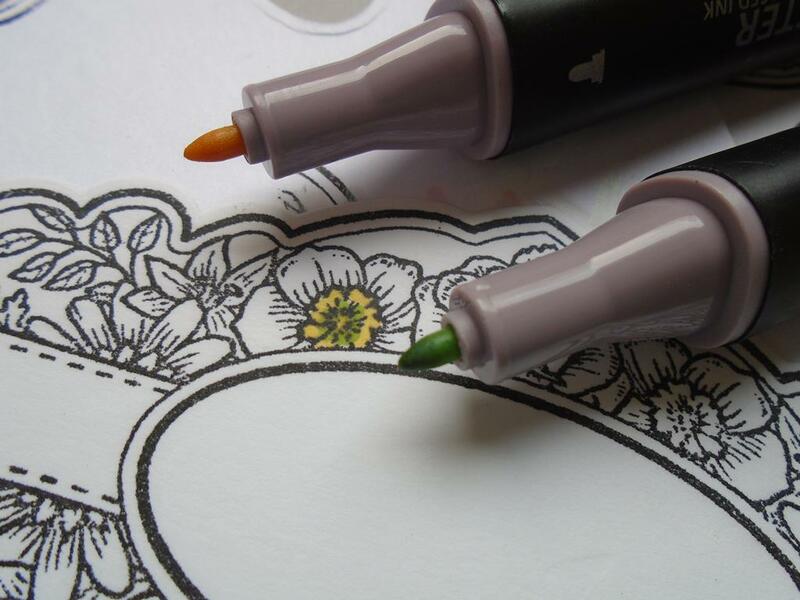 Use the Graphmaster CG1 & CG2 to shade the petals of the flowers in. The flower works well with the darker CG2 in the centre. 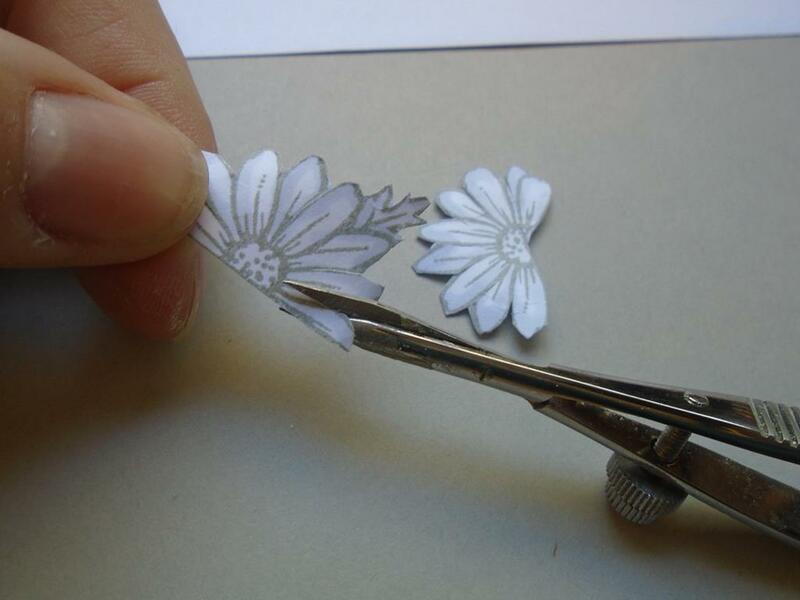 Cut 2 of the daisies out using a small pair of decoupage snips ( or whatever you are use to). Step 29. 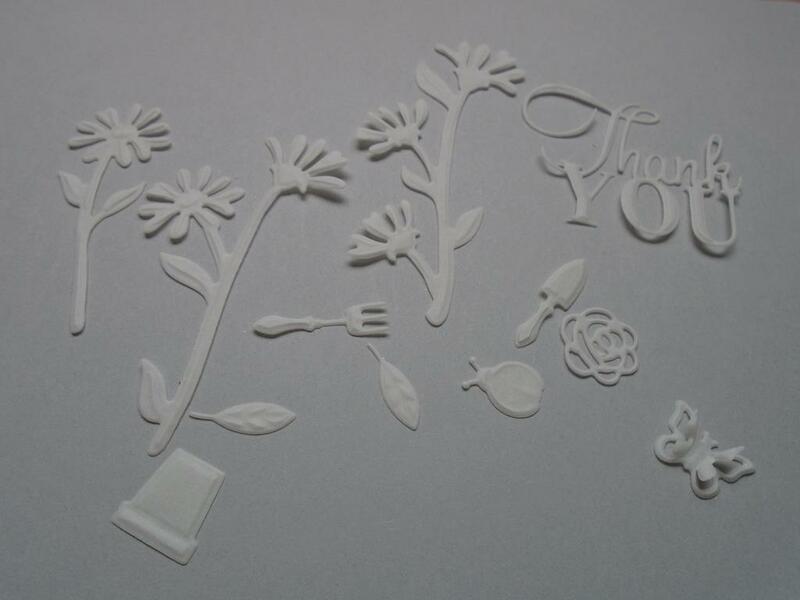 Cut down into each petal and then curve the petal over the snips to add depth to the flowers. Step 30. 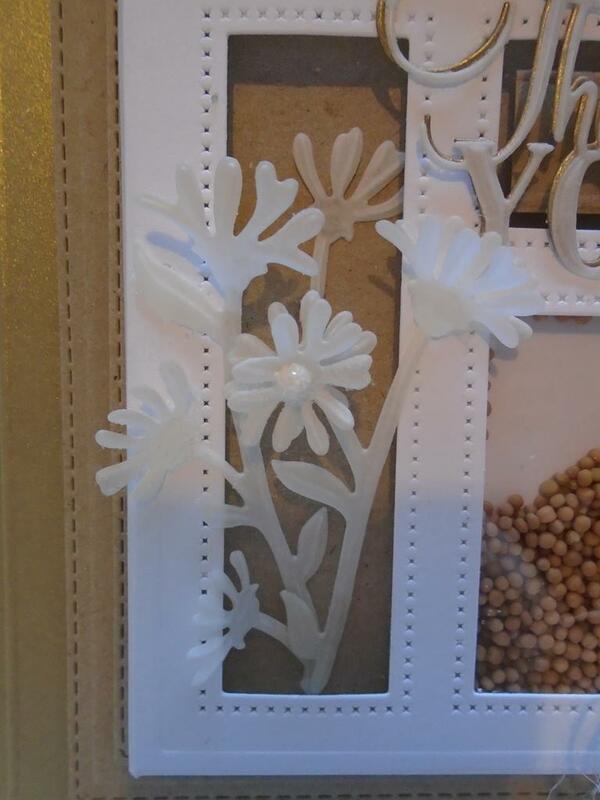 Tuck the daisies into the side of the frame using 3d glue or a foam pad for added dimension. Step 31. Continue to colour the main frame with the cut out centre that has been cut out earlier. 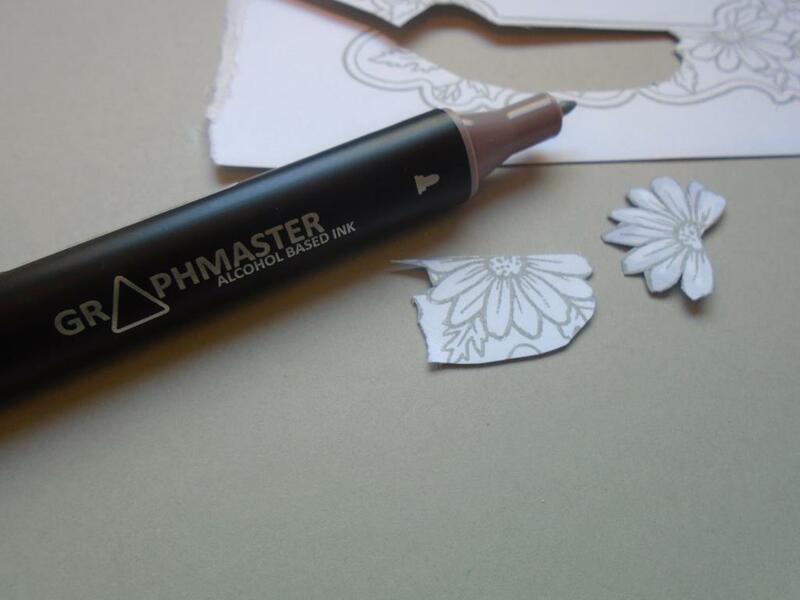 Build the flower petals up with the Graphmaster pens. Step 32. I found laying the CG1 on just one side of the petal was enough and the I used the CG2 on the flower centres and the odd leaf to bring some depth the frame. Step 33. 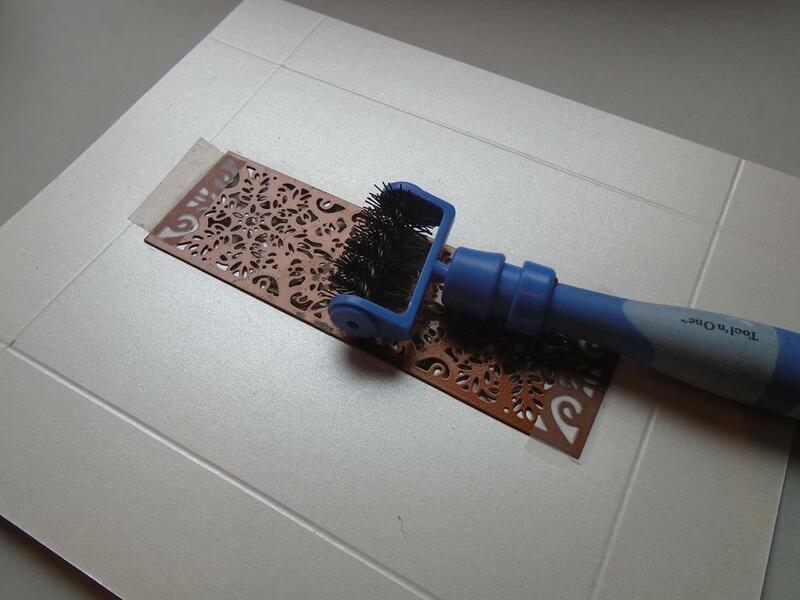 Use some of the Tim Holtz dried marigold ink around the edges of frame before applying some foam tape to the back of the frame and placing it on the front cover. Add the other 2 solid daisy frames to the left hand side of the booklet pages once they are coloured in. Step 34. 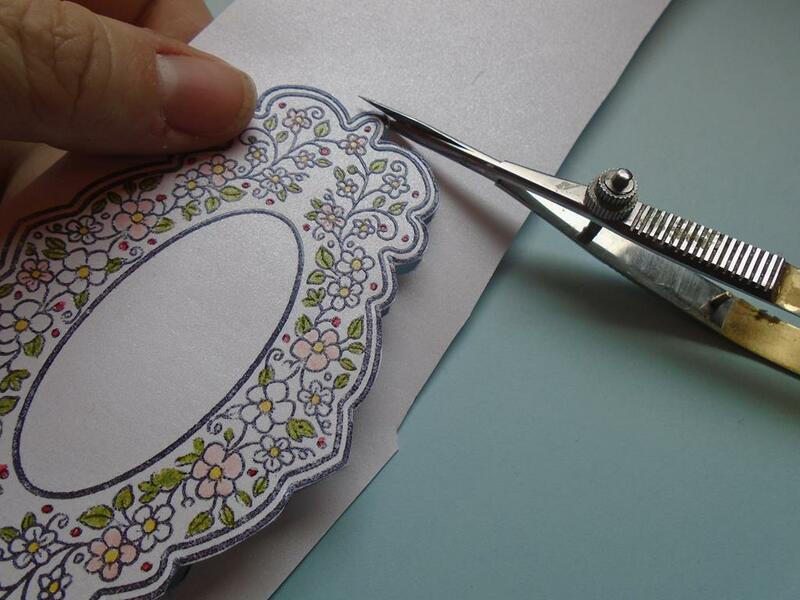 To make a full flower cut 2 of the daises out of the 3 frames that were stamped for just cutting flowers out of. 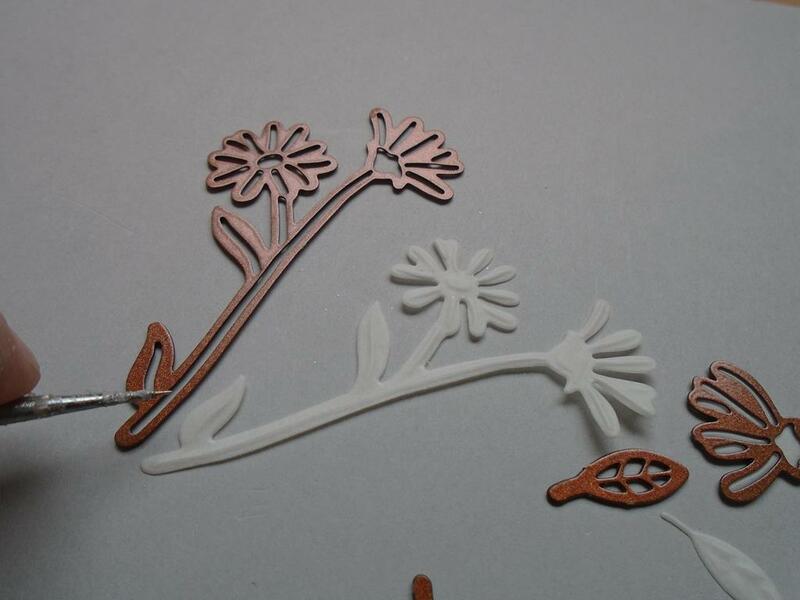 Also cut the round centre of the daisy which can be found on a few of the flowers. As one of the flowers is larger add a small amount of Cosmic Shimmer dries clear glue onto the central edge of that daisy and lay the small daisy over the top. Marry up the petals of the flowers to make a seamless whole daisy. Step 35. 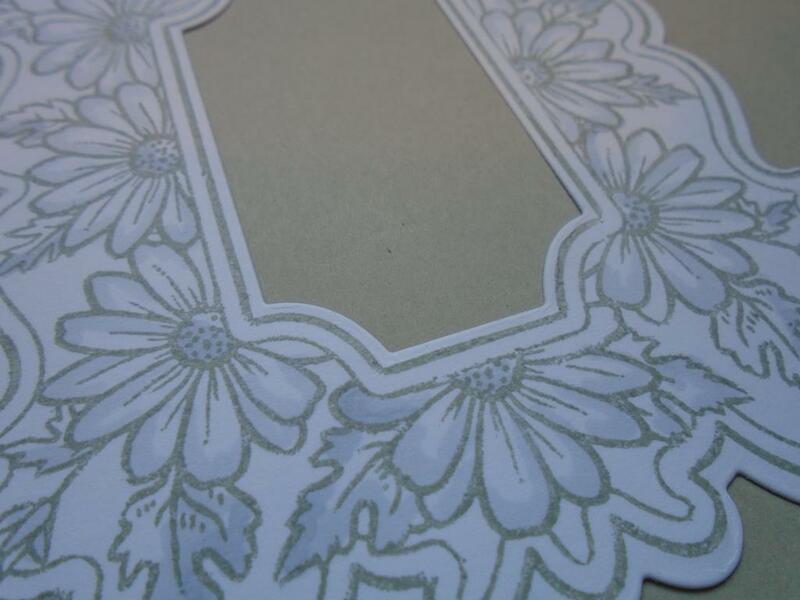 Add a gift card on a glue dot and place on the back panel of the booklet and then add the daisy to embellish the card. Here an old gift card has been used with the company name hidden but you can leave the new one open as it will be in the back of the booklet and a nice surprise as the card is opened. Step 36. Cut a solid frame from the inner dies of the Mauritius die set and then also another one using the solid frame, the detailed frame and the inner detailed circle. 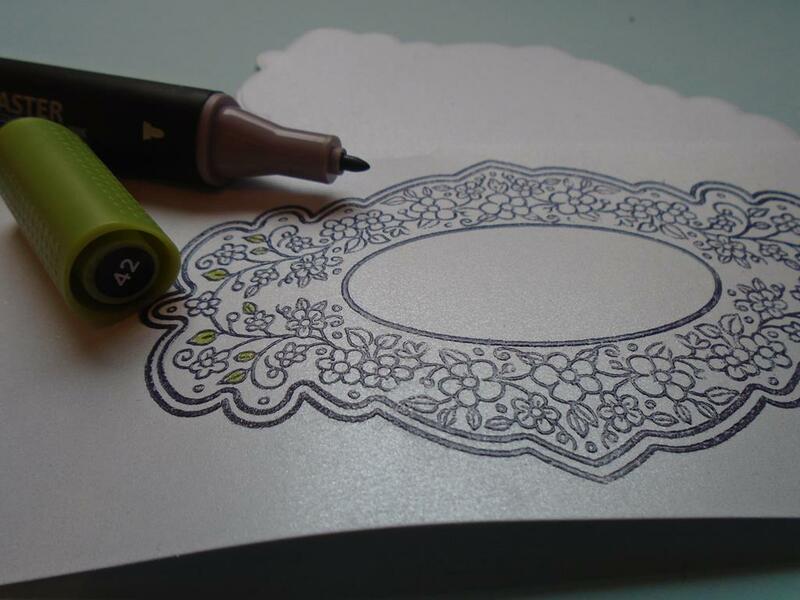 Ink the back solid frame with the dried marigold smoothie and glue it behind the coconut detailed frame. Step 37. 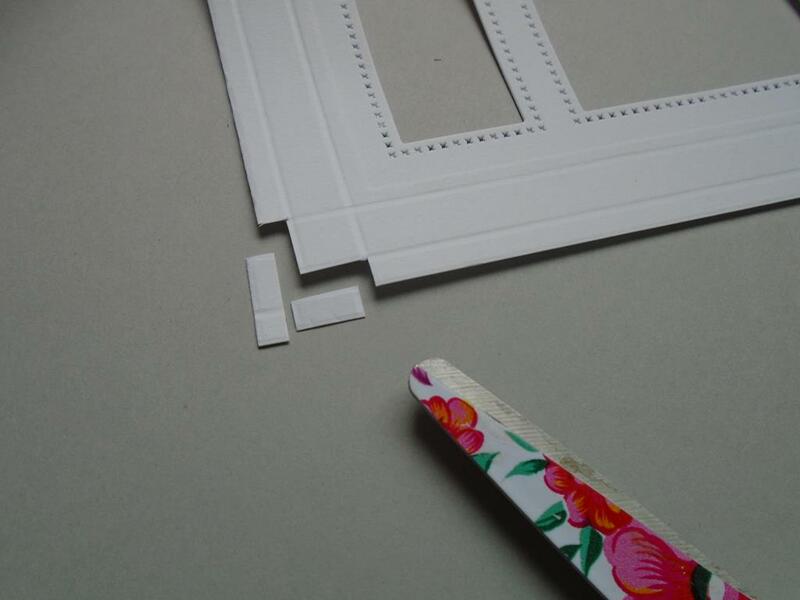 Glue this frame into the recess in the front daisy frame. Use the glue so you can wiggle it into place. Step 38. Make another whole daisy up using the technique that was shown earlier on. Add it to the bottom right hand side of the frame on the inside of the cover. Step 39. 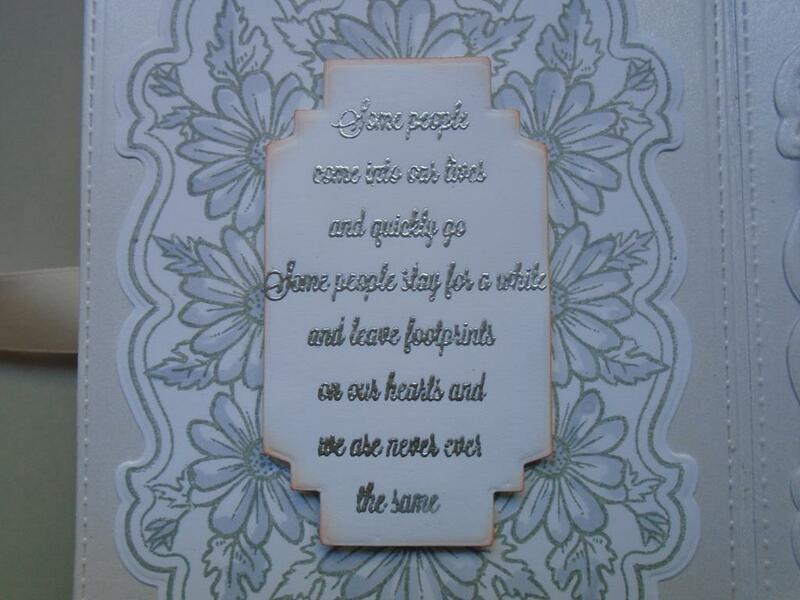 Stamp and then embossed in the Cosmic Shimmer silver shine the `Some people come into our lives` sentiment and cut that out using the detailed corner die from the Caribbean Island collection ~ St Barts die set. Step 40. 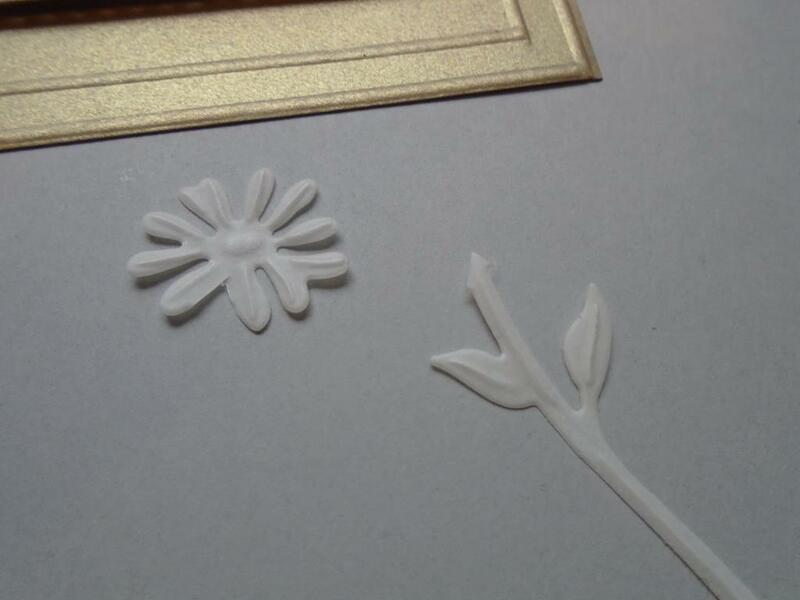 Mount it onto the daisy frame using foam pads for dimension. Step 41. 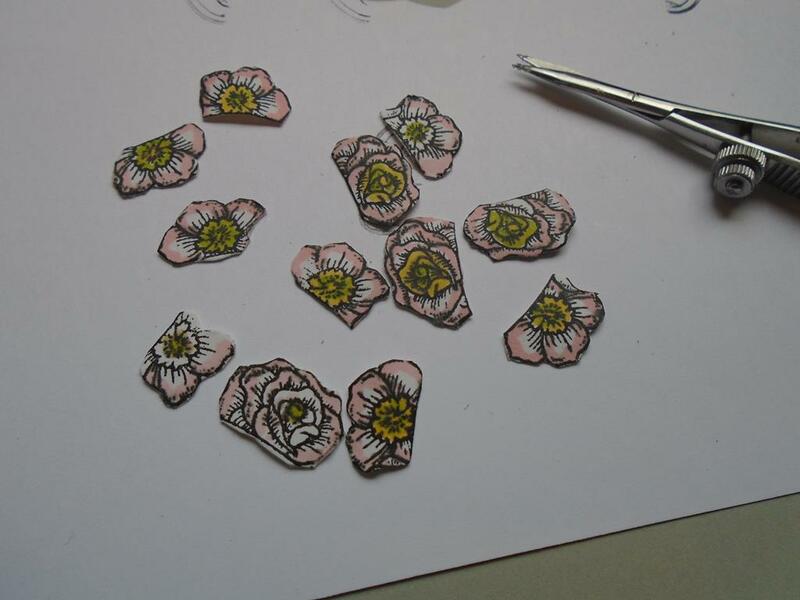 Cut and create more daises, some are full daises and others just as they are from the stamp. 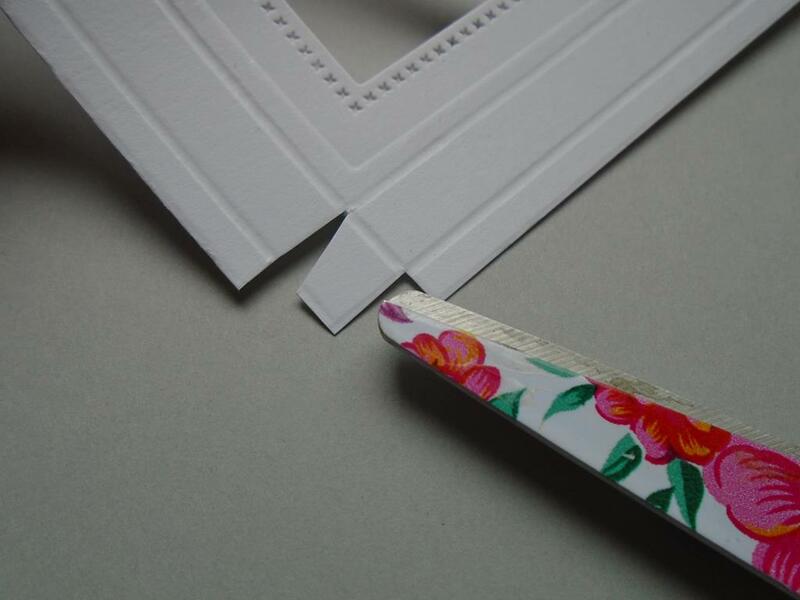 Make sure you cut into the petals for added depth before sticking them to the front frame. It doesn`t matter if they don`t go directly over a daisy as it actually gives the appearance of more flowers if they are added at random. Step 42. 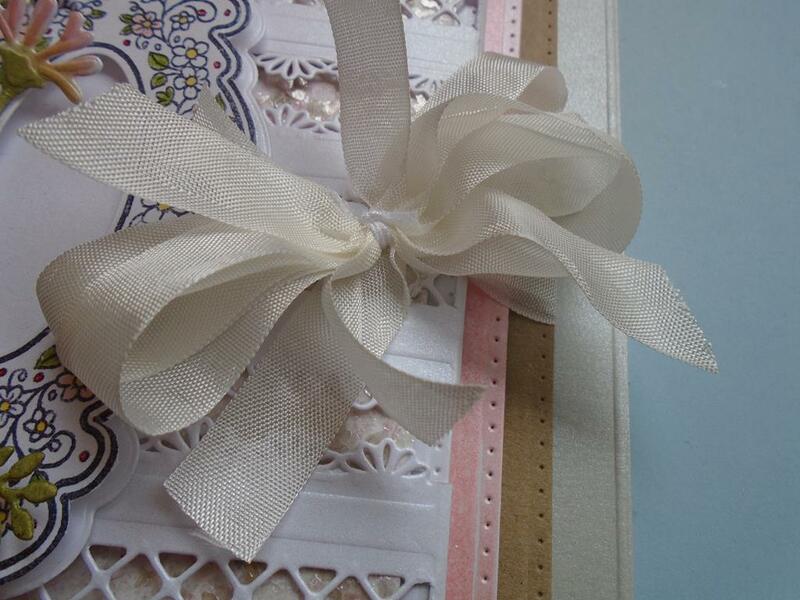 Tie the ribbon into a bow once all the pages of the booklet are complete. 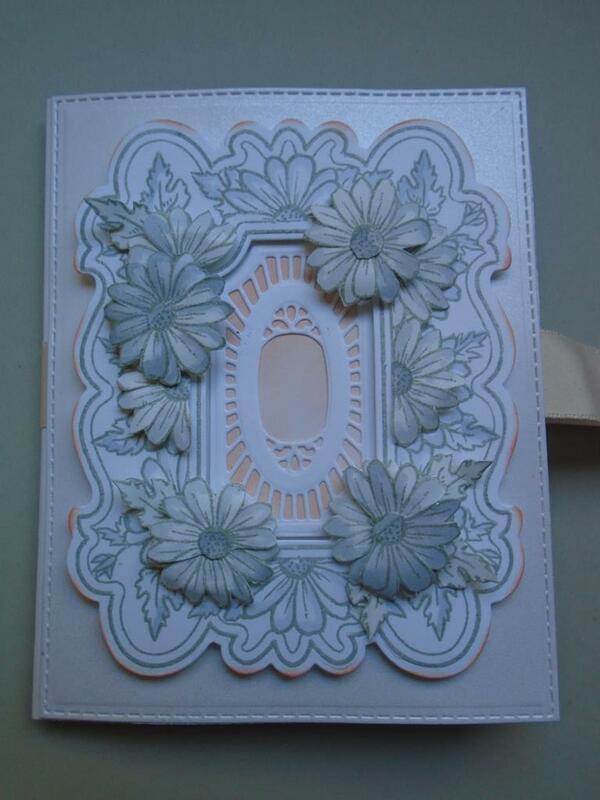 The inside daisy panel has been left free for a personal message to added when sending the card. Step 43. Just a view of the different pages. 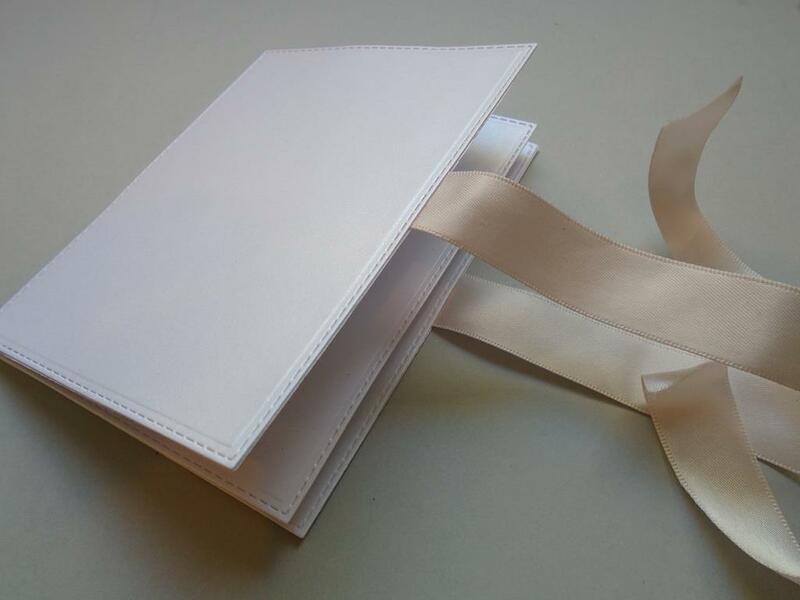 As the booklet is closed with the ribbon it`s why foam pads can be used as they will take in the depth. 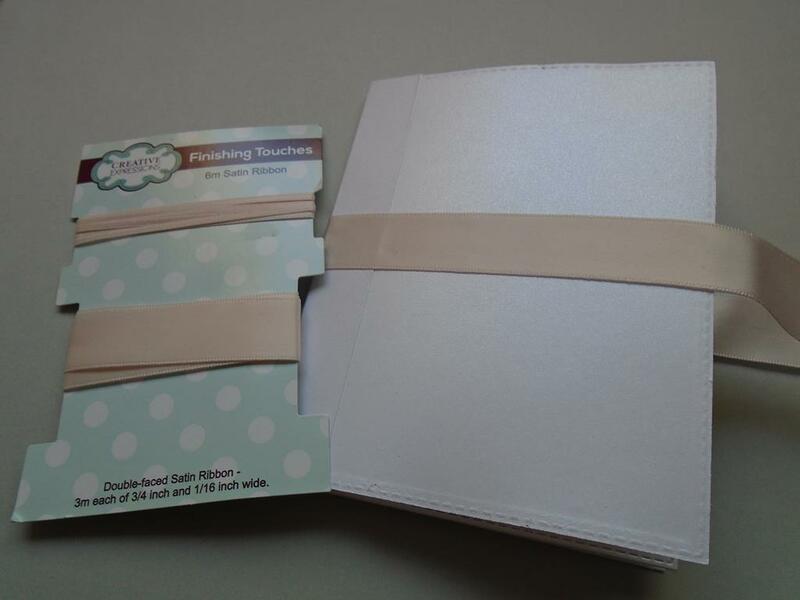 Why not add another set together to make a larger paged booklet and use it as a brag book !! !